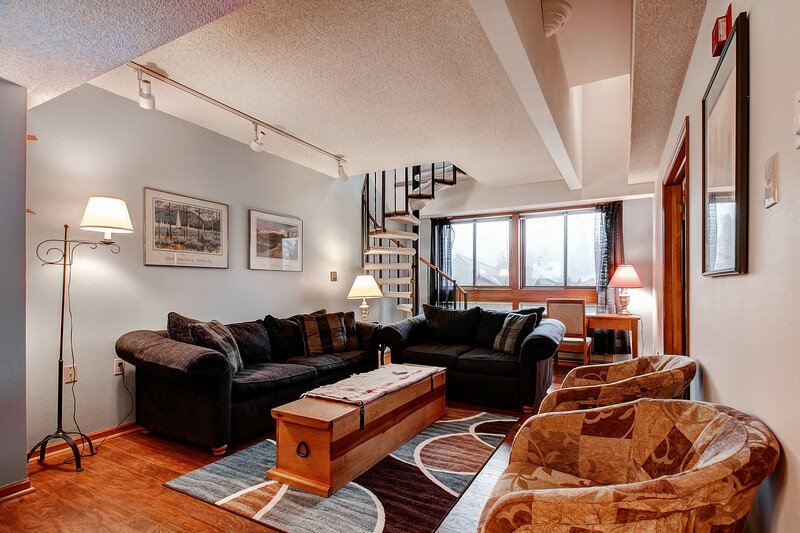 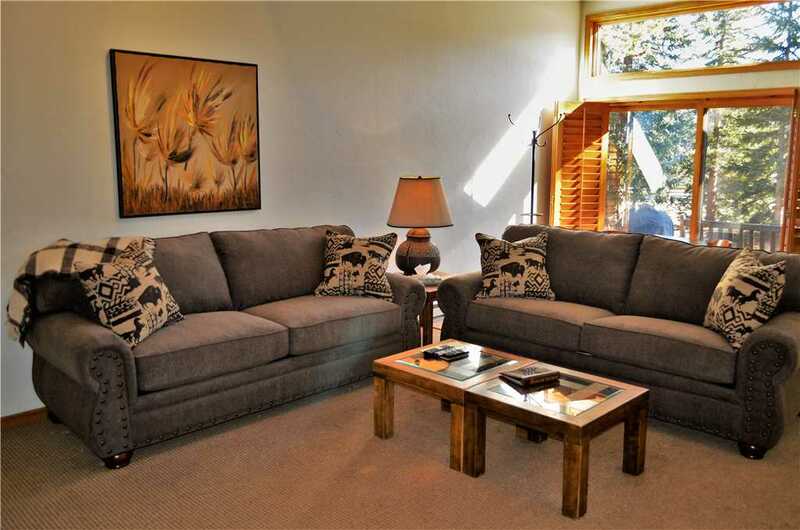 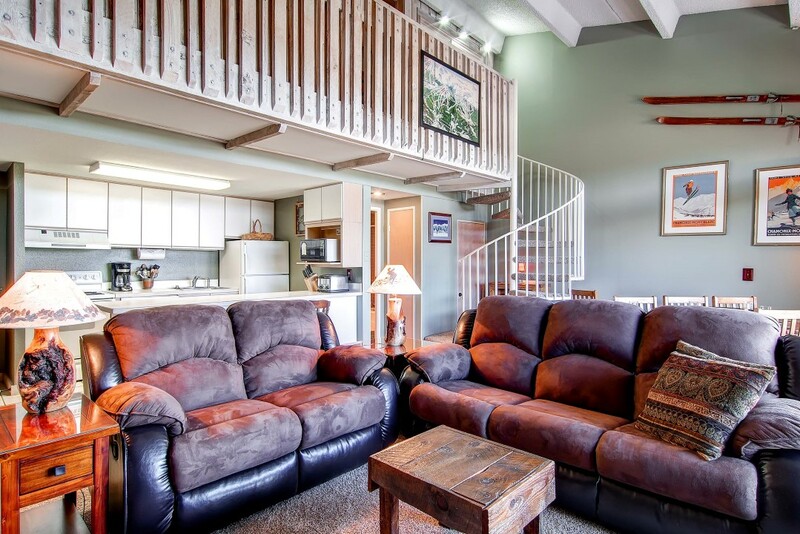 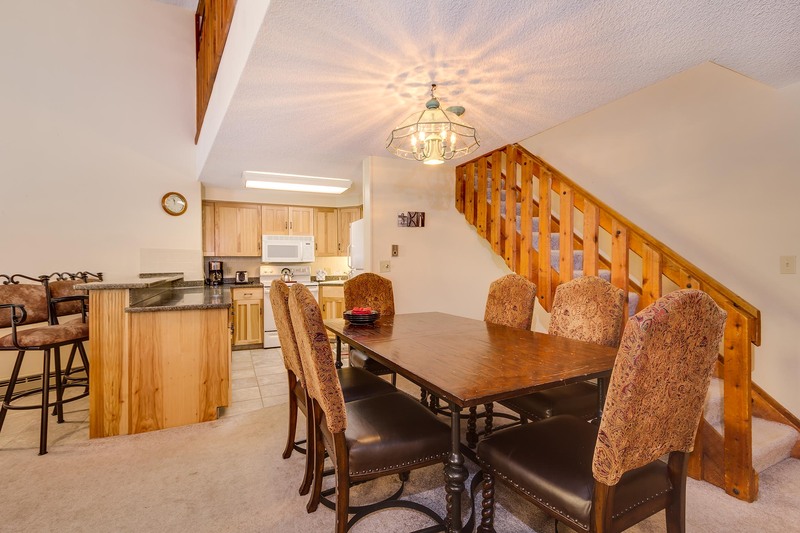 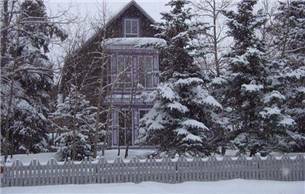 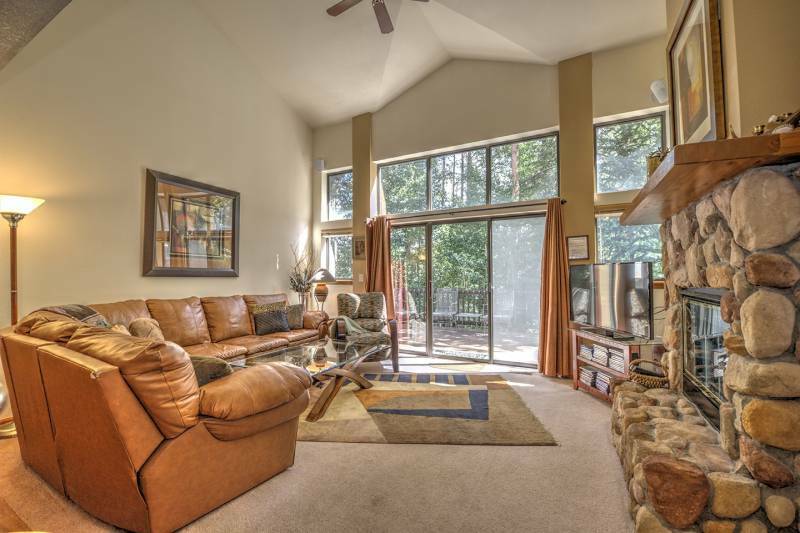 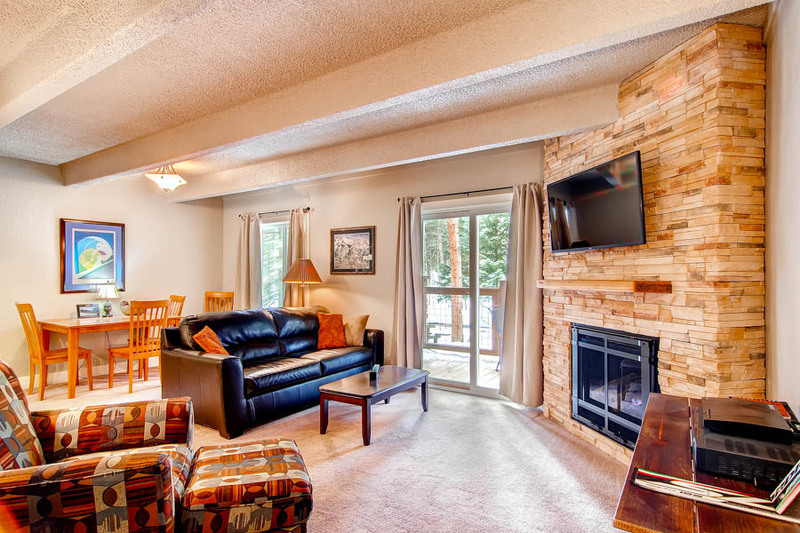 Pine Creek E Townhouse is an updated 3-bedroom, 3.5-bathroom deluxe condo that’s perfect for groups of up to eight people. 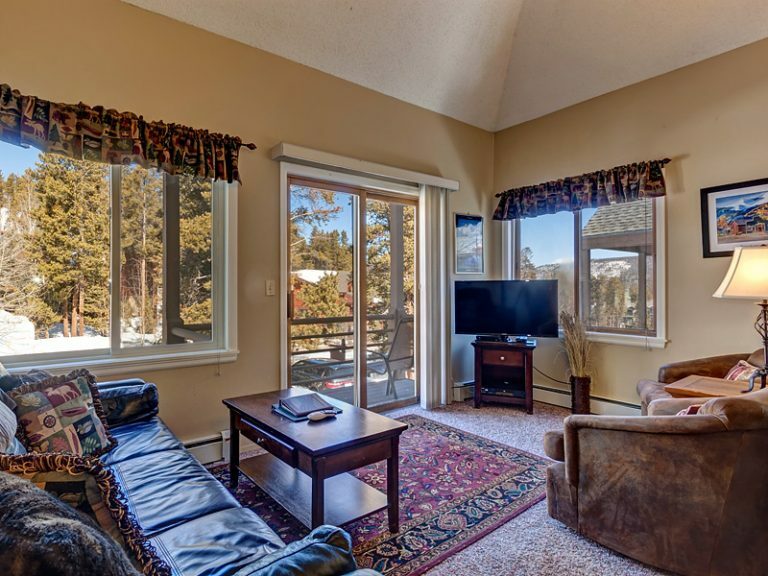 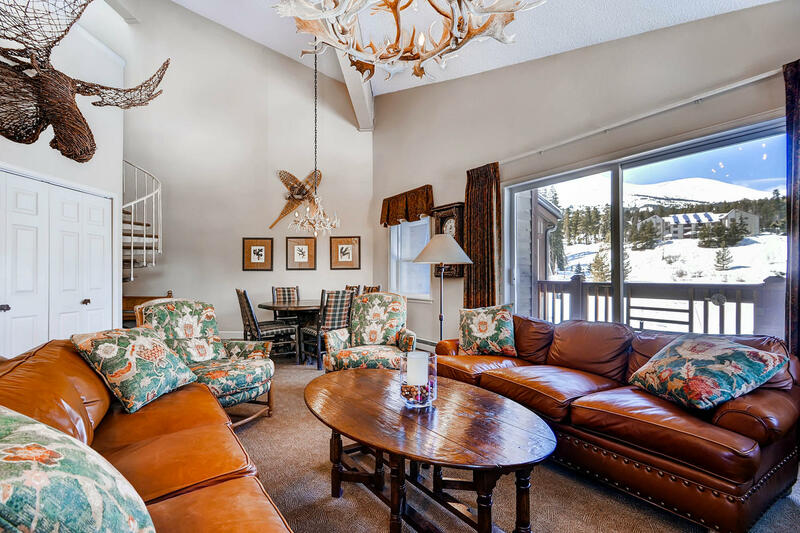 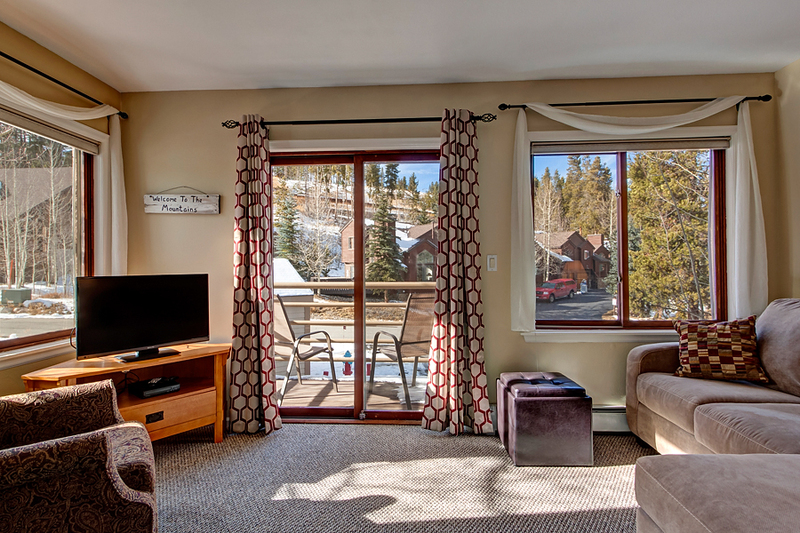 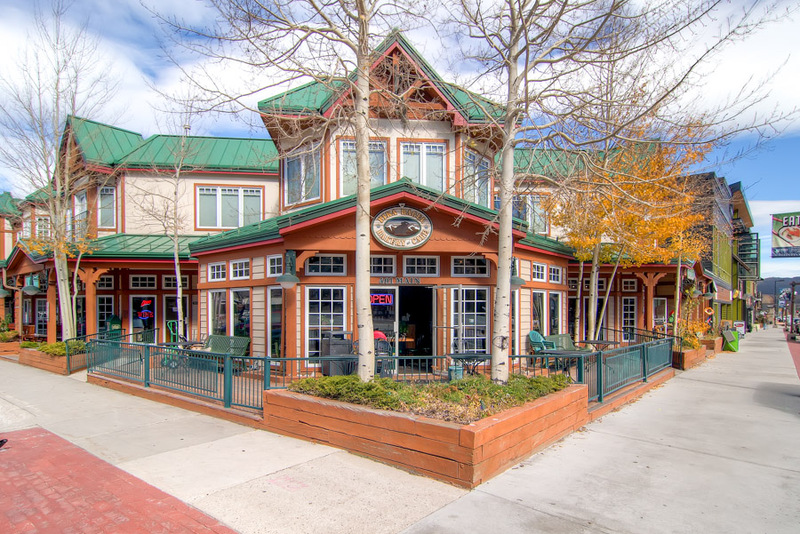 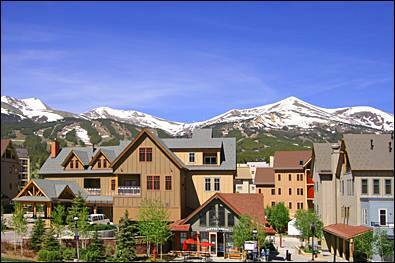 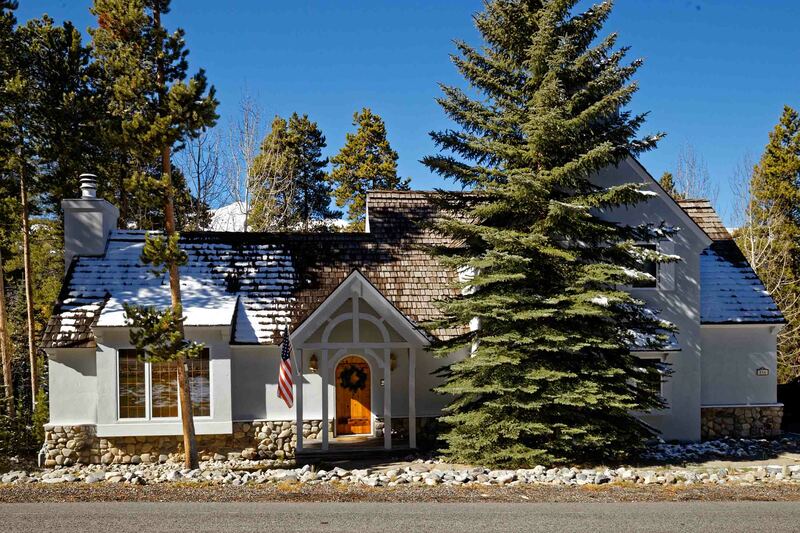 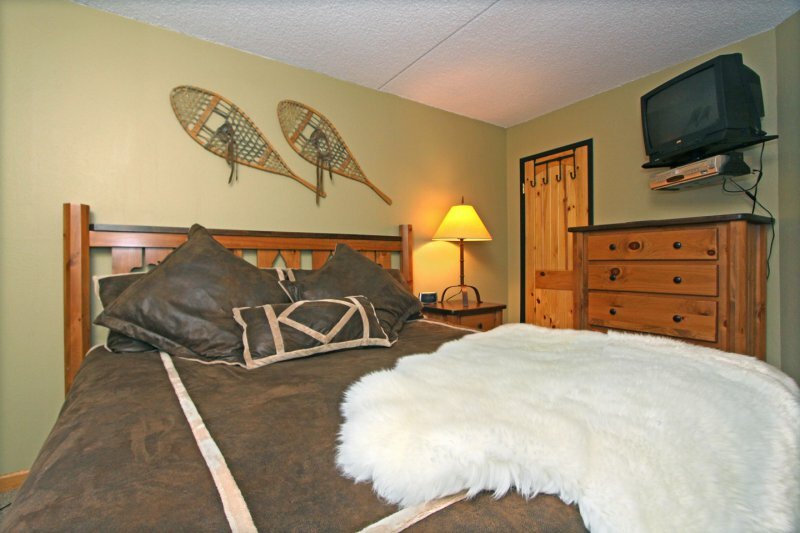 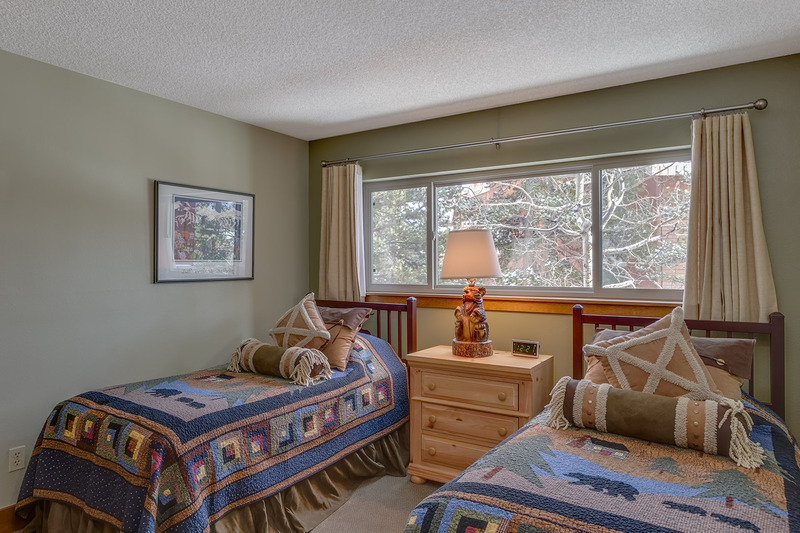 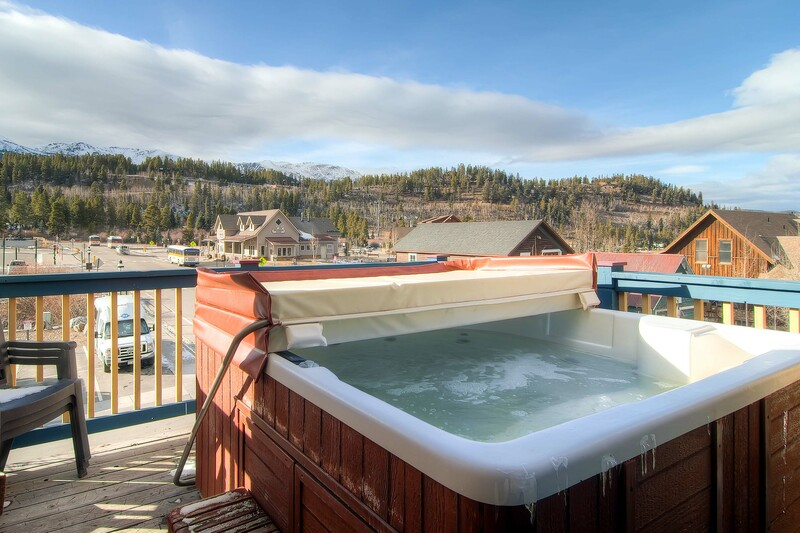 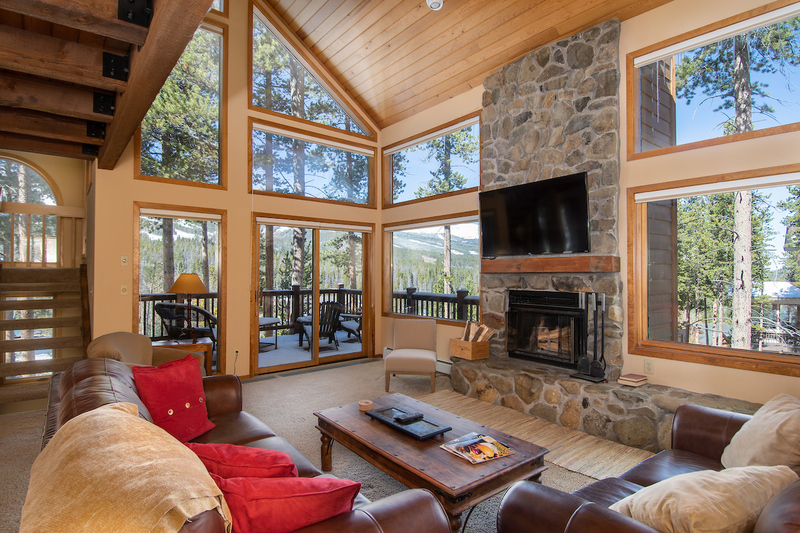 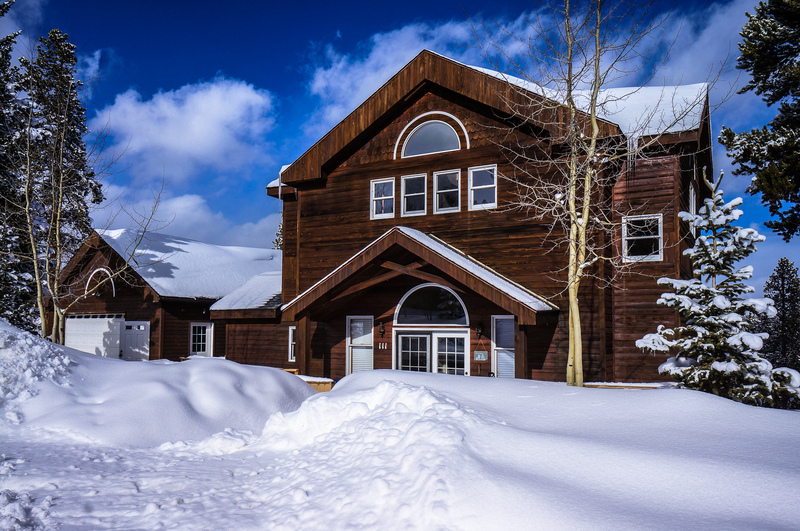 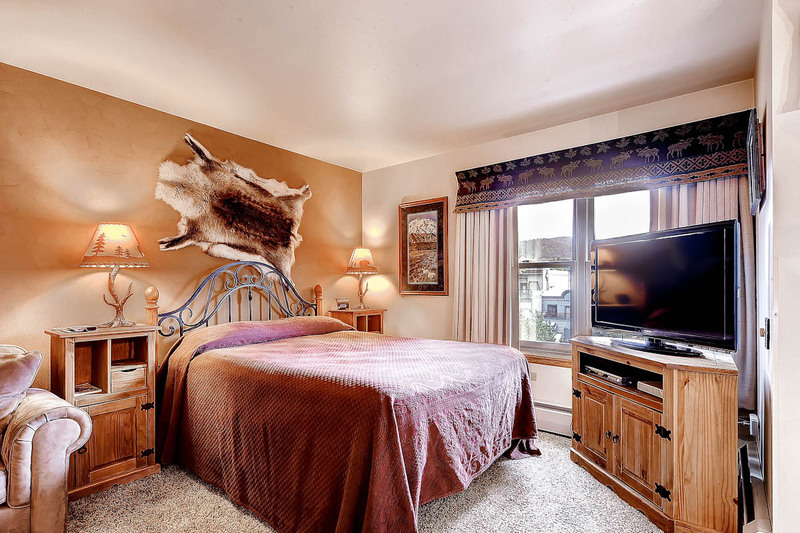 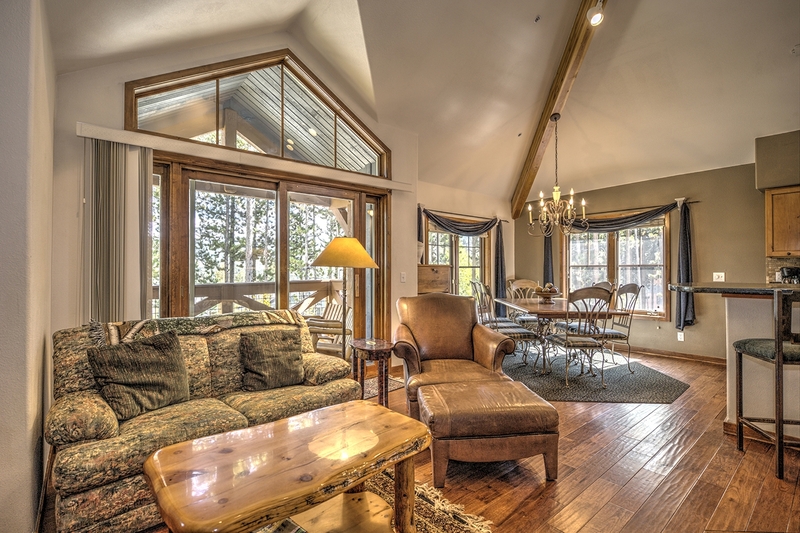 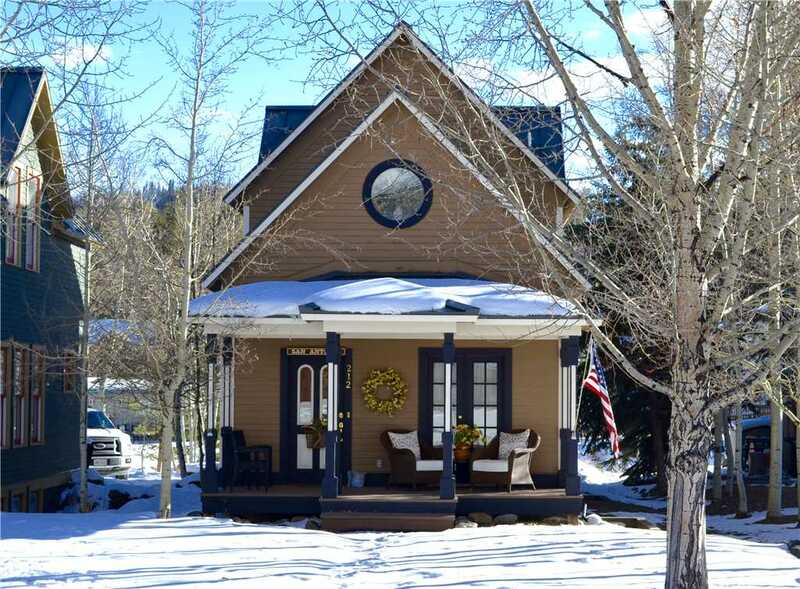 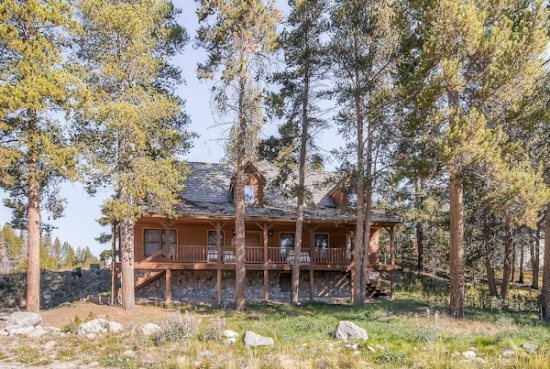 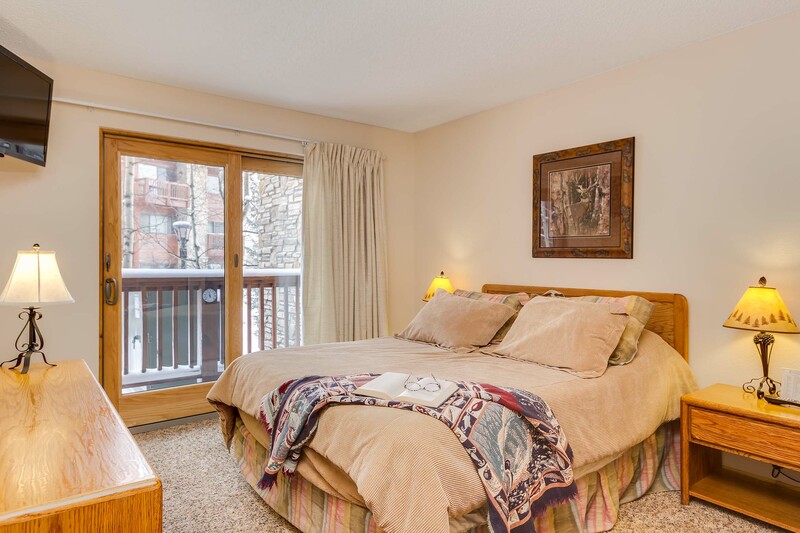 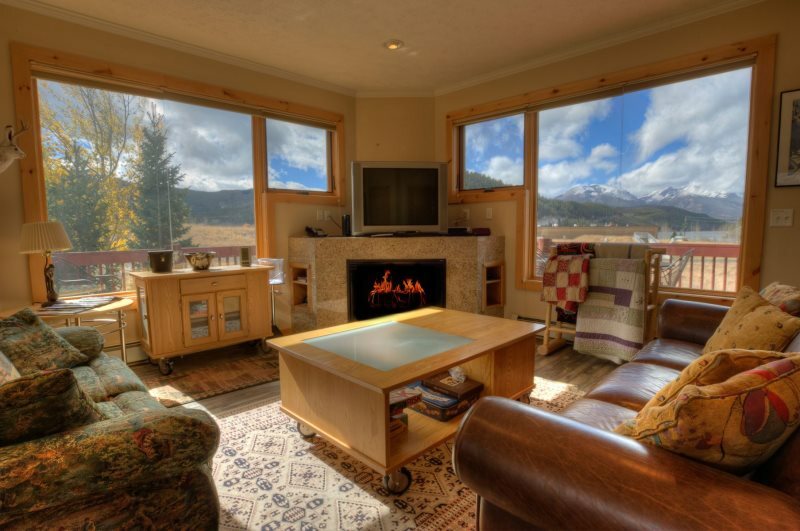 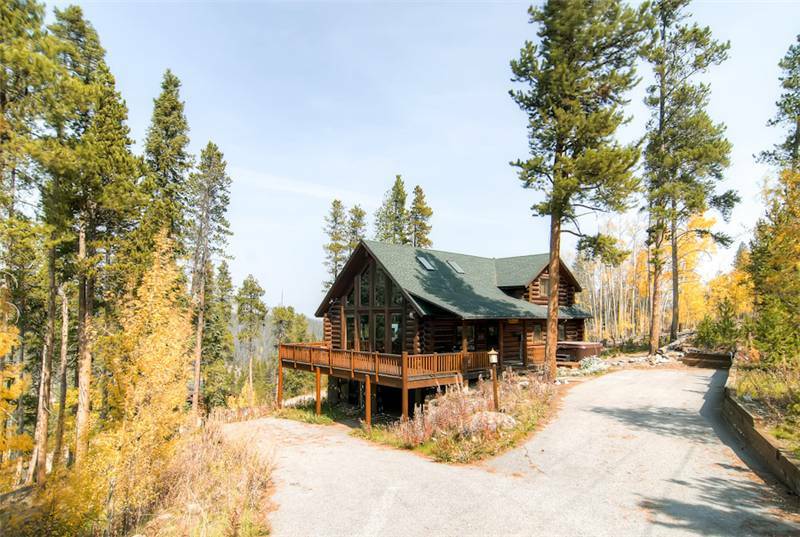 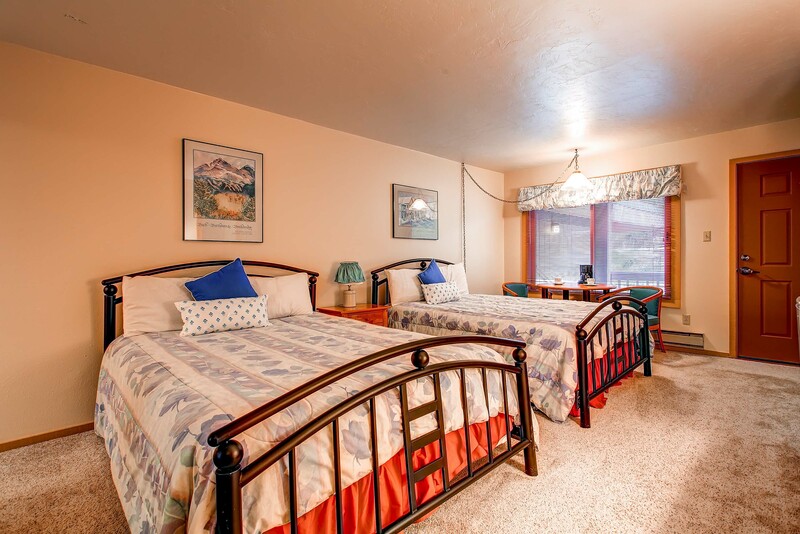 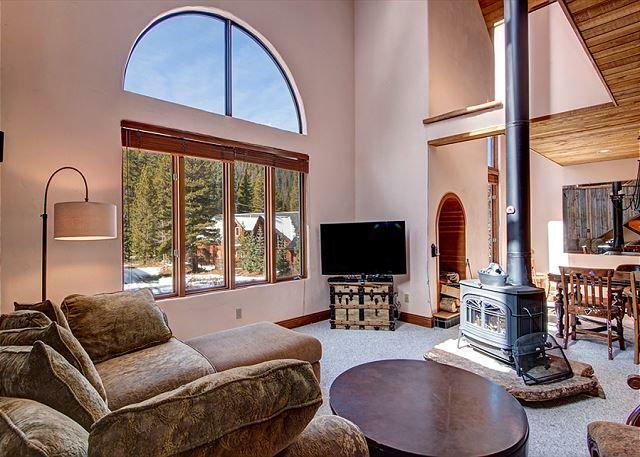 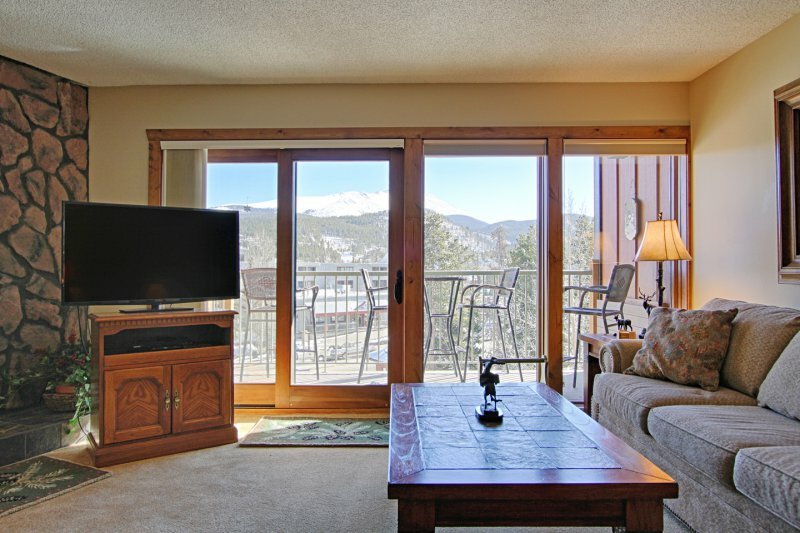 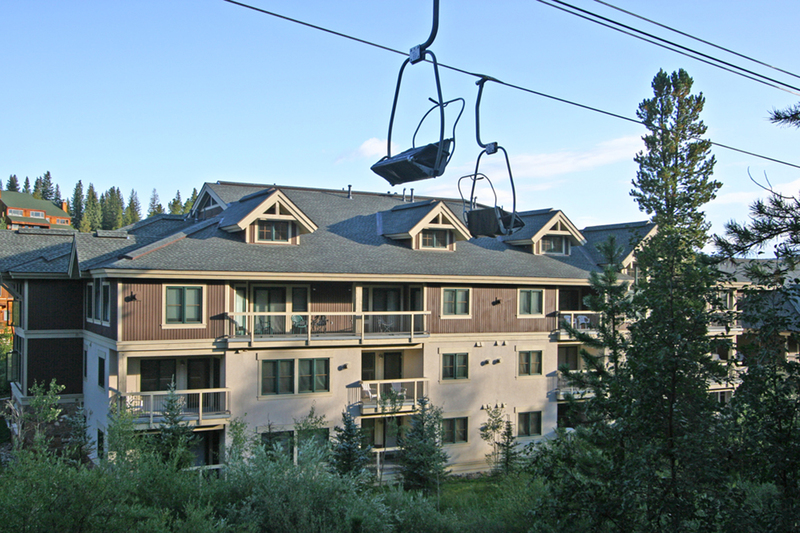 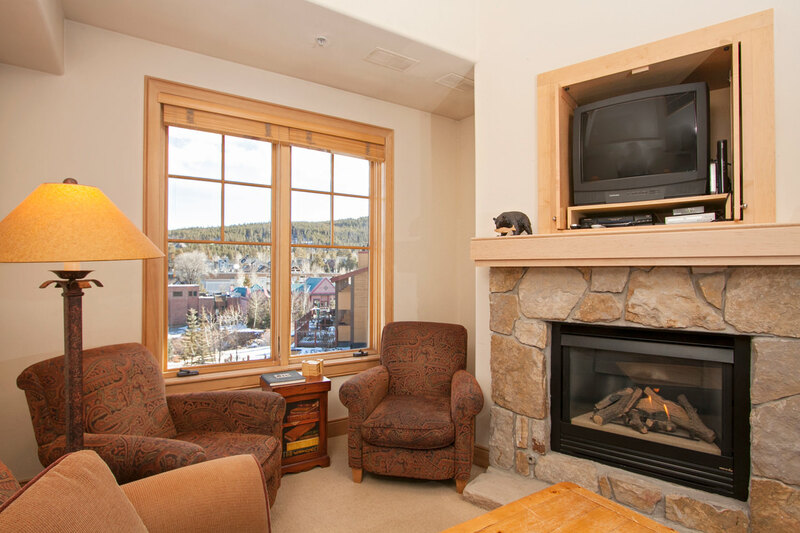 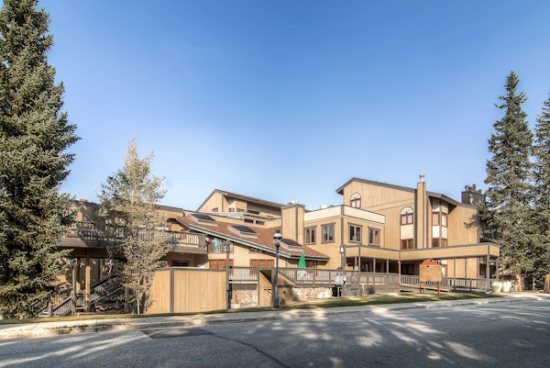 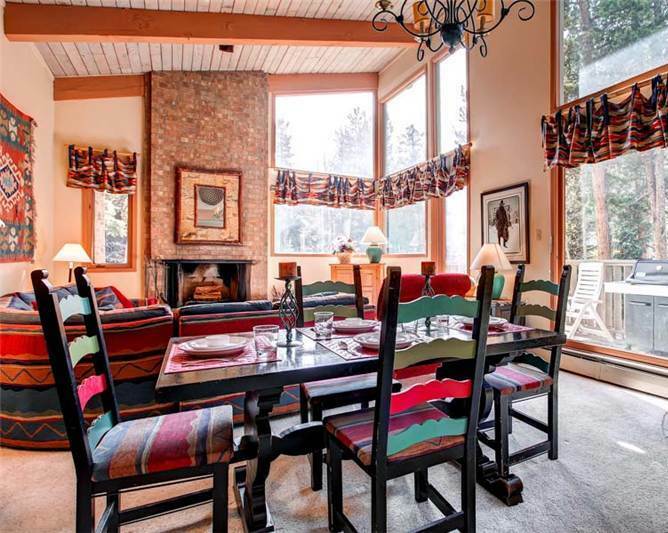 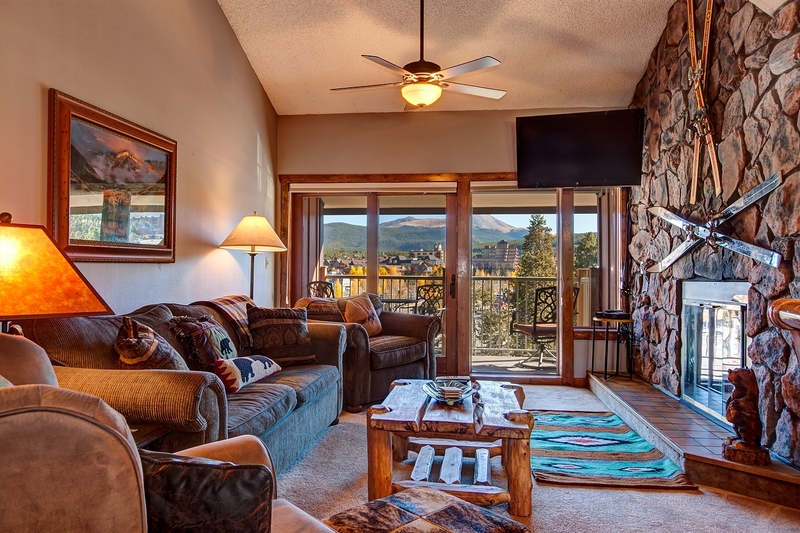 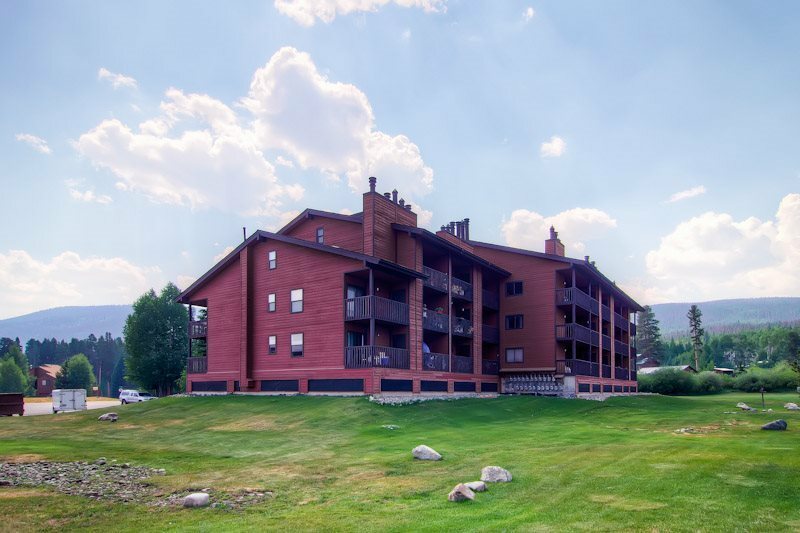 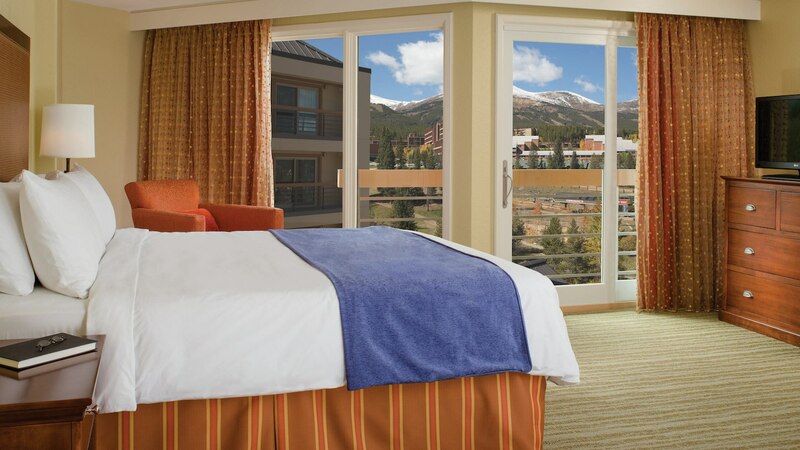 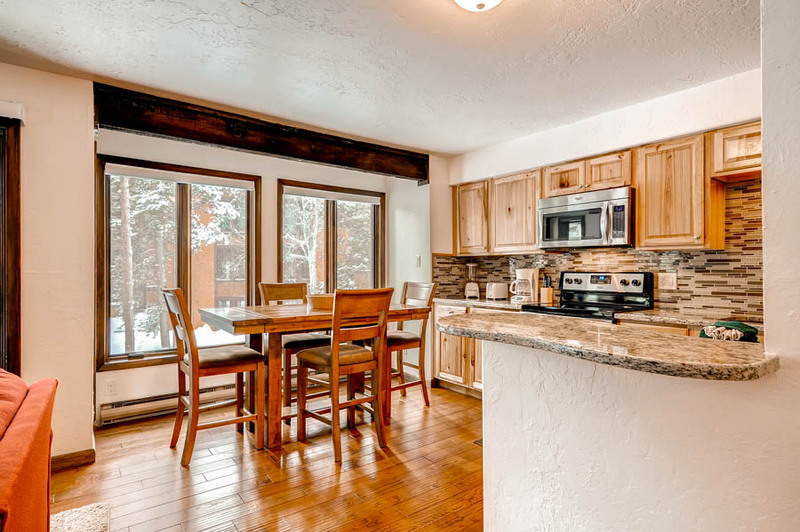 You’ll love the location: just a five-minute walk to the Quicksilver Lift and Village Ski School, as well as all the dining, shopping and entertainment of historic Main Street Breckenridge. 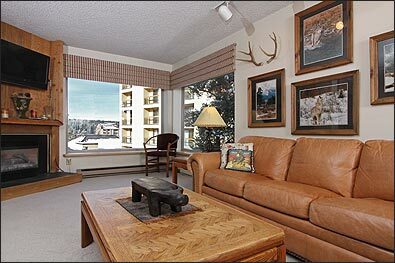 And, the free shuttle to the slopes and downtown stops one block from the complex. 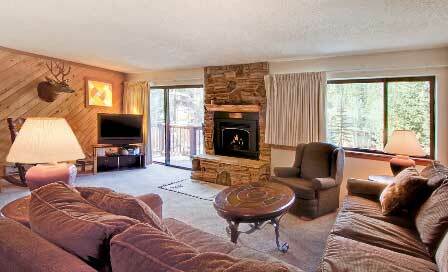 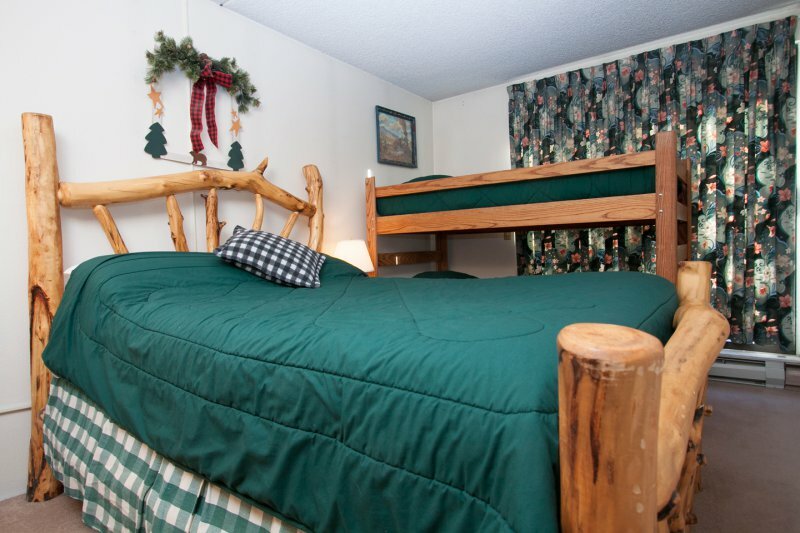 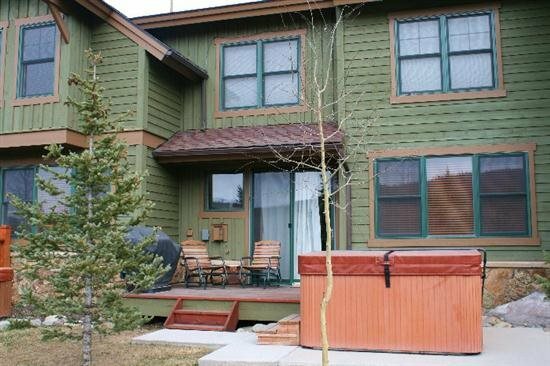 You’ll also enjoy access to the Columbine outdoor heated pool and indoor/outdoor hot tubs just a short walk away! 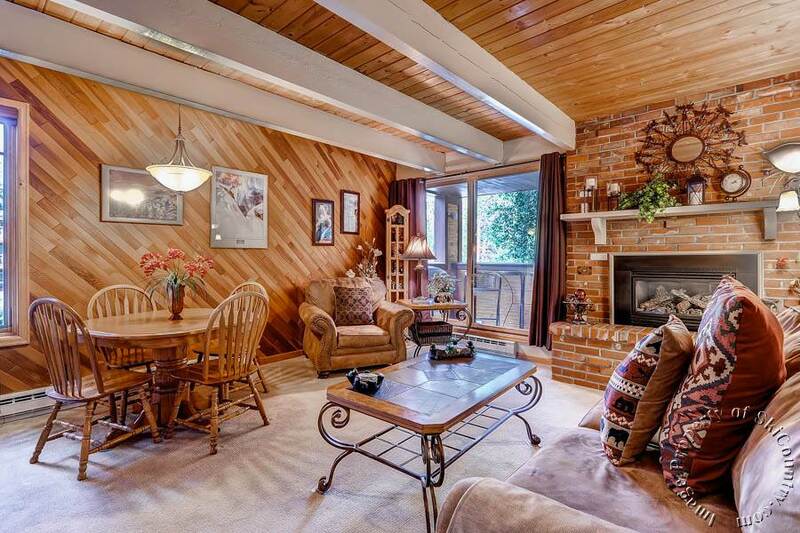 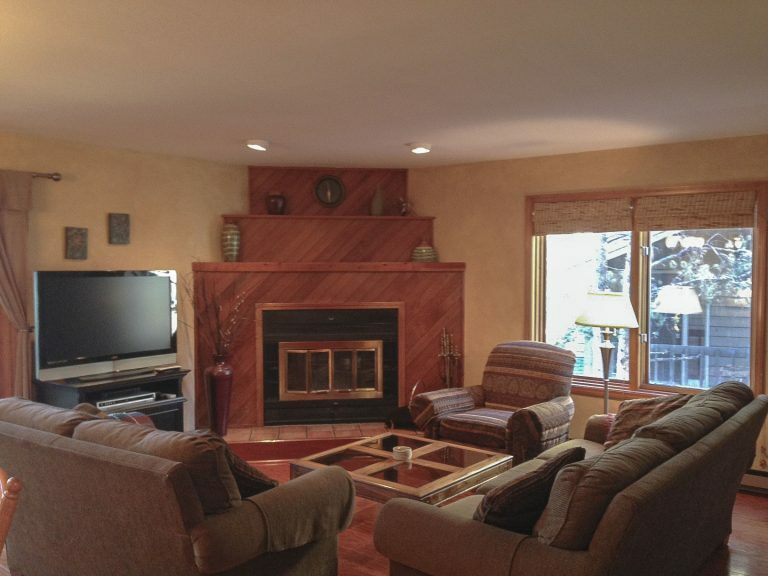 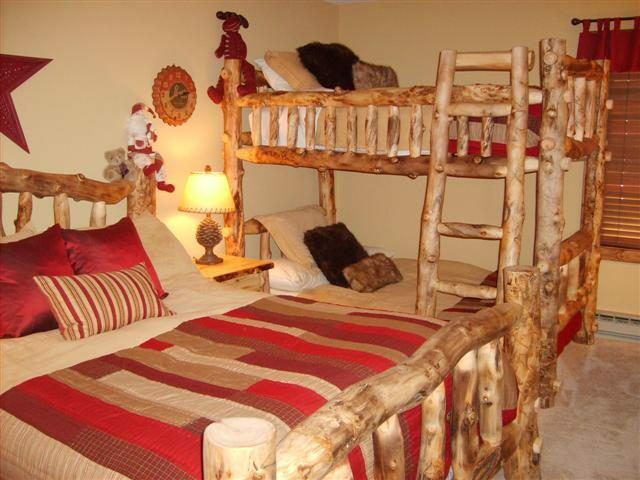 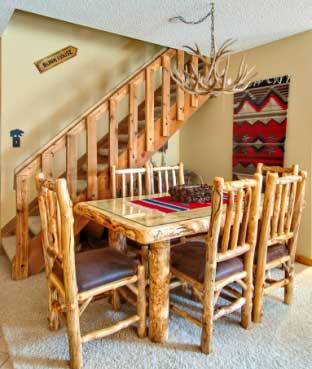 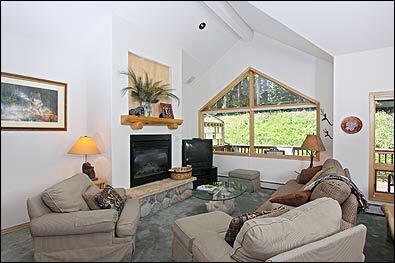 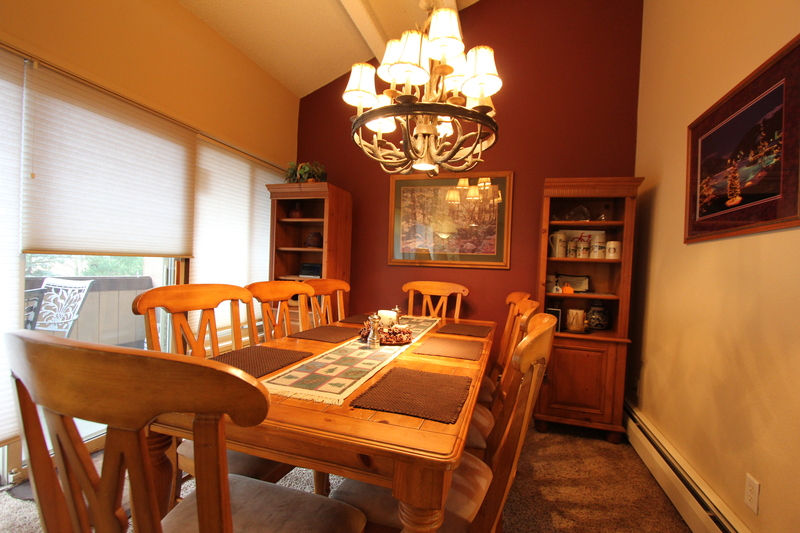 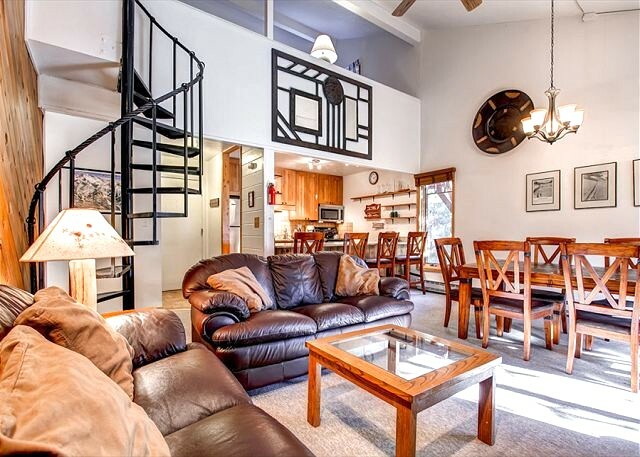 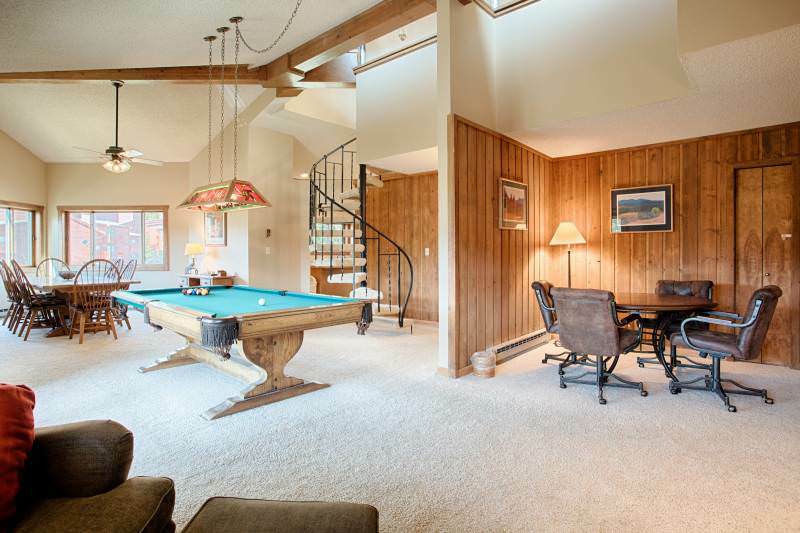 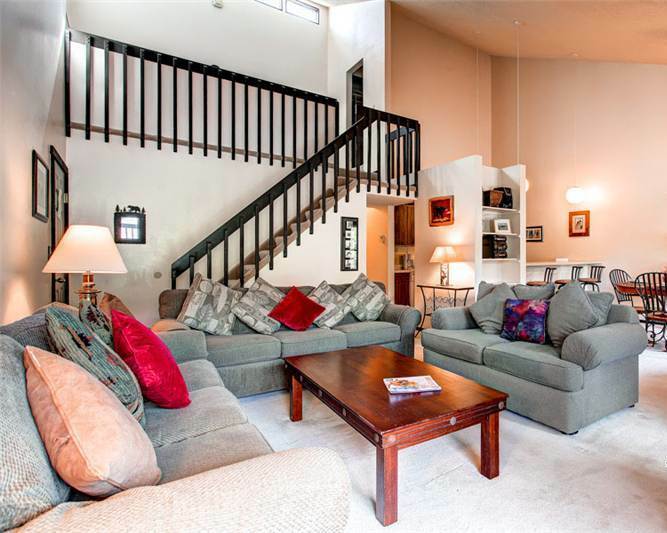 With three levels, there’s plenty of room for everyone to stretch out and relax. 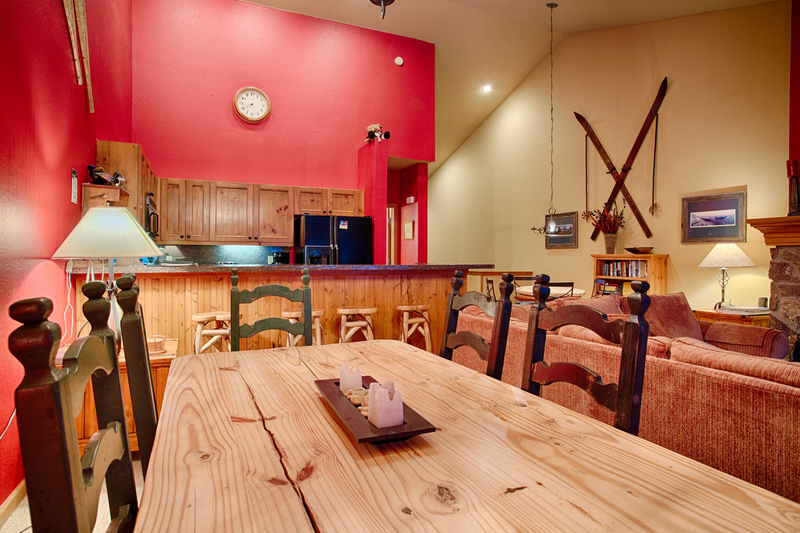 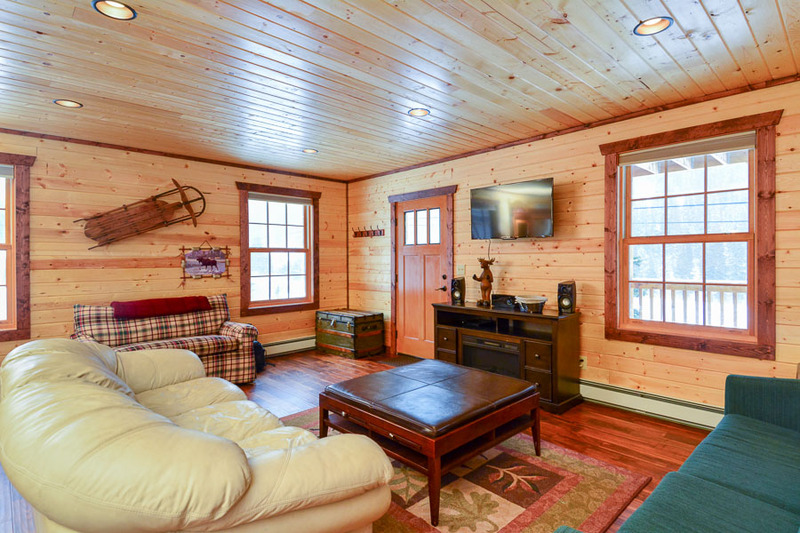 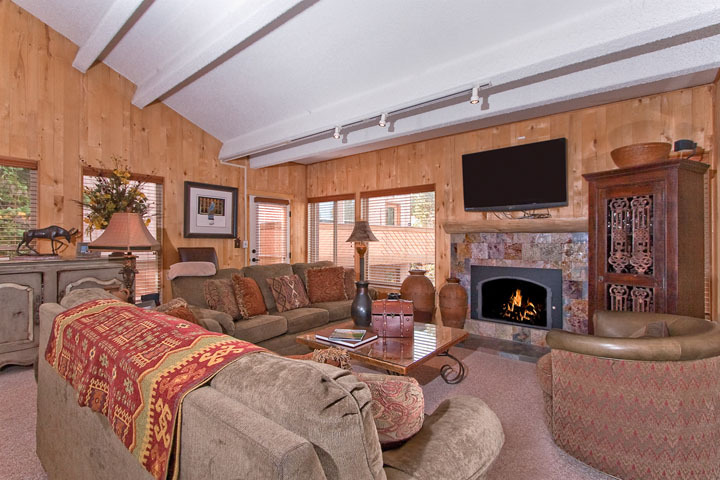 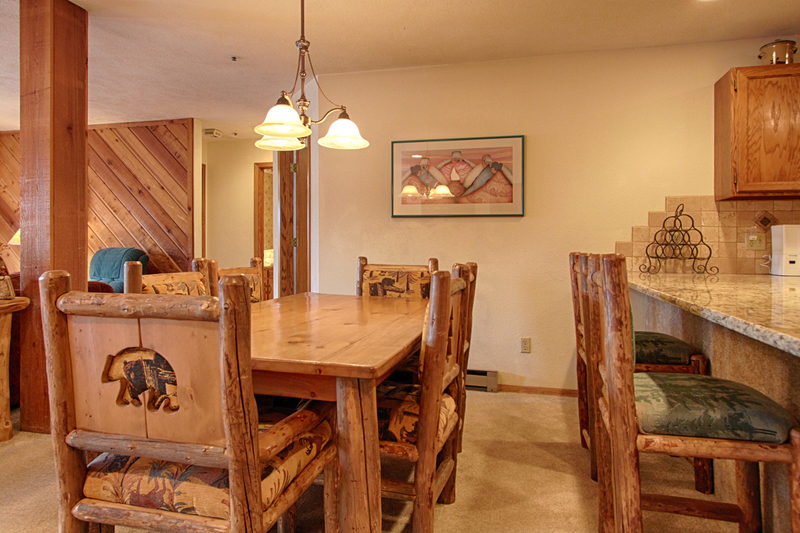 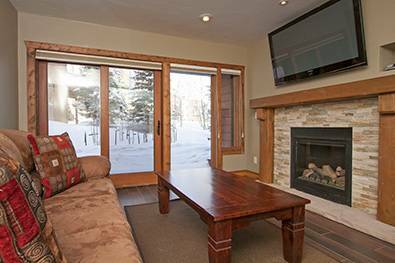 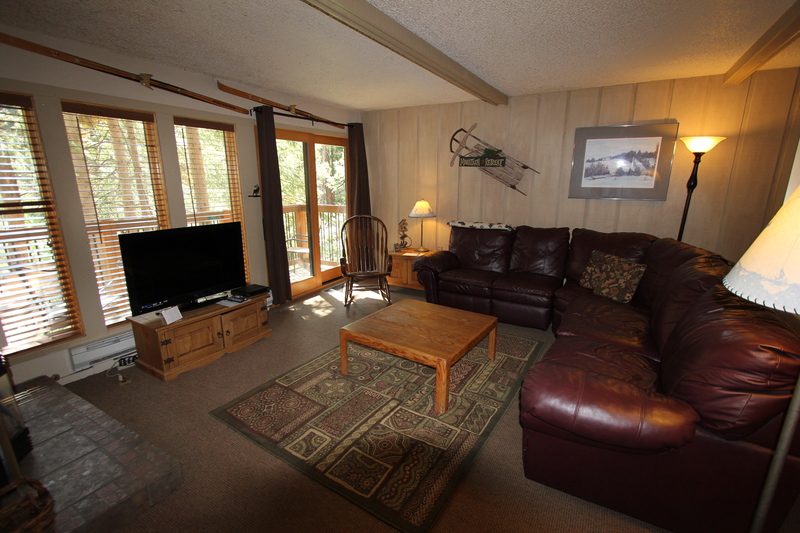 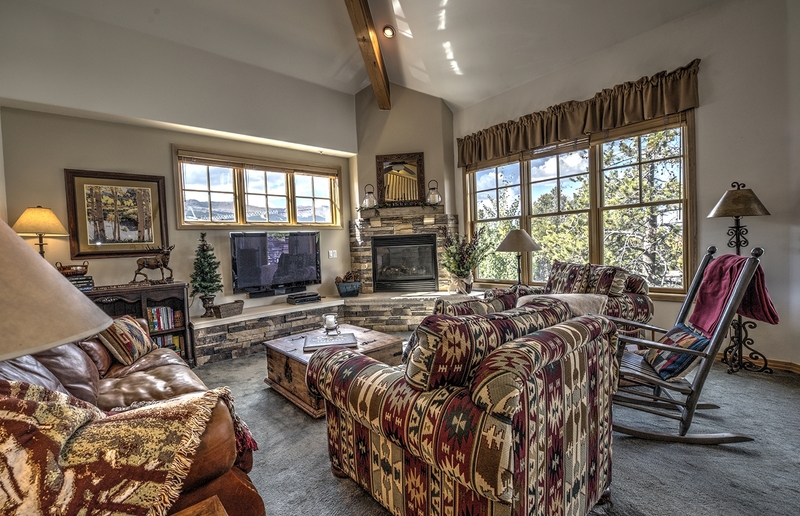 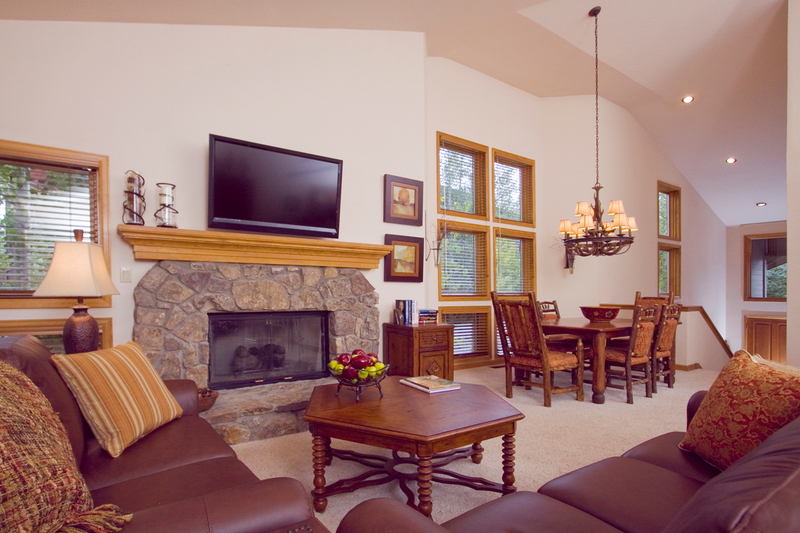 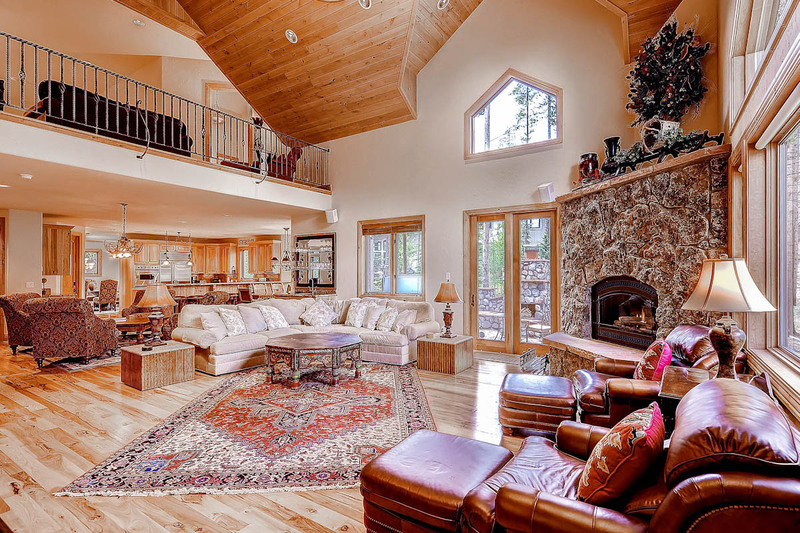 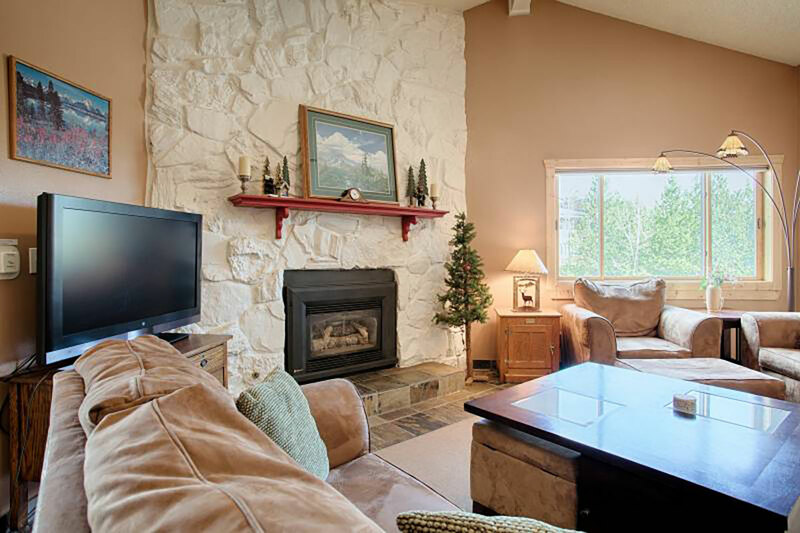 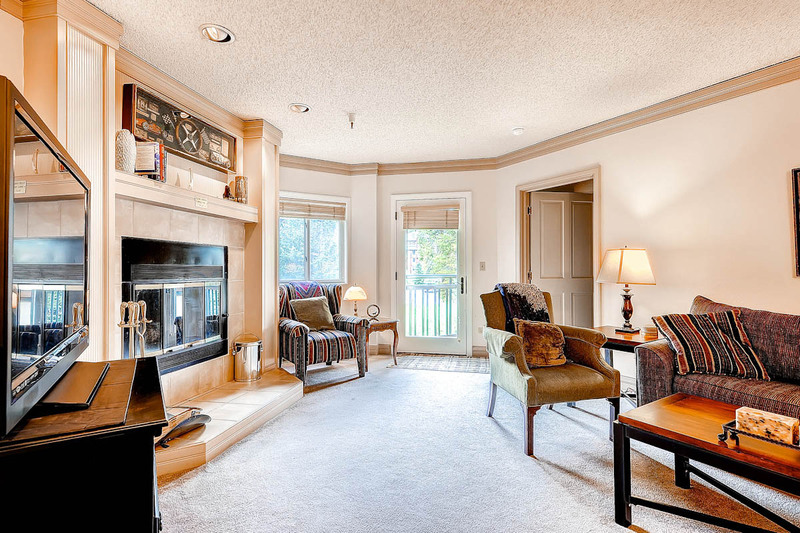 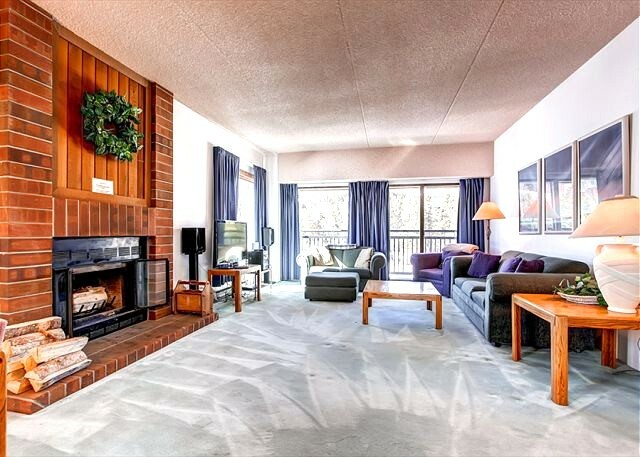 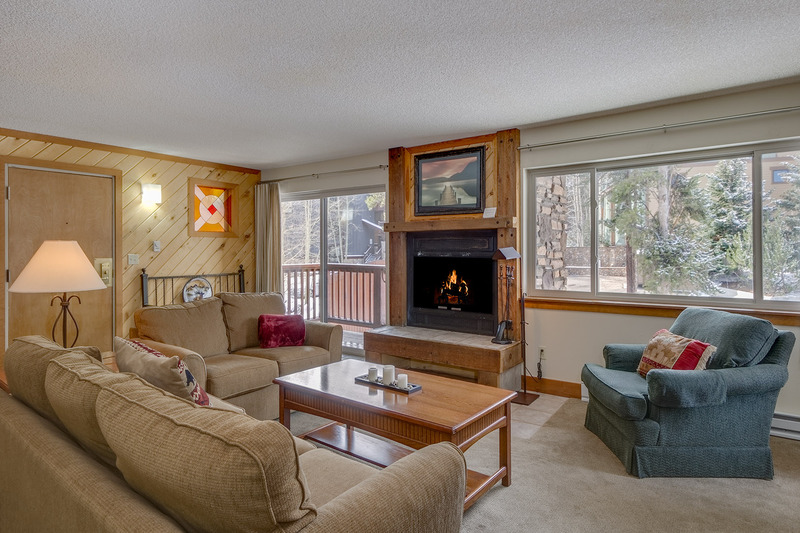 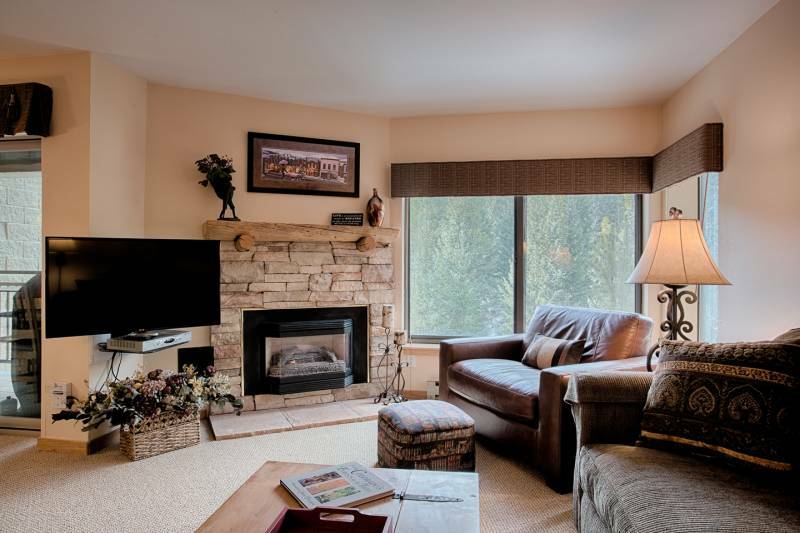 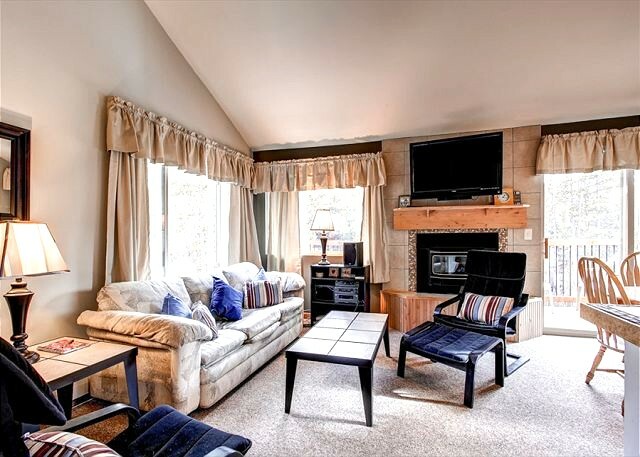 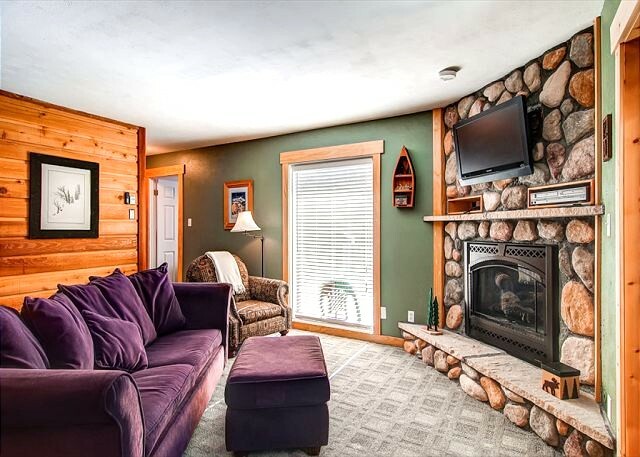 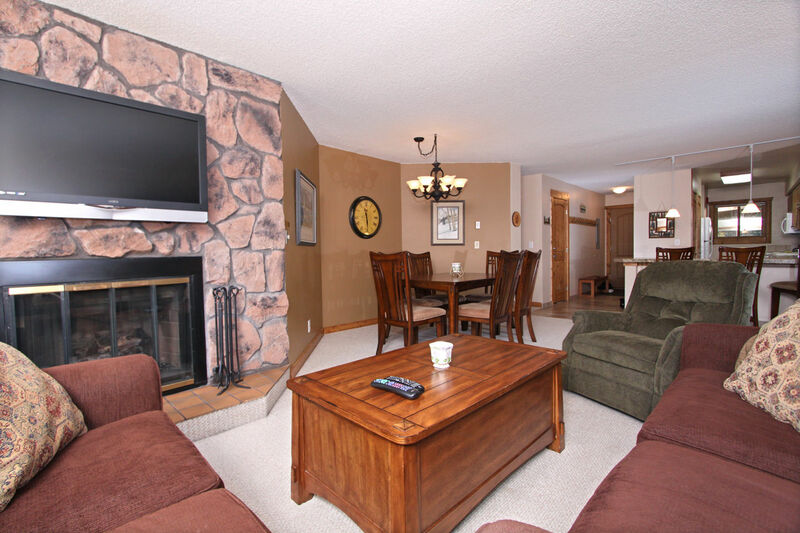 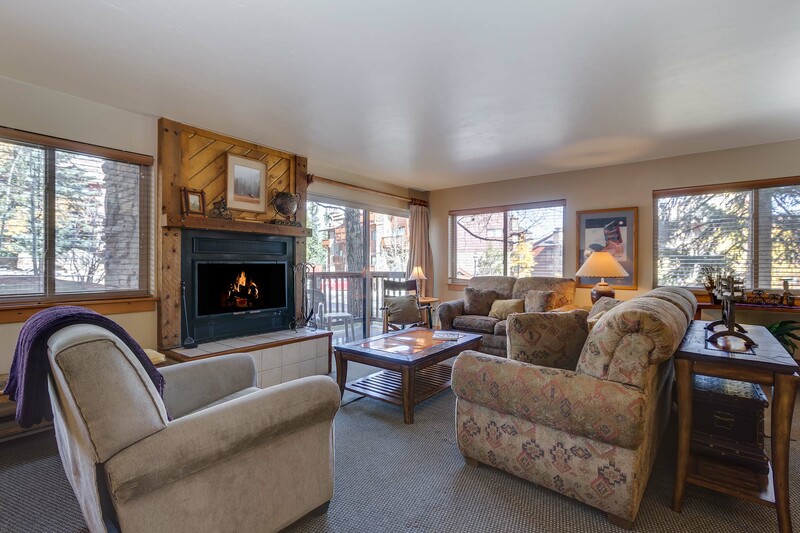 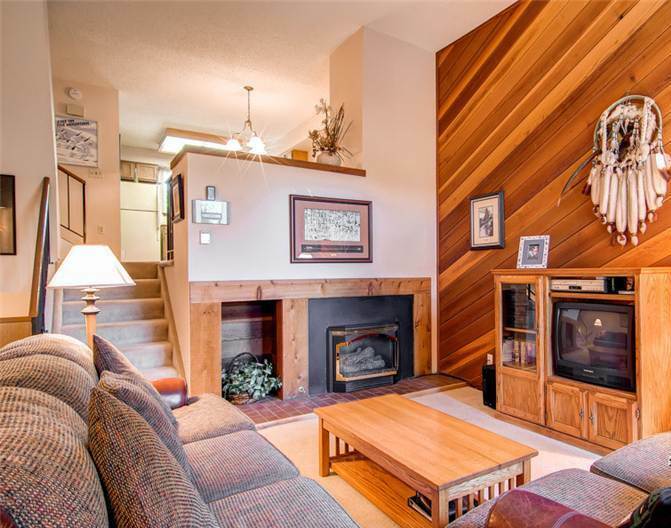 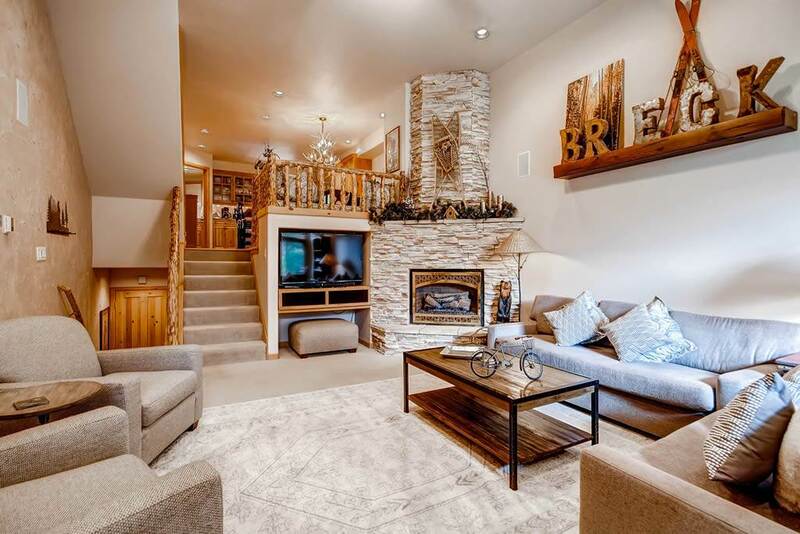 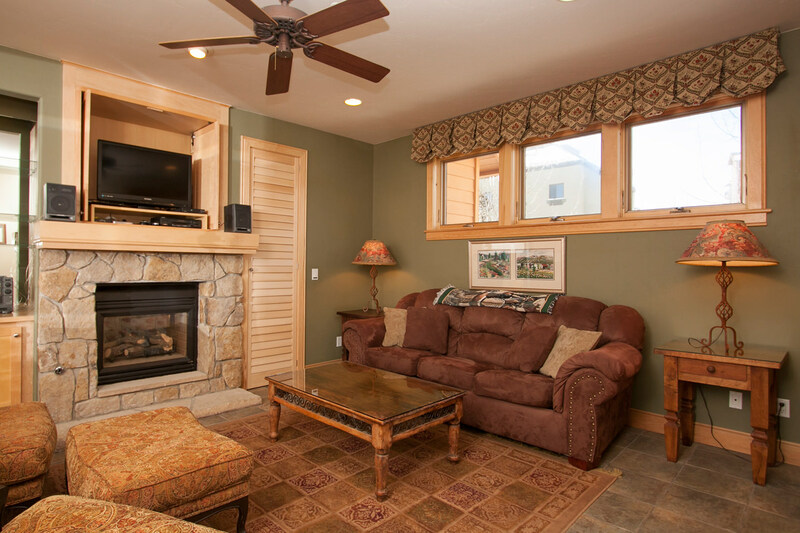 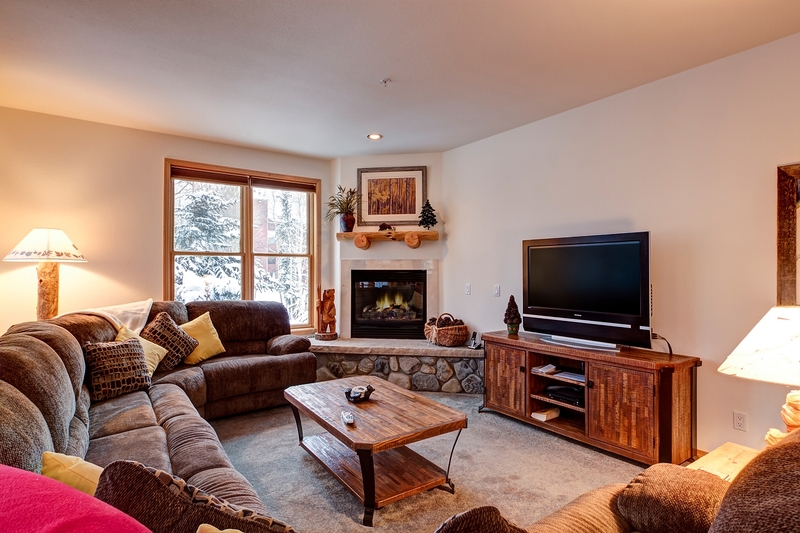 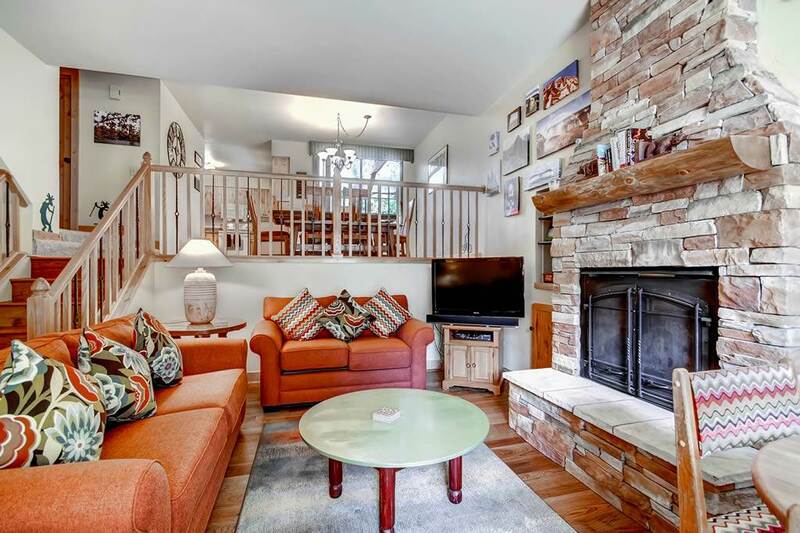 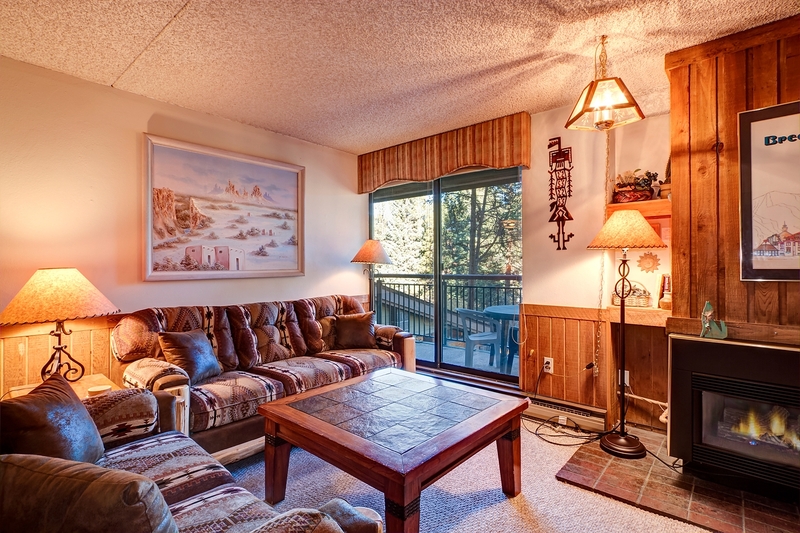 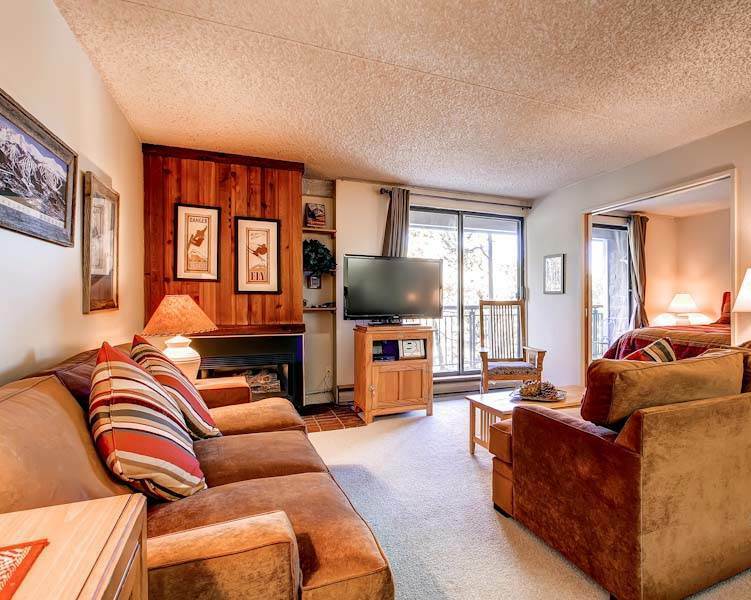 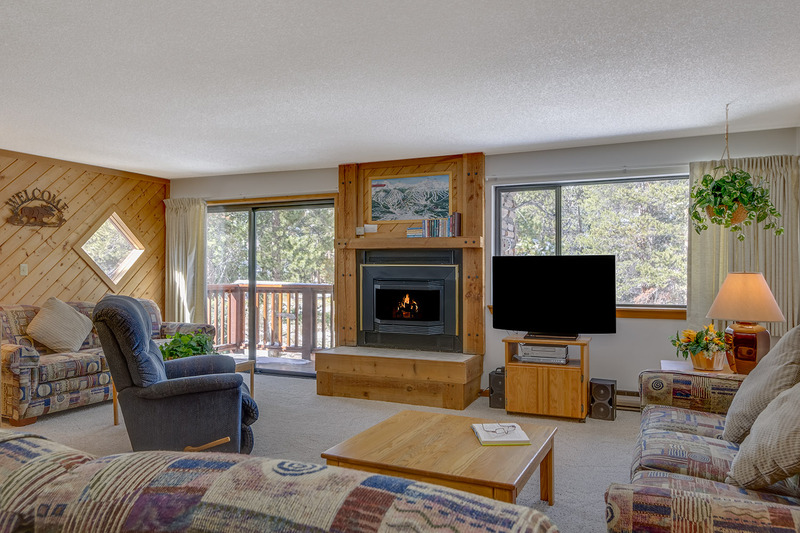 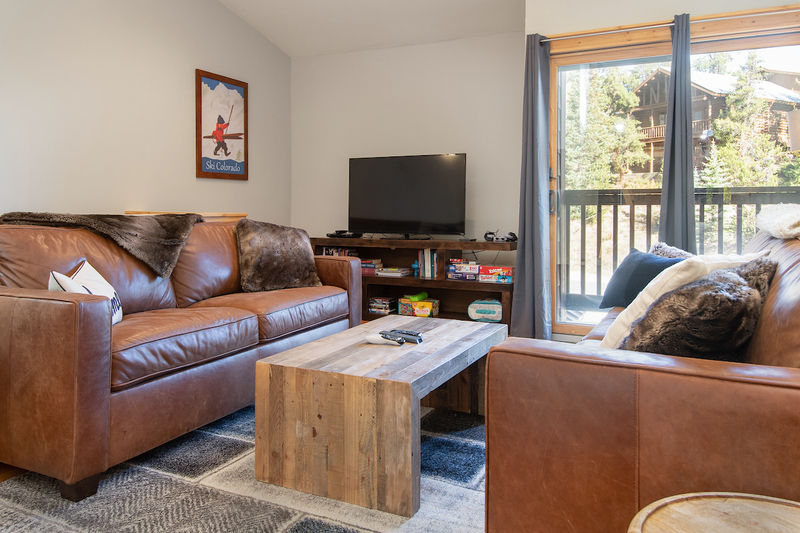 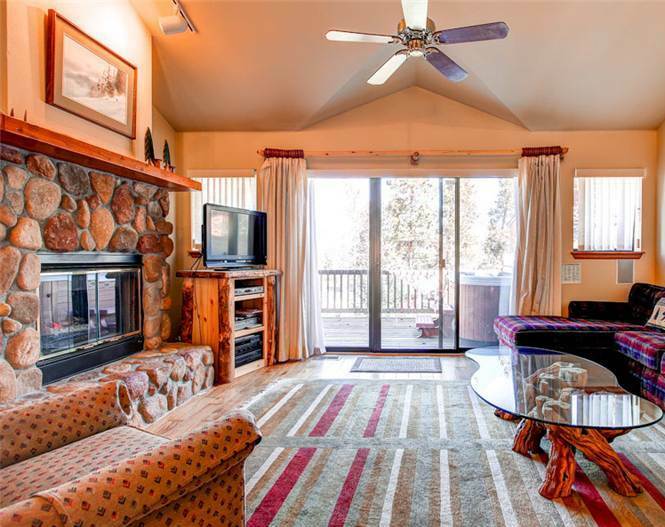 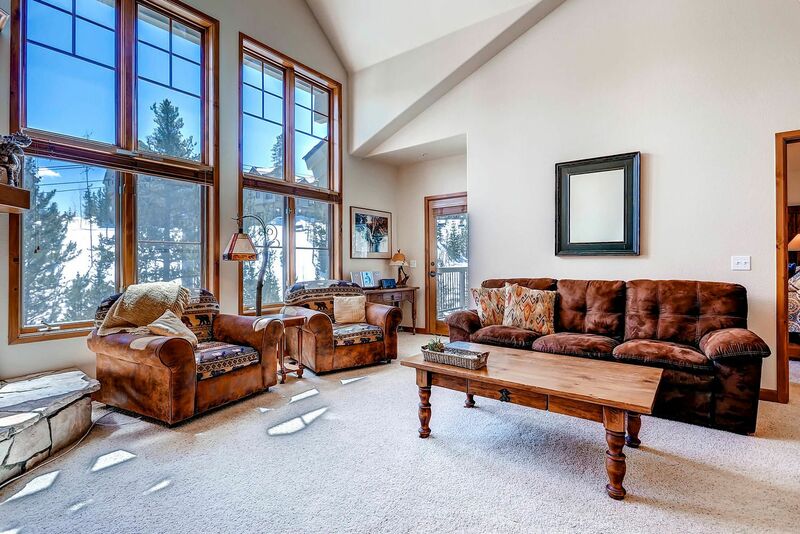 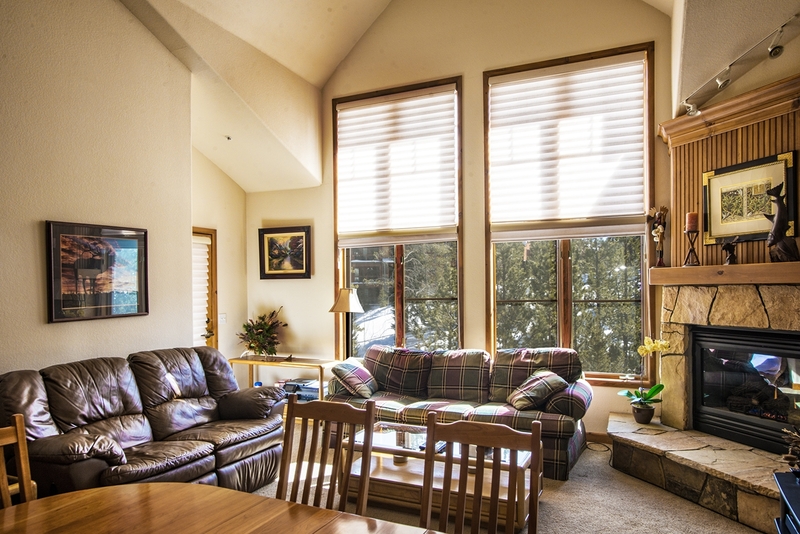 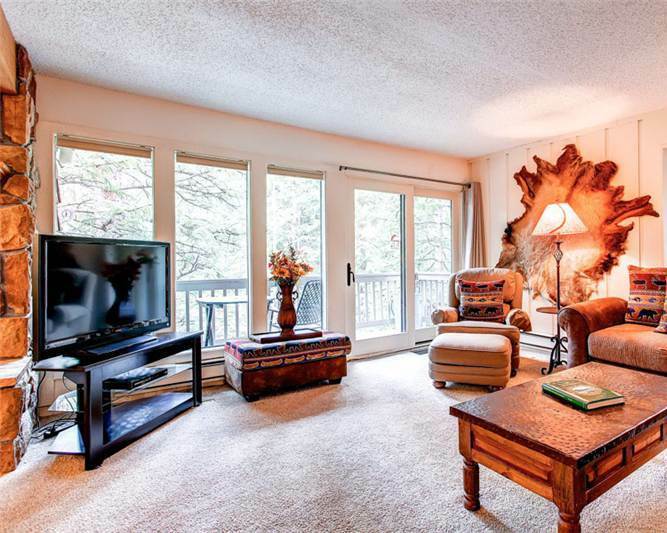 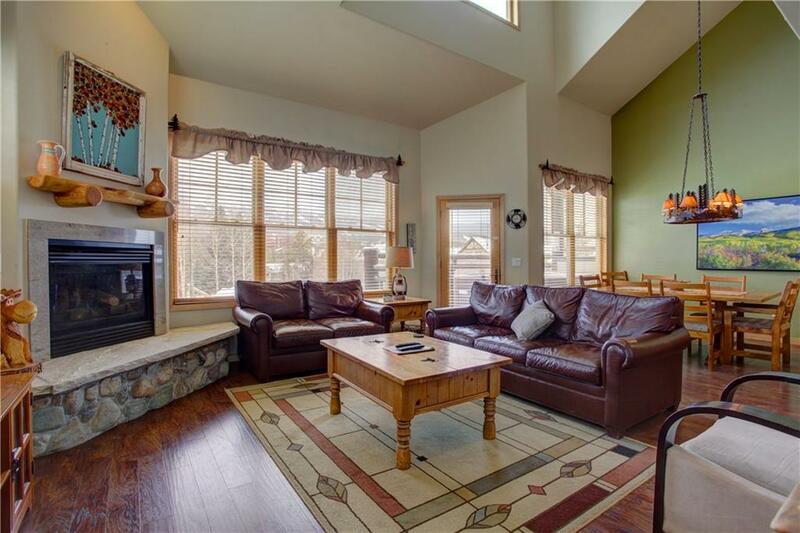 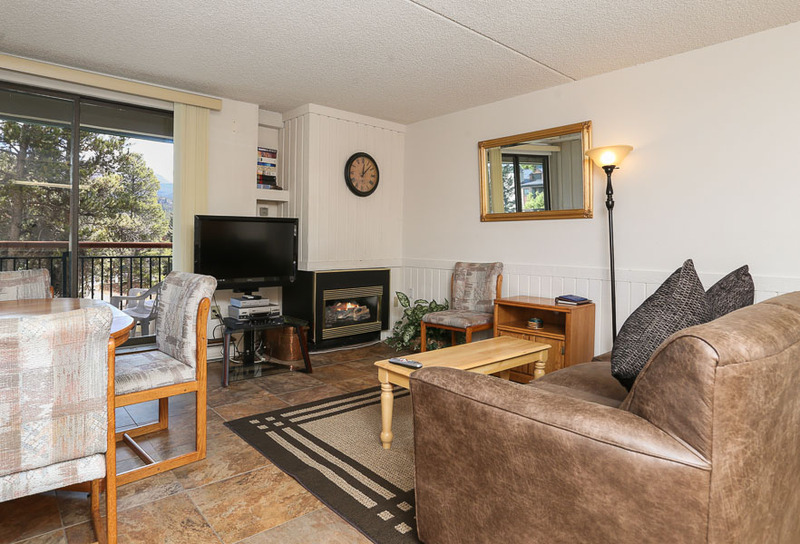 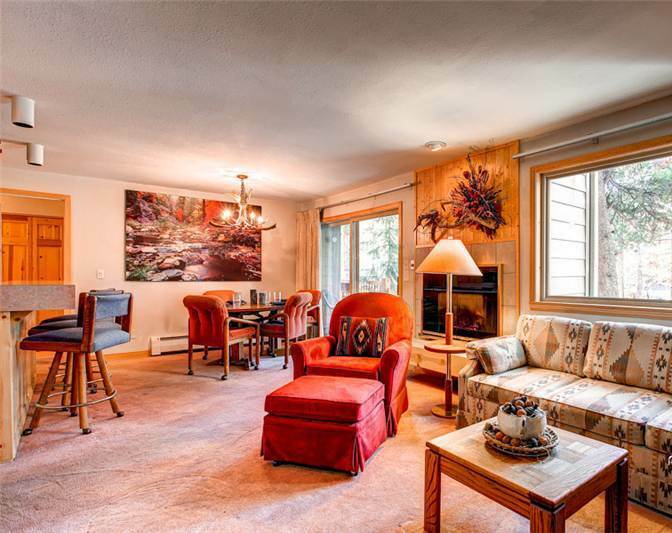 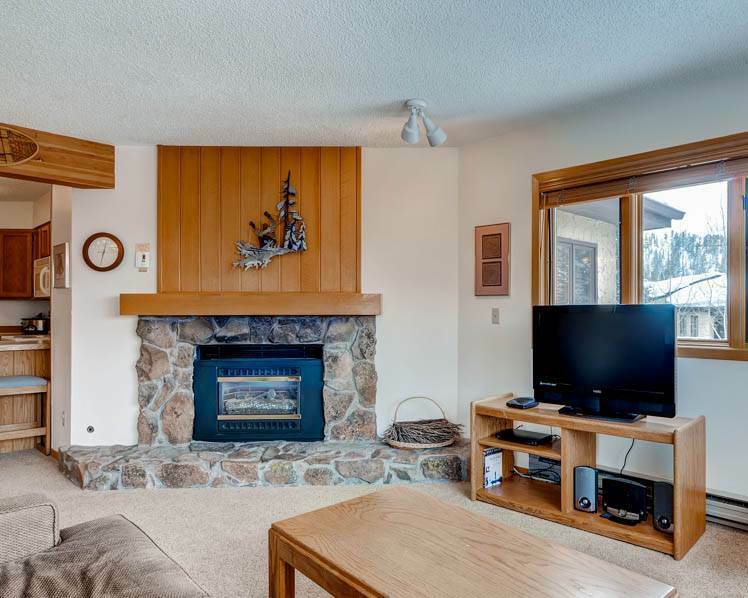 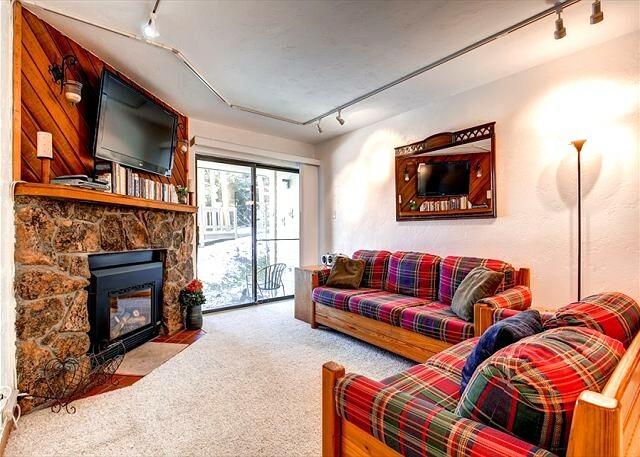 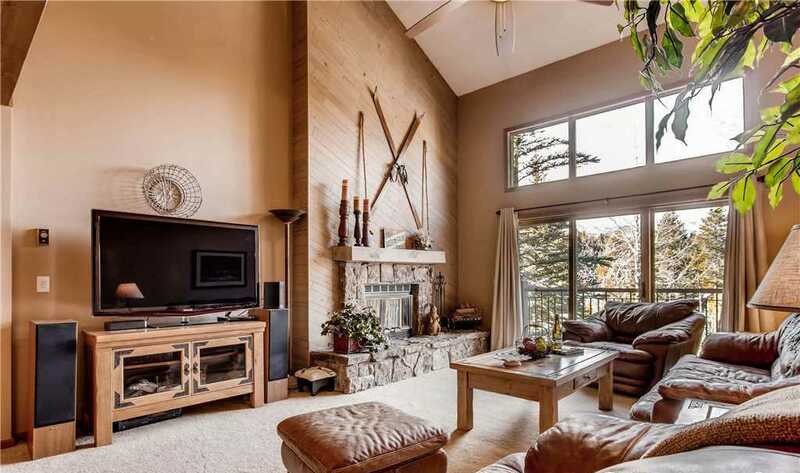 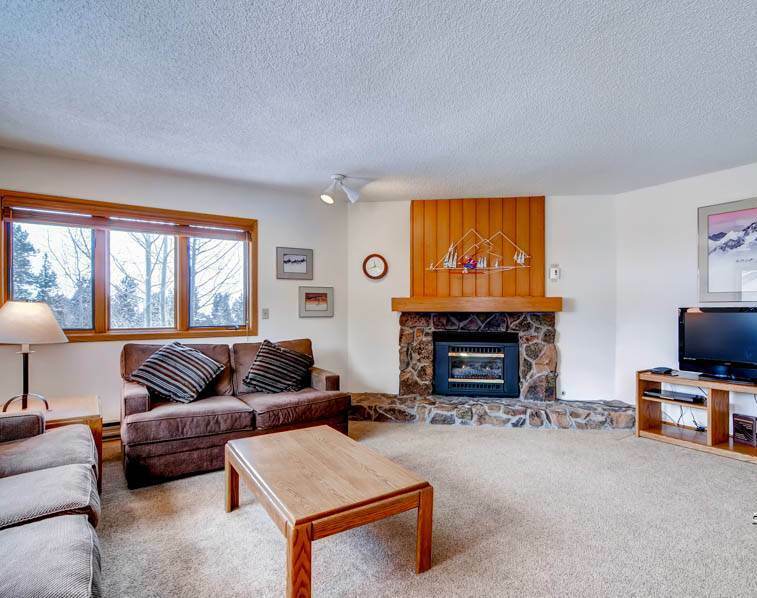 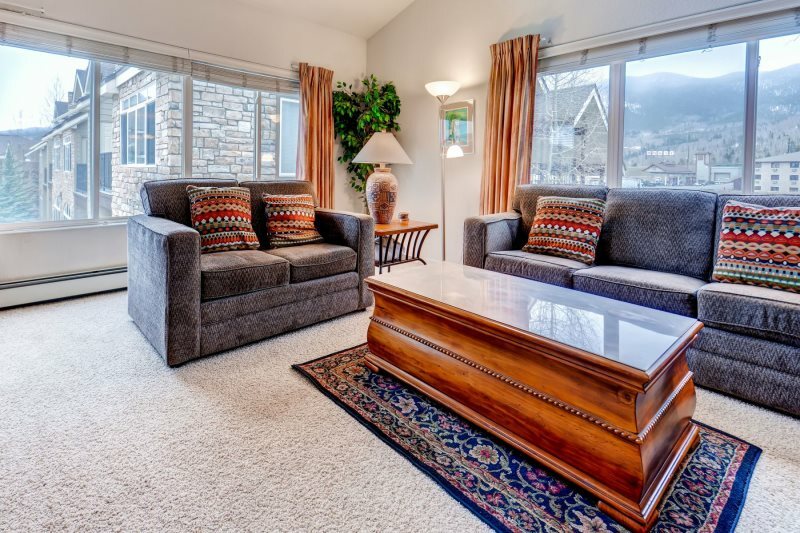 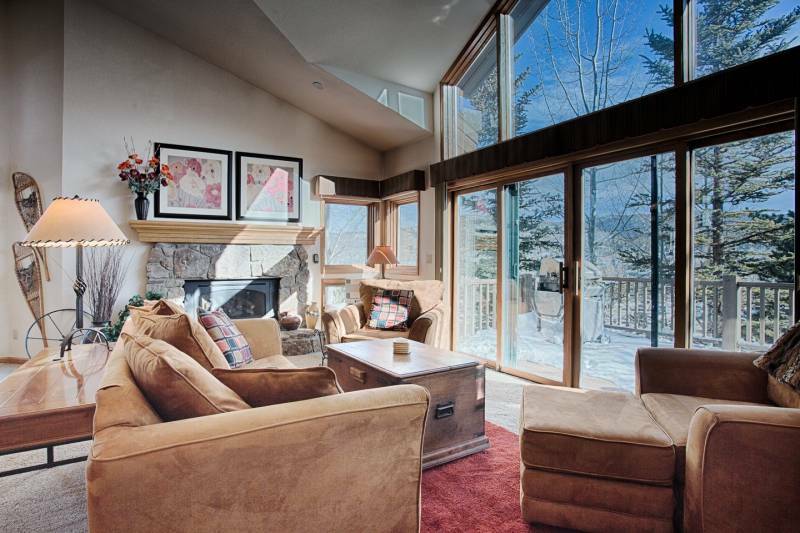 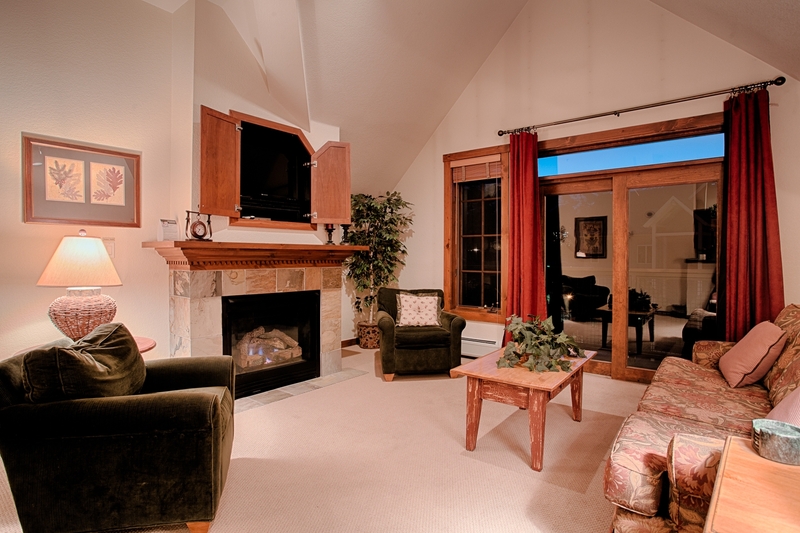 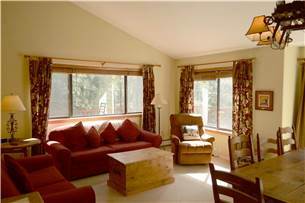 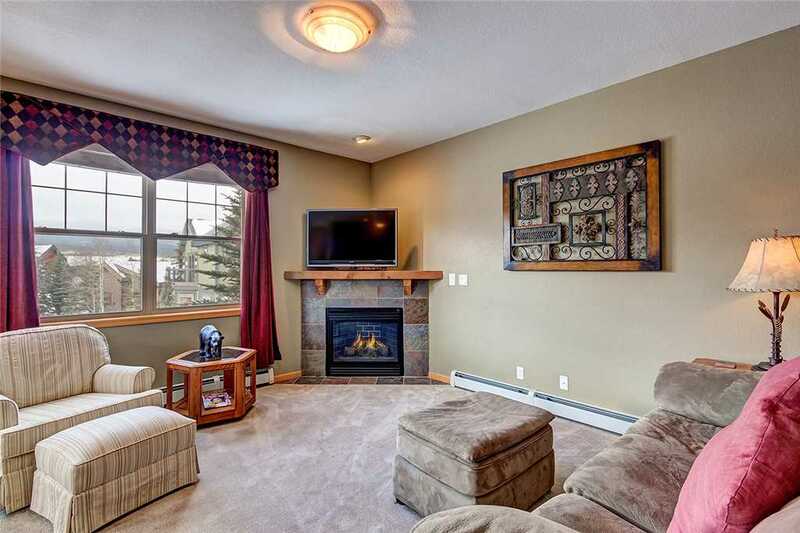 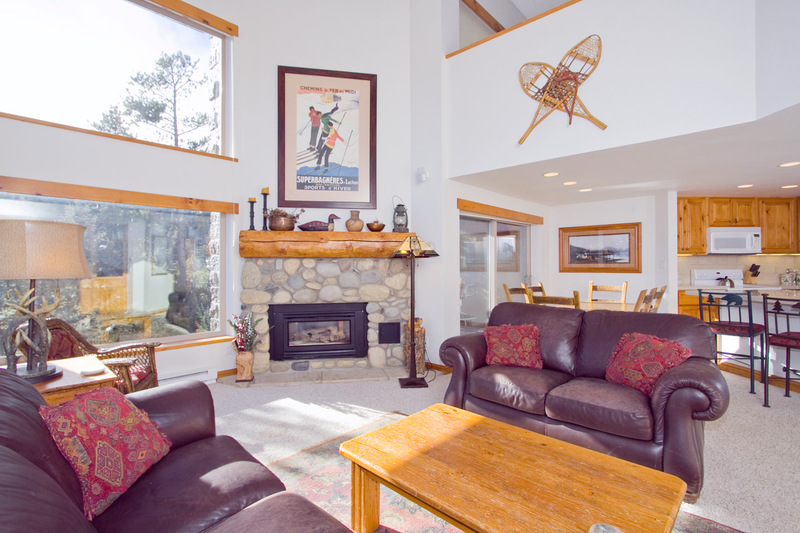 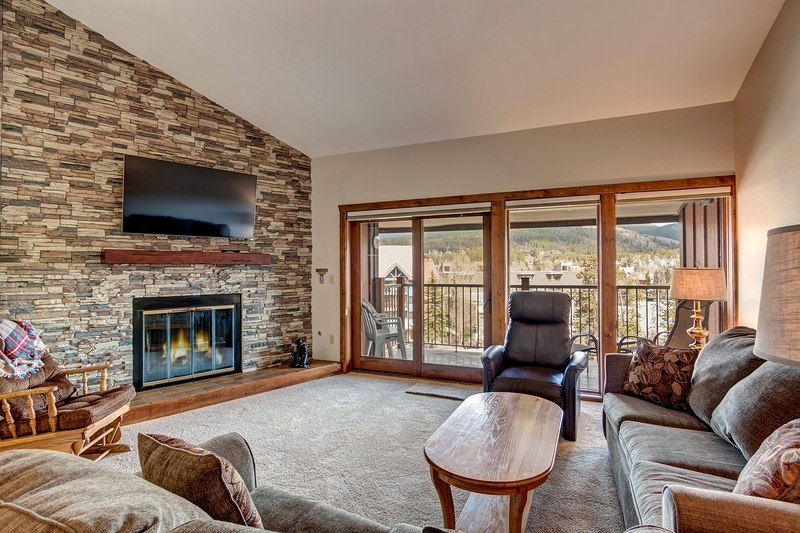 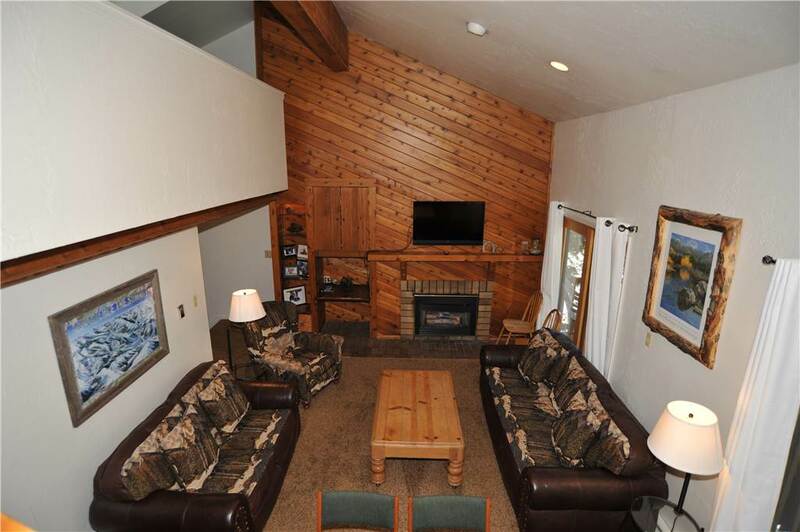 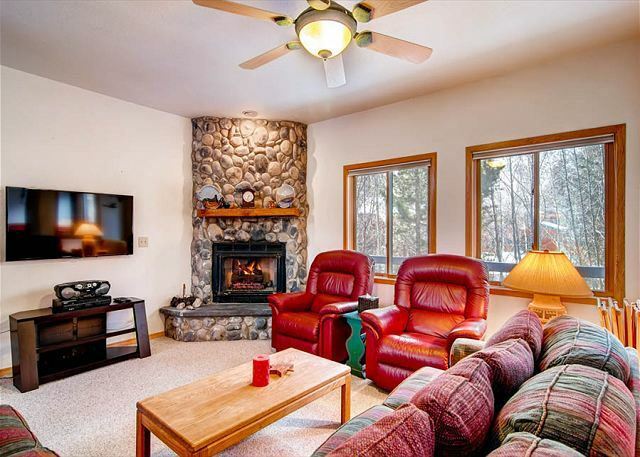 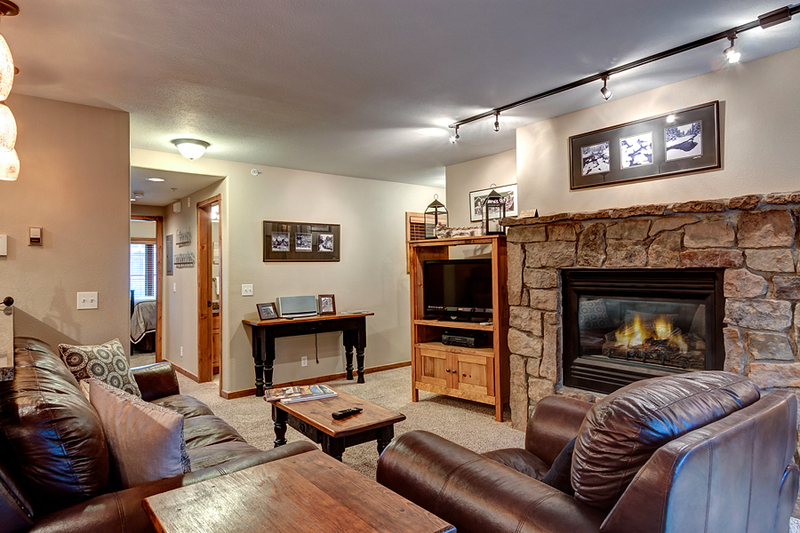 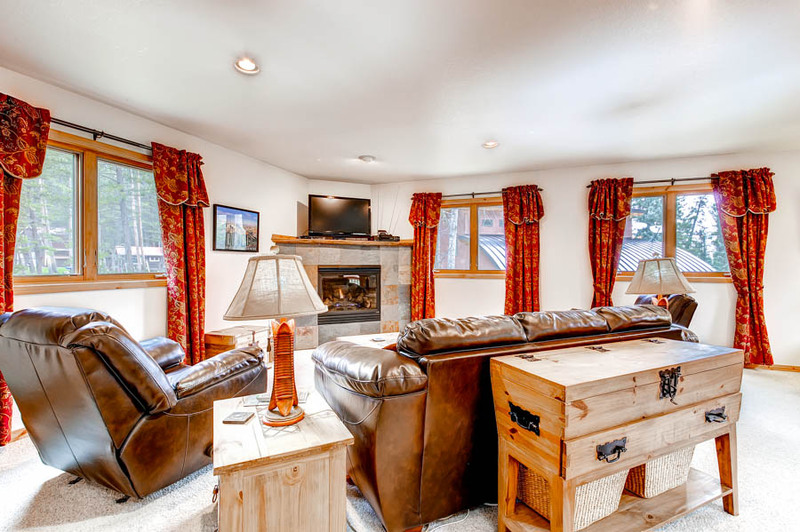 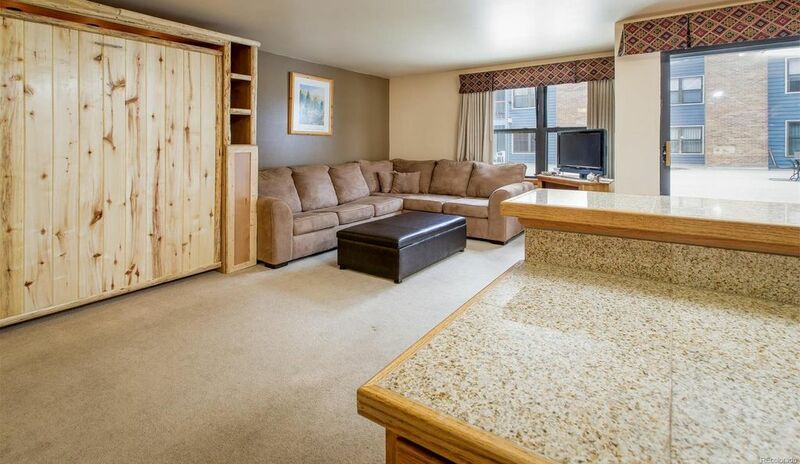 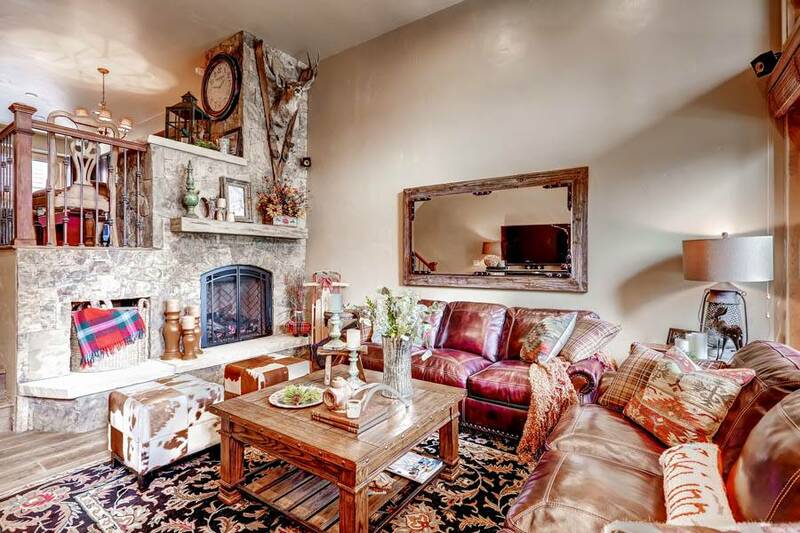 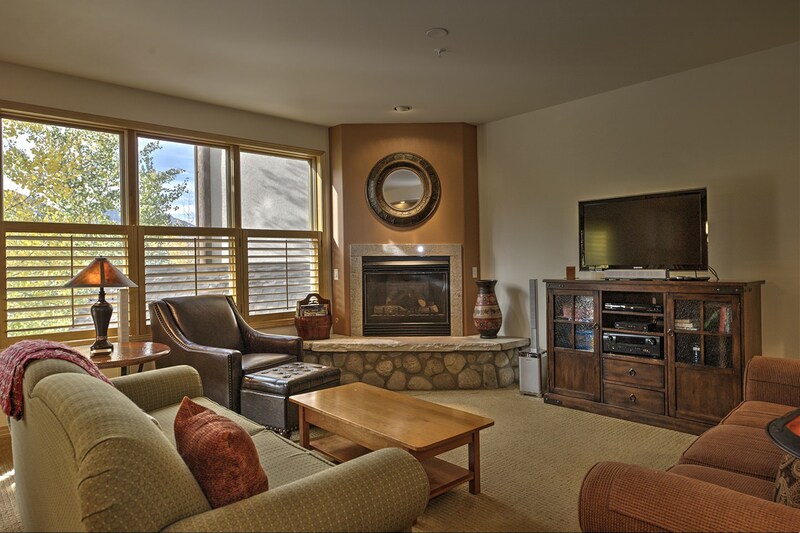 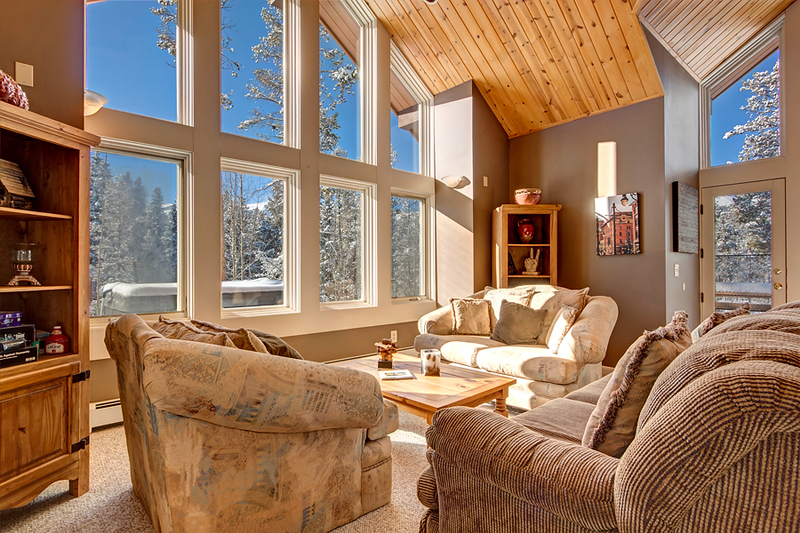 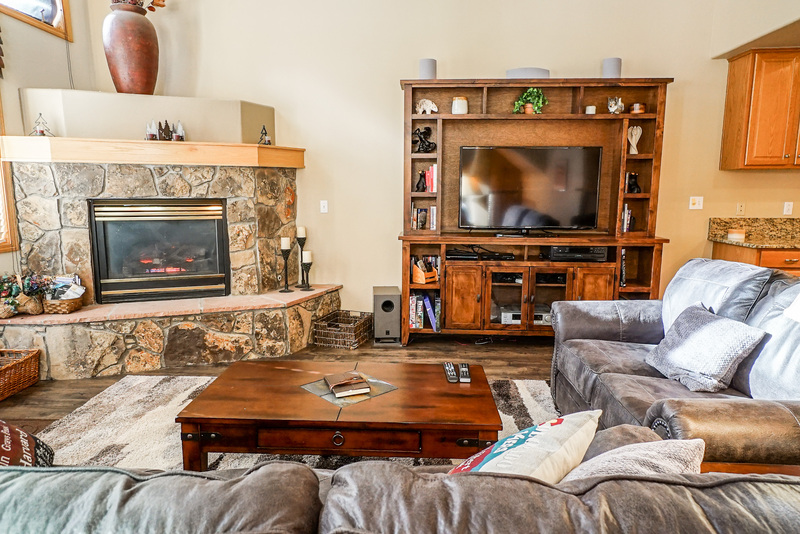 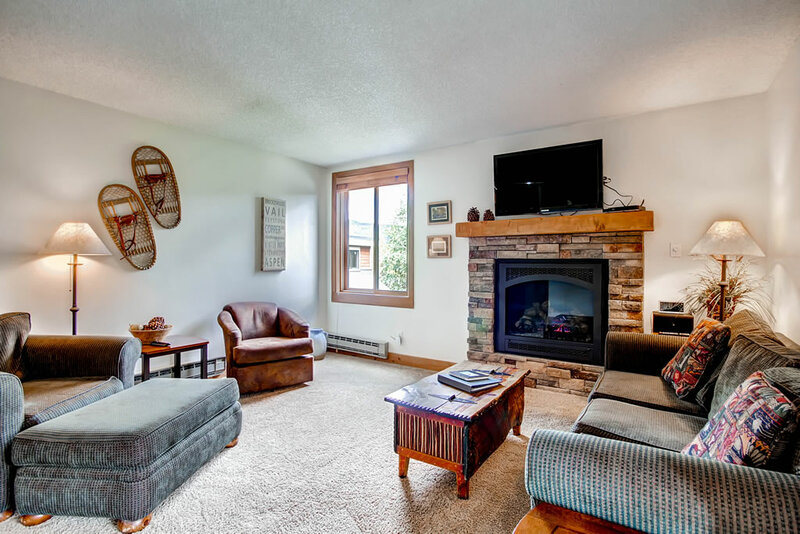 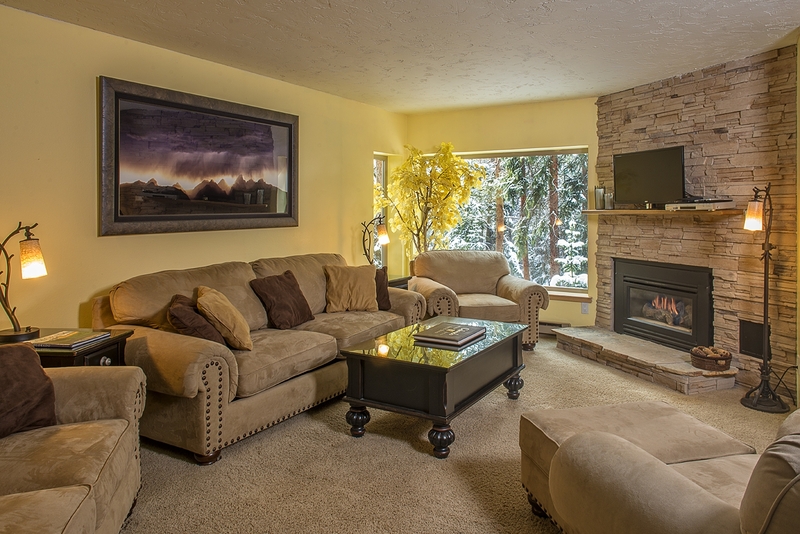 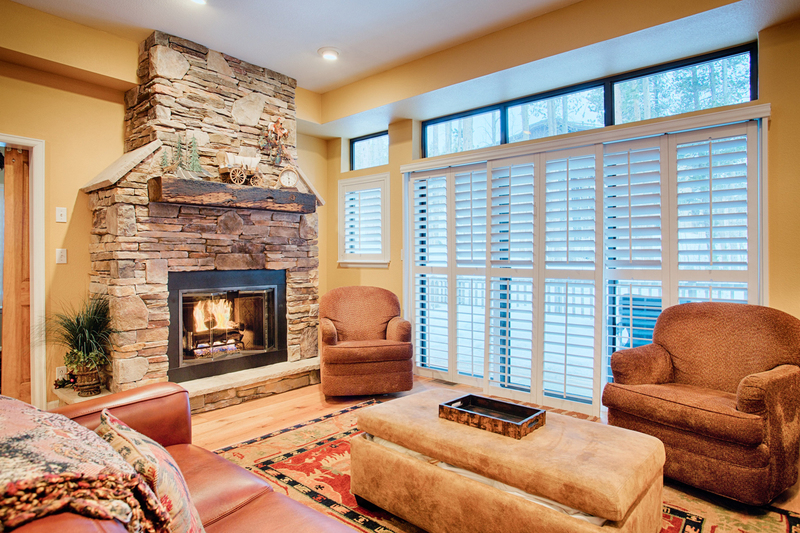 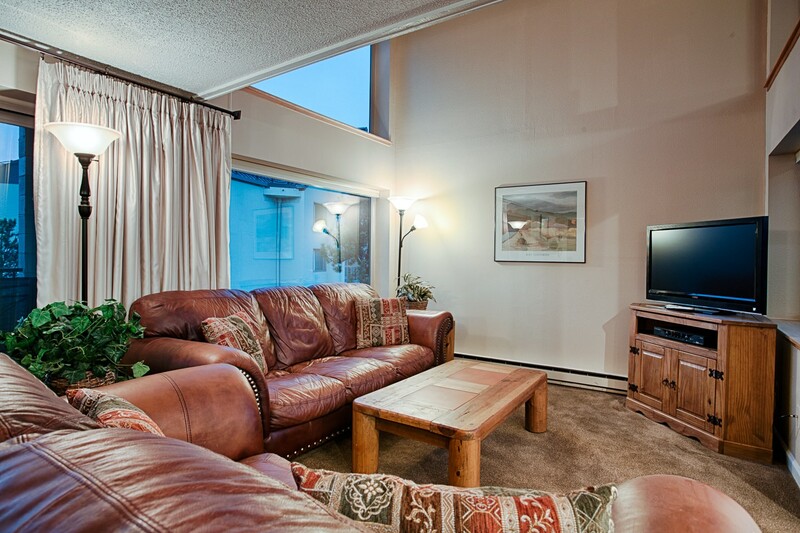 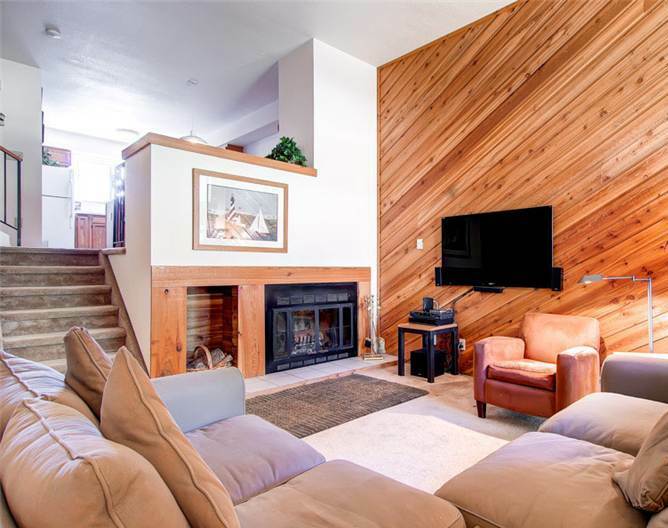 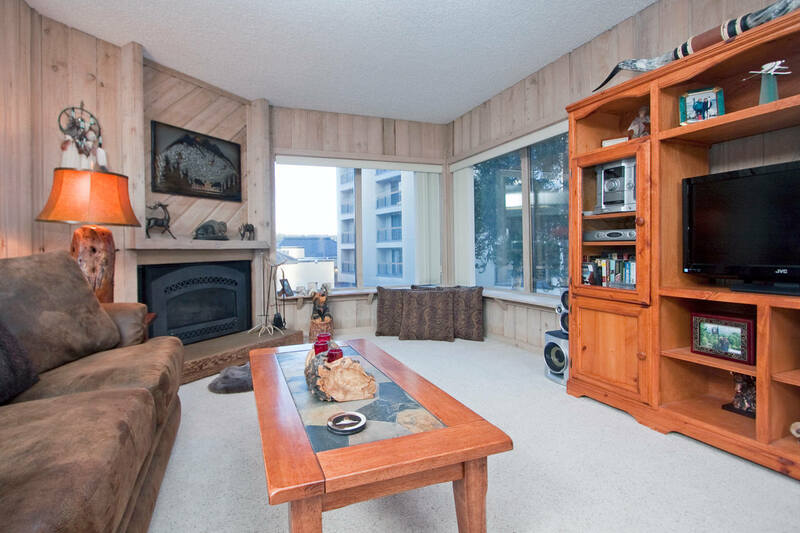 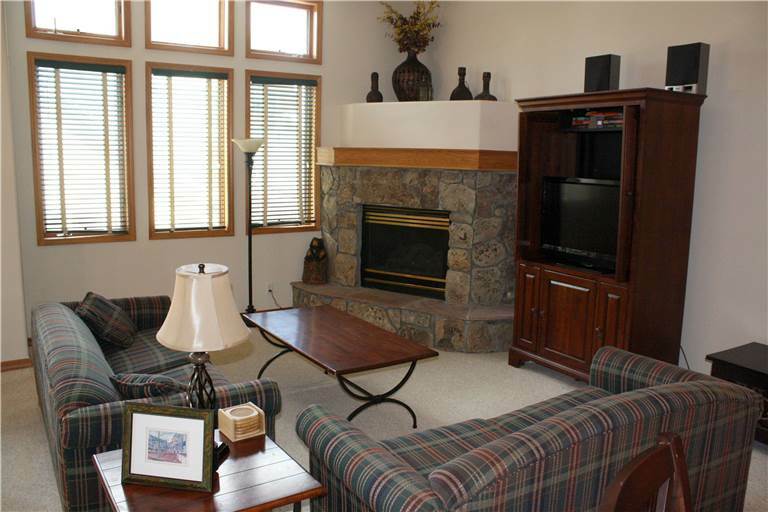 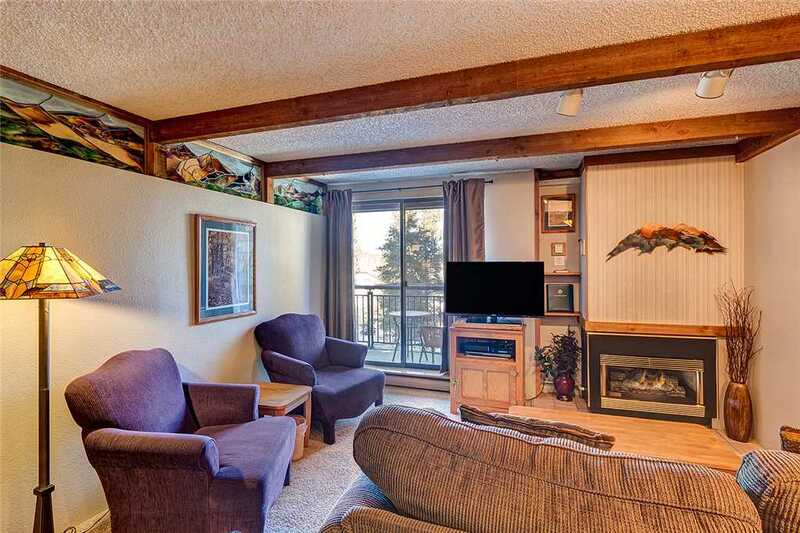 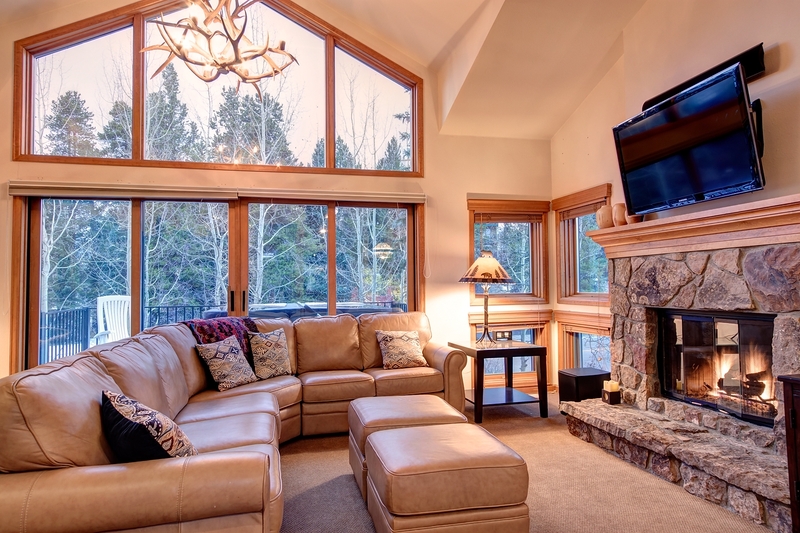 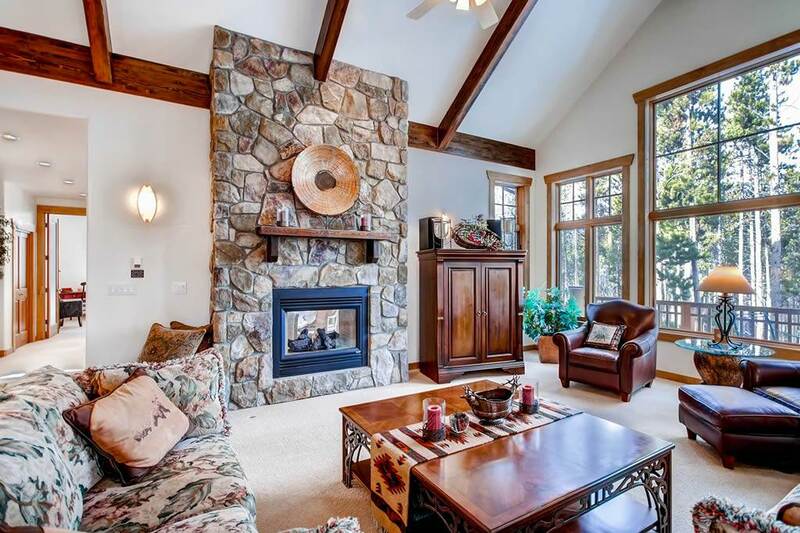 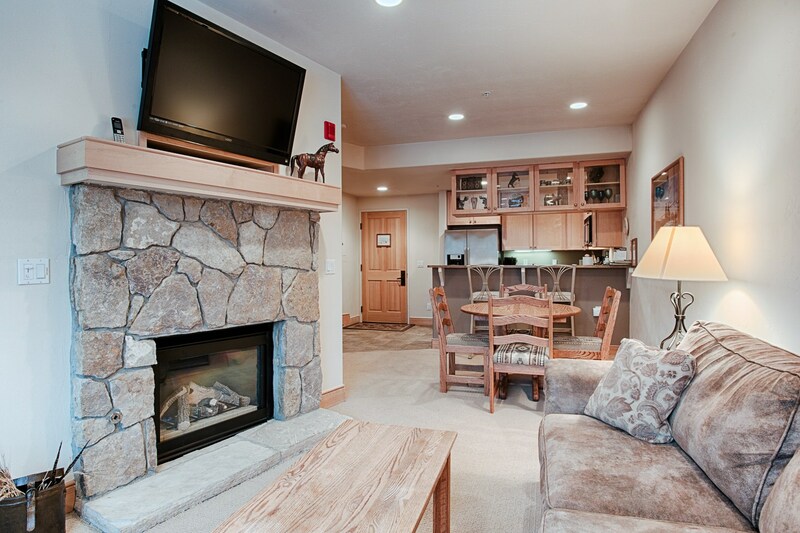 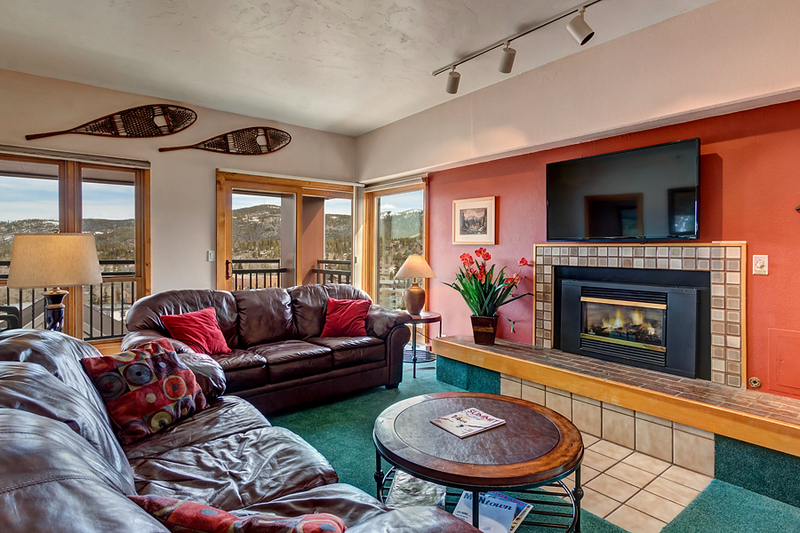 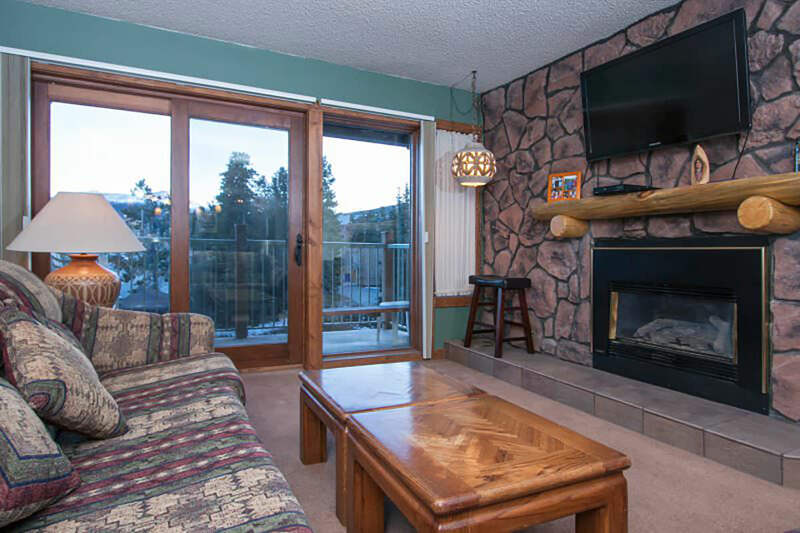 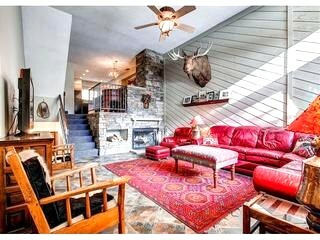 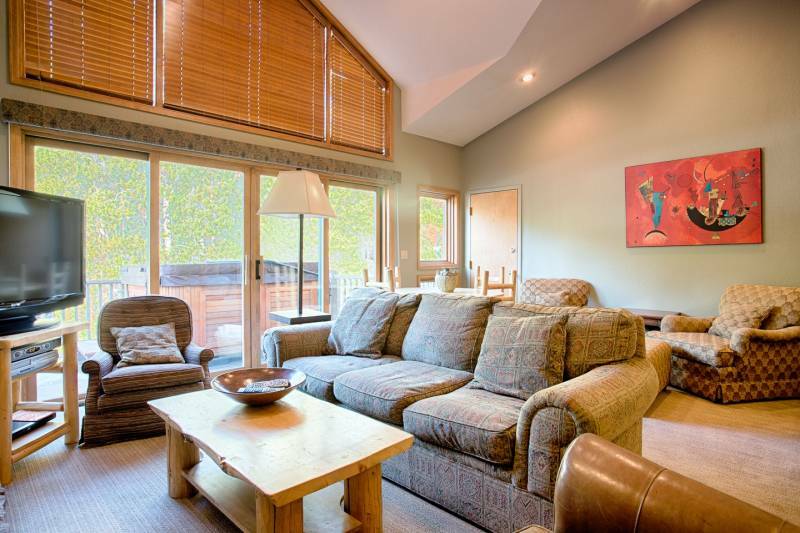 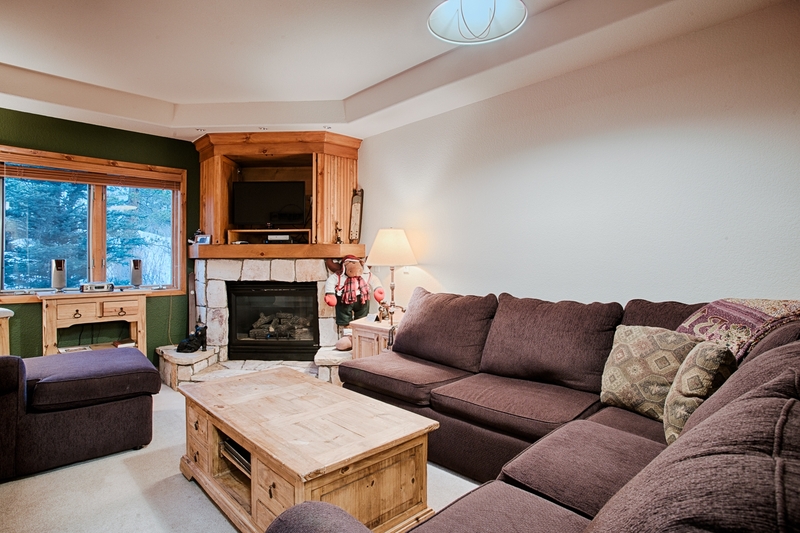 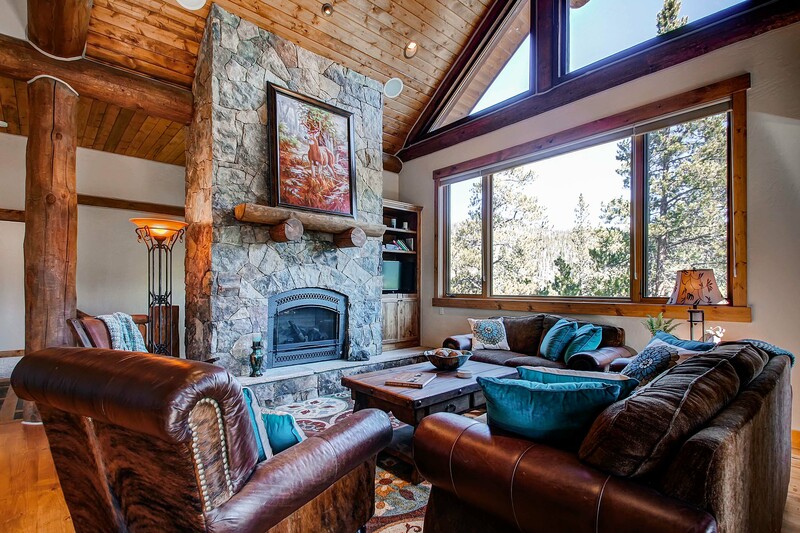 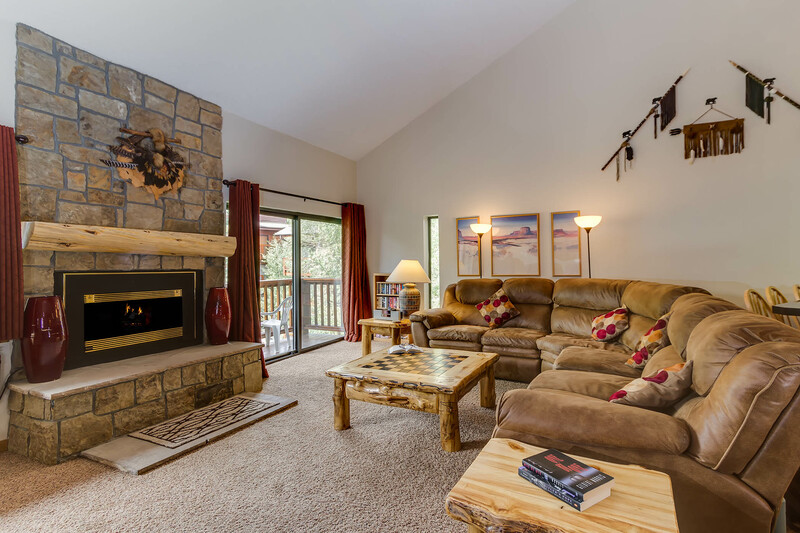 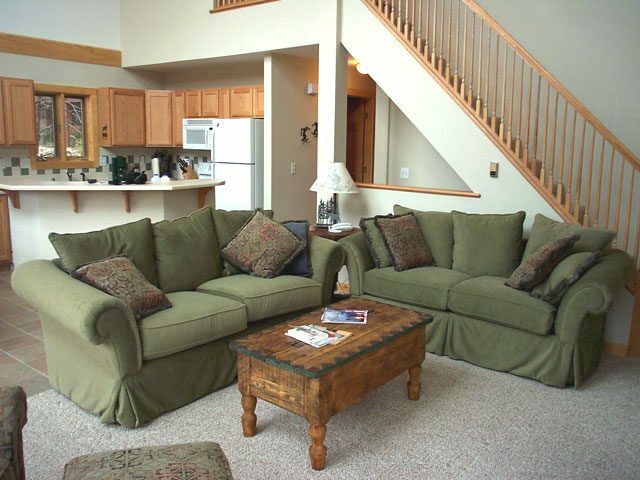 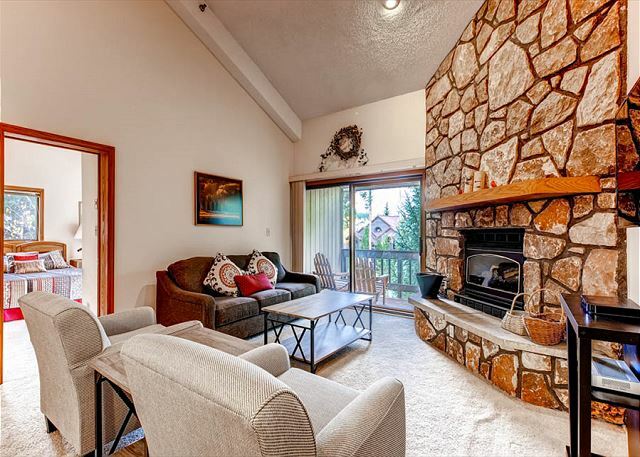 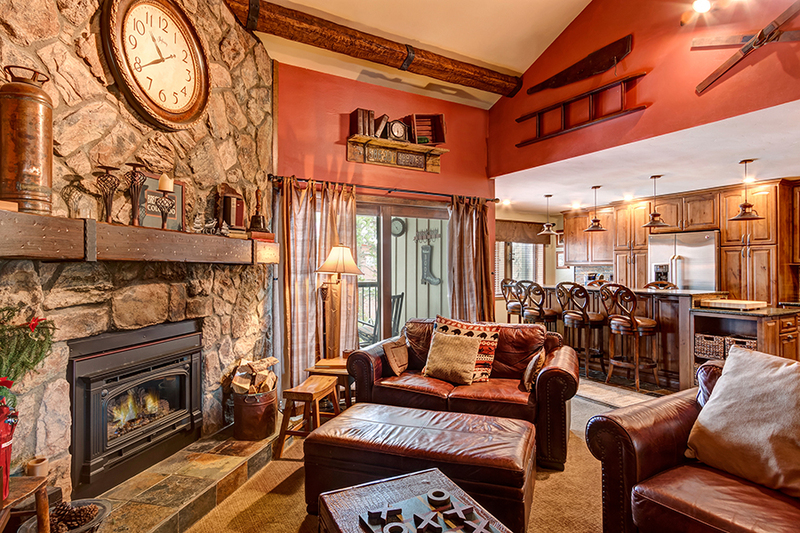 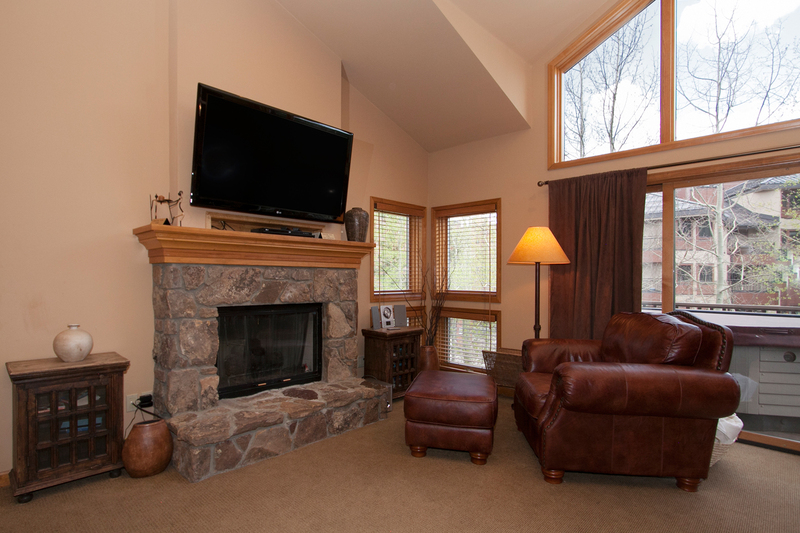 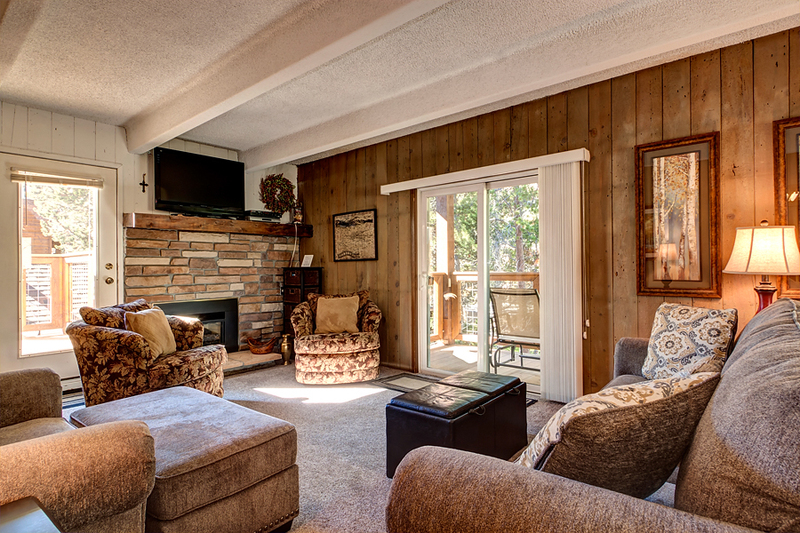 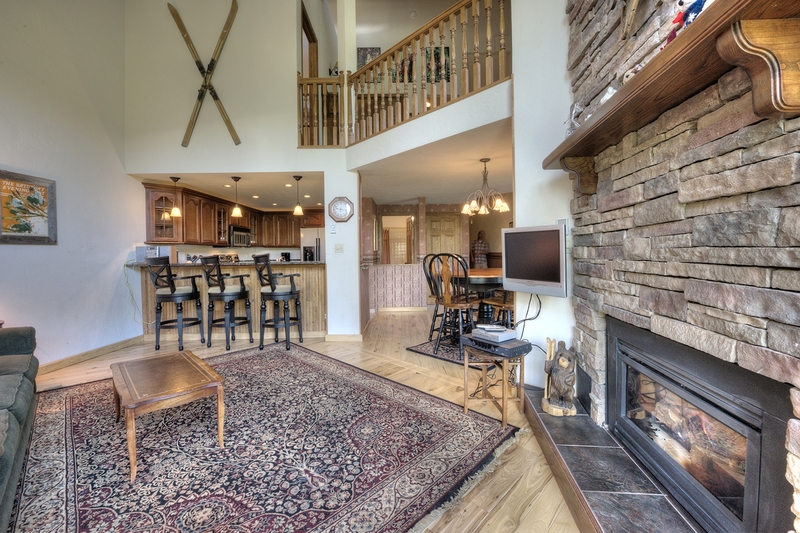 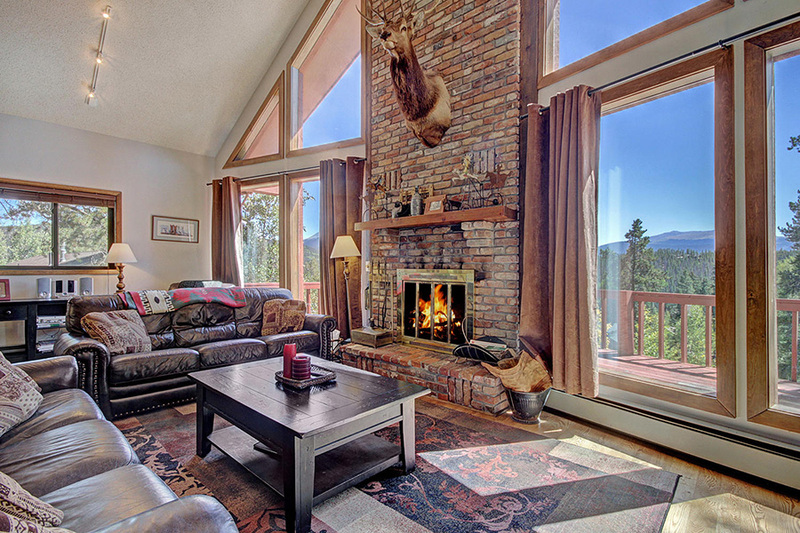 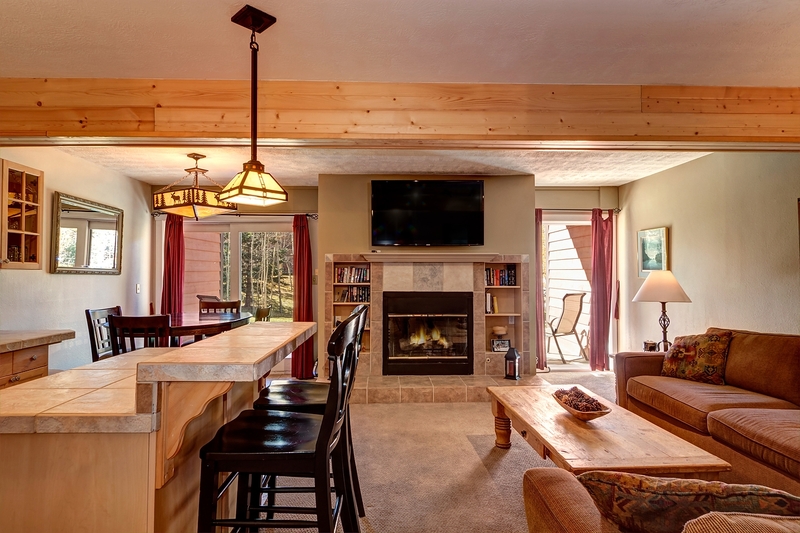 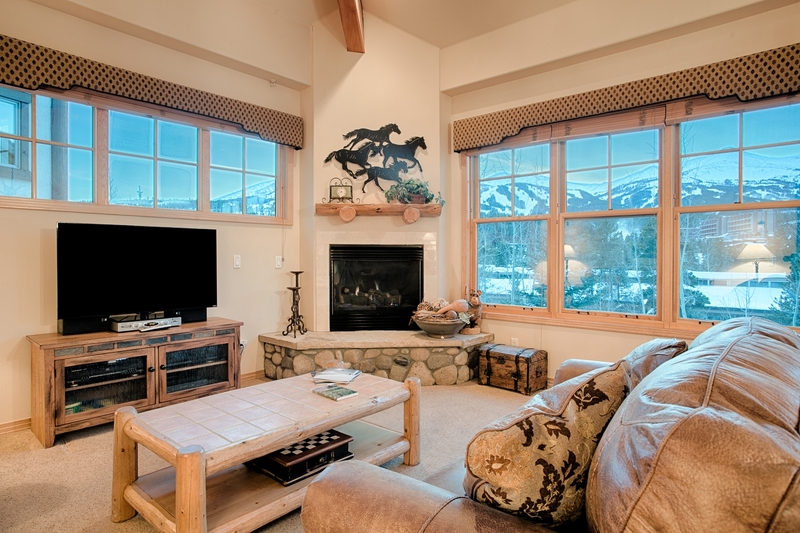 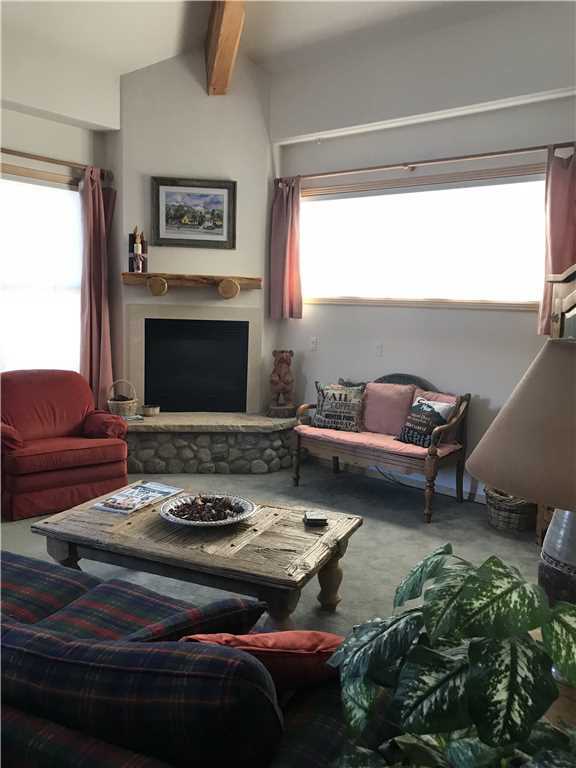 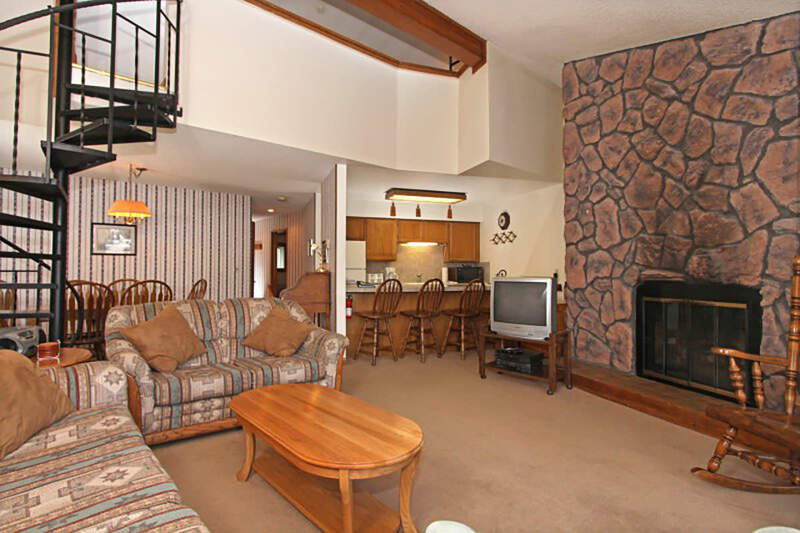 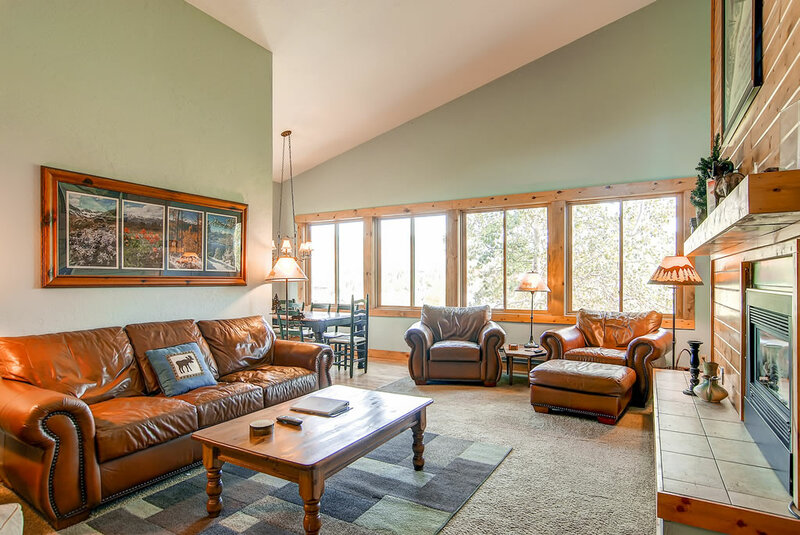 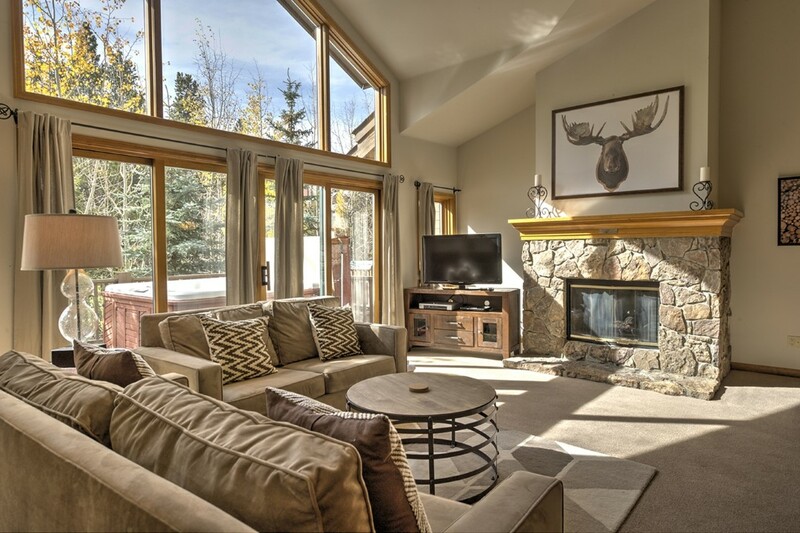 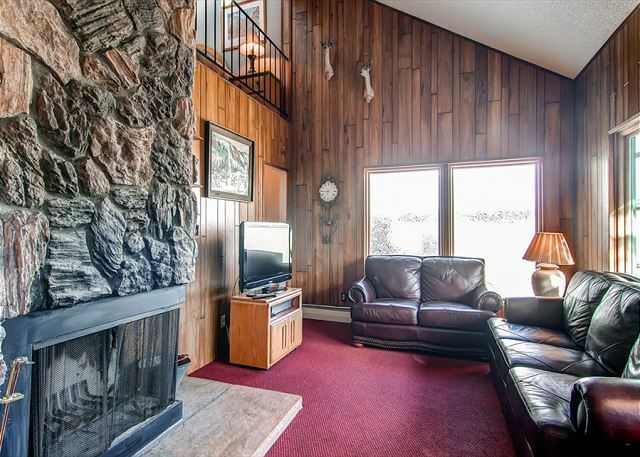 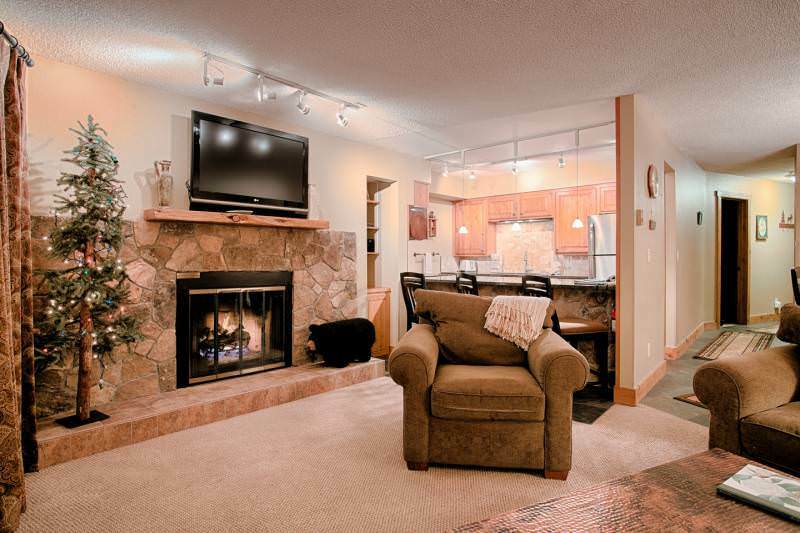 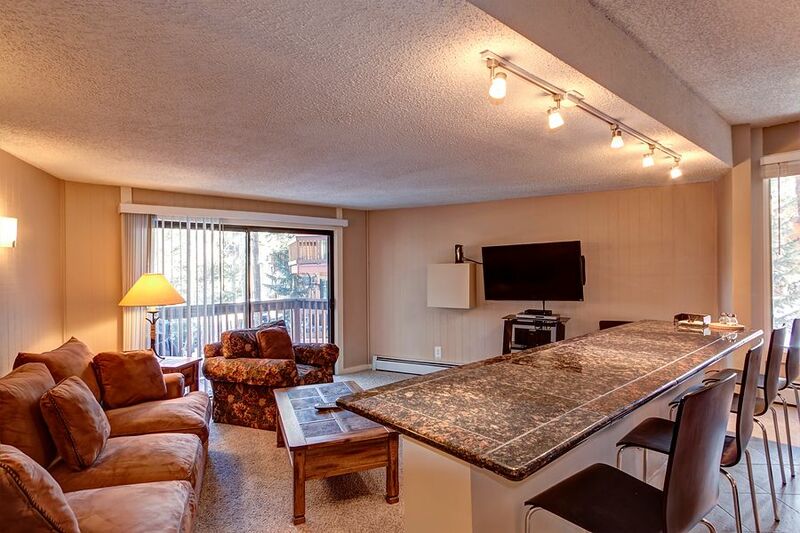 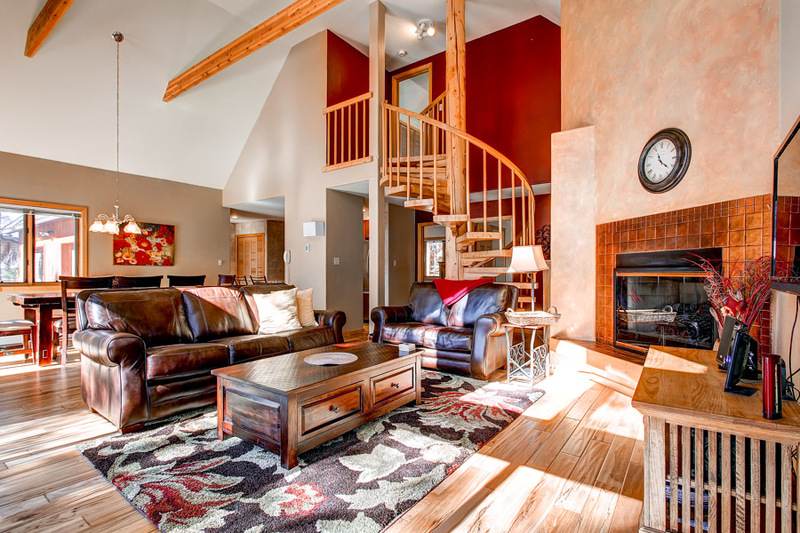 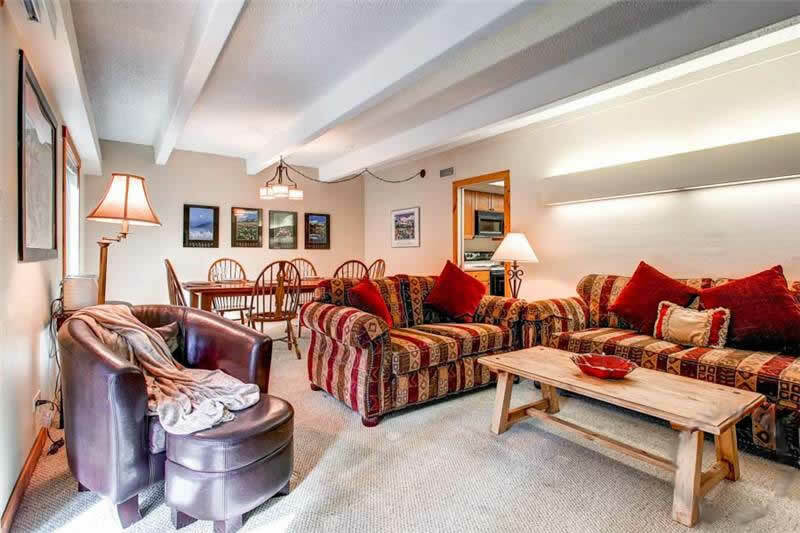 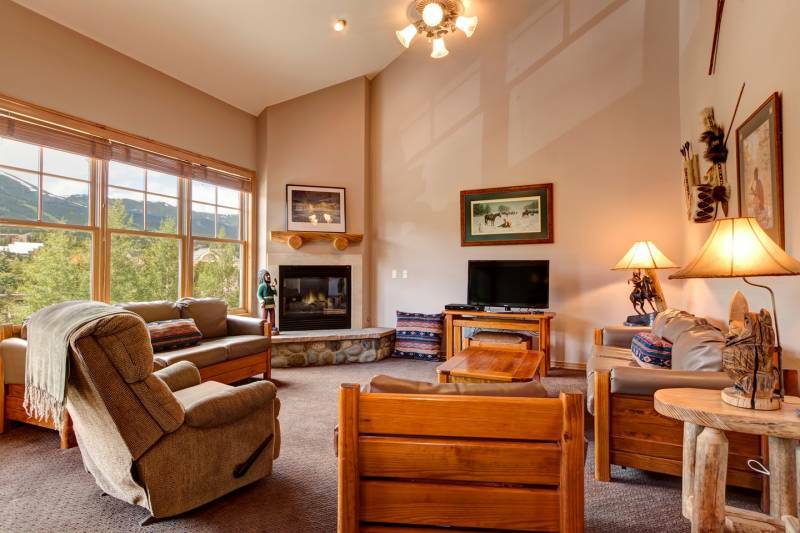 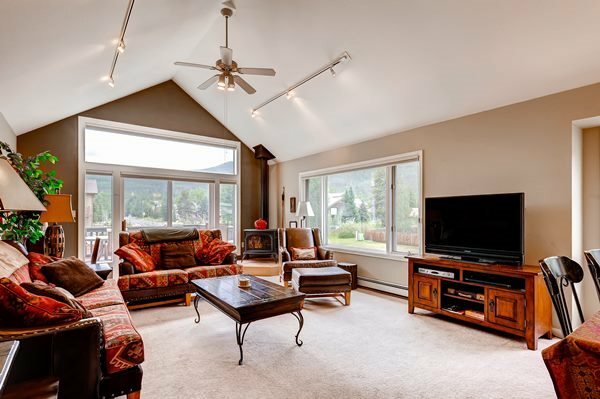 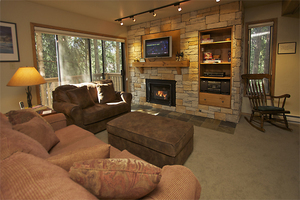 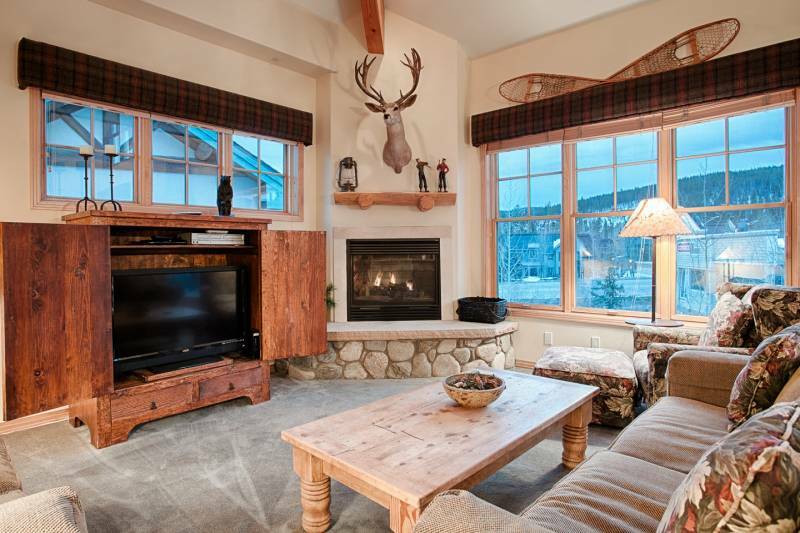 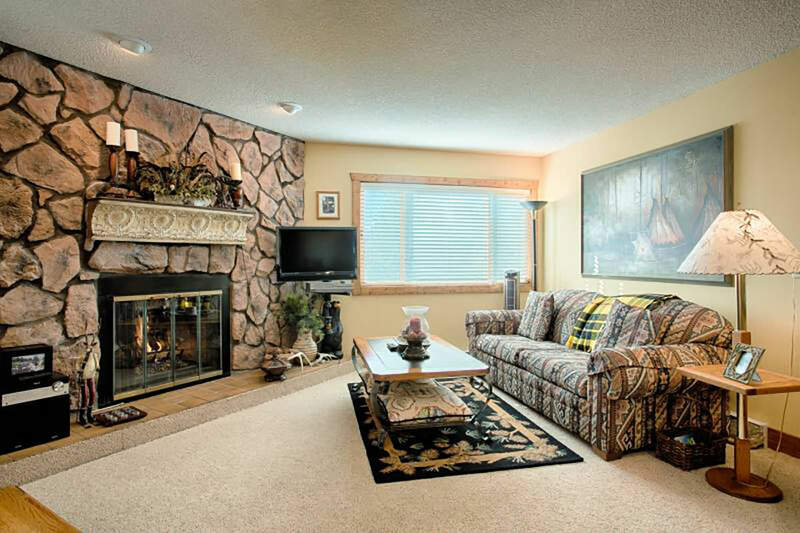 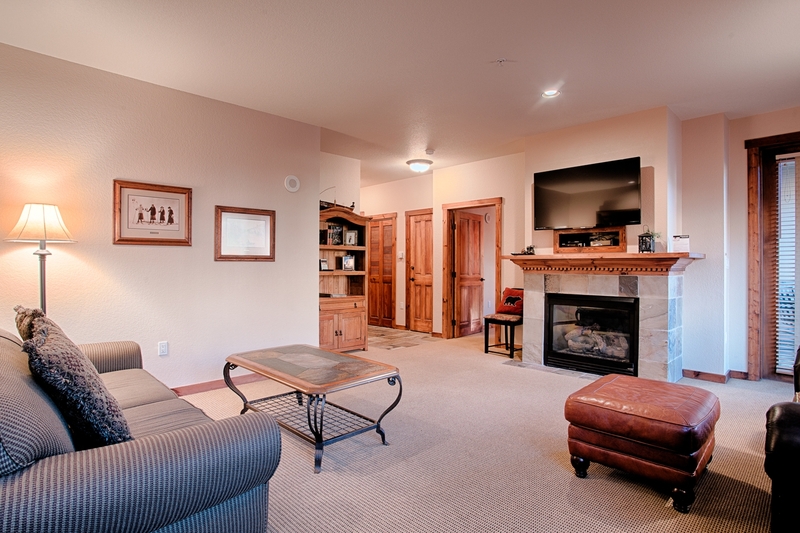 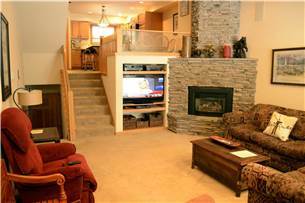 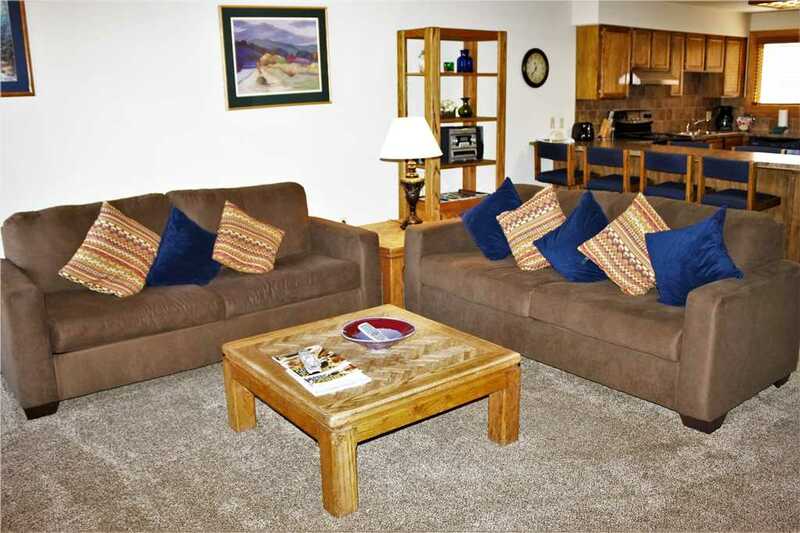 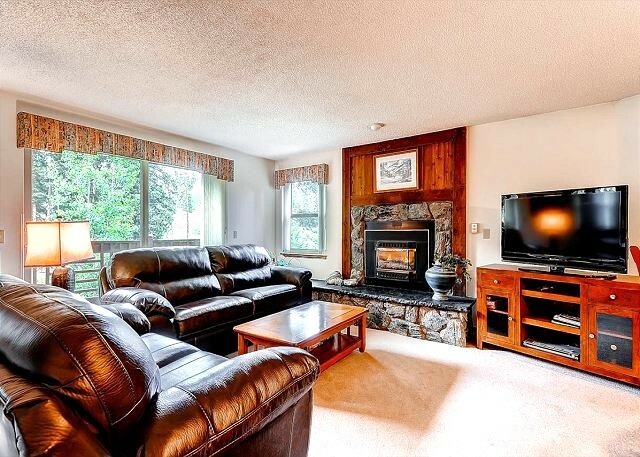 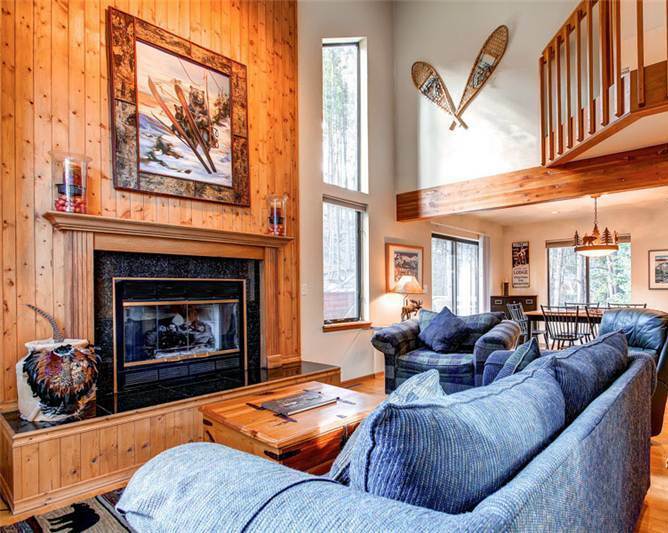 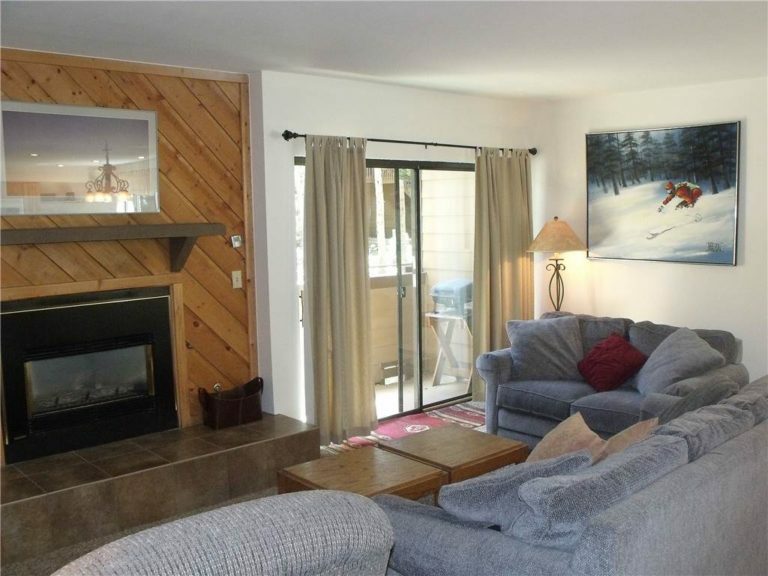 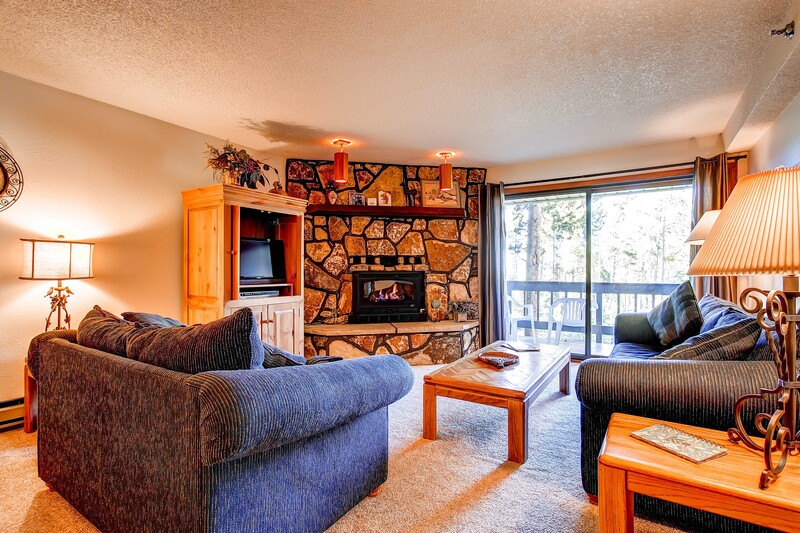 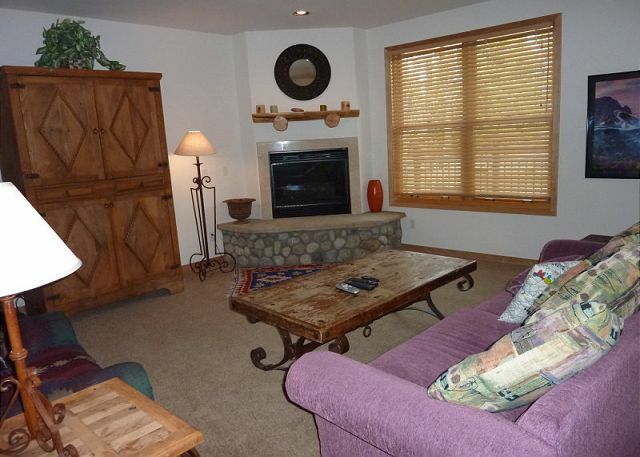 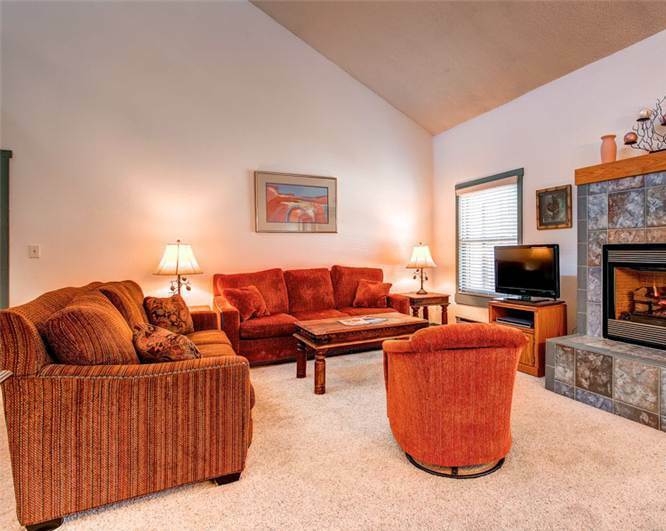 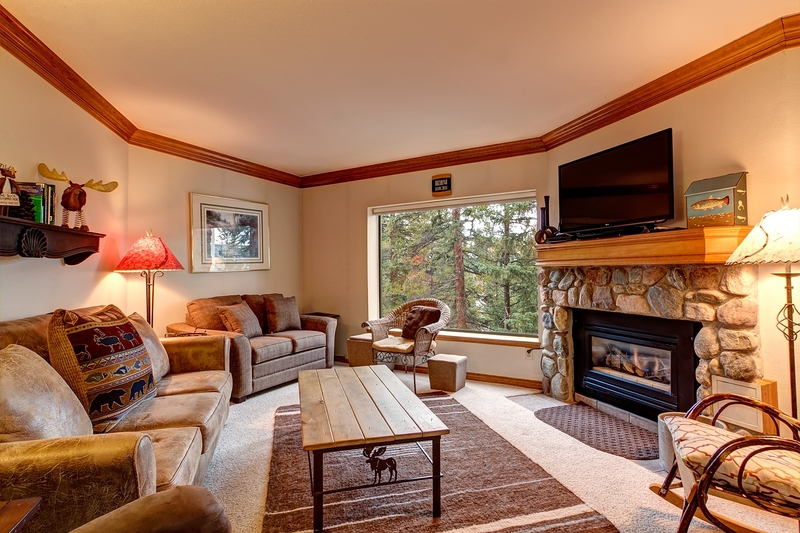 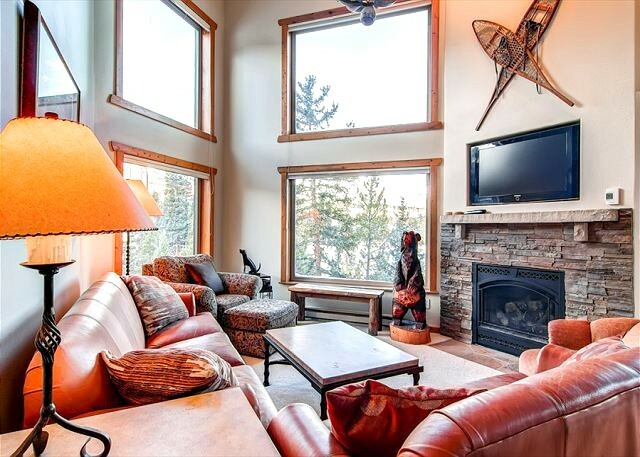 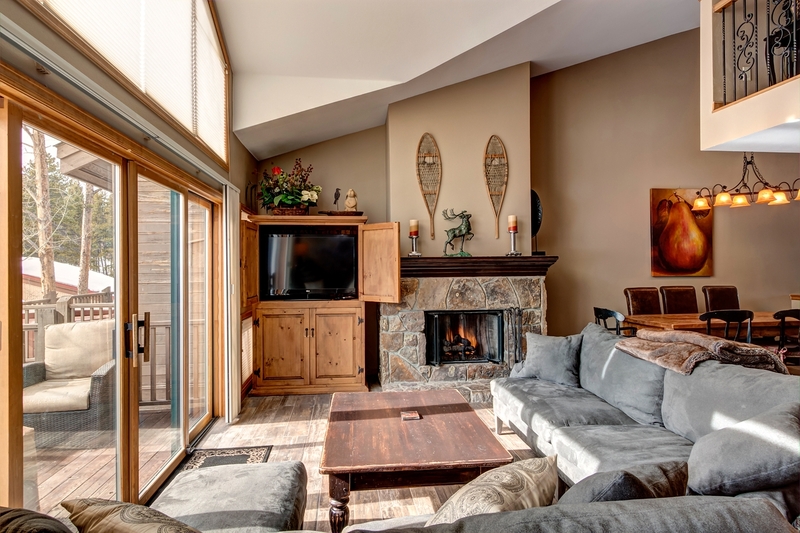 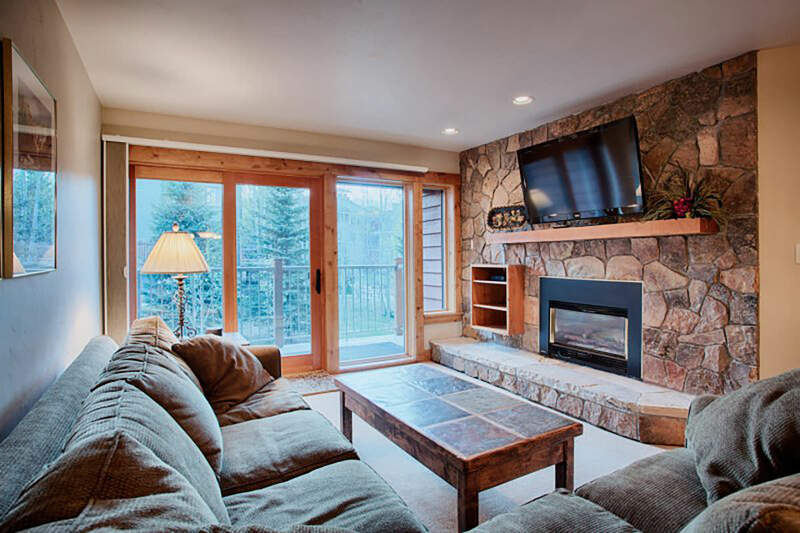 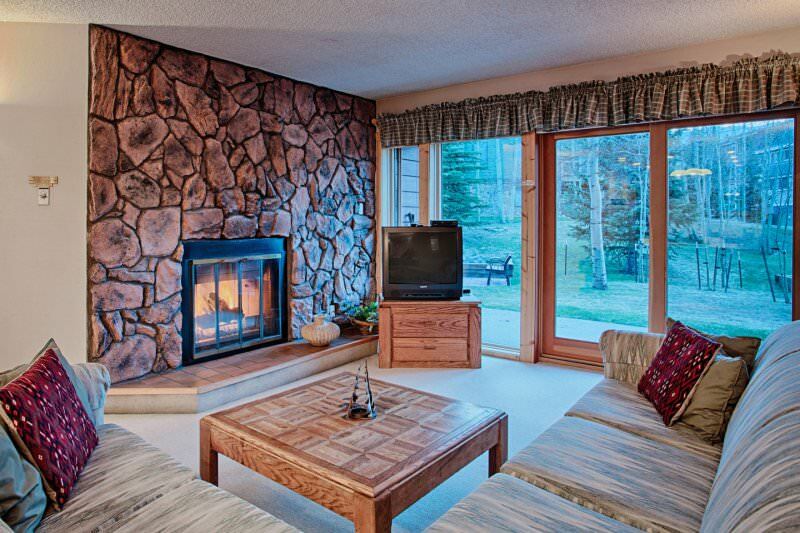 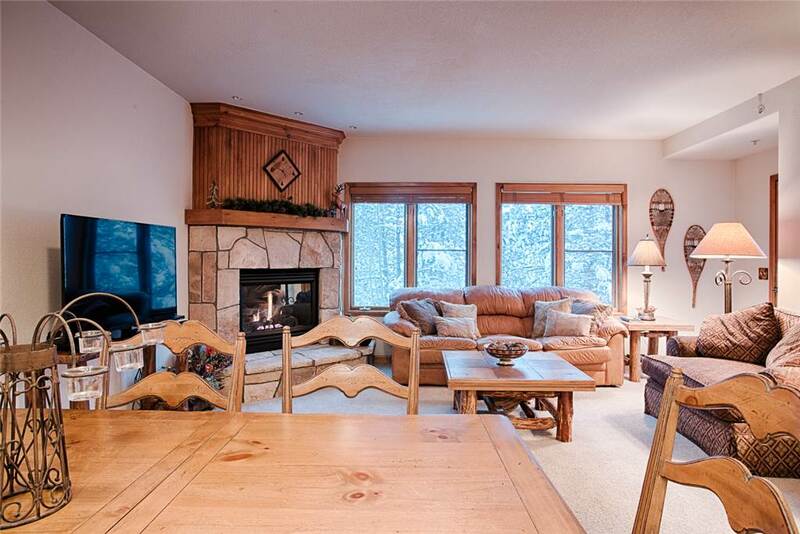 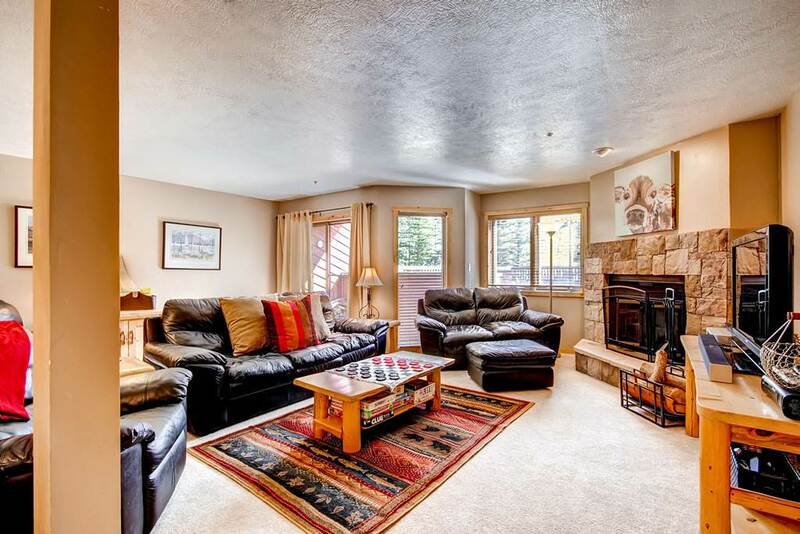 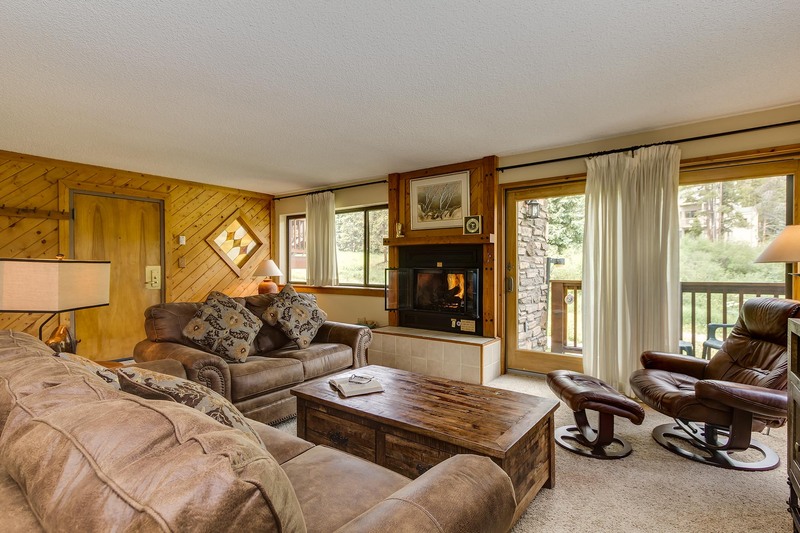 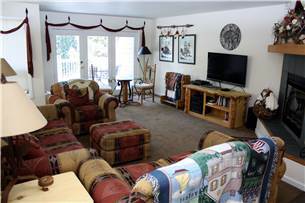 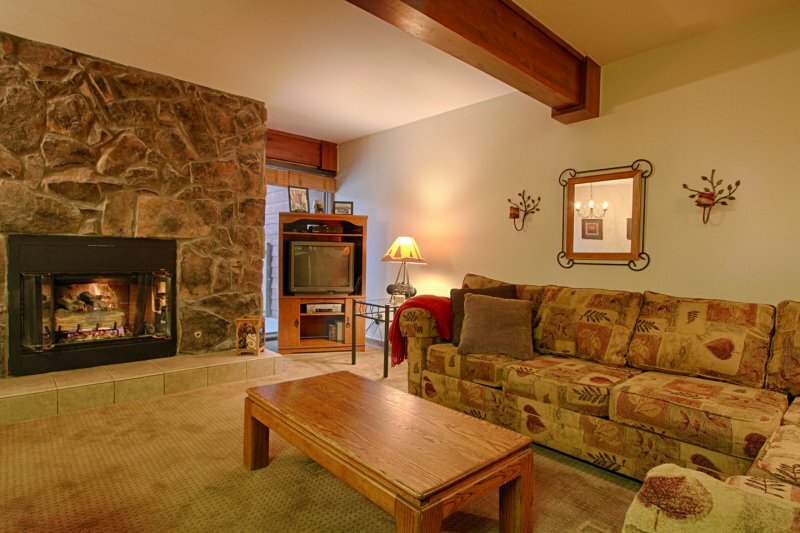 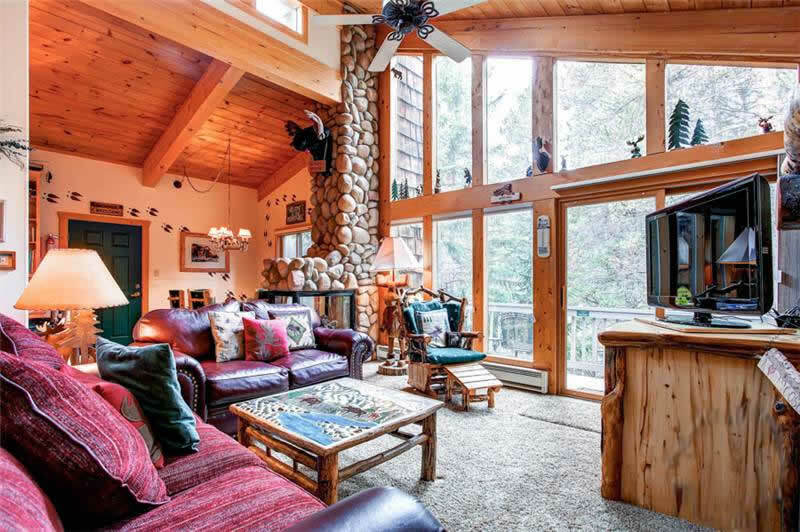 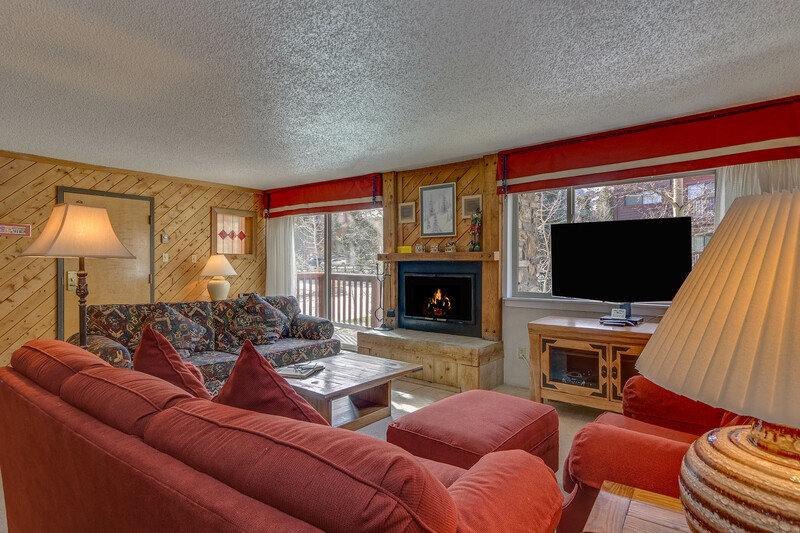 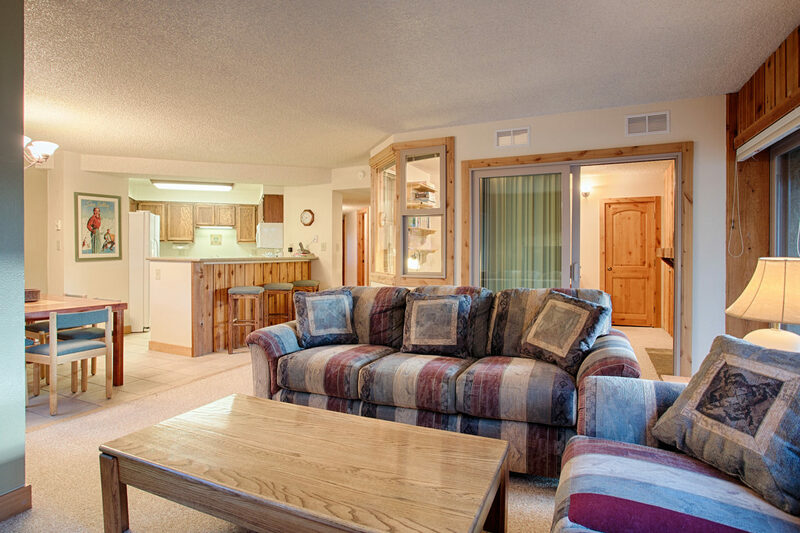 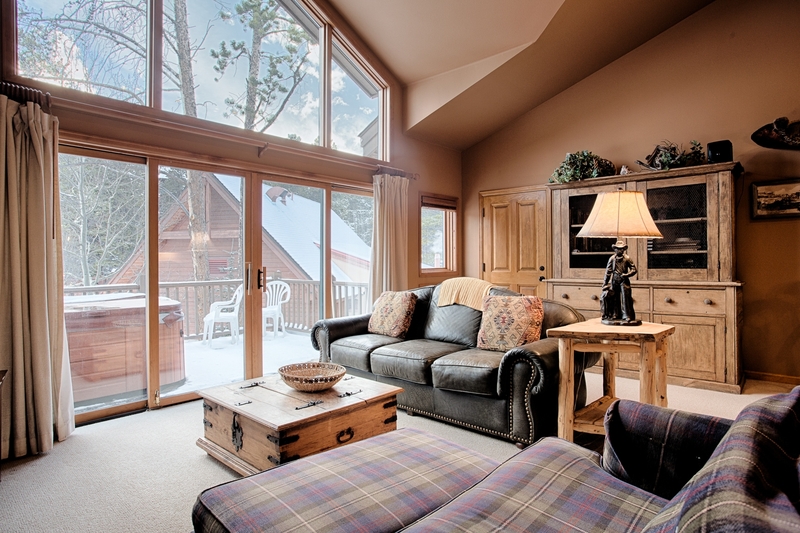 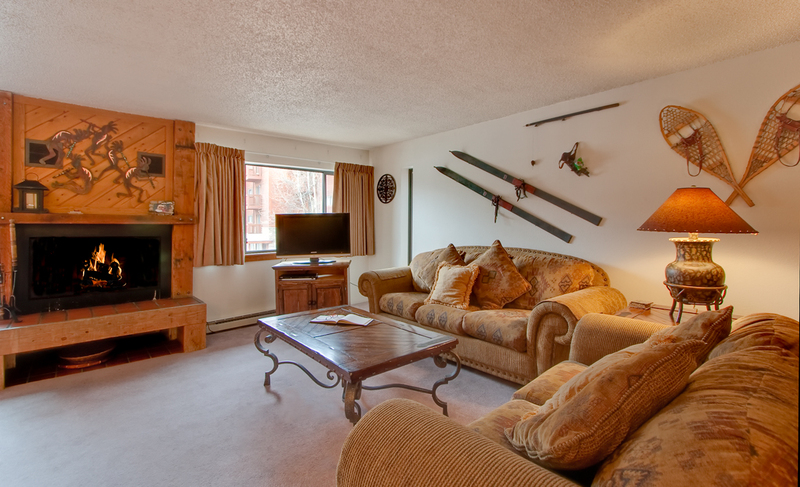 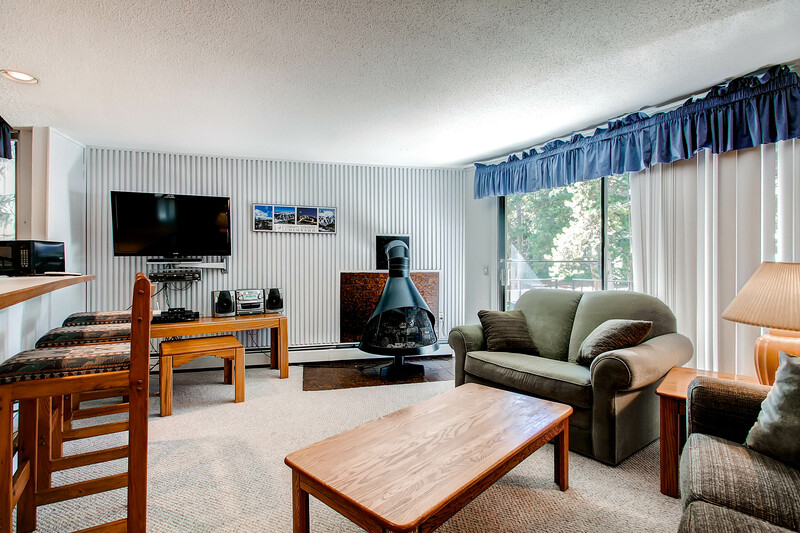 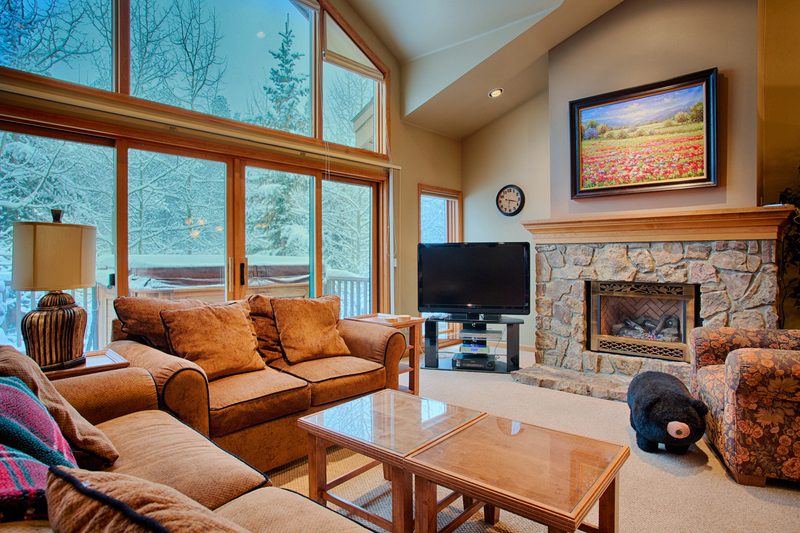 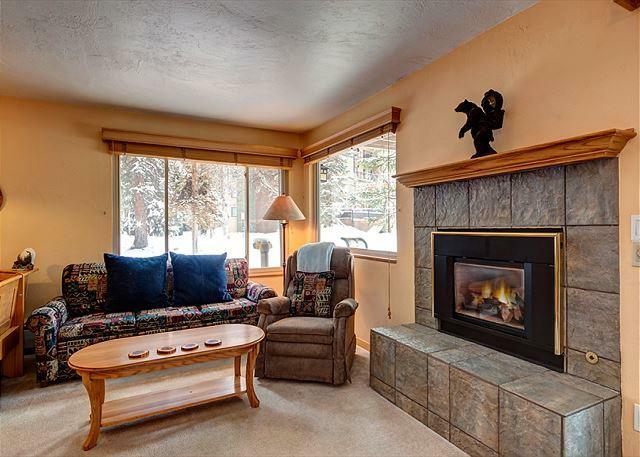 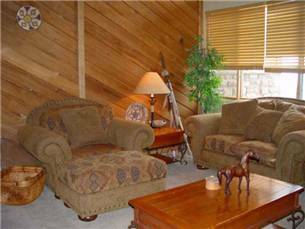 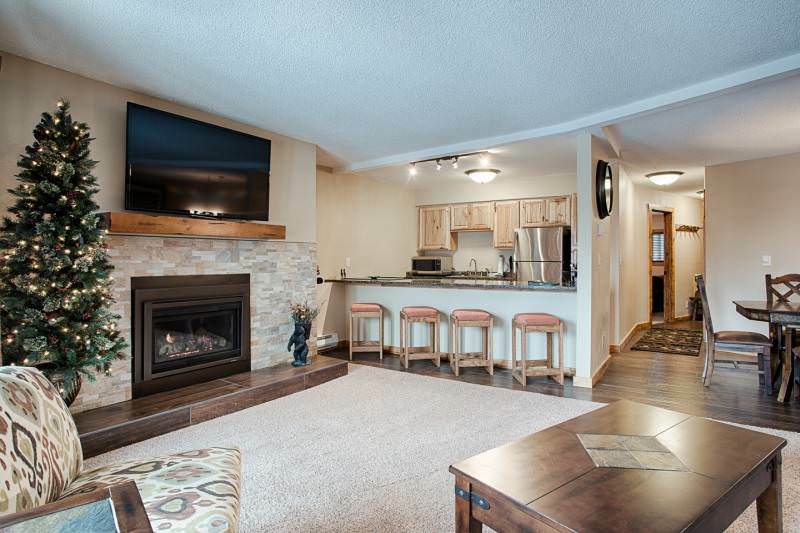 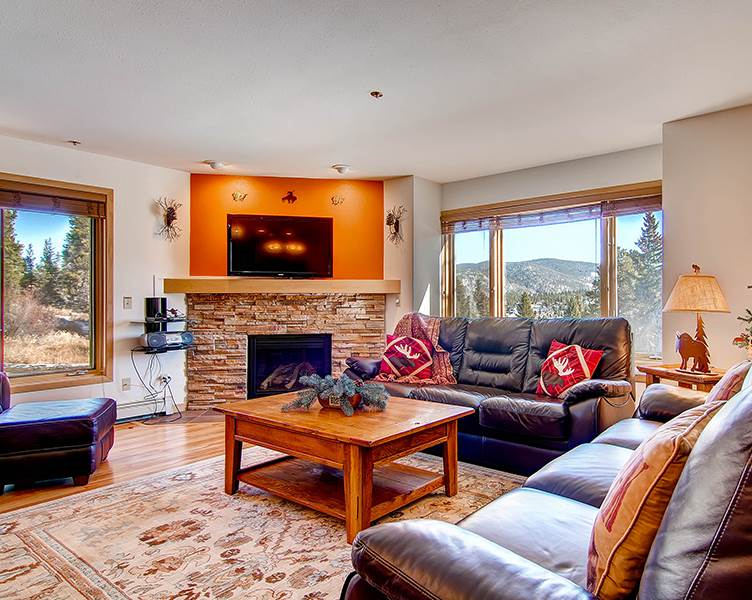 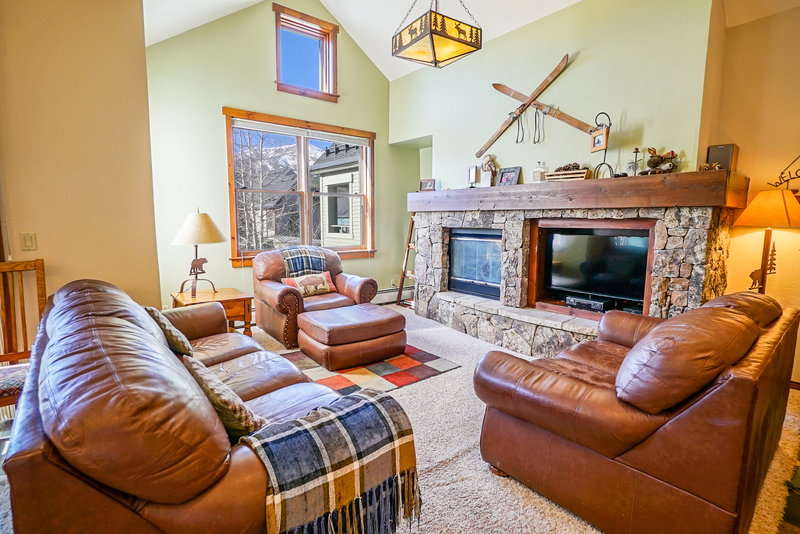 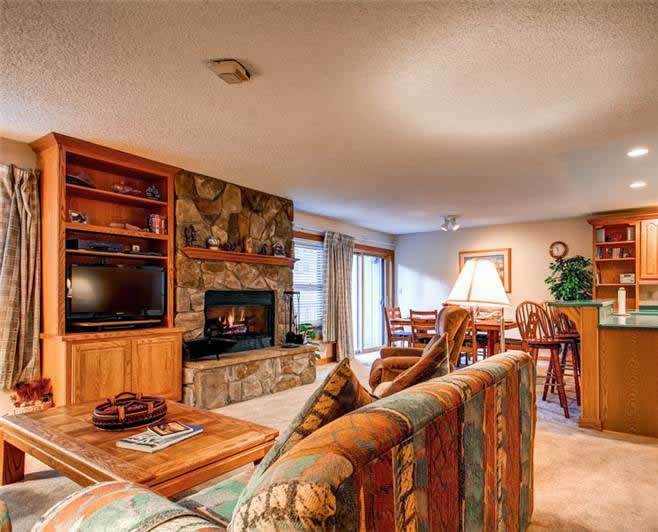 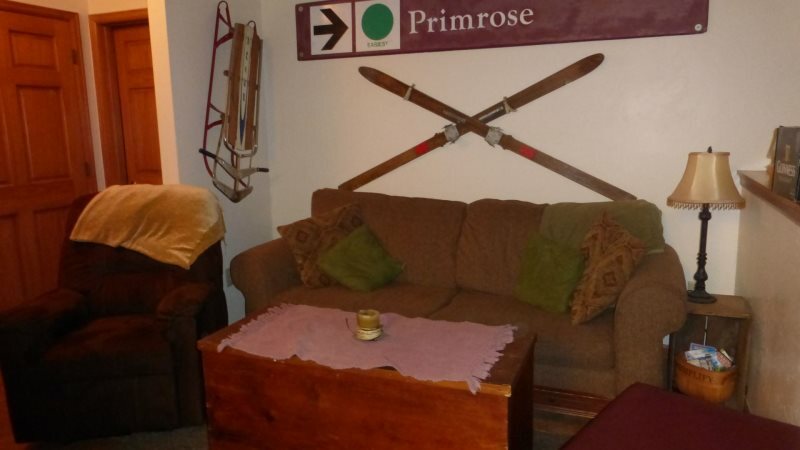 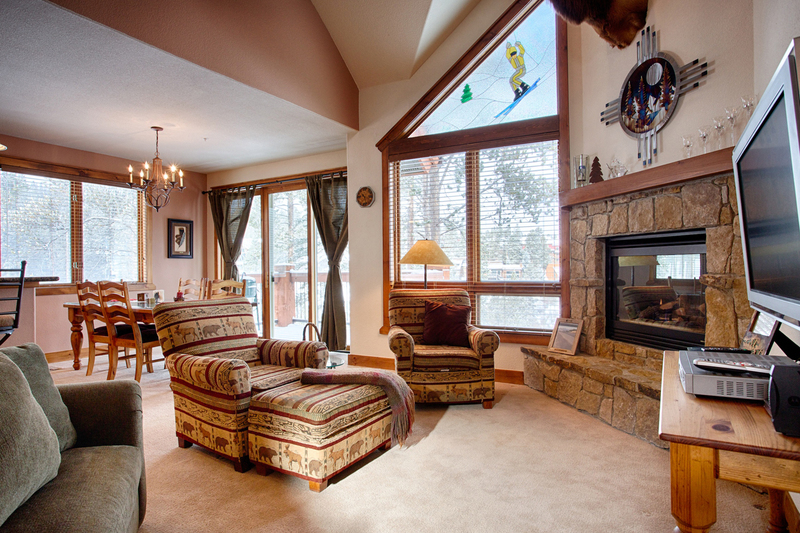 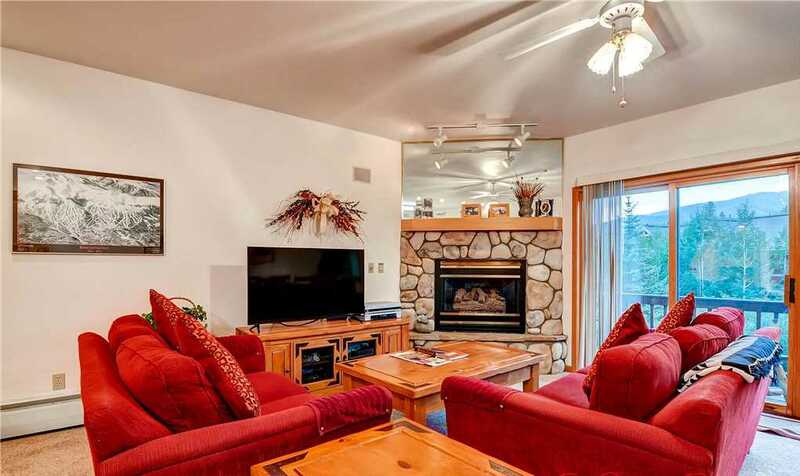 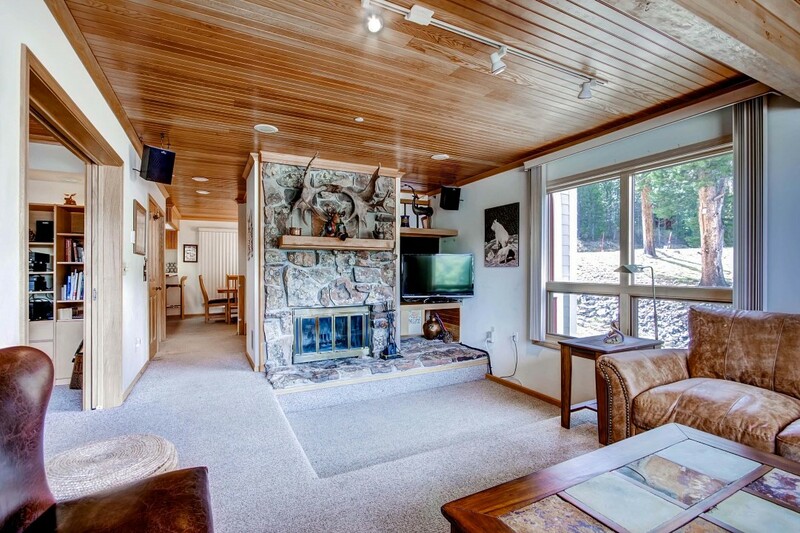 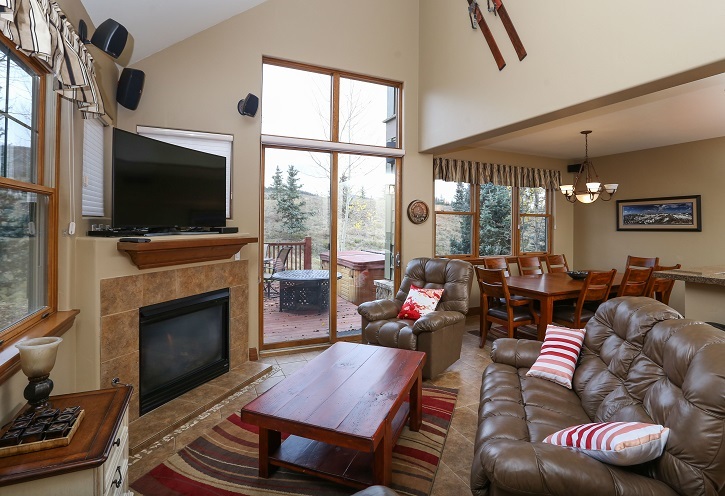 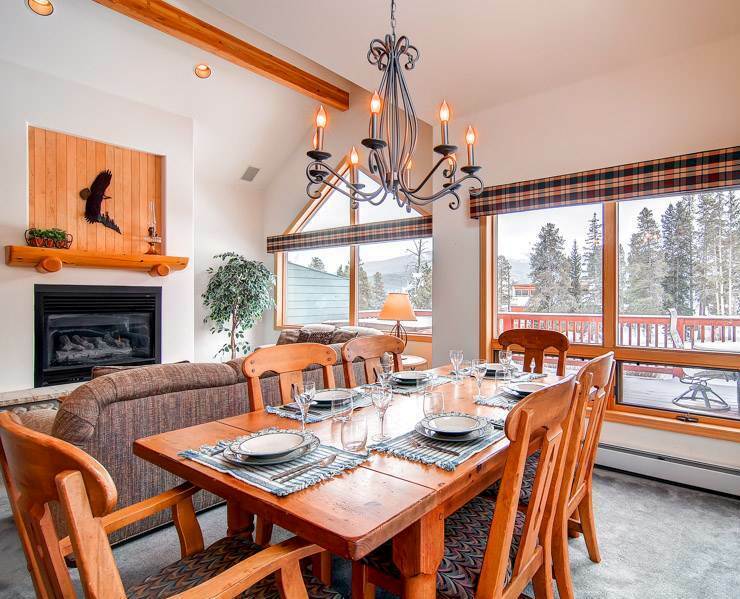 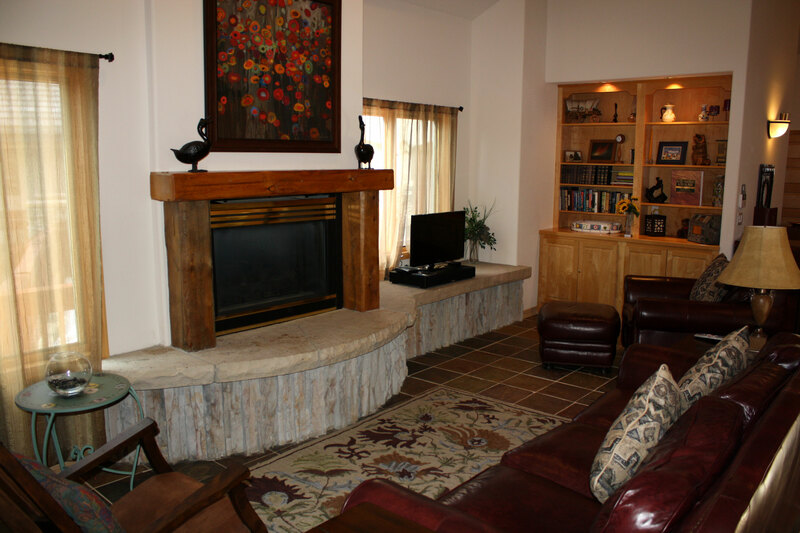 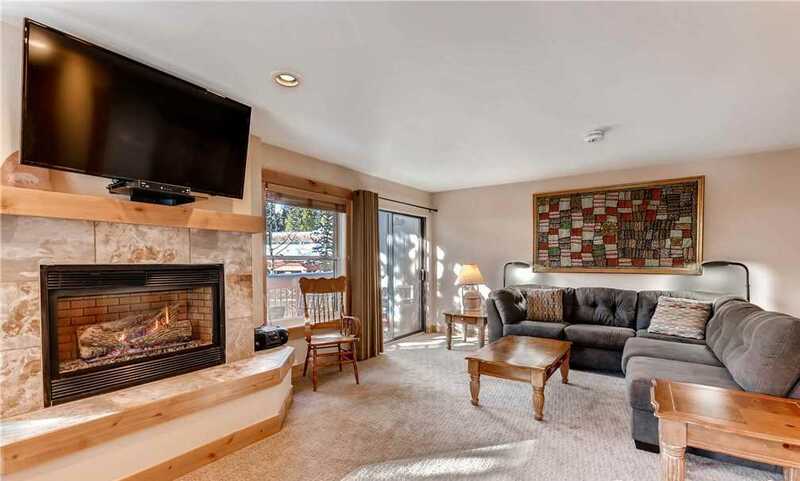 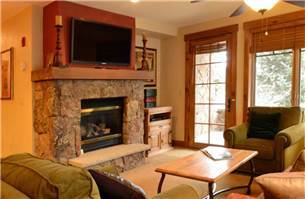 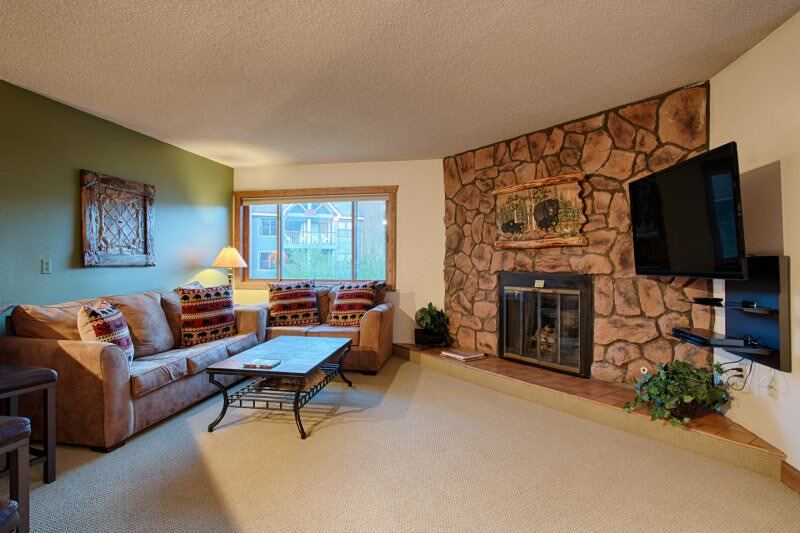 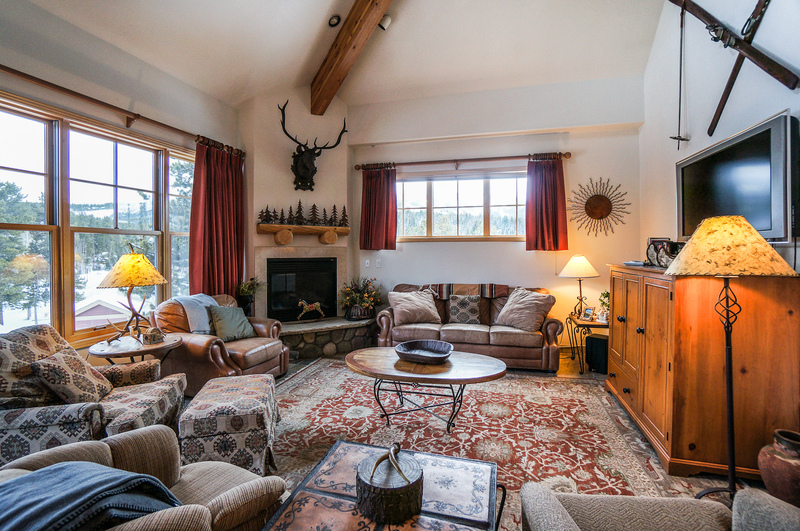 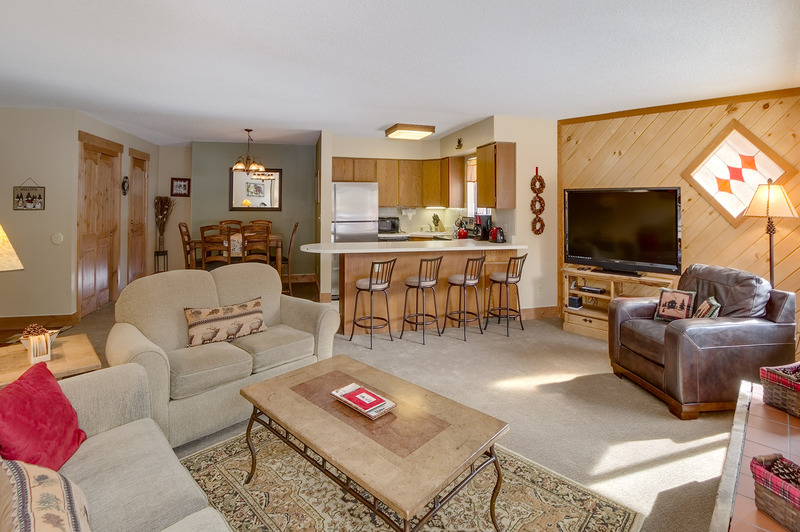 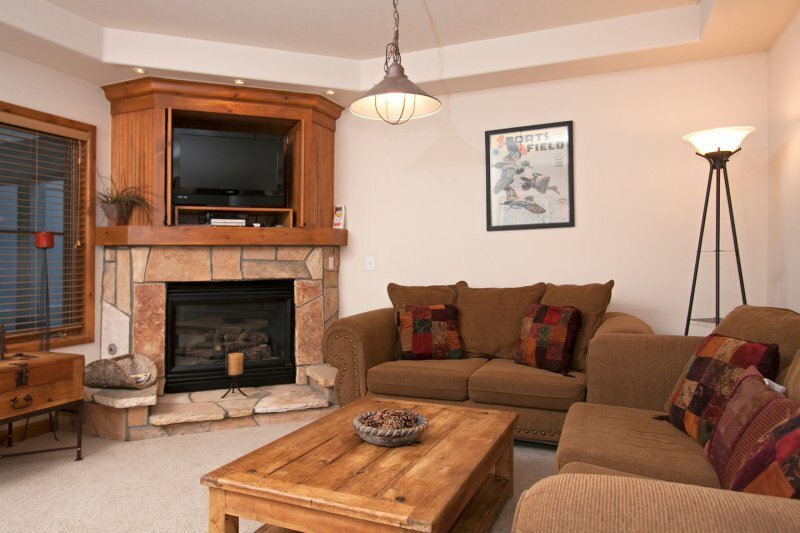 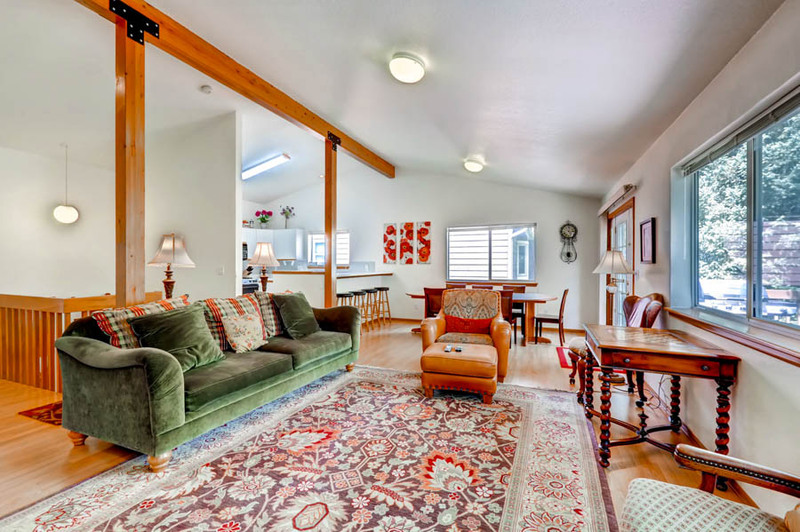 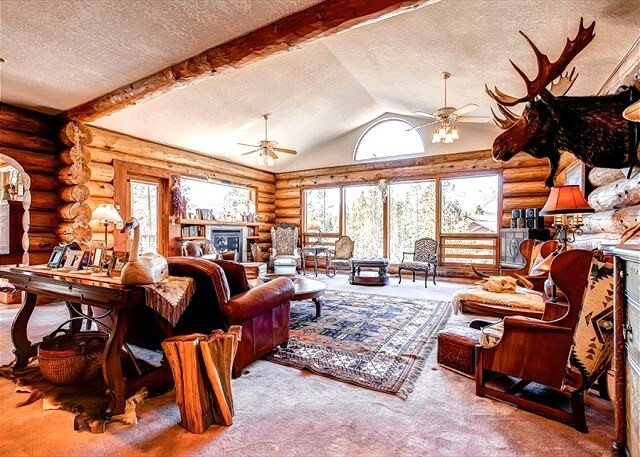 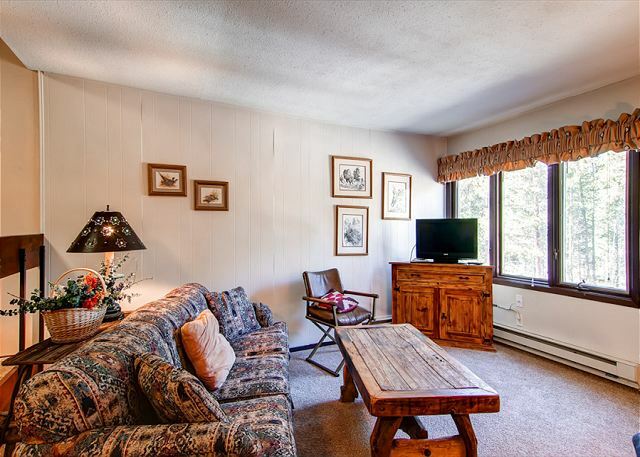 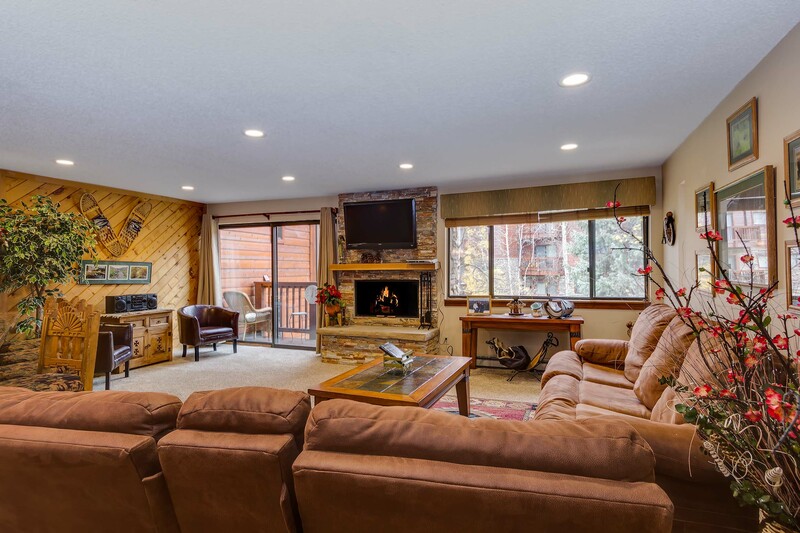 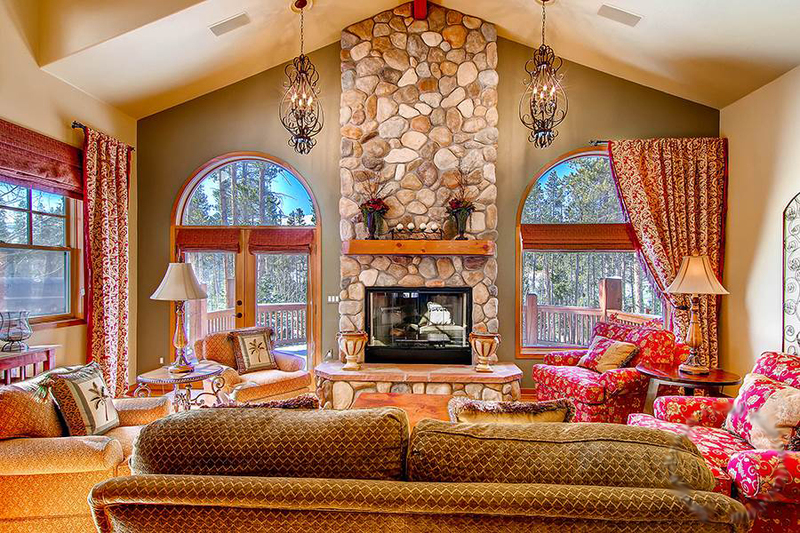 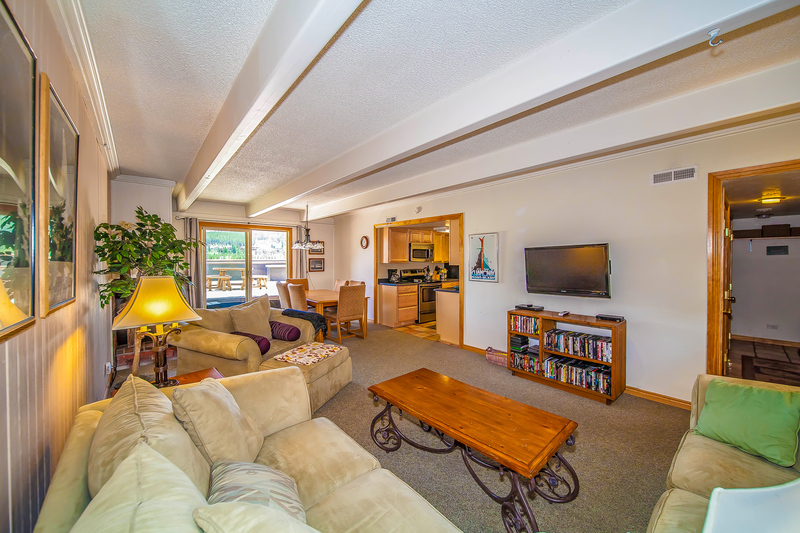 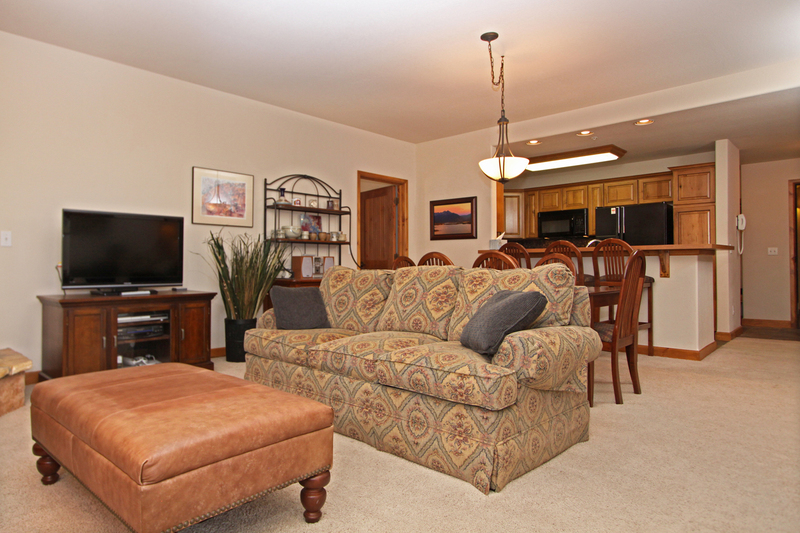 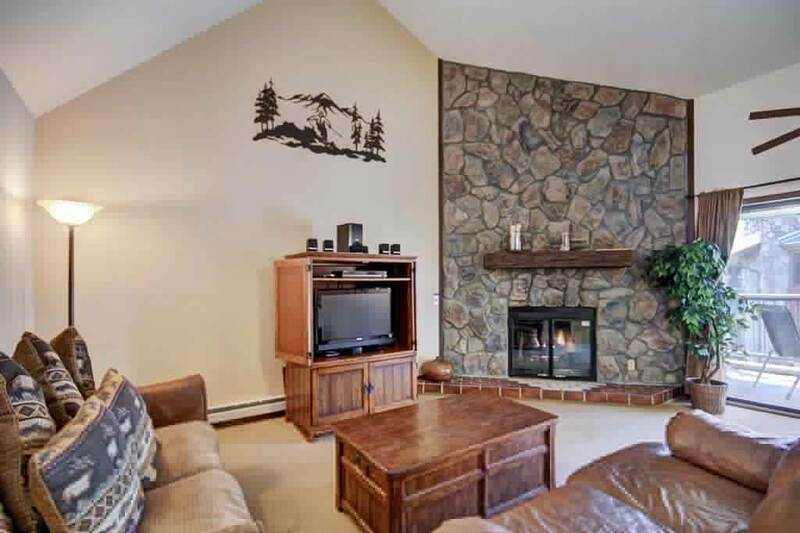 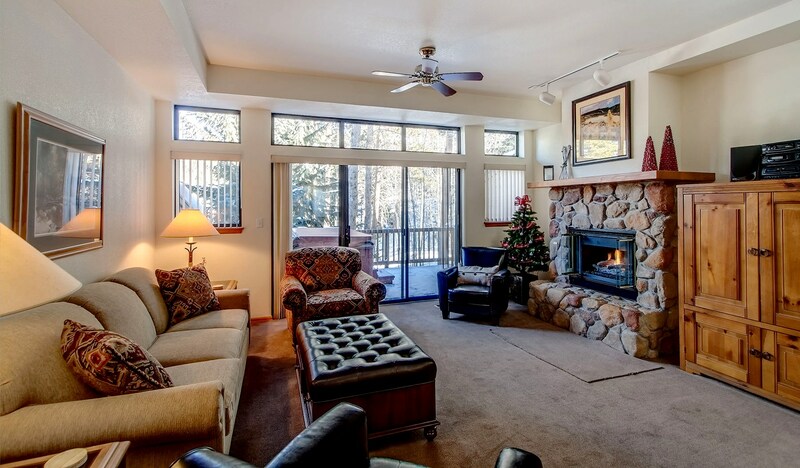 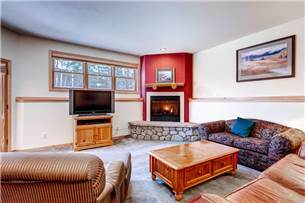 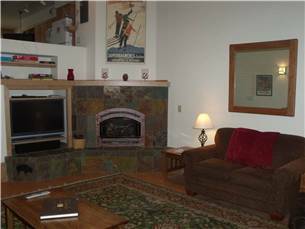 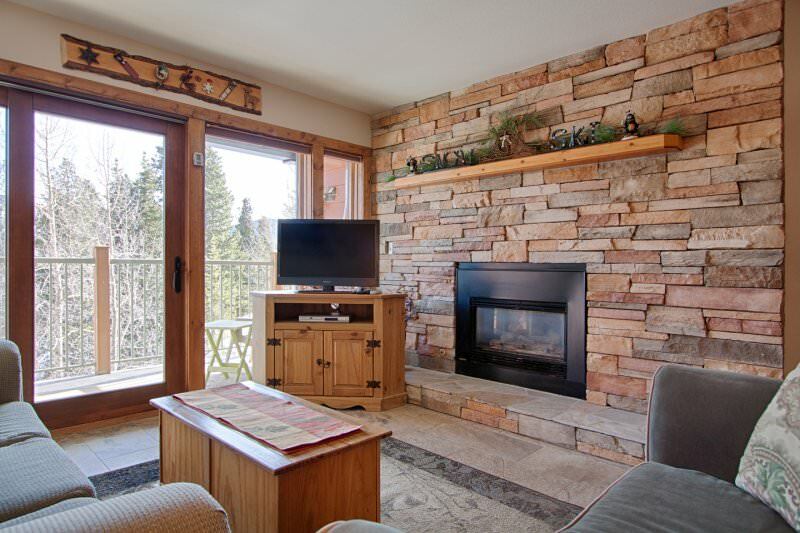 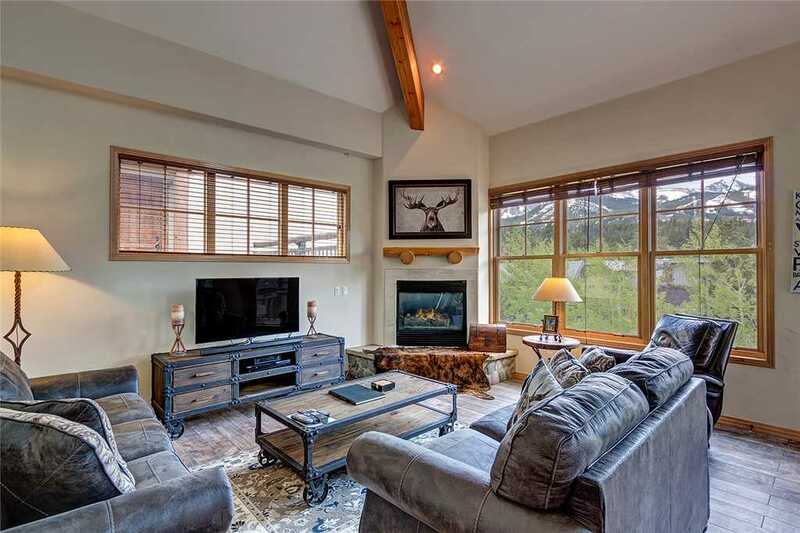 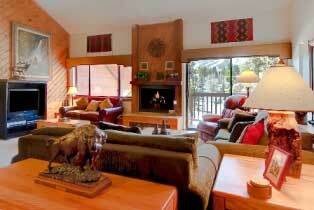 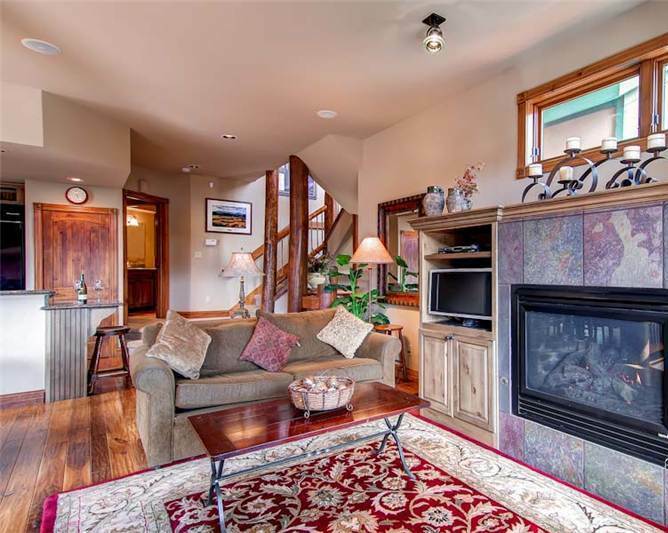 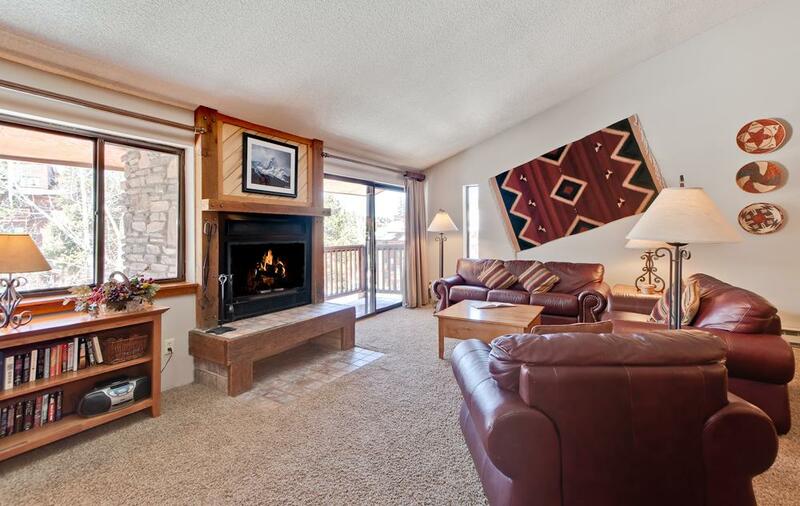 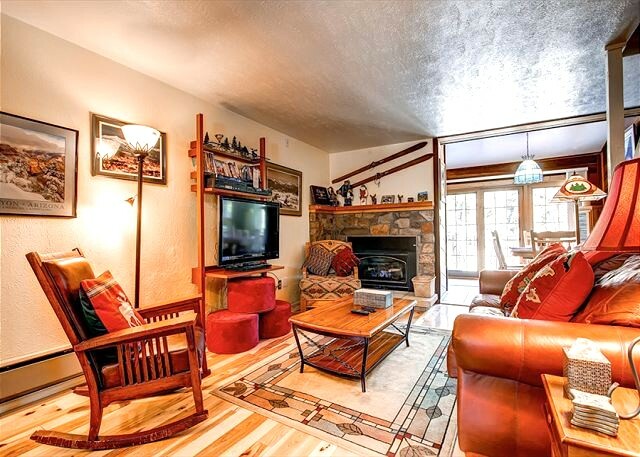 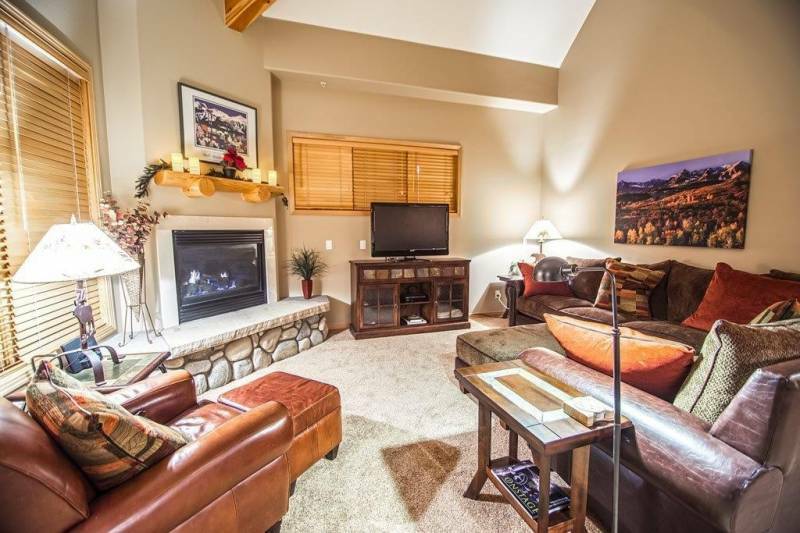 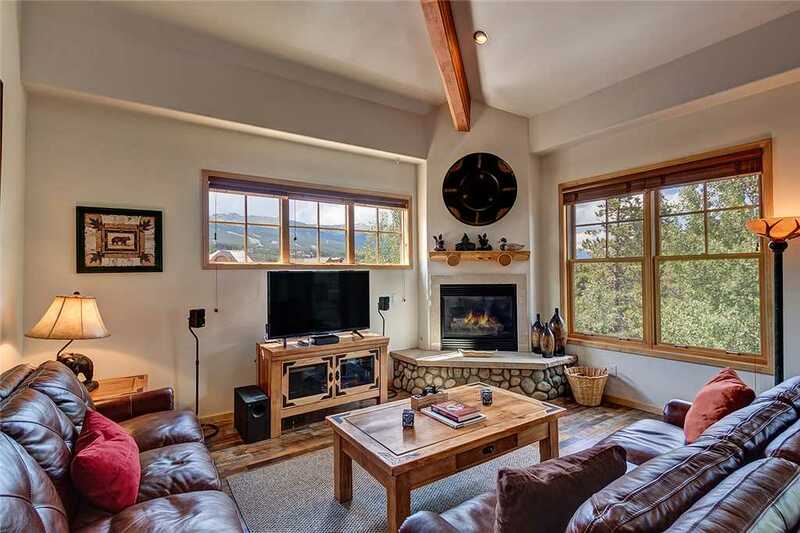 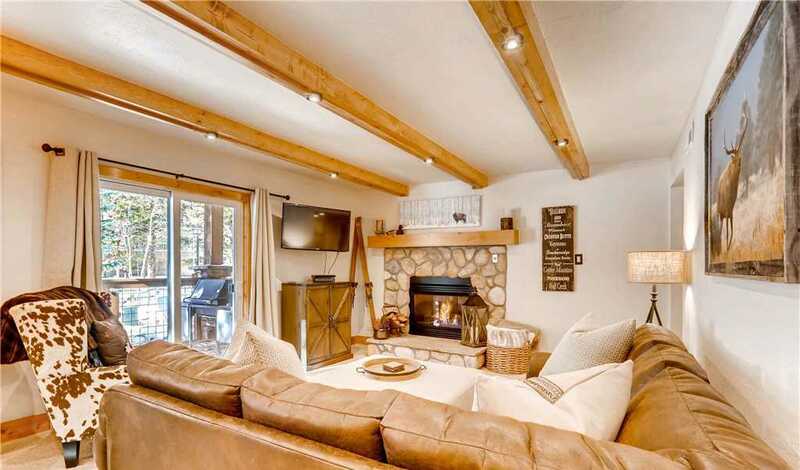 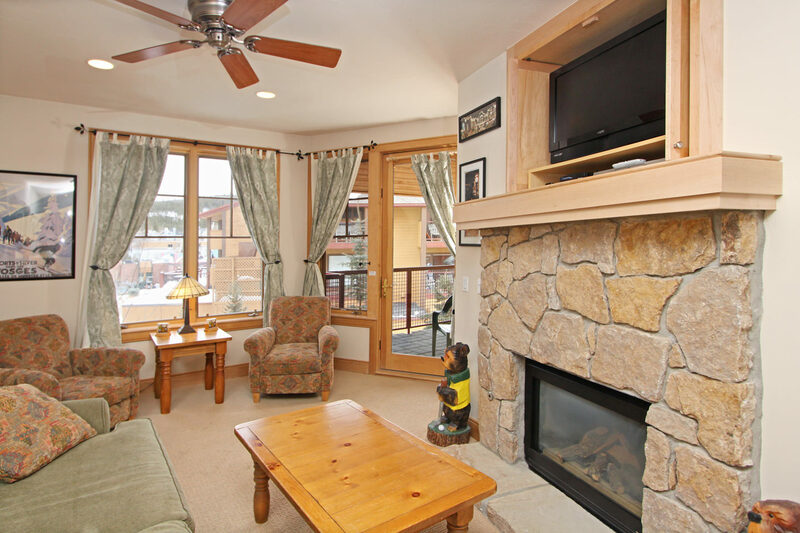 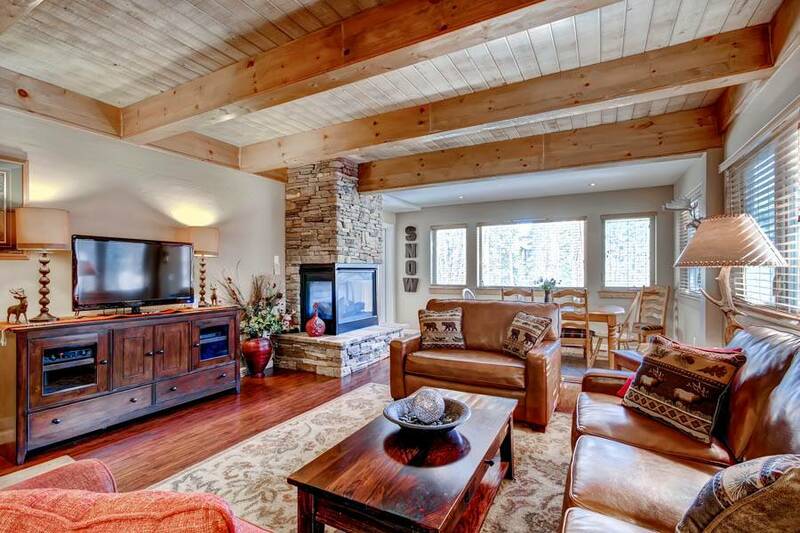 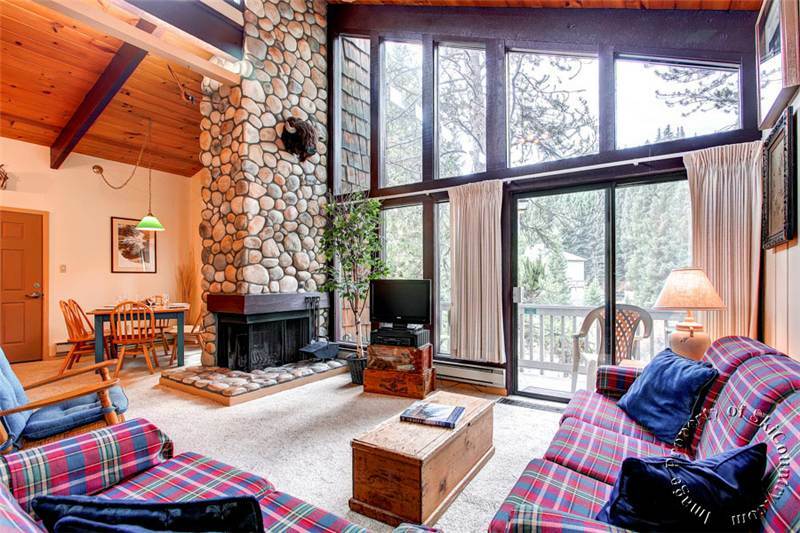 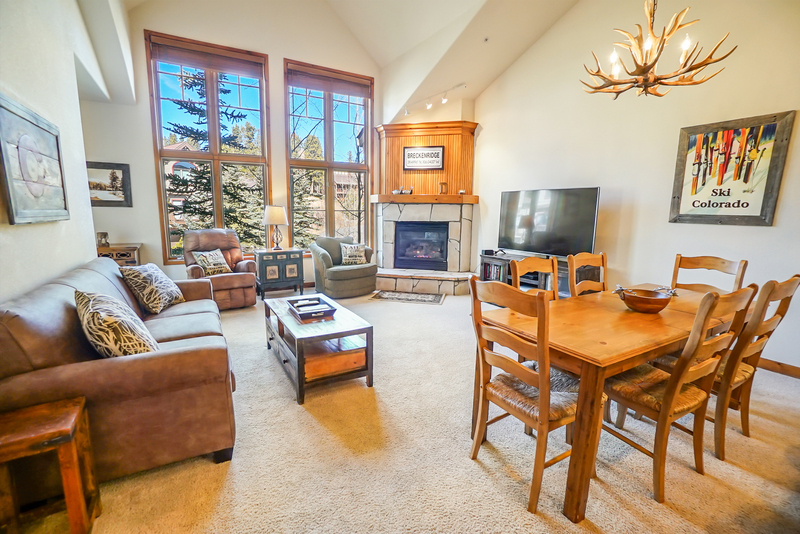 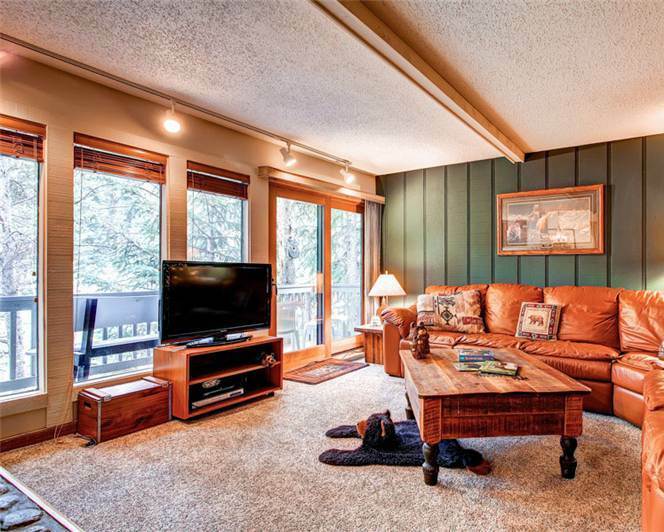 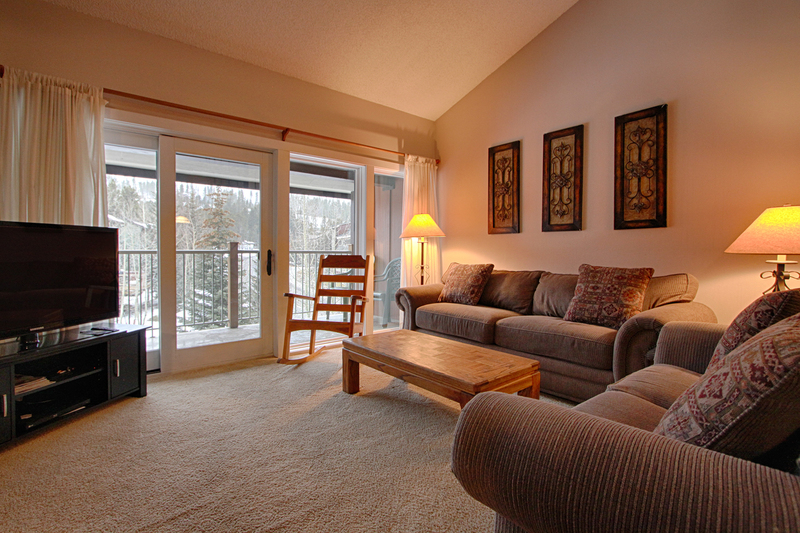 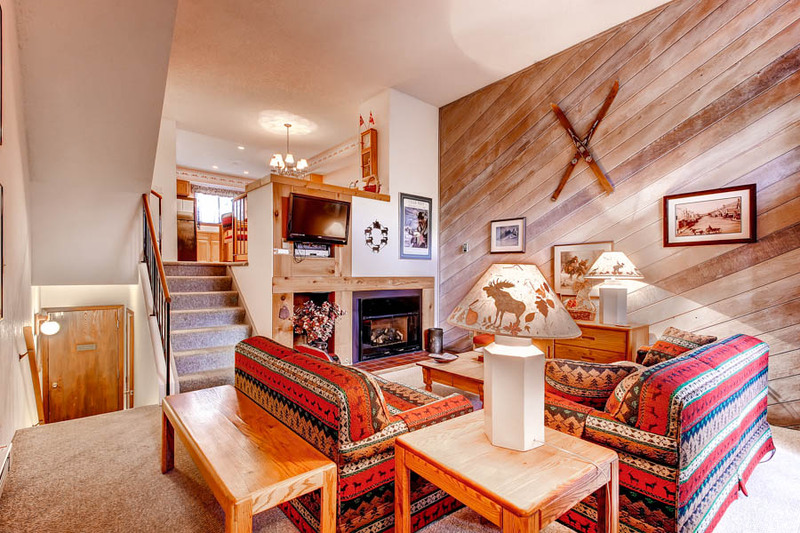 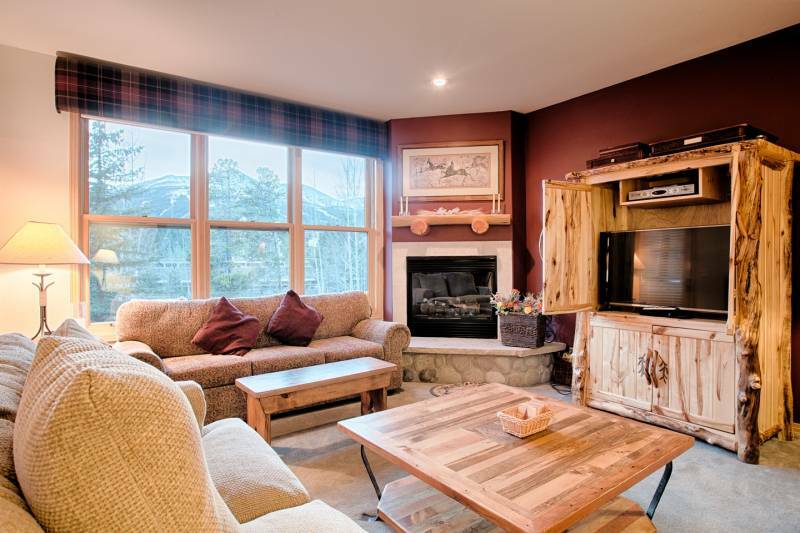 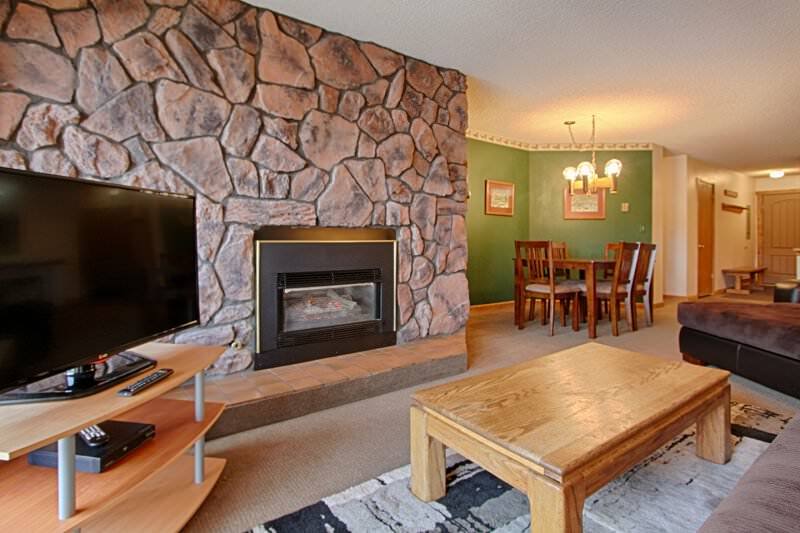 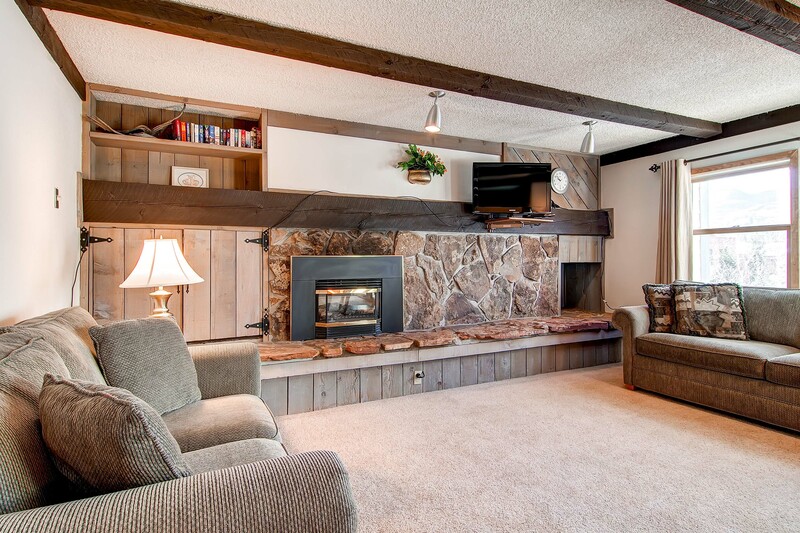 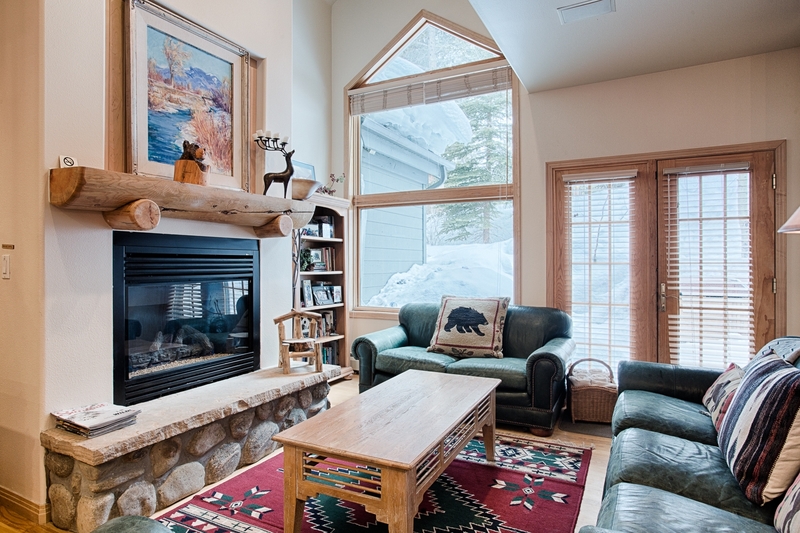 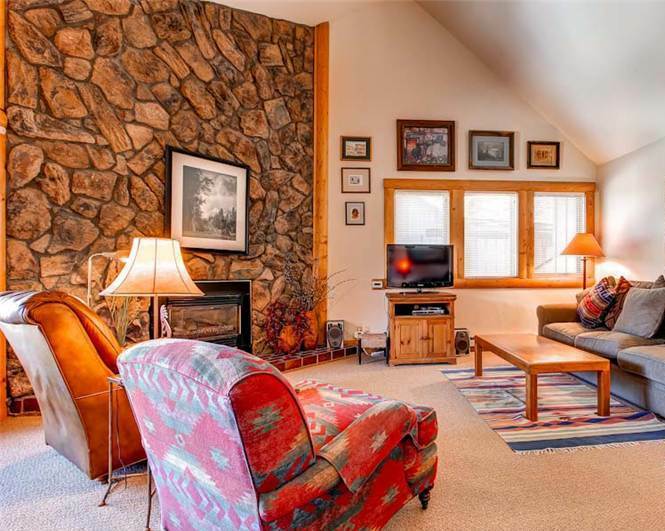 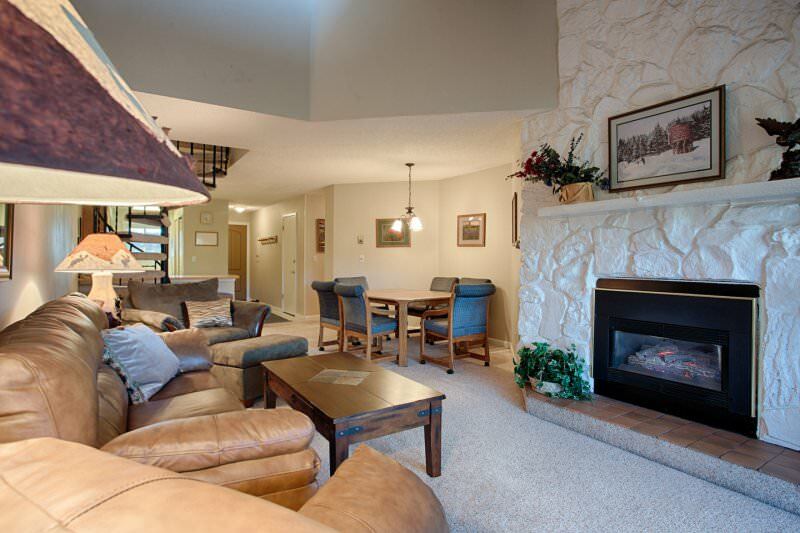 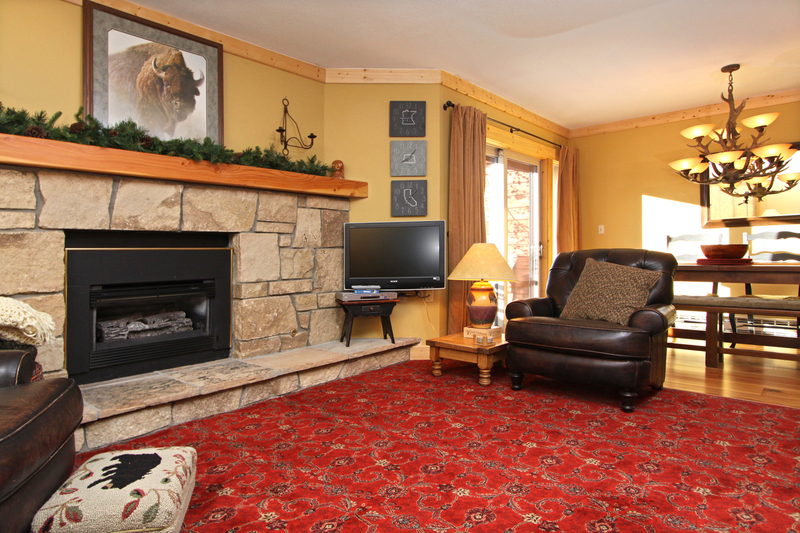 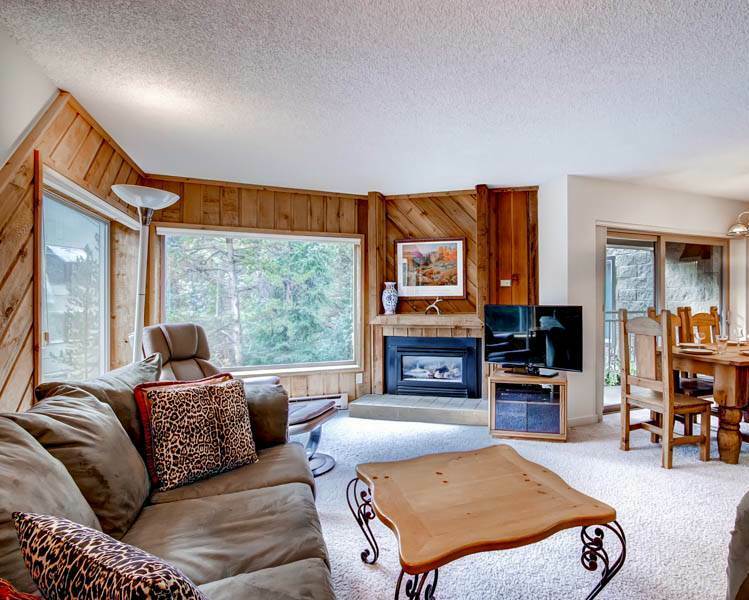 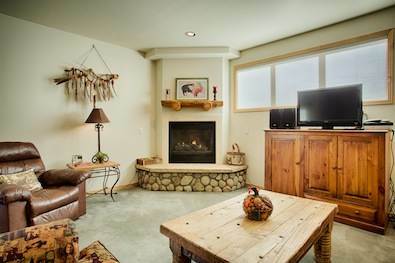 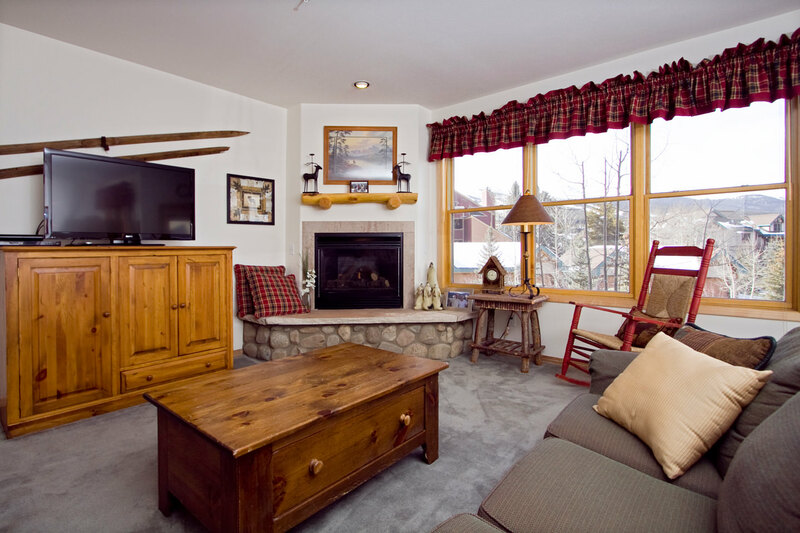 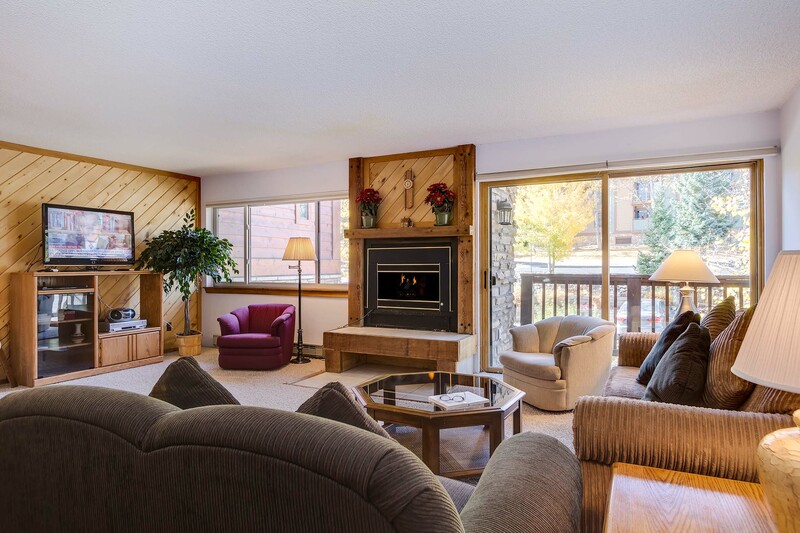 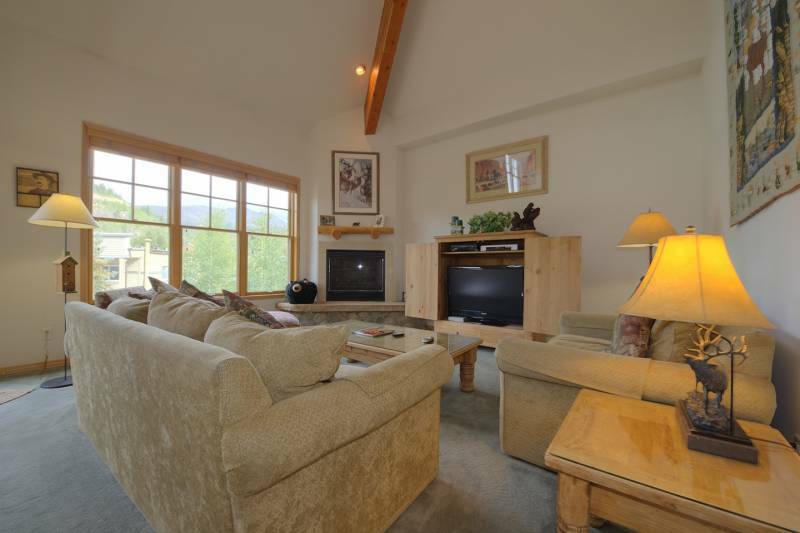 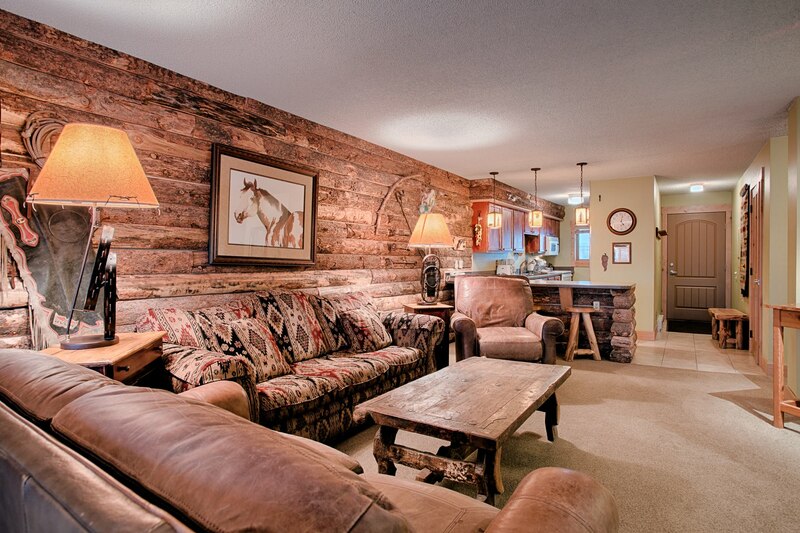 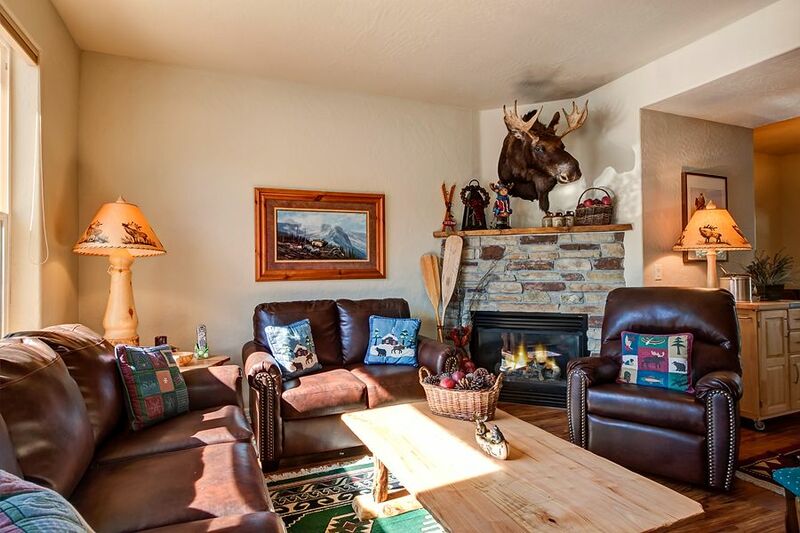 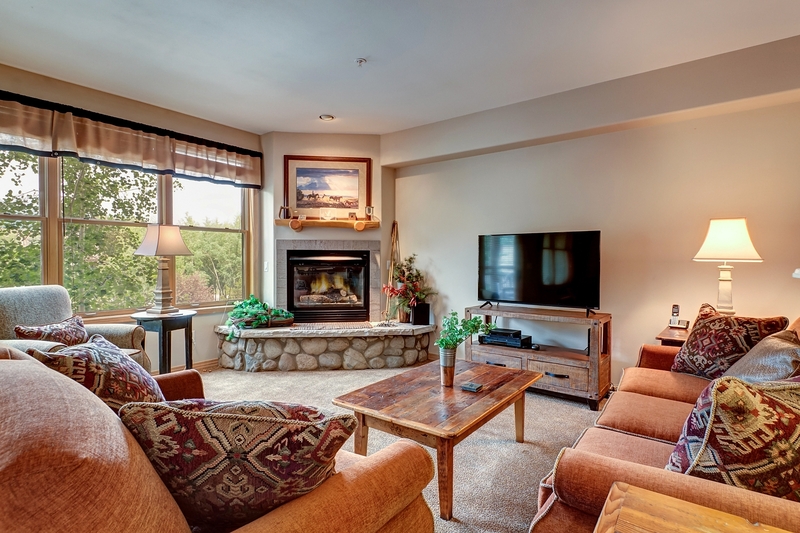 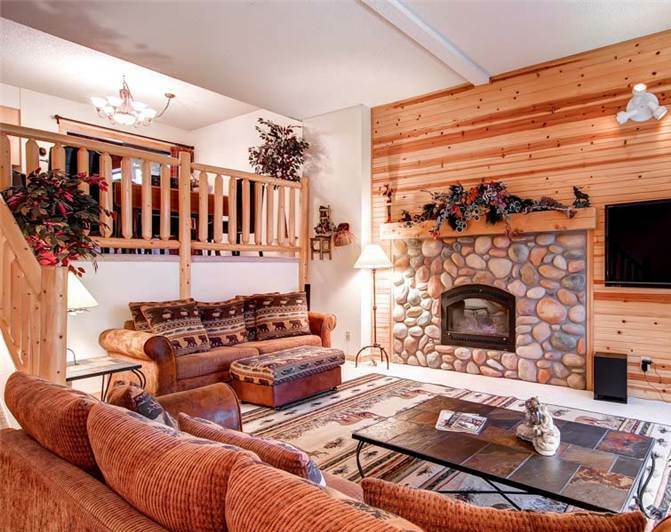 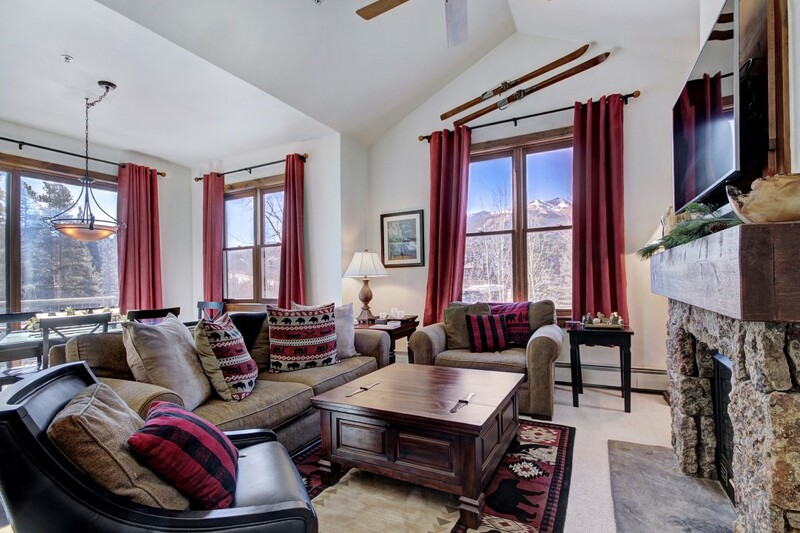 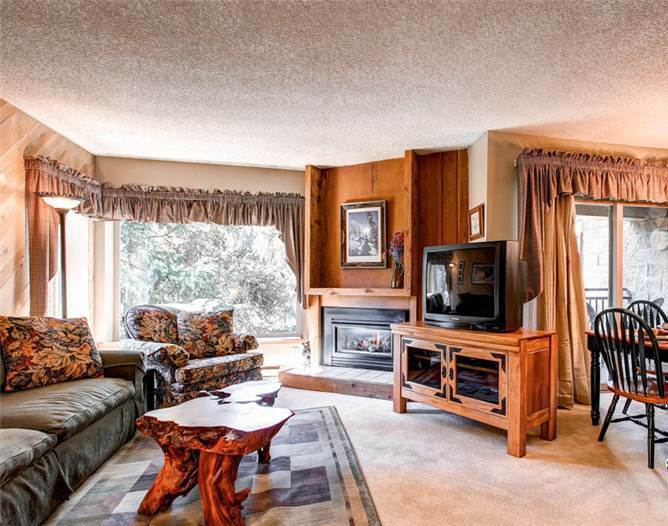 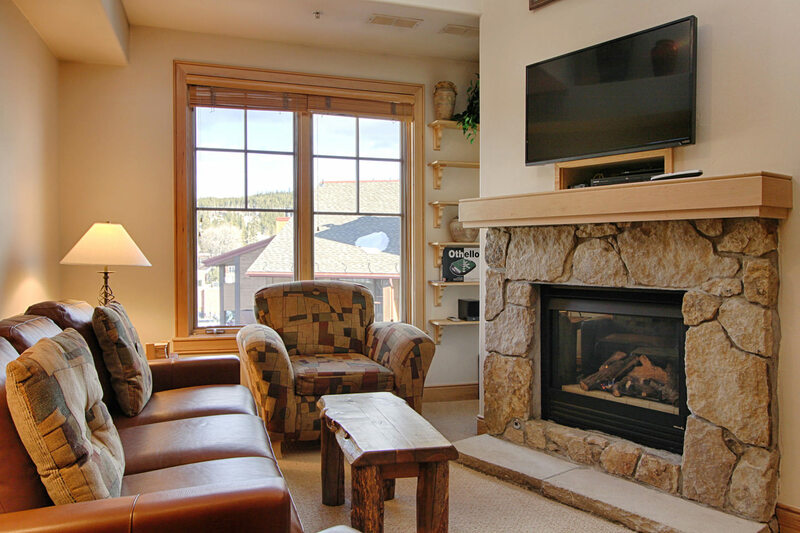 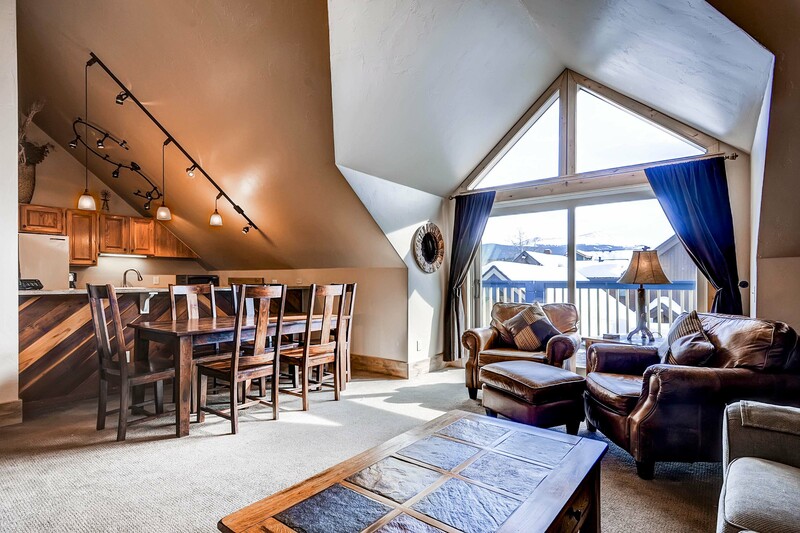 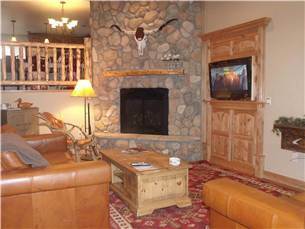 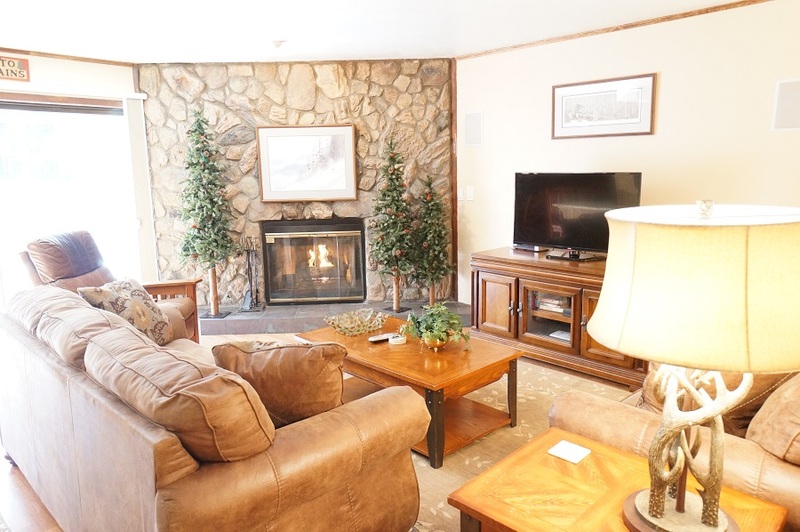 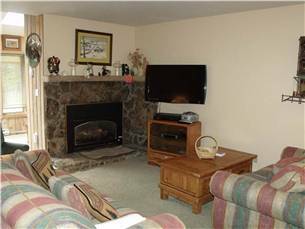 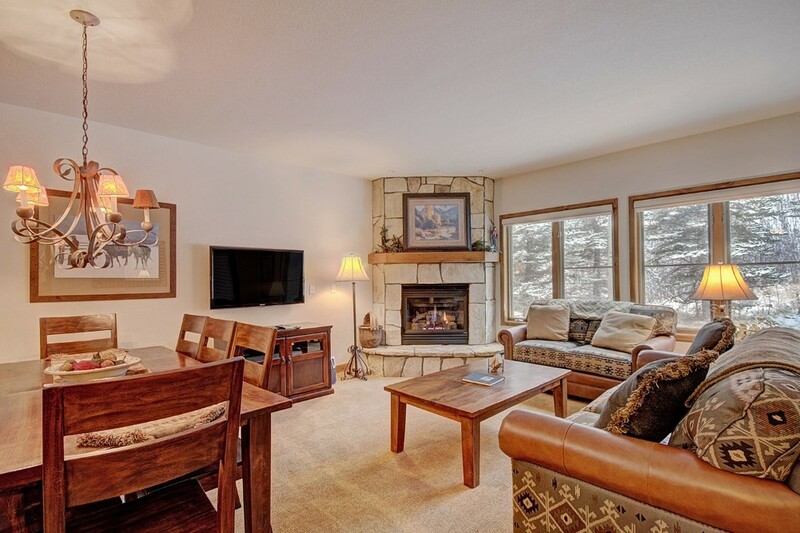 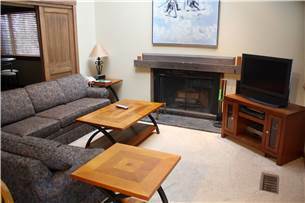 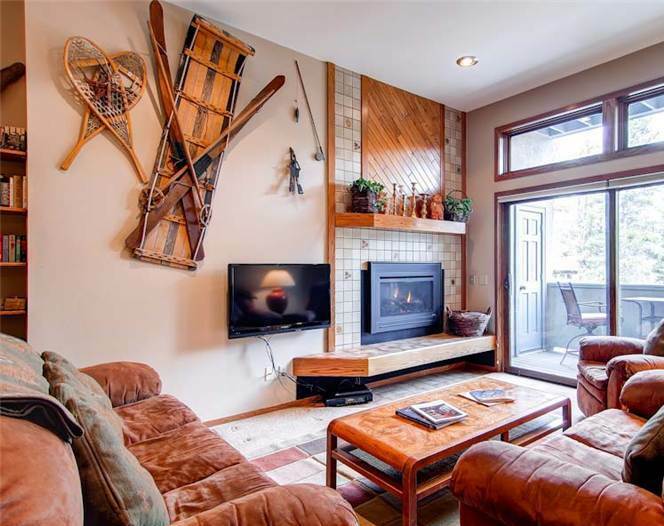 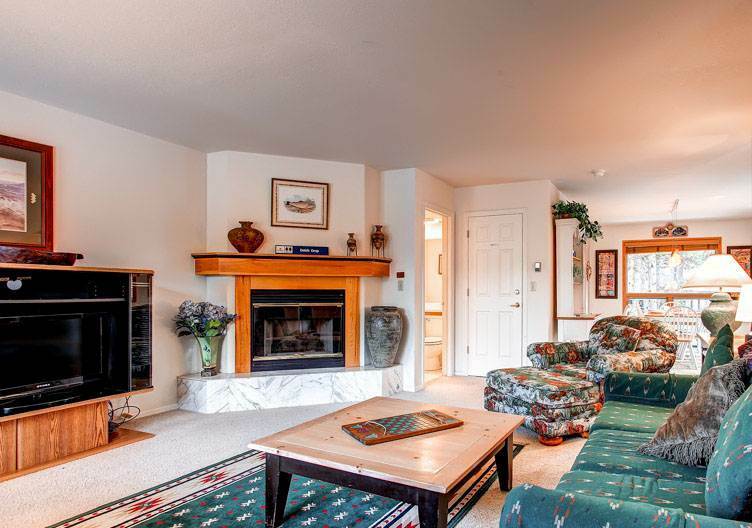 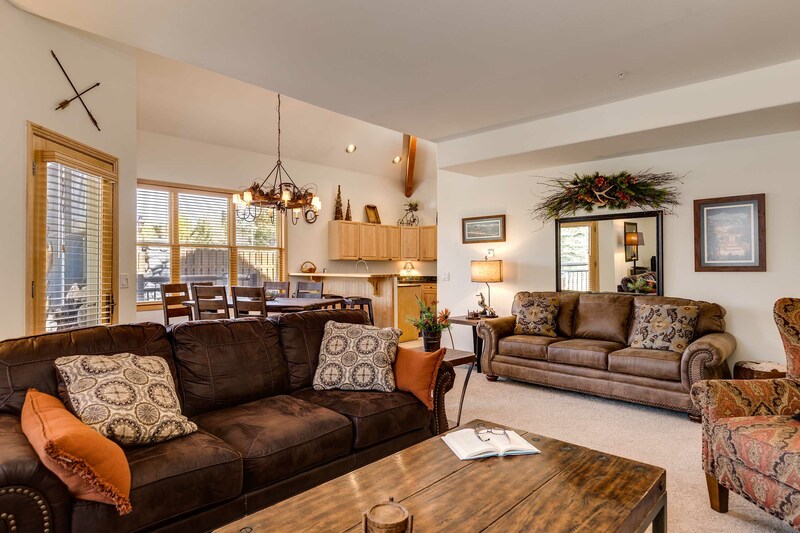 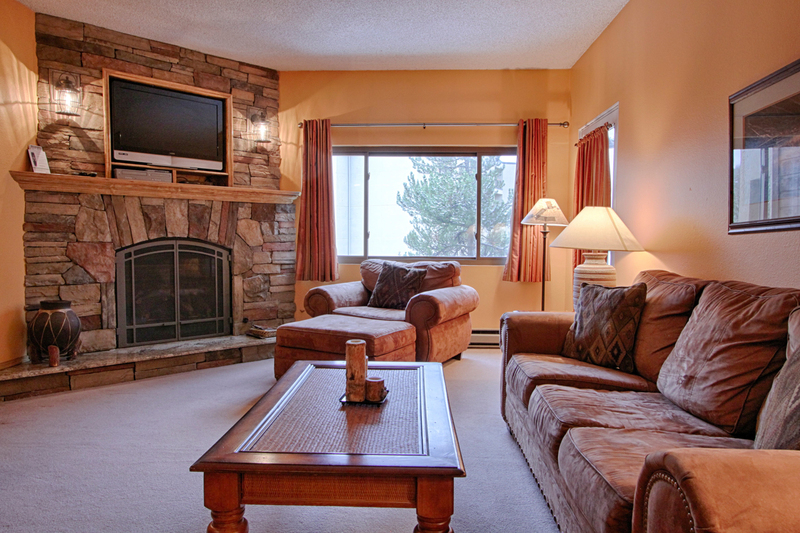 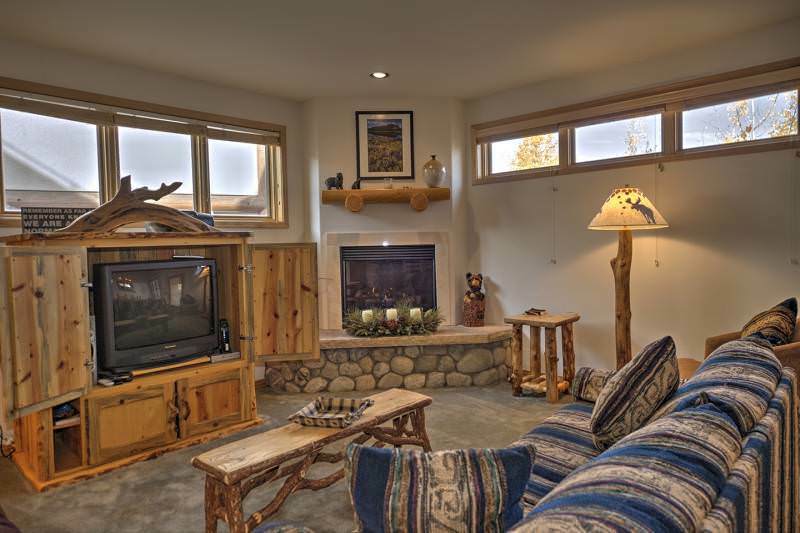 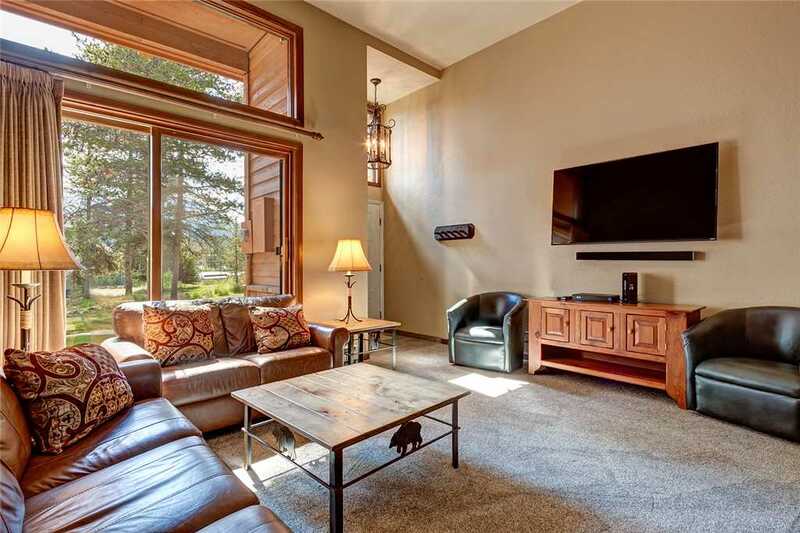 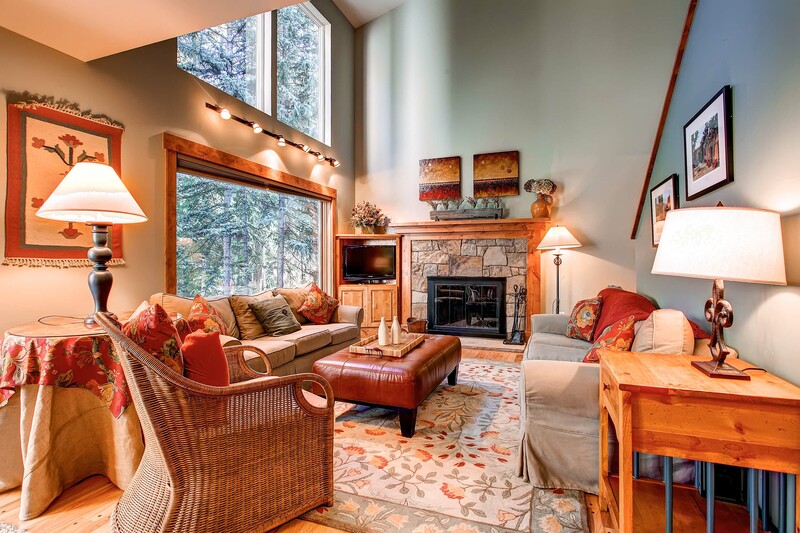 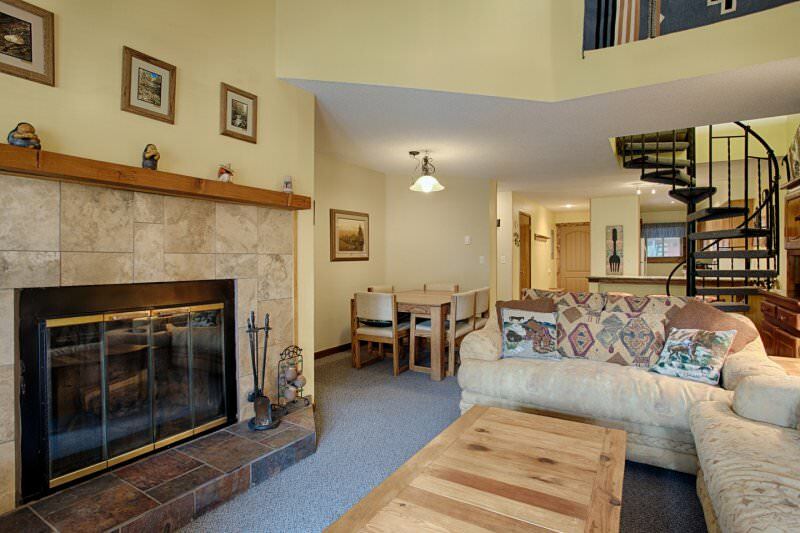 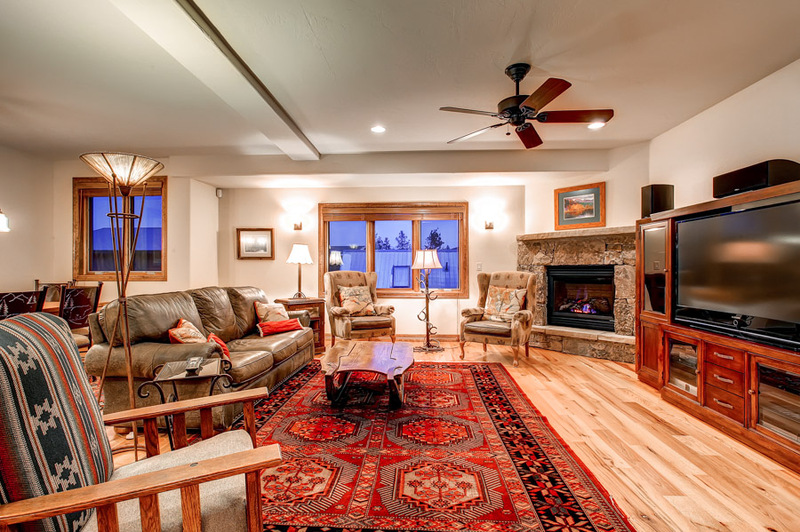 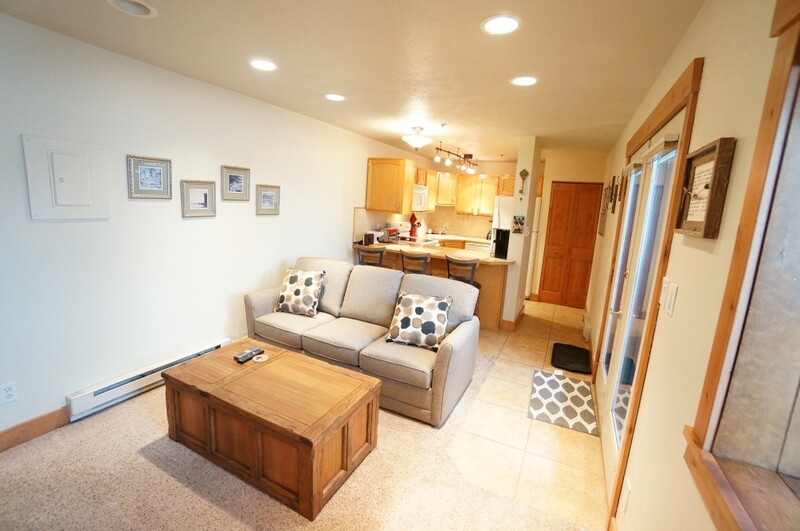 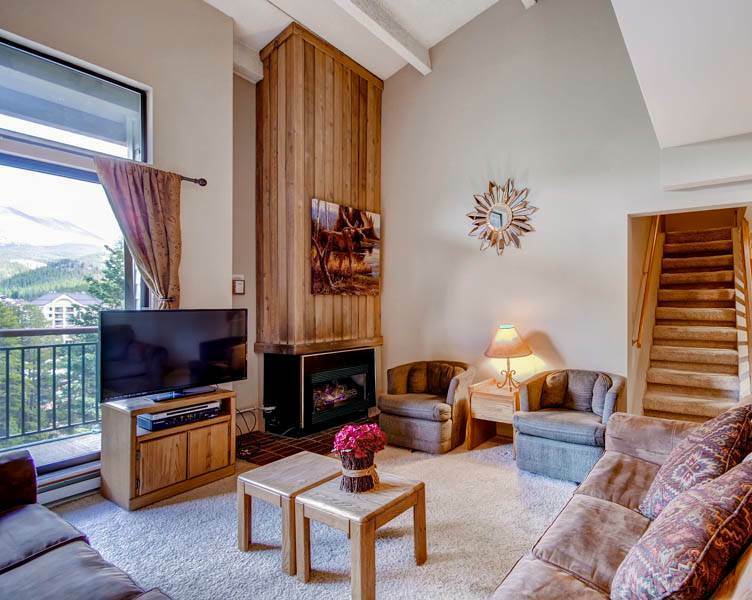 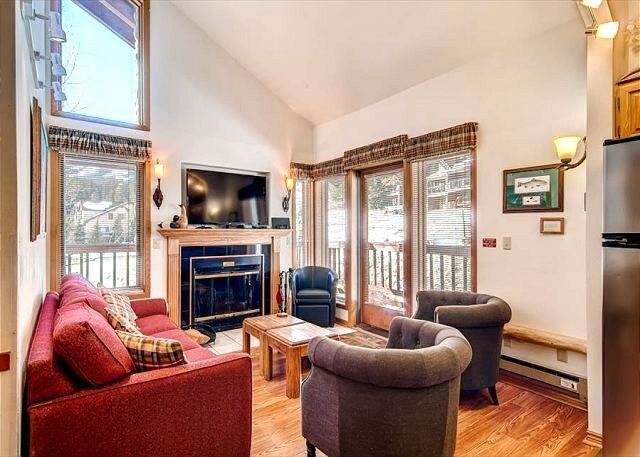 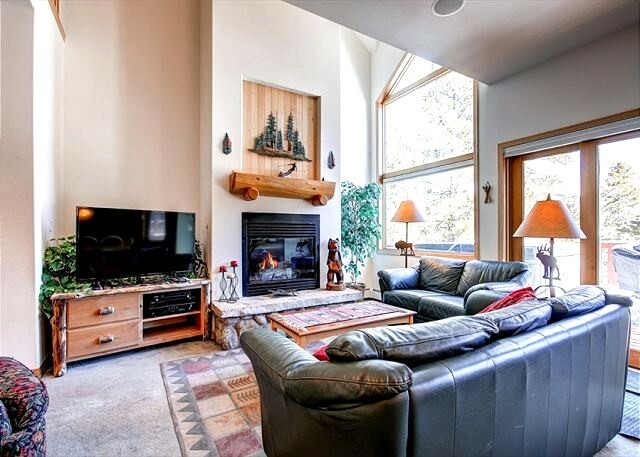 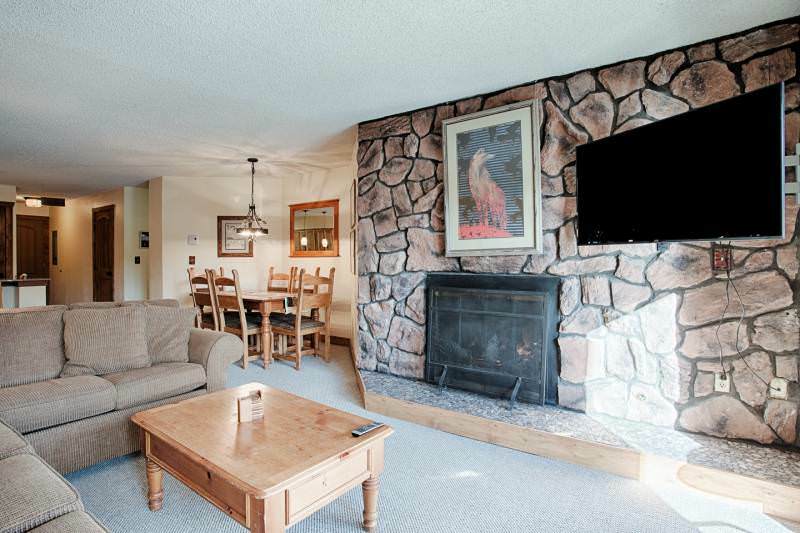 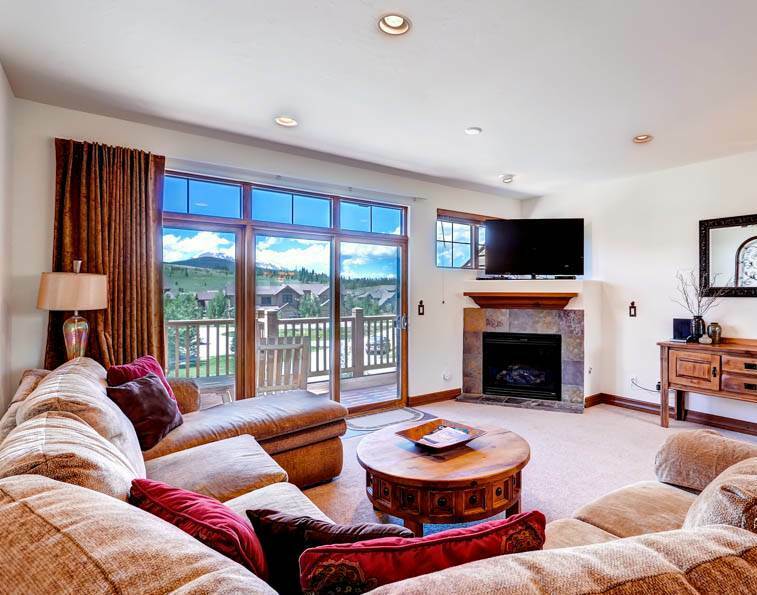 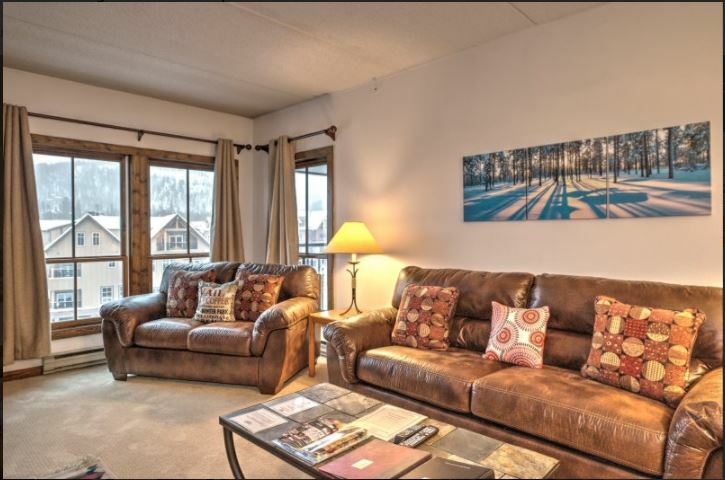 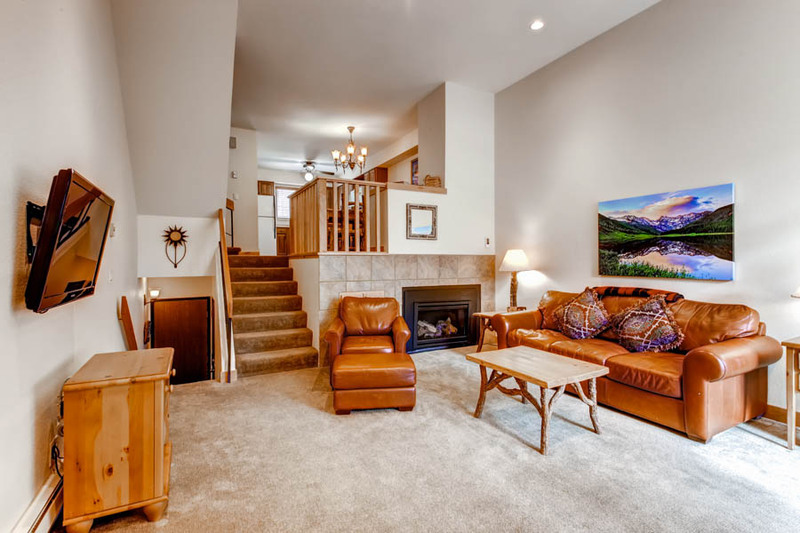 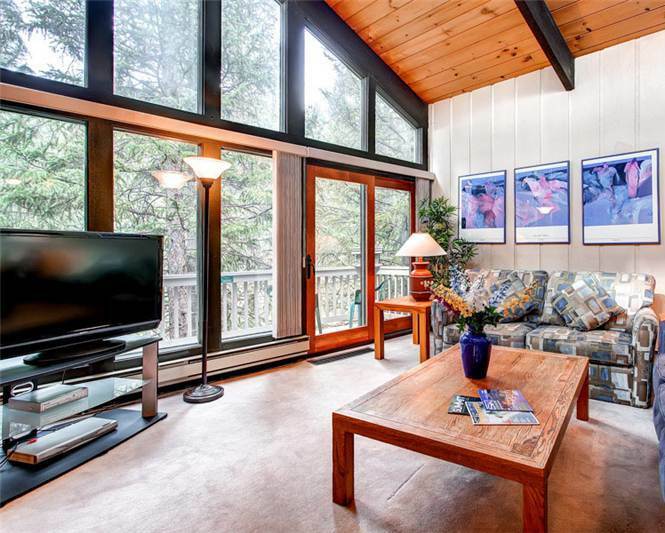 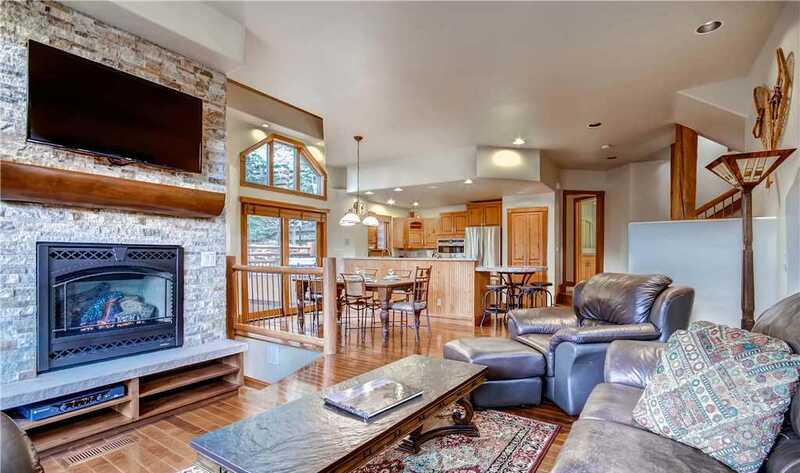 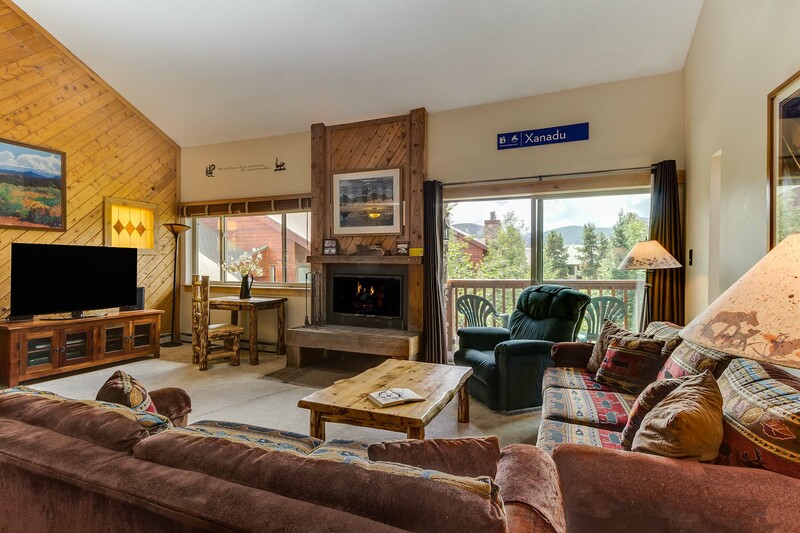 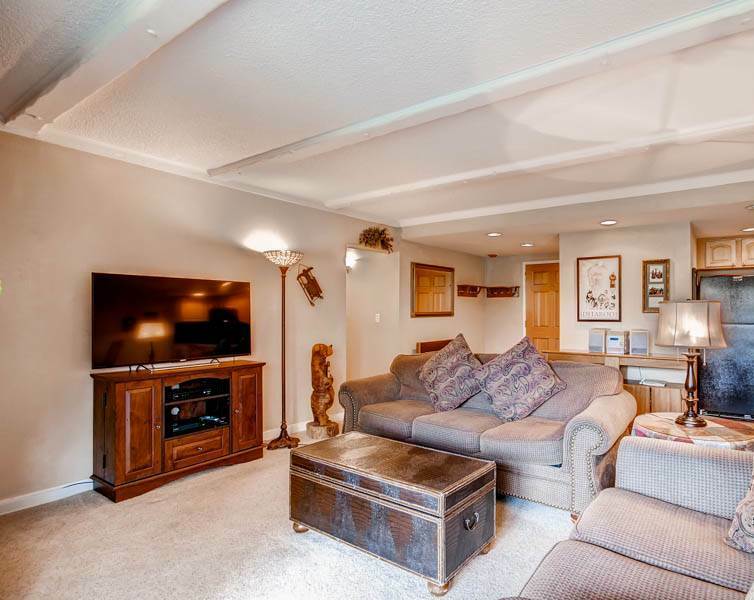 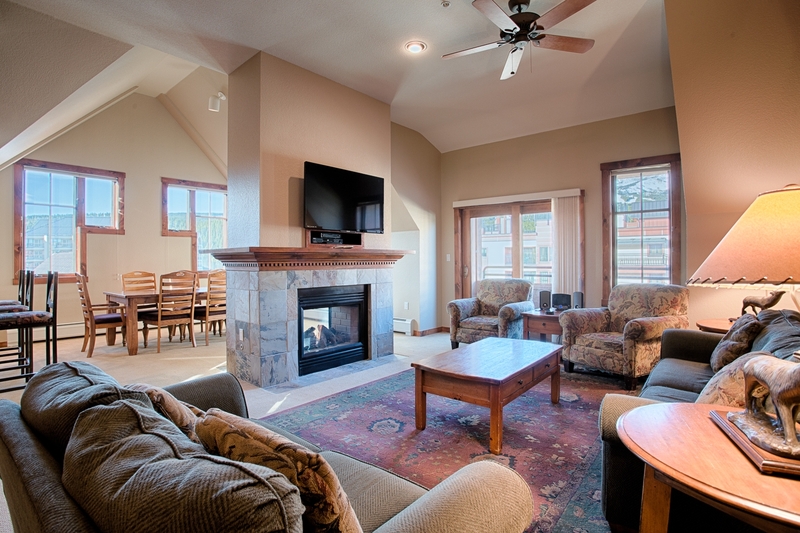 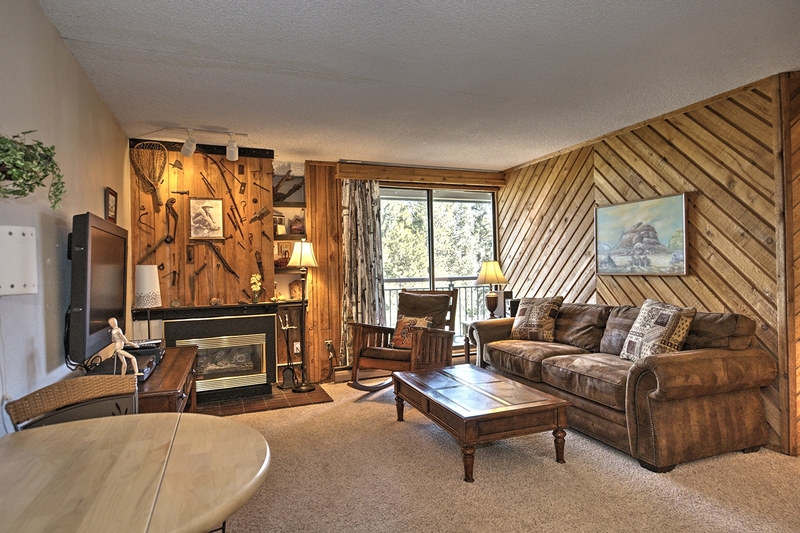 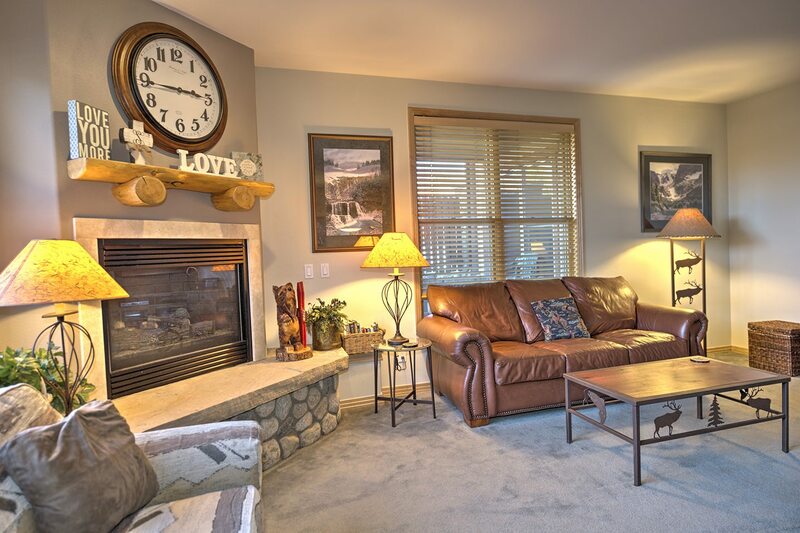 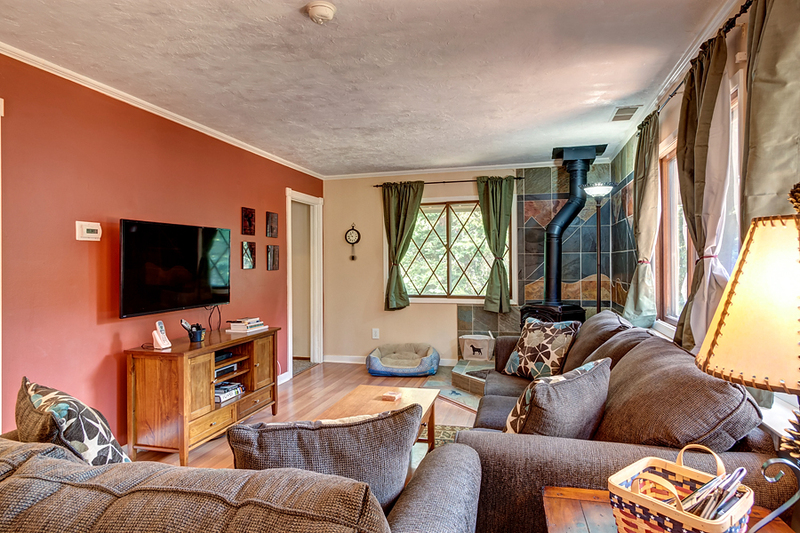 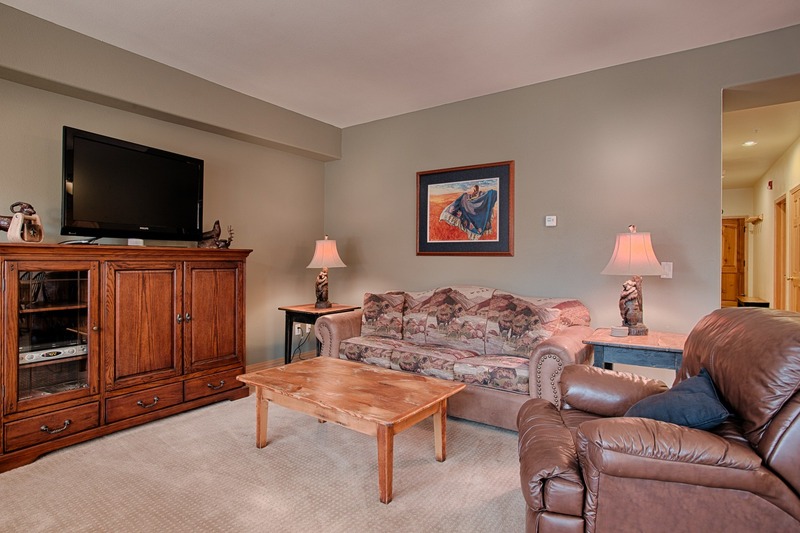 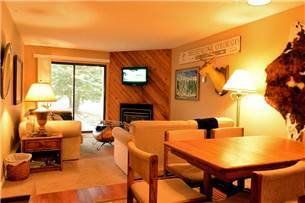 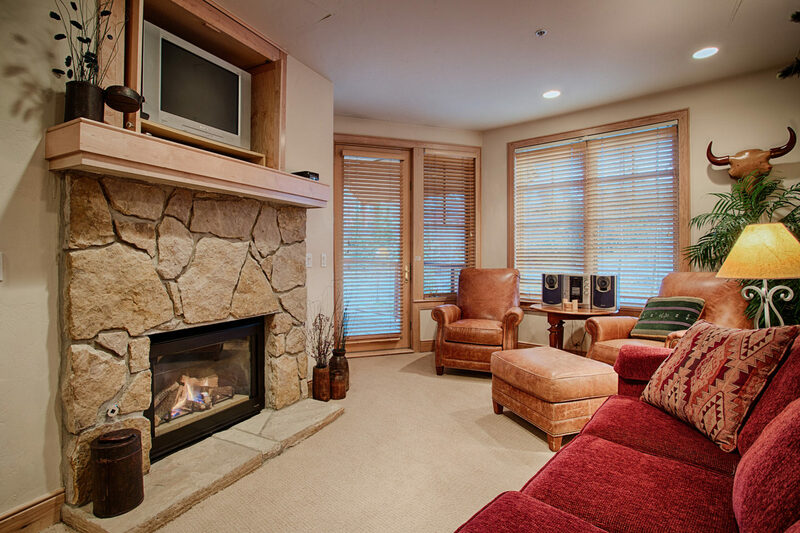 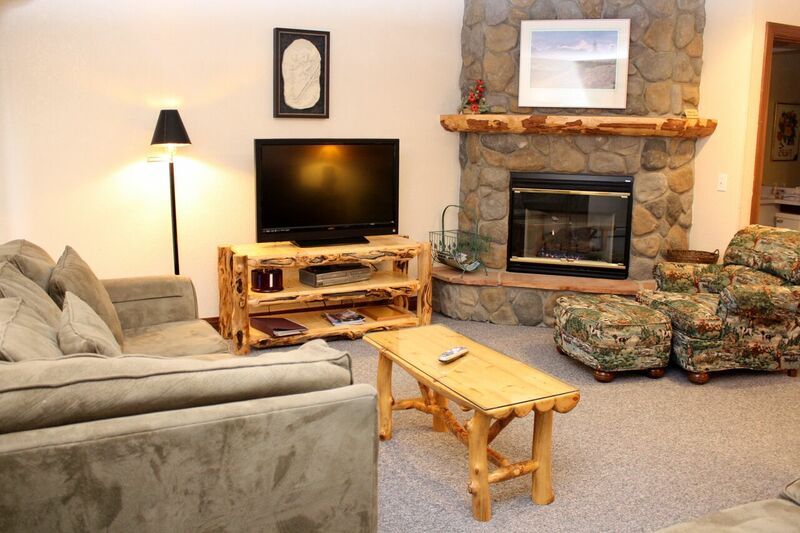 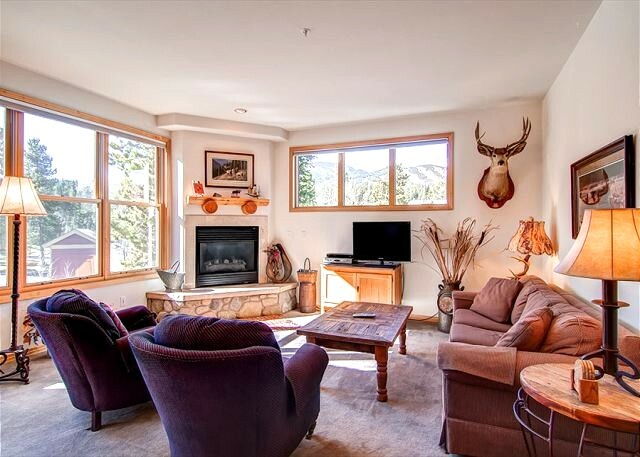 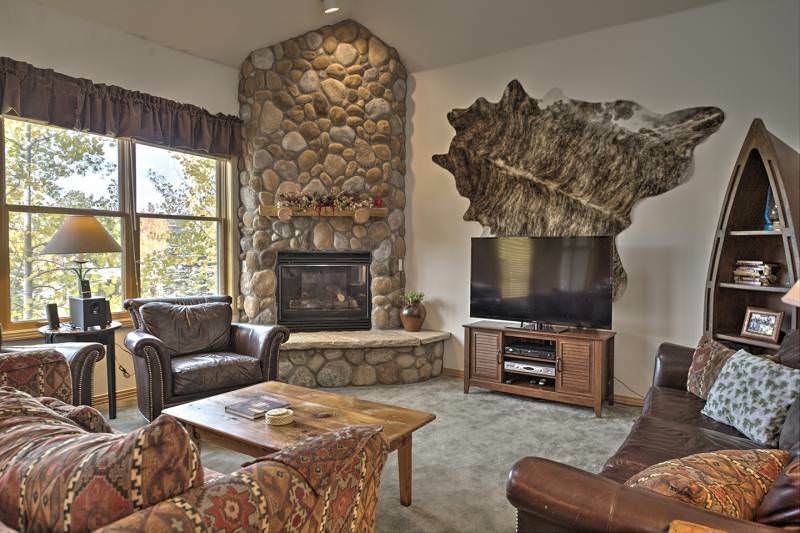 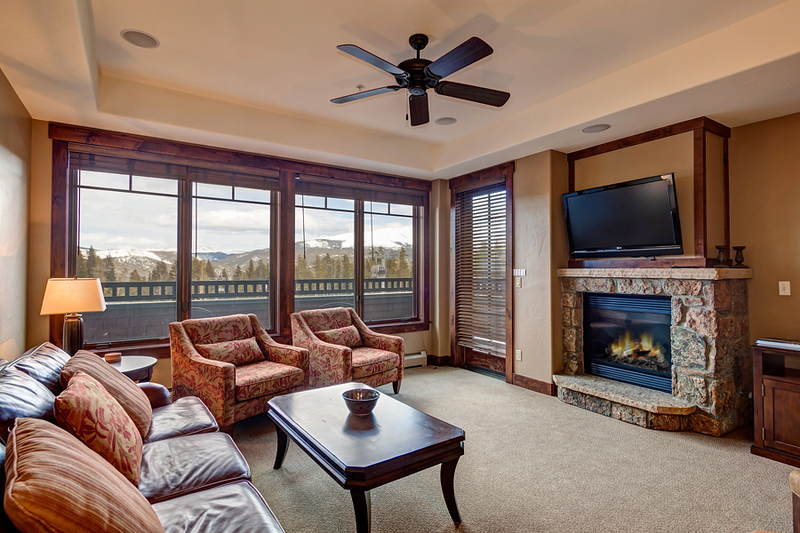 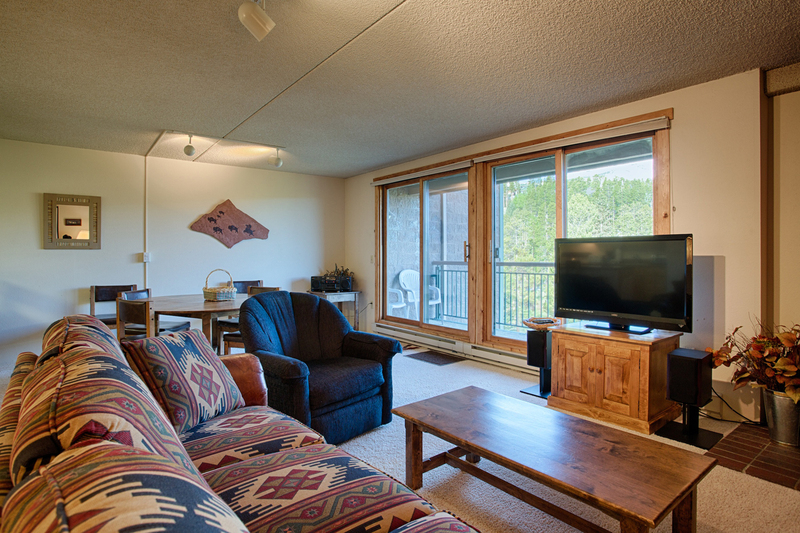 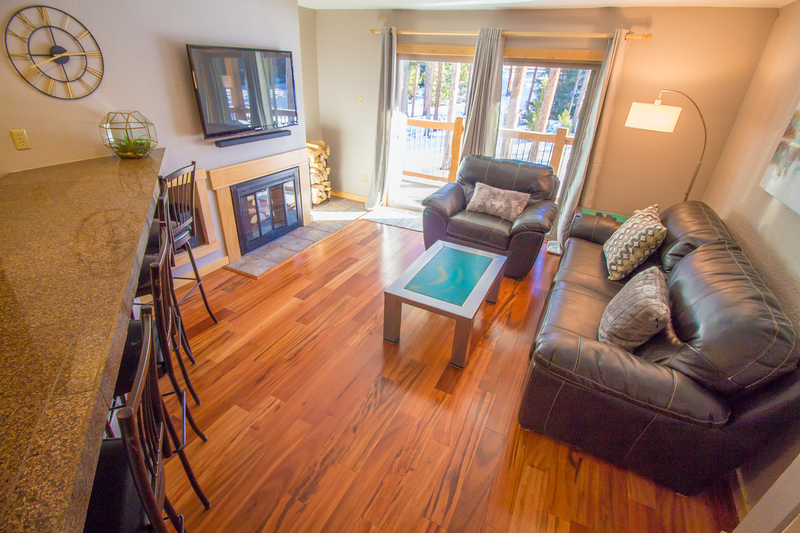 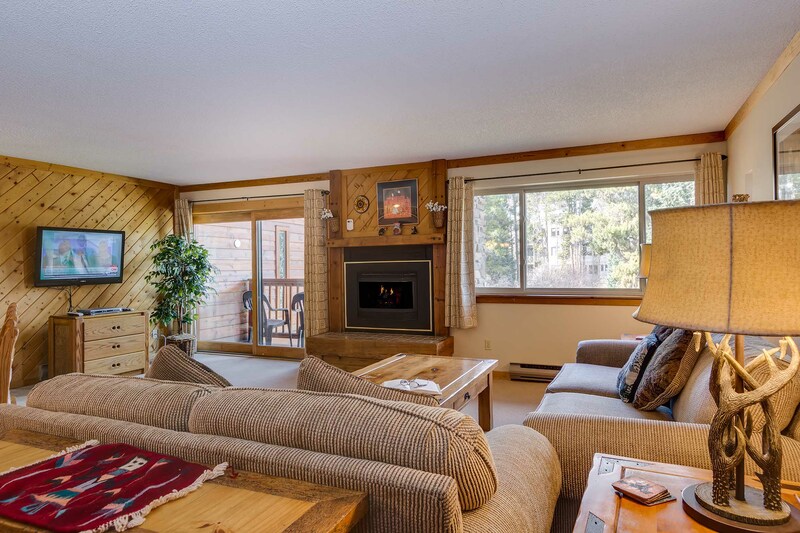 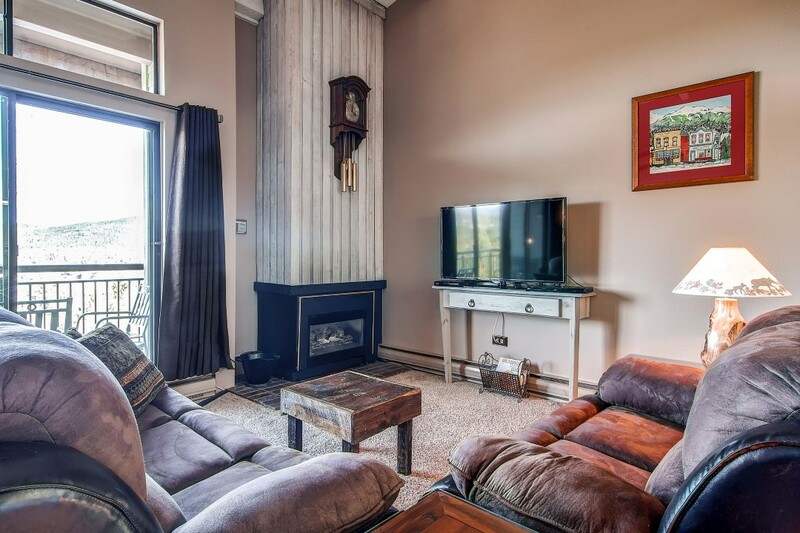 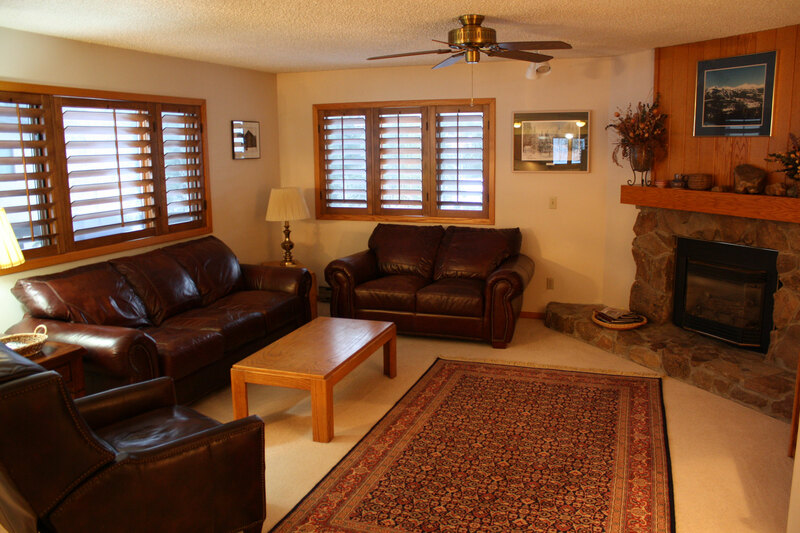 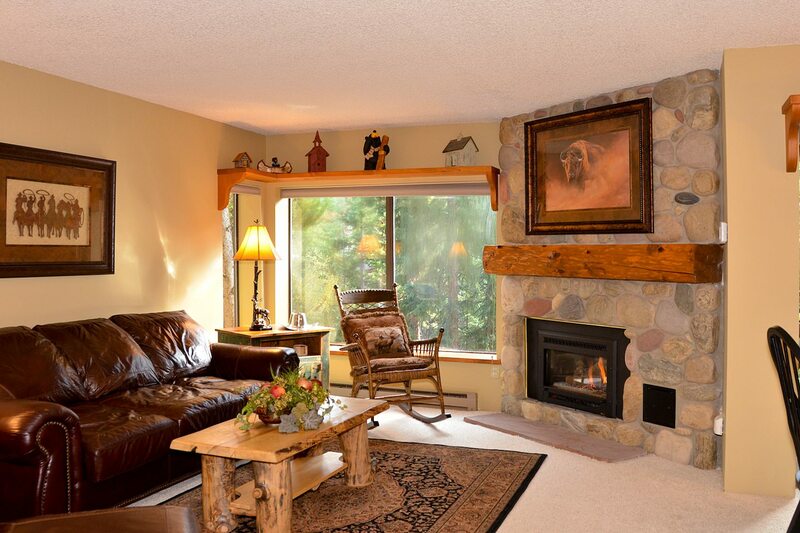 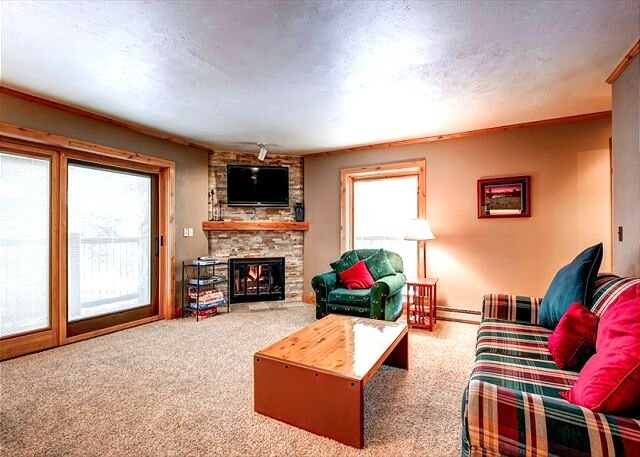 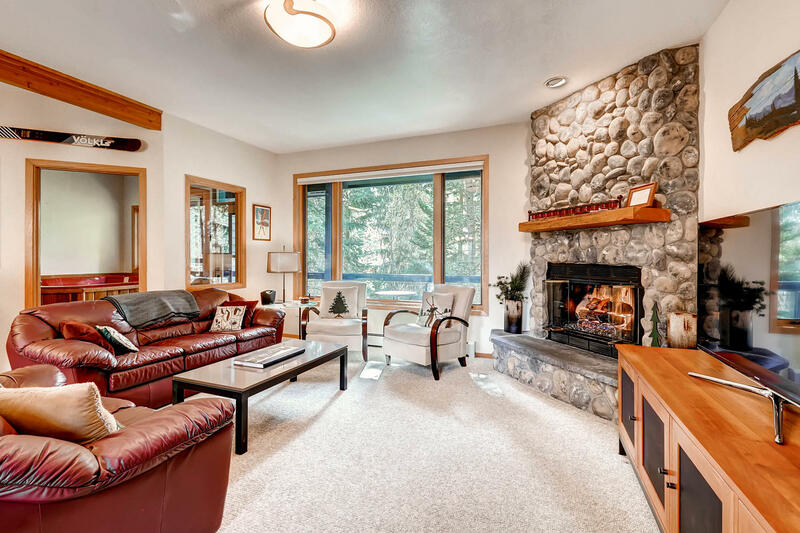 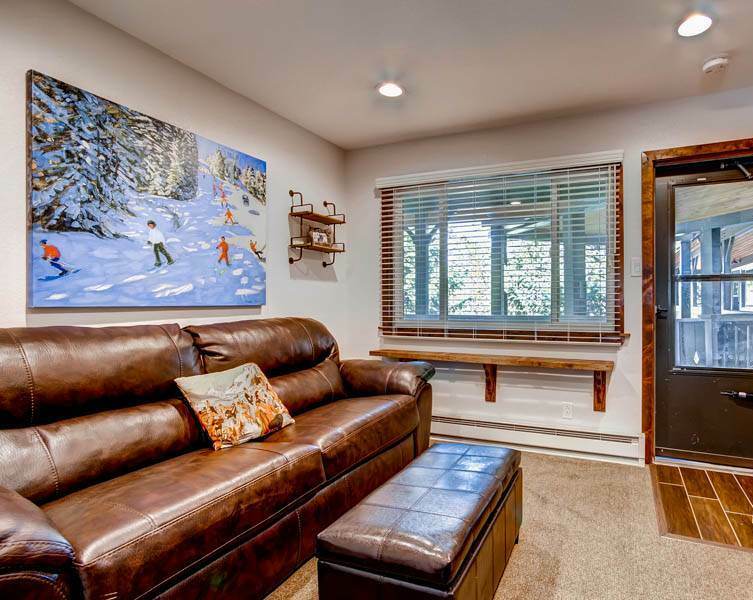 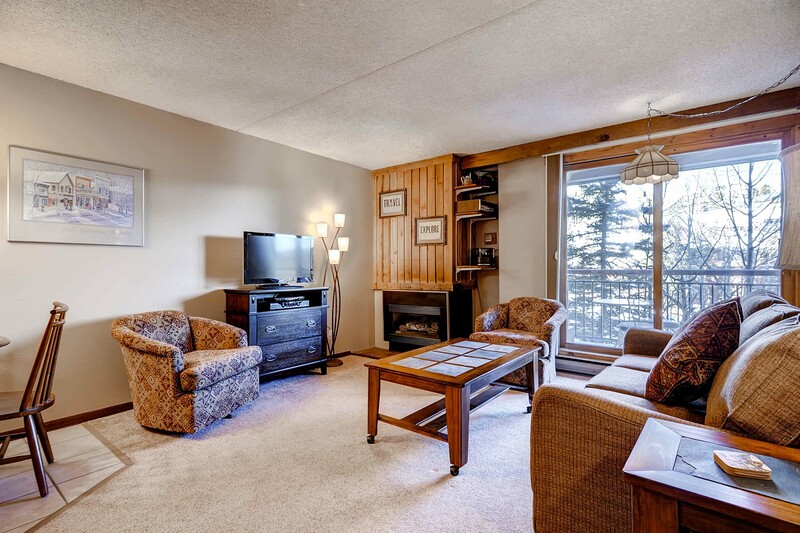 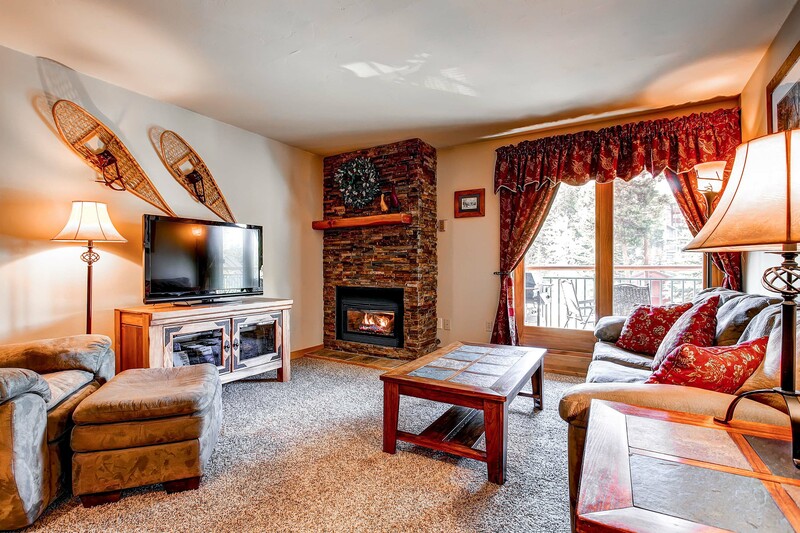 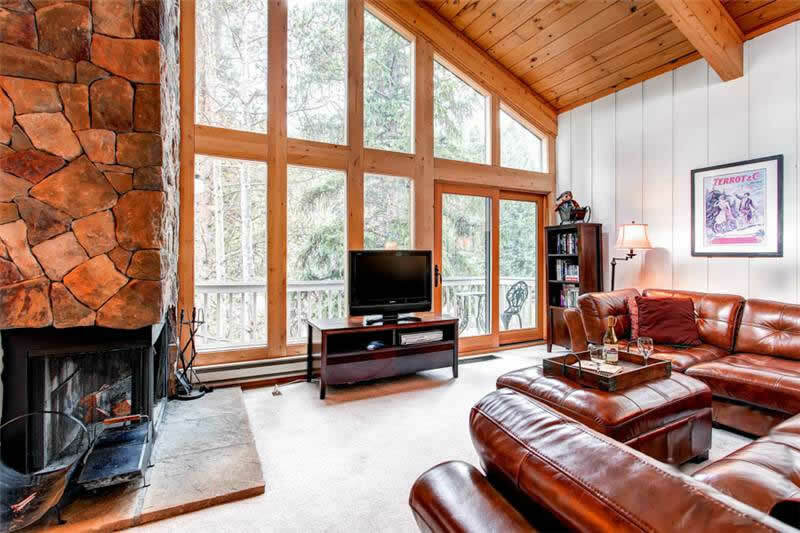 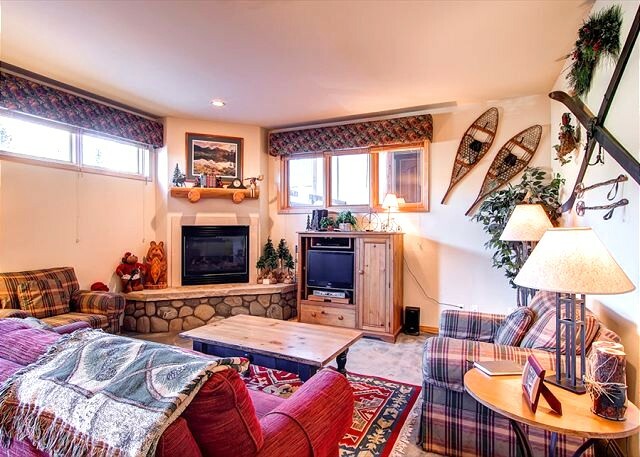 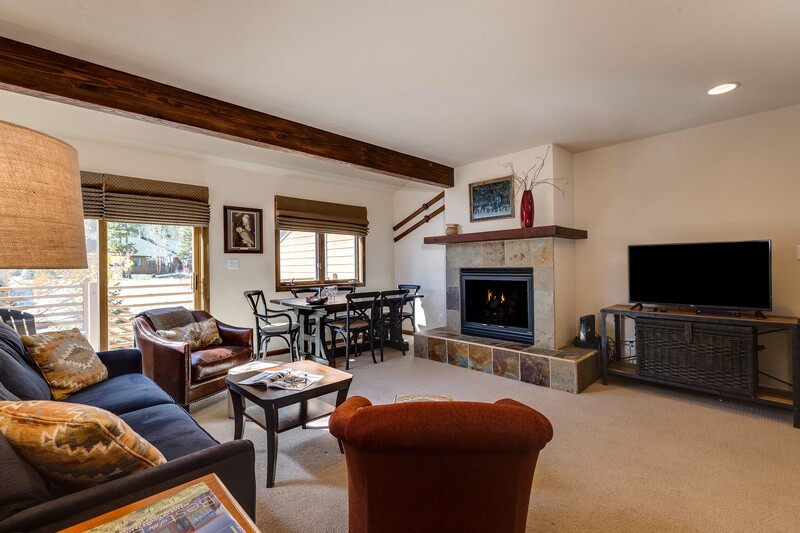 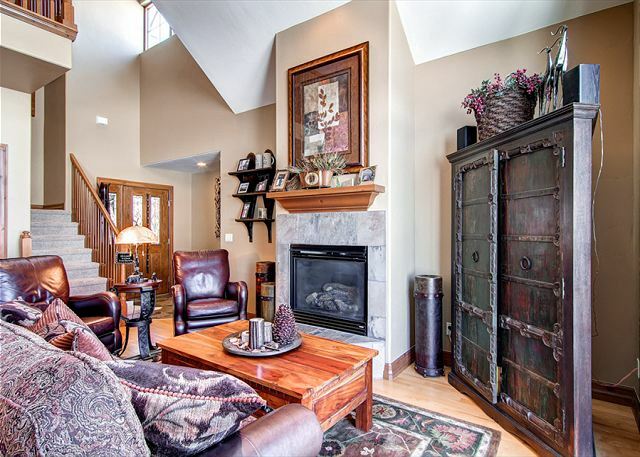 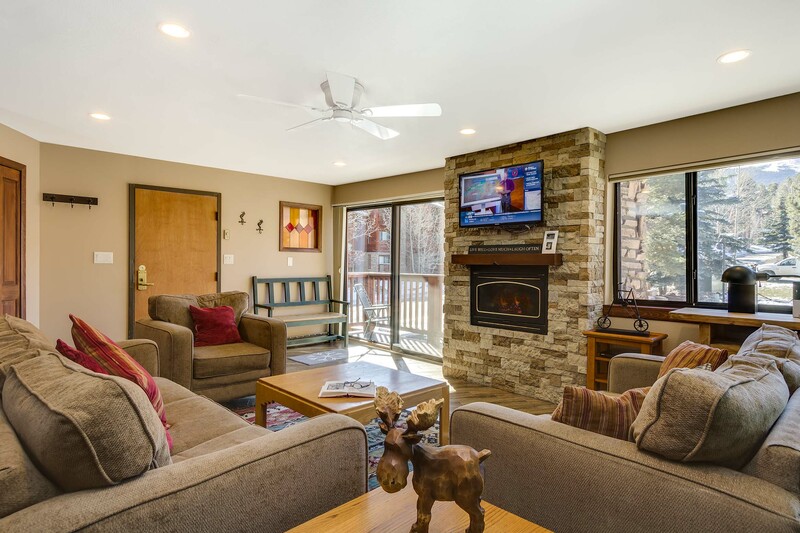 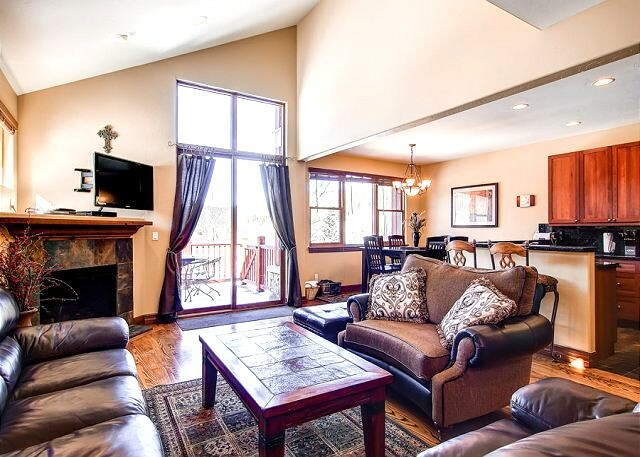 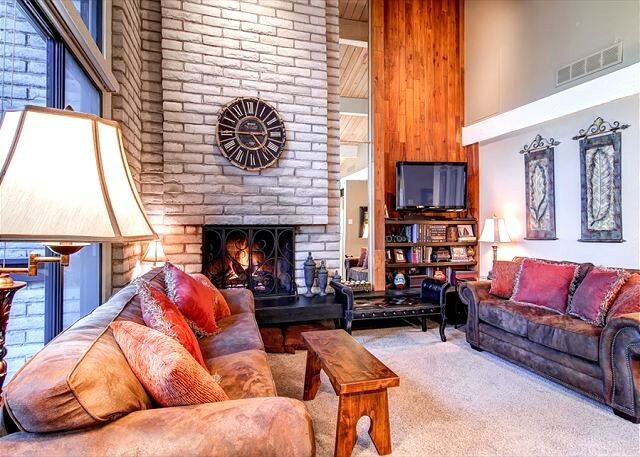 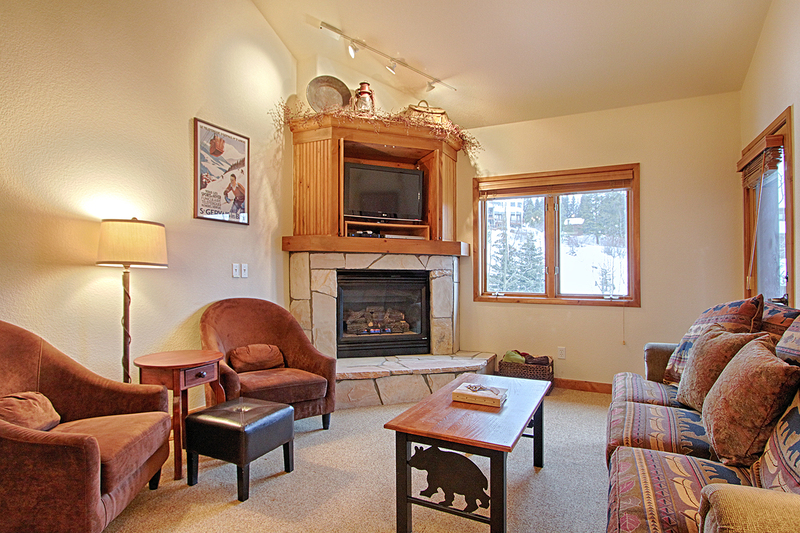 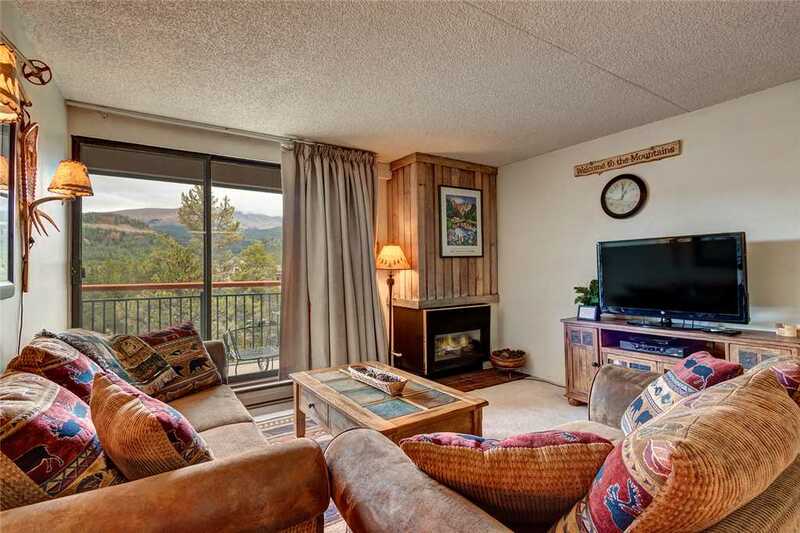 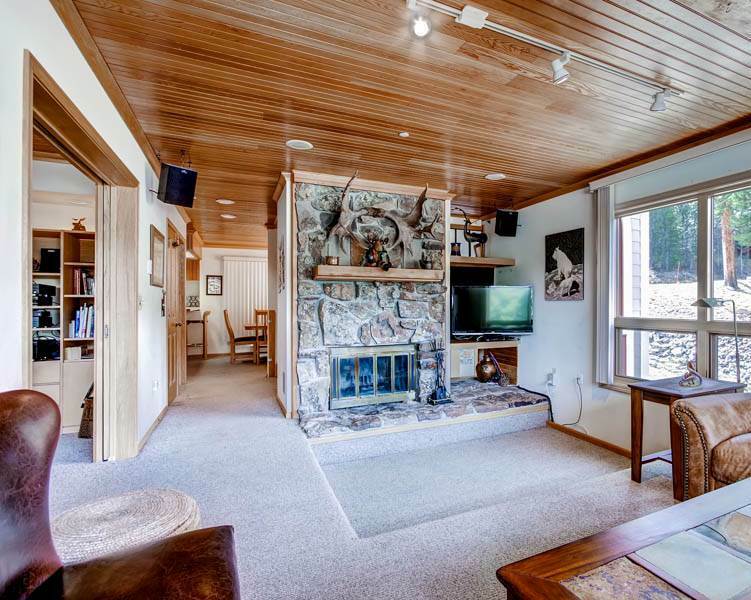 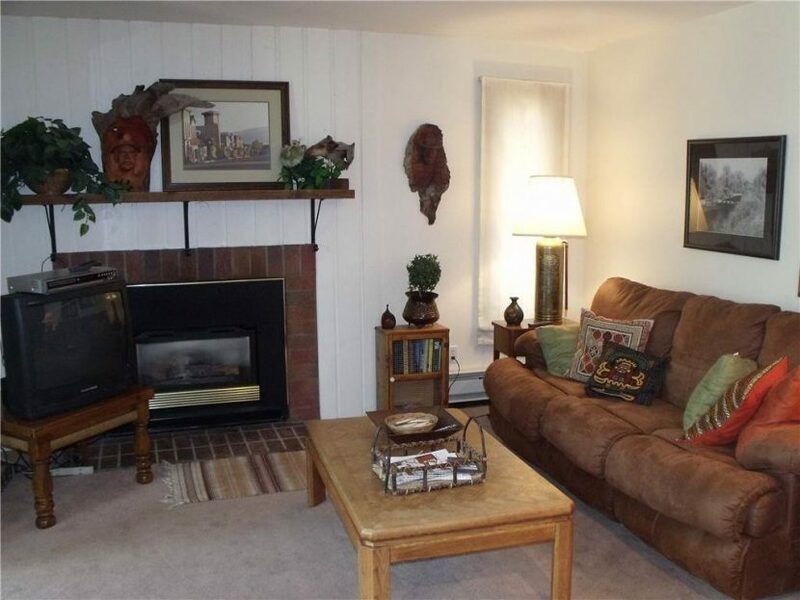 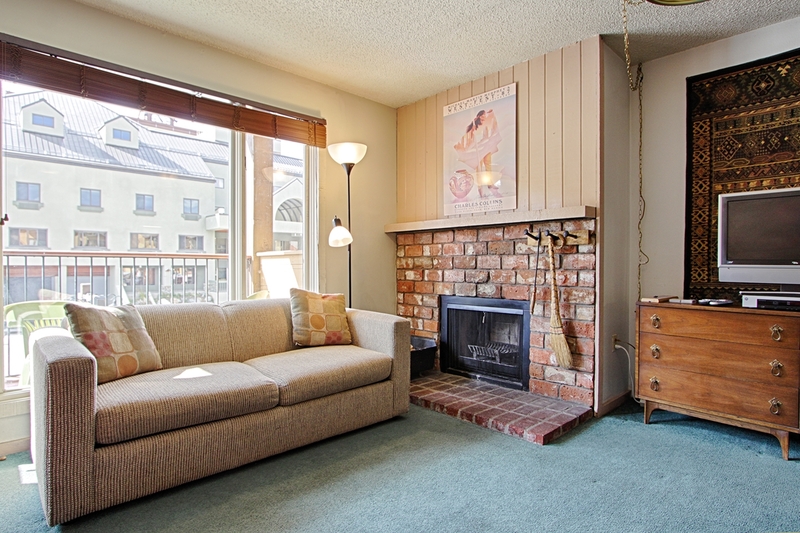 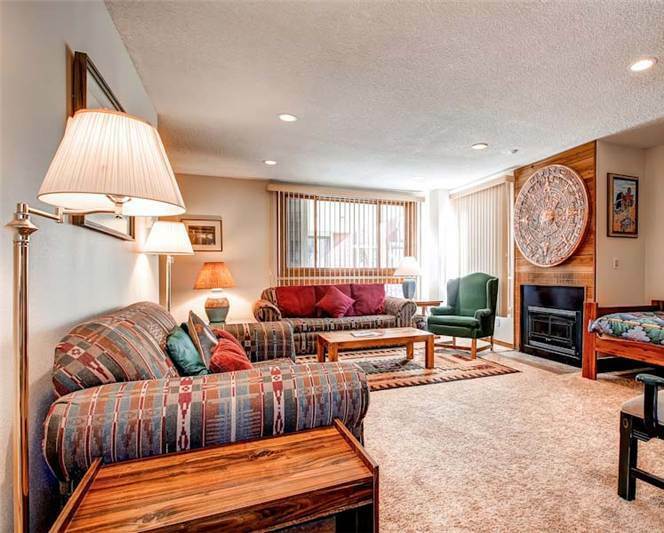 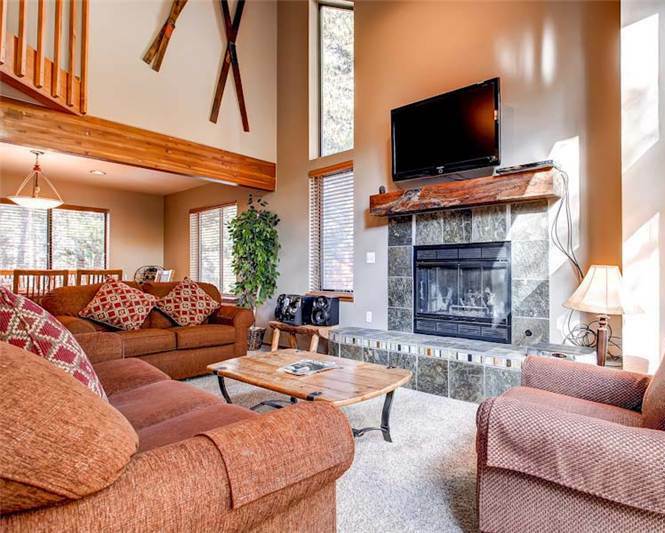 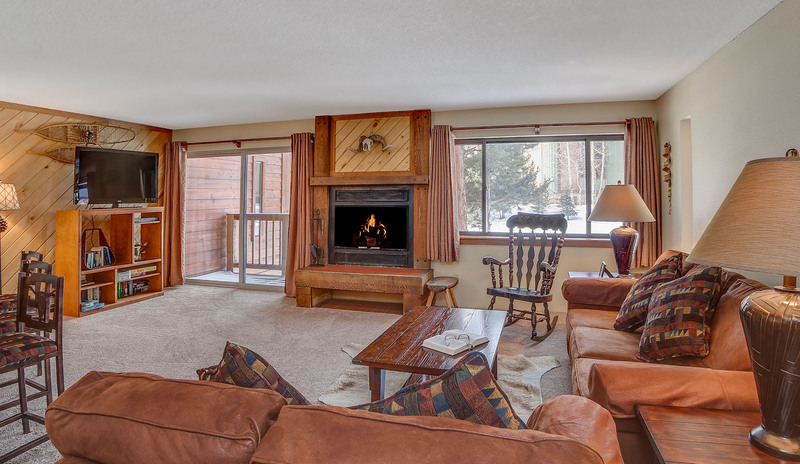 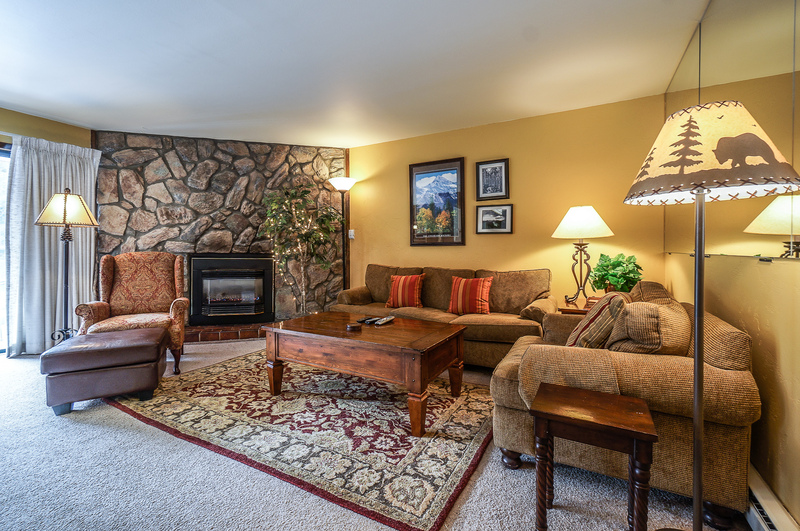 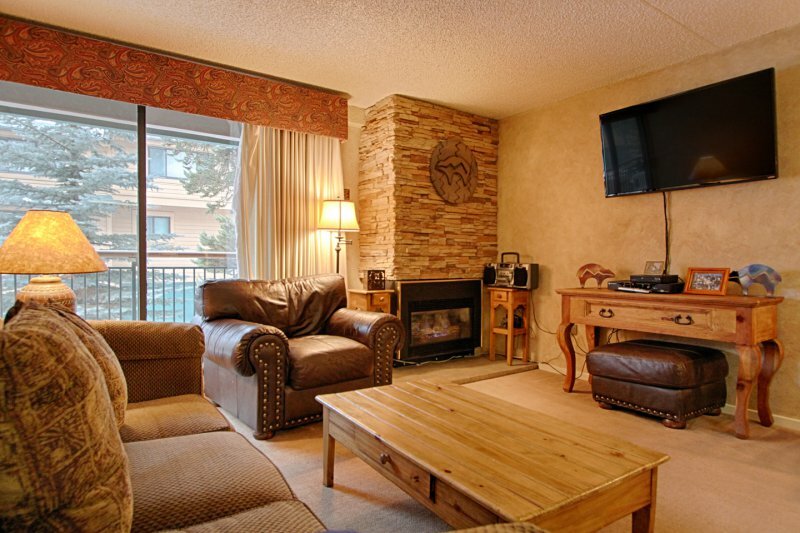 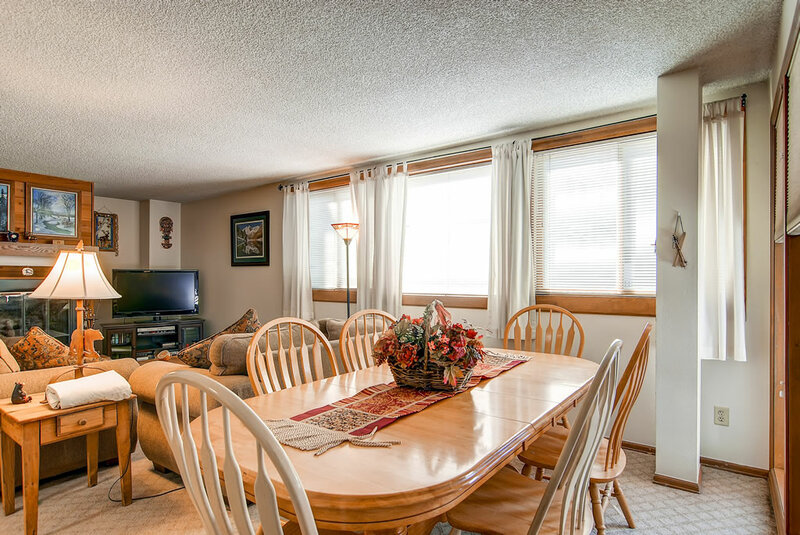 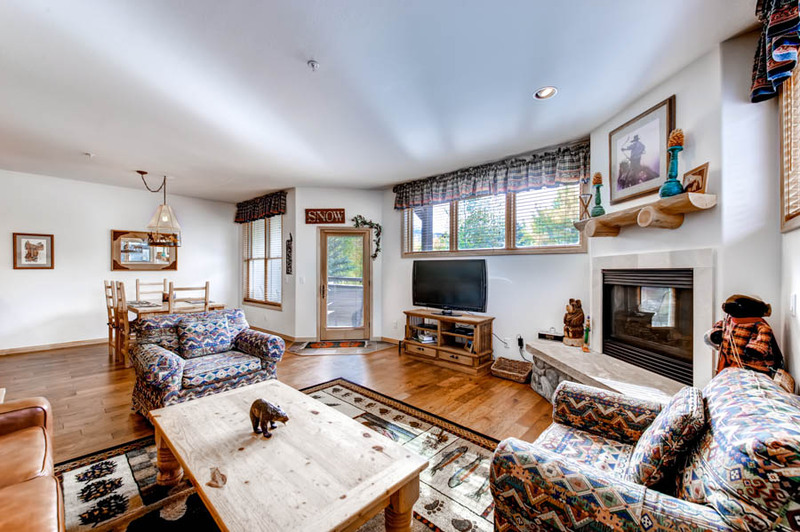 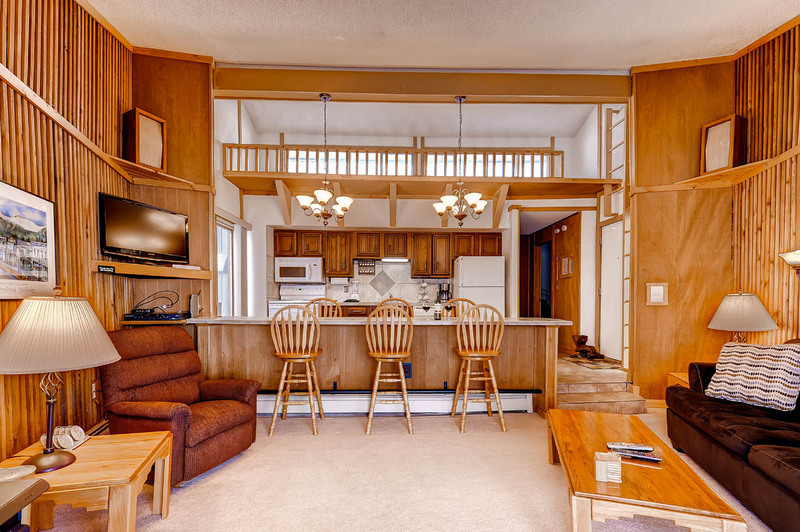 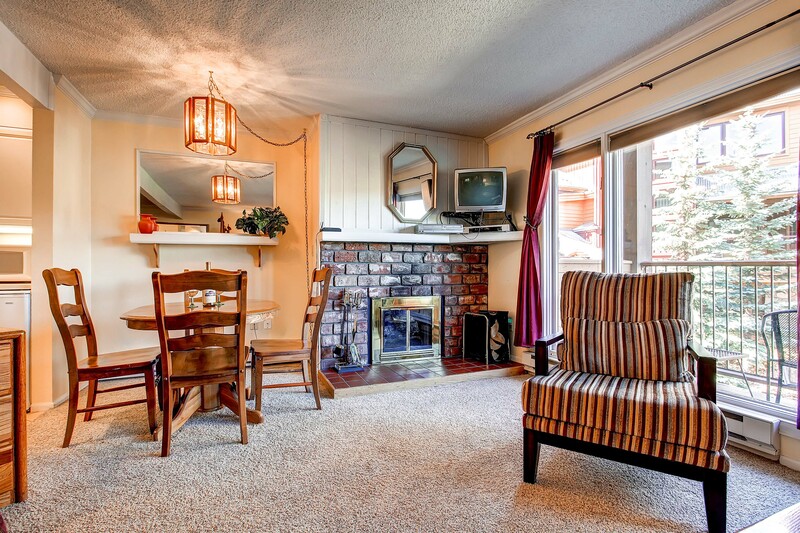 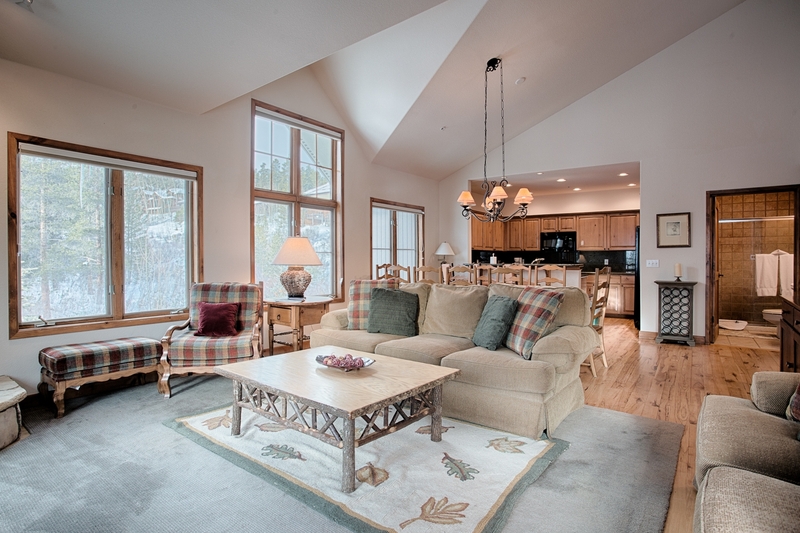 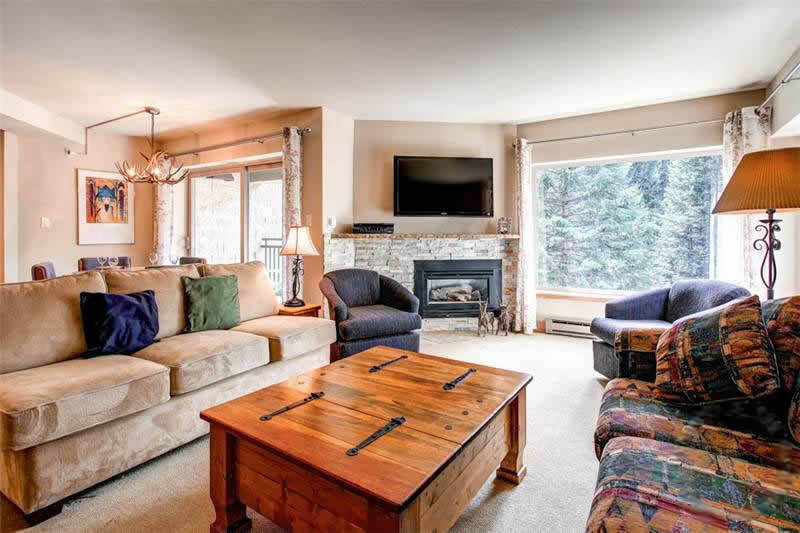 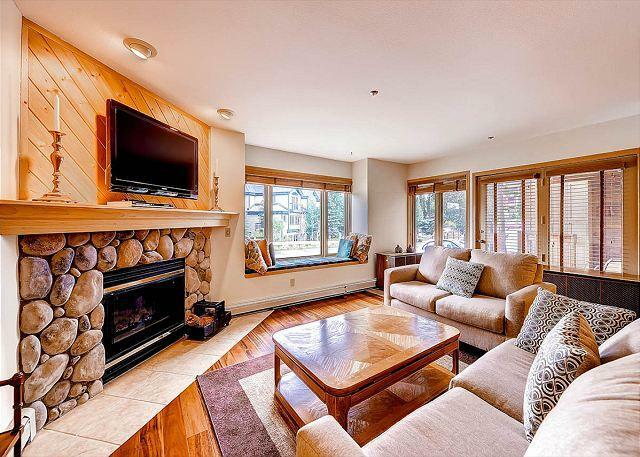 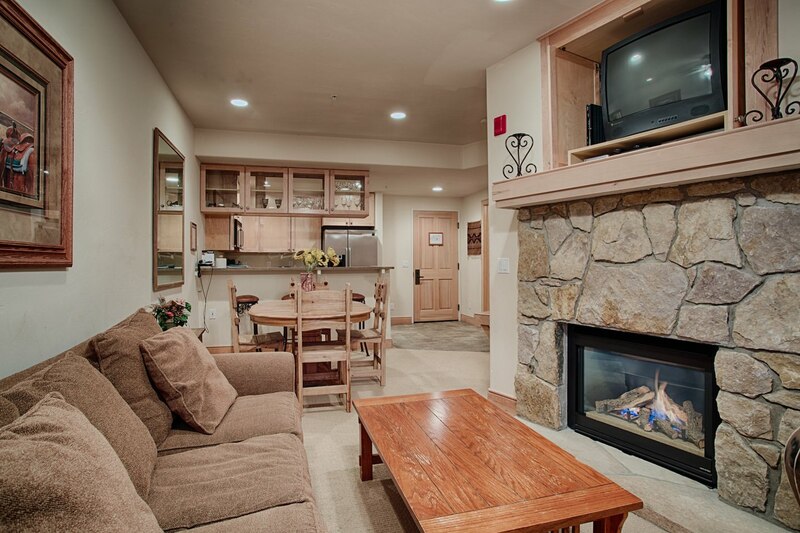 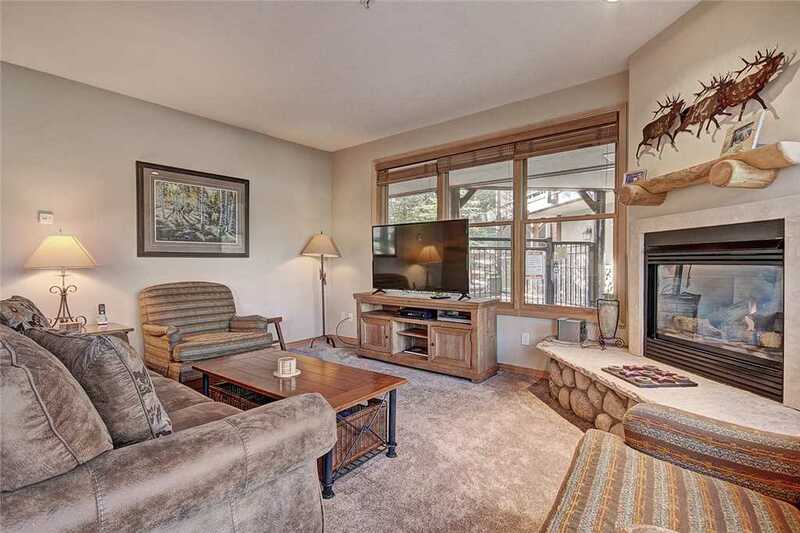 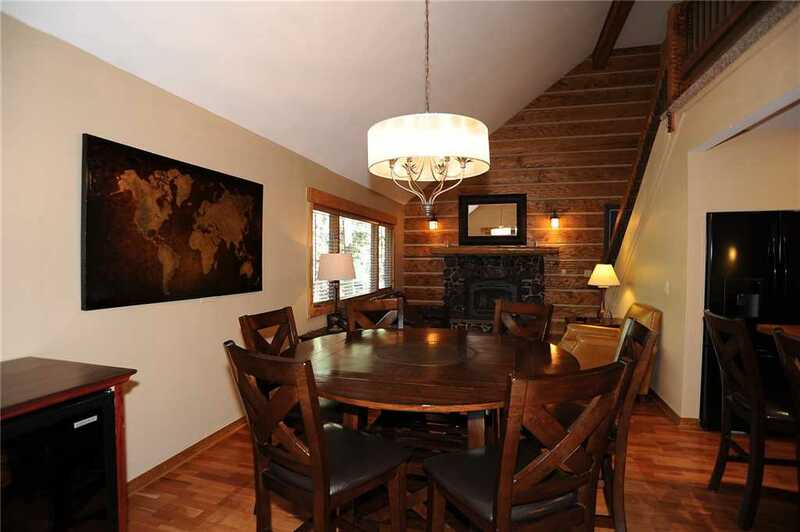 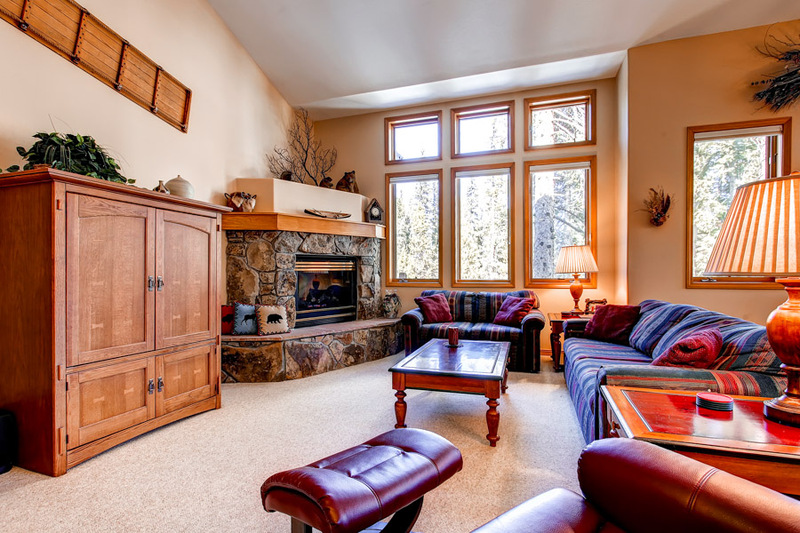 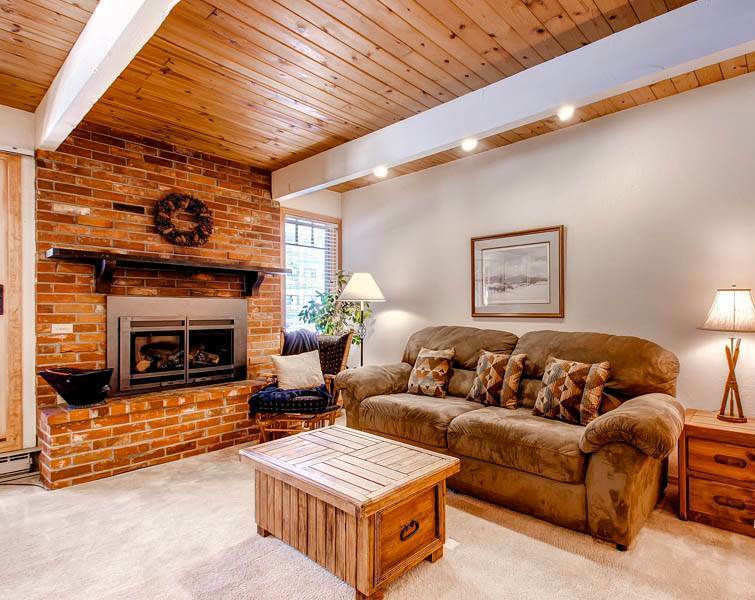 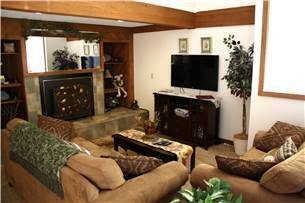 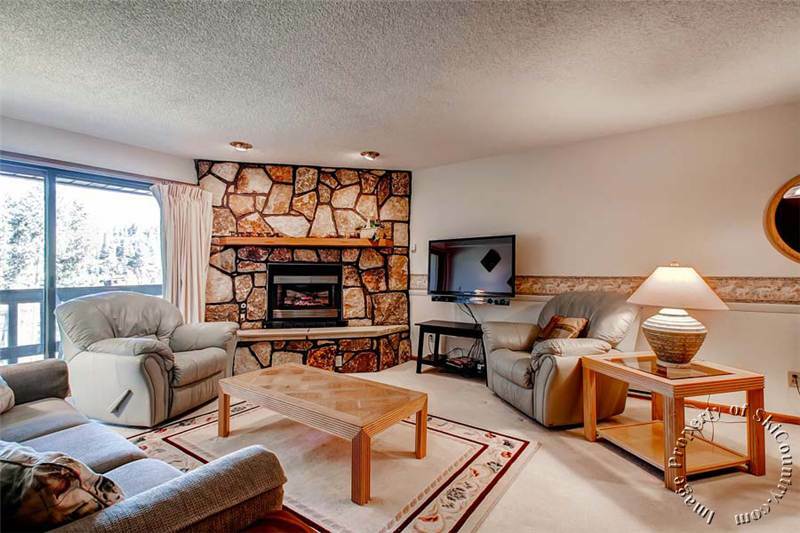 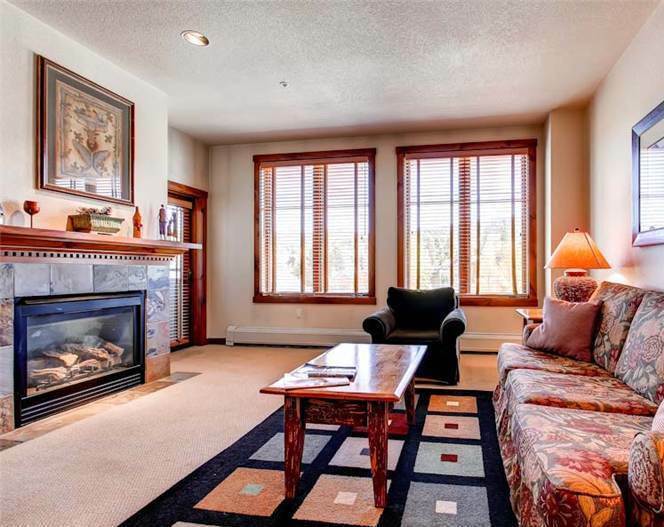 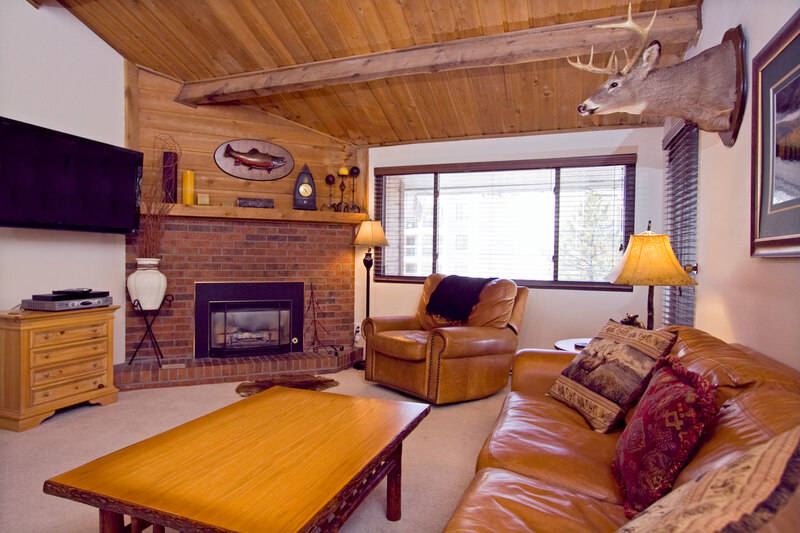 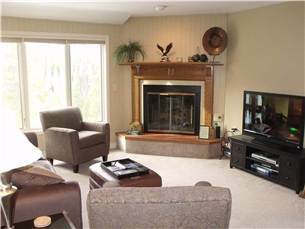 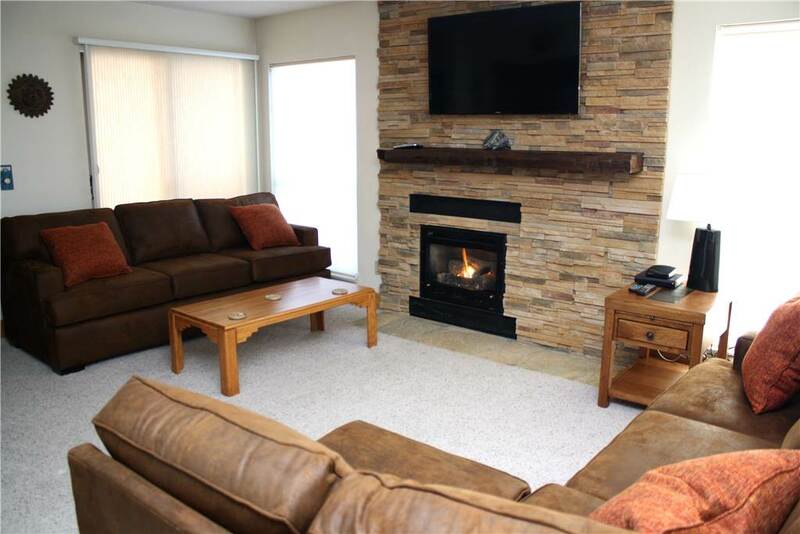 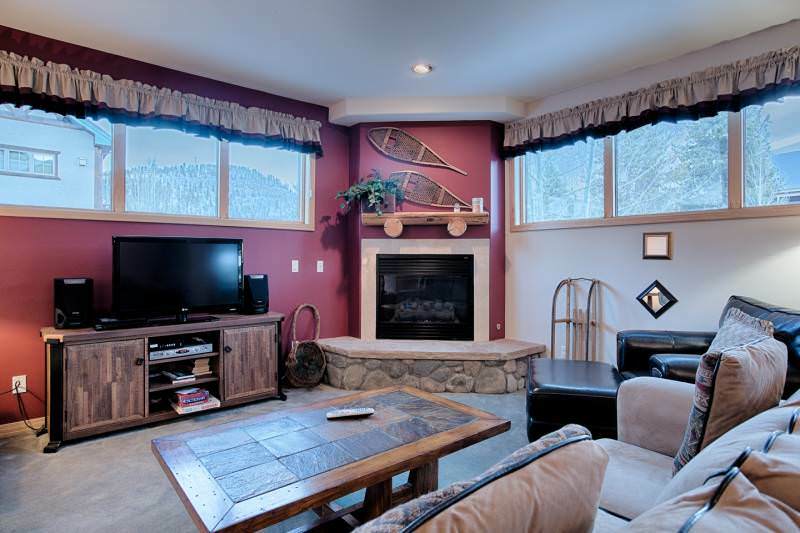 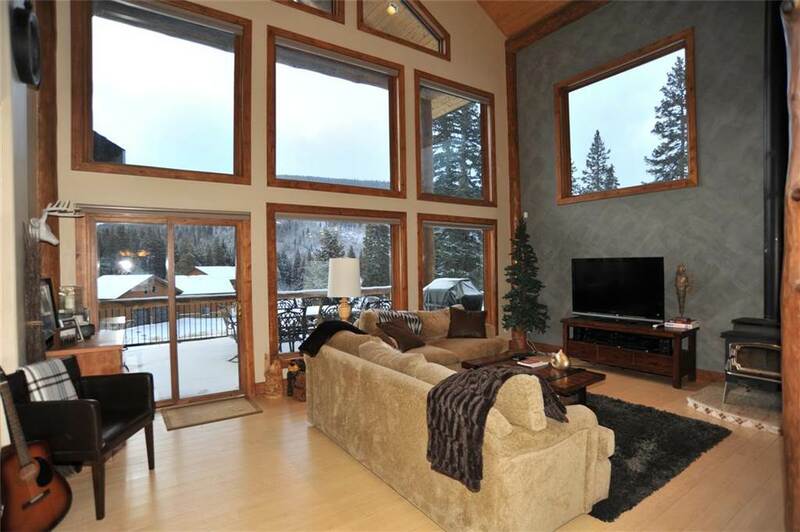 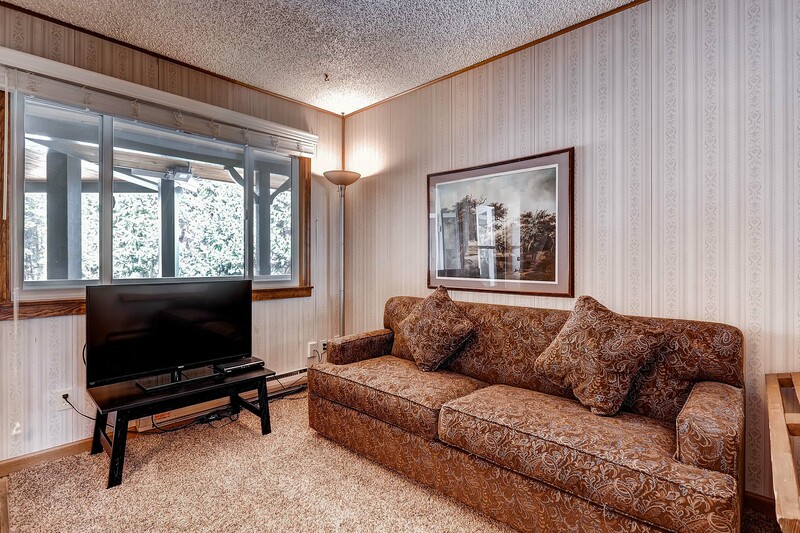 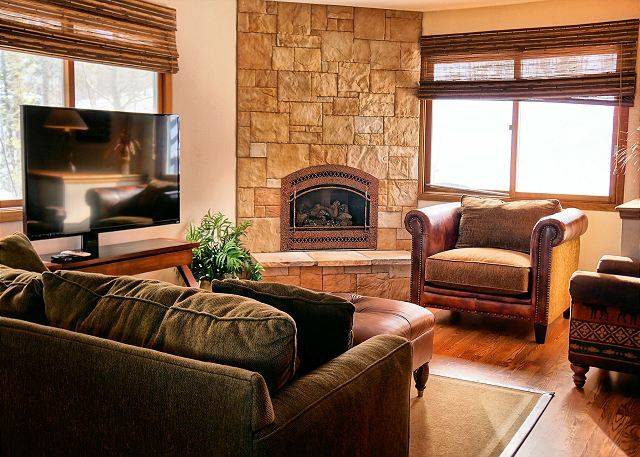 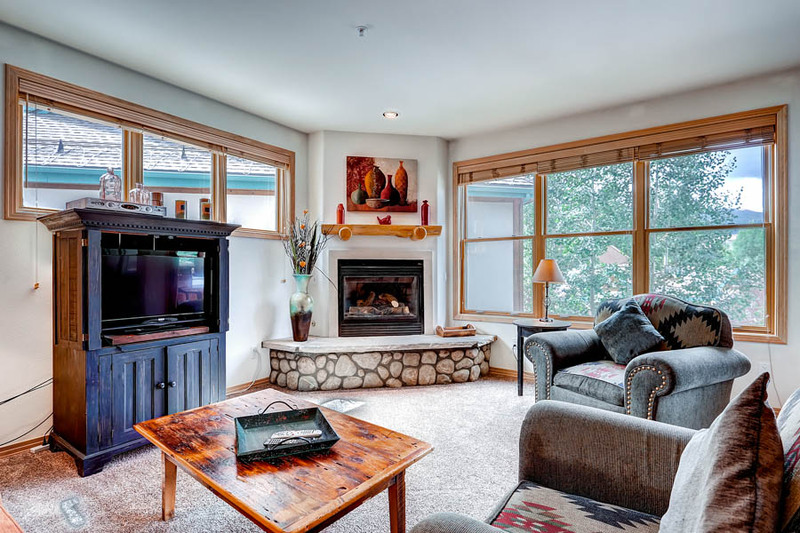 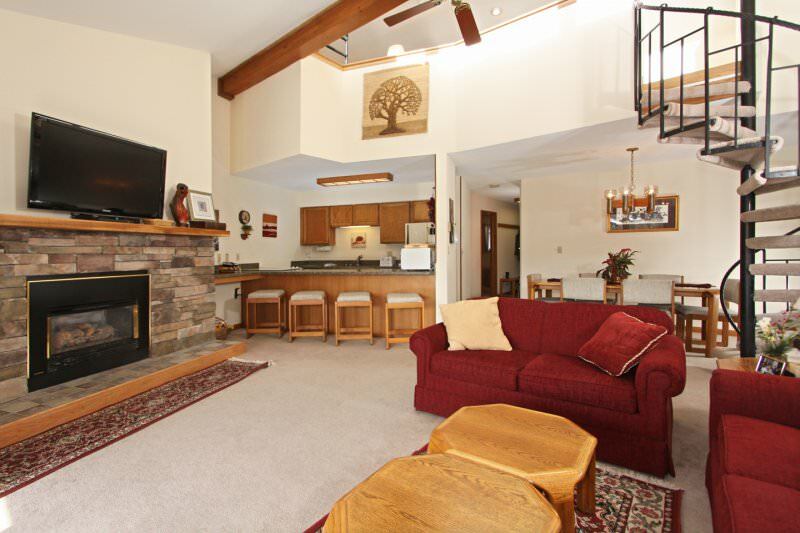 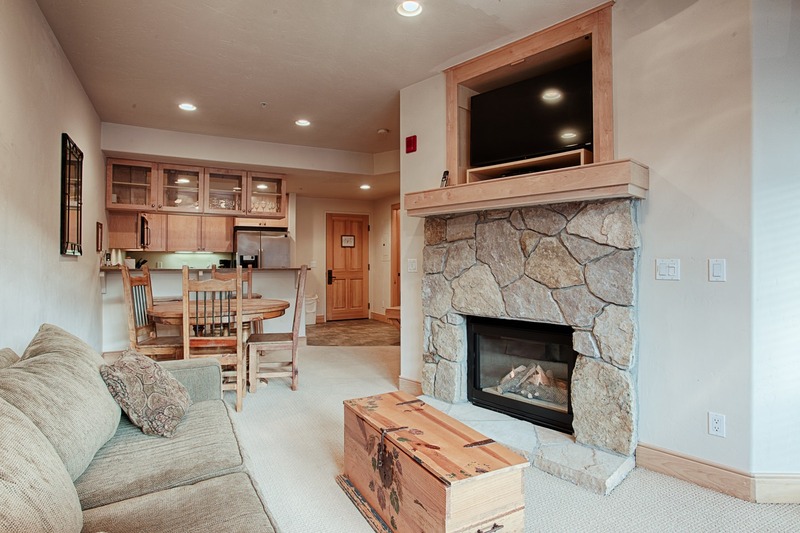 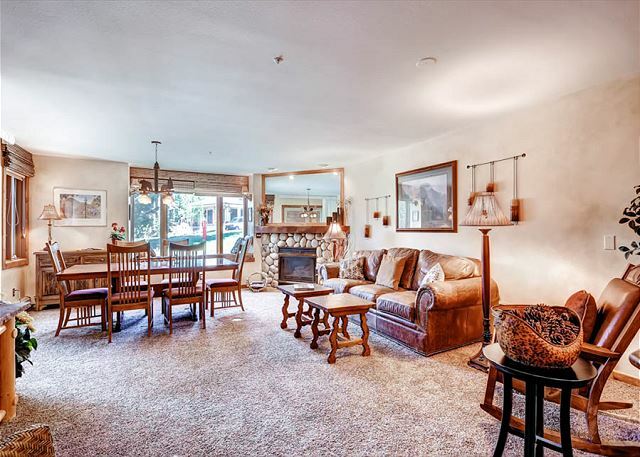 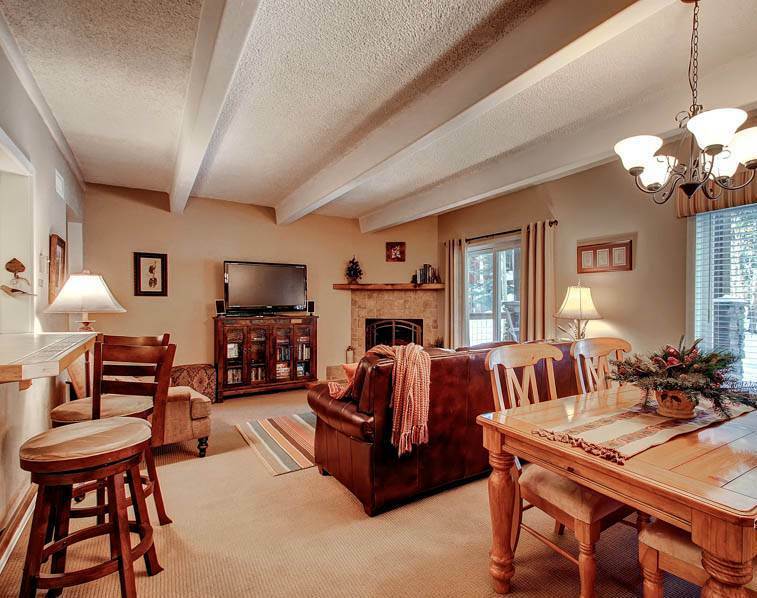 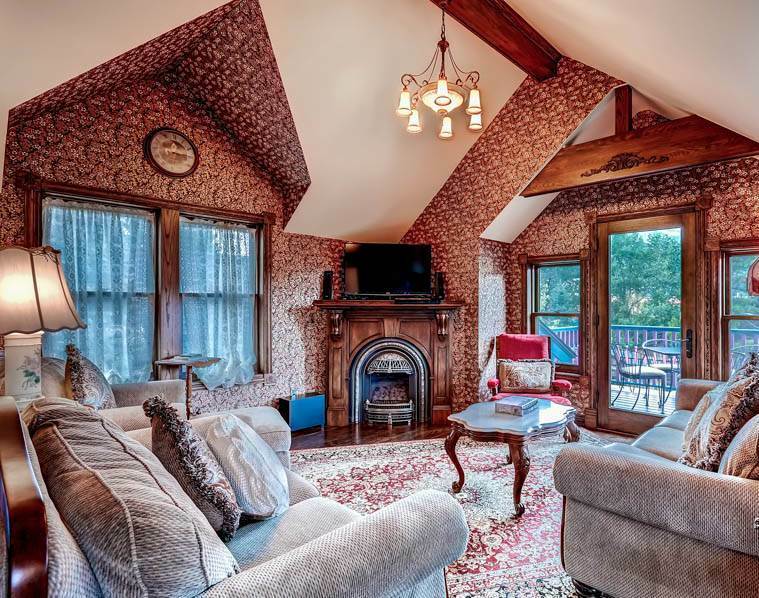 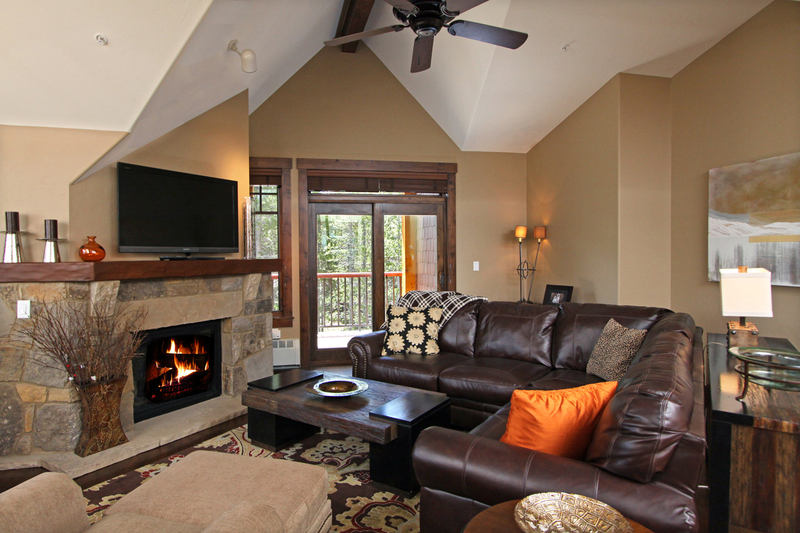 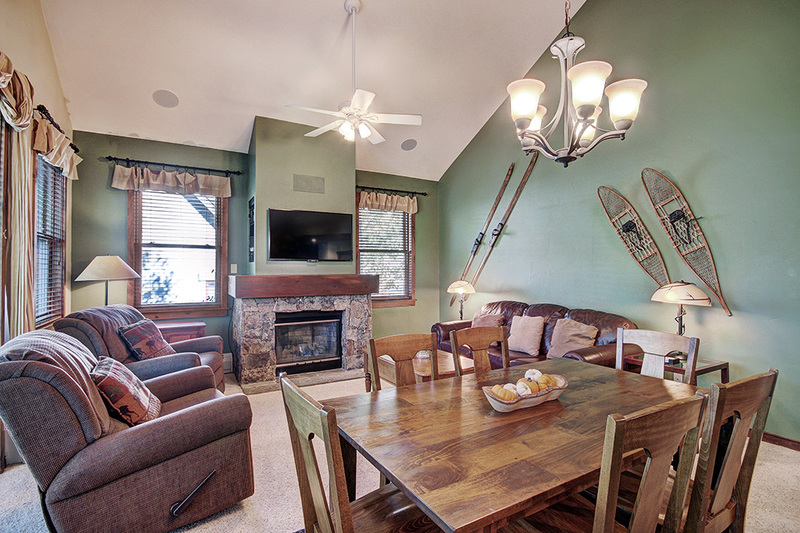 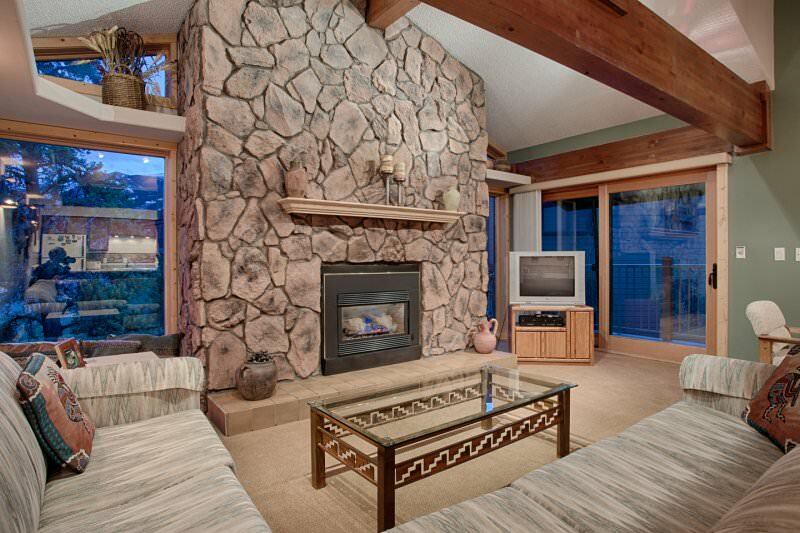 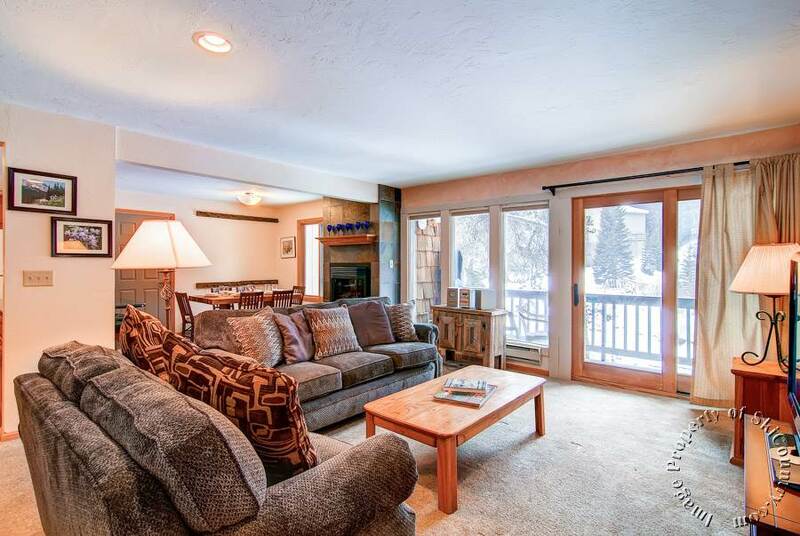 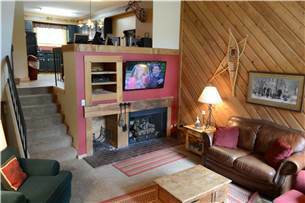 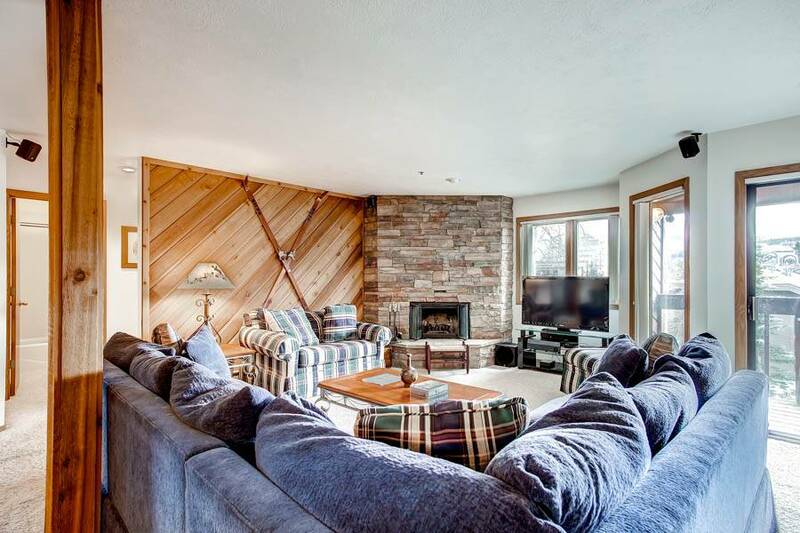 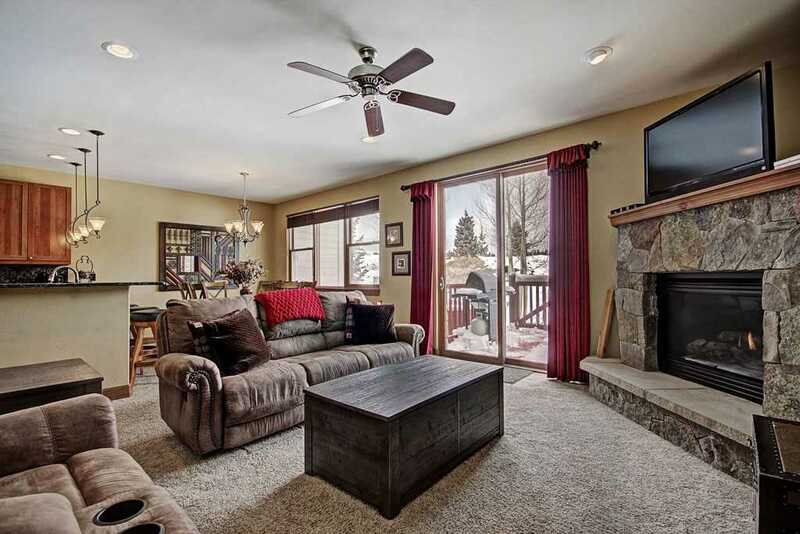 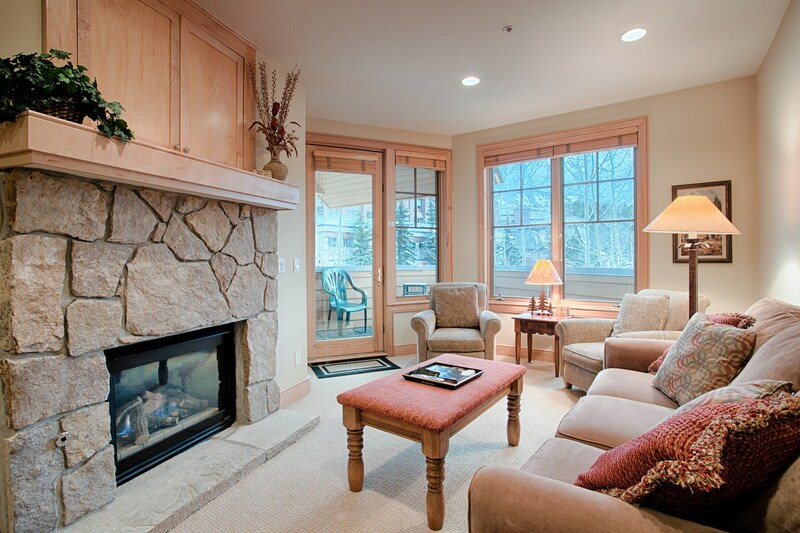 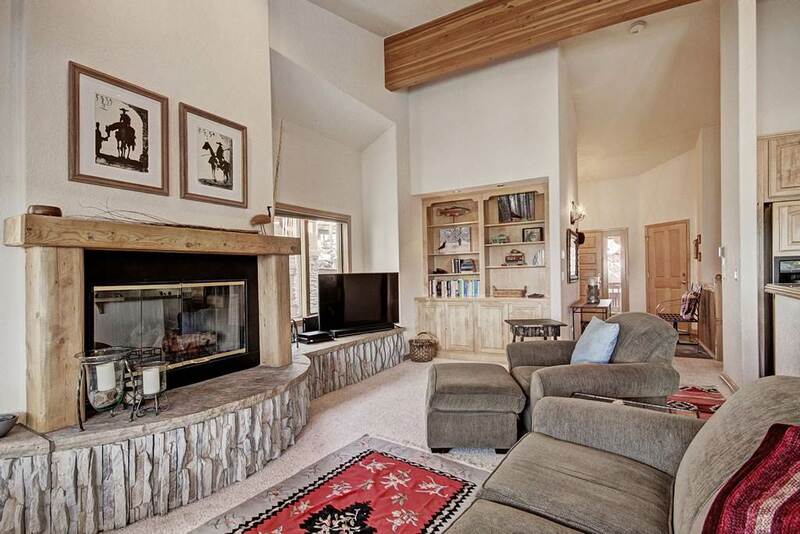 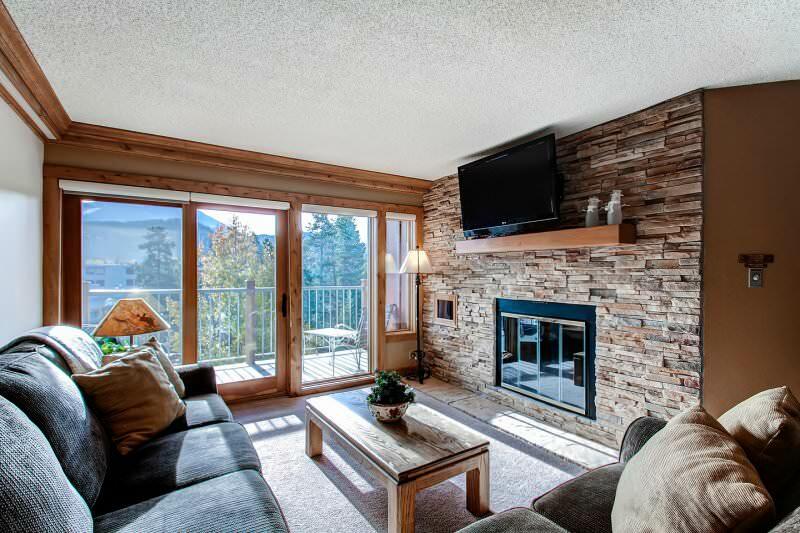 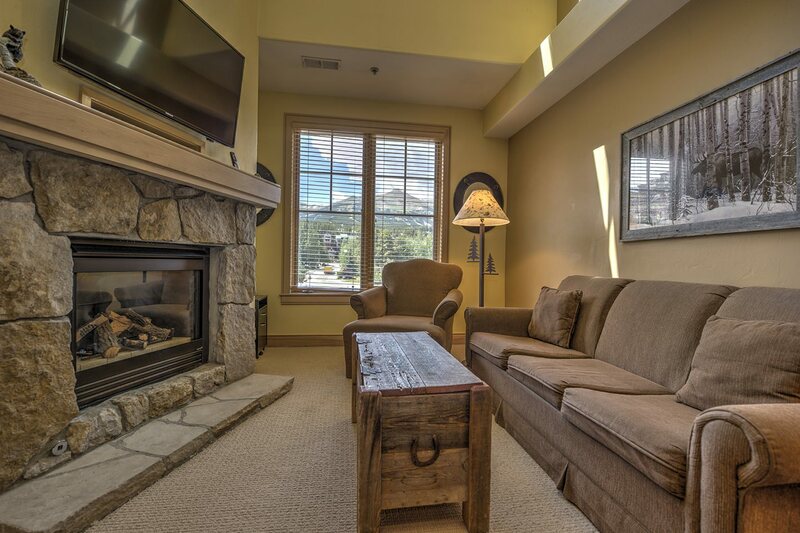 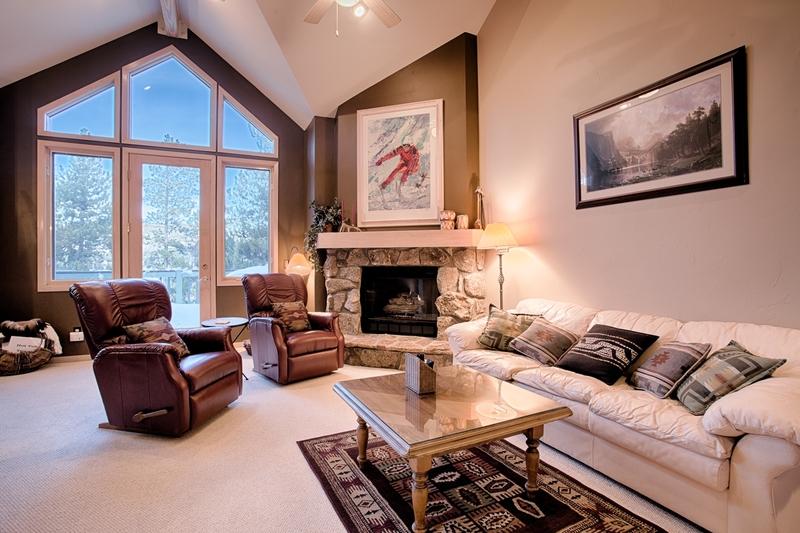 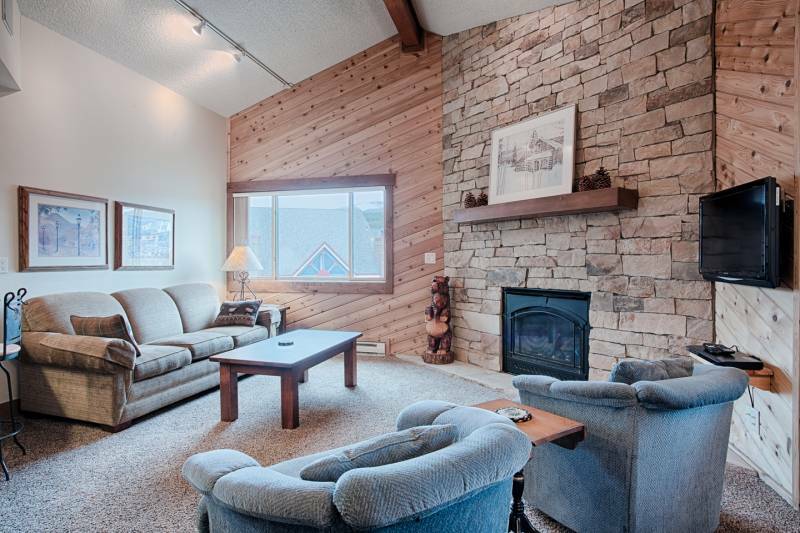 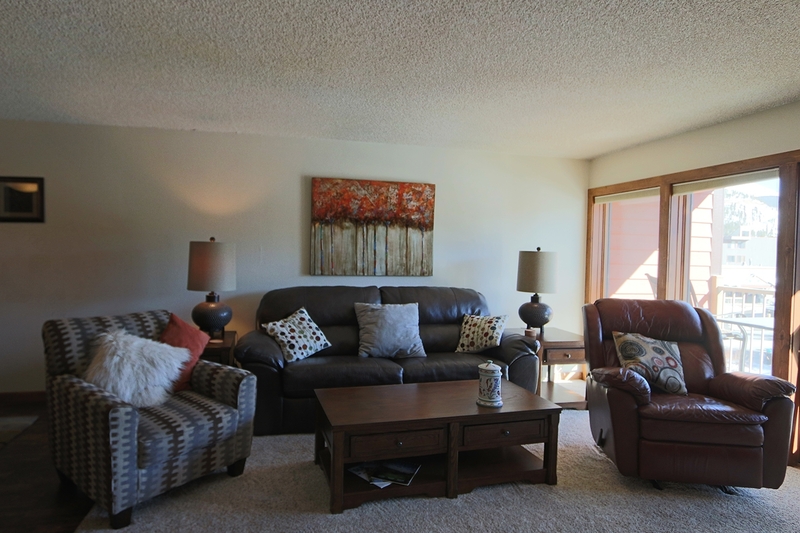 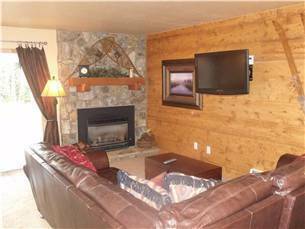 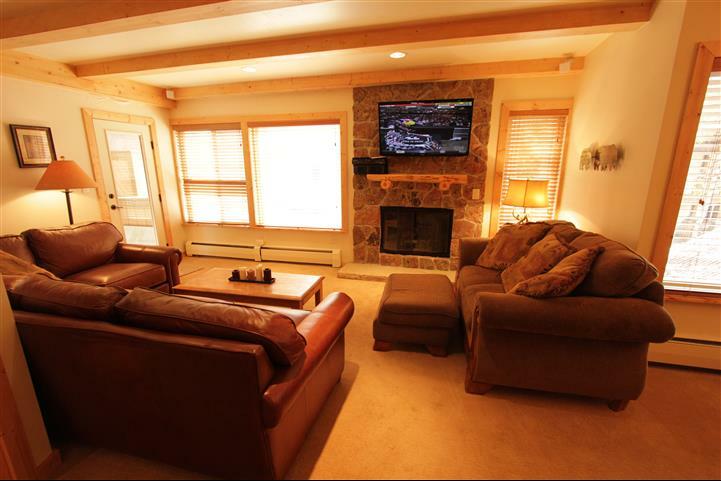 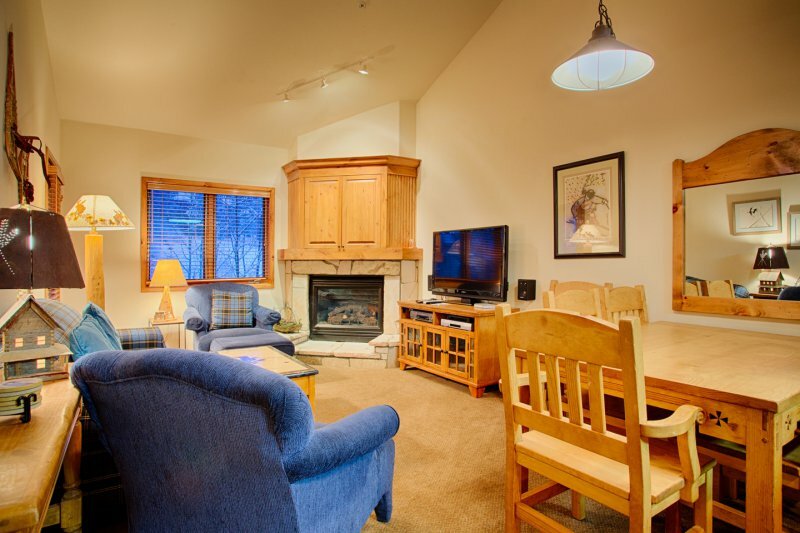 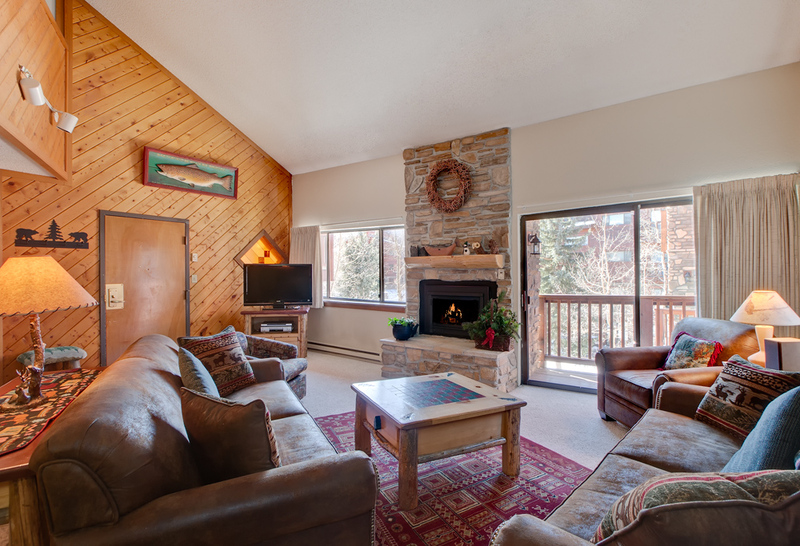 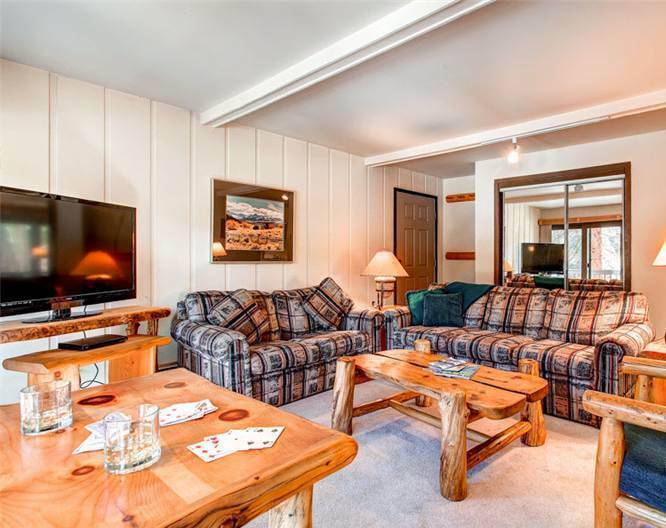 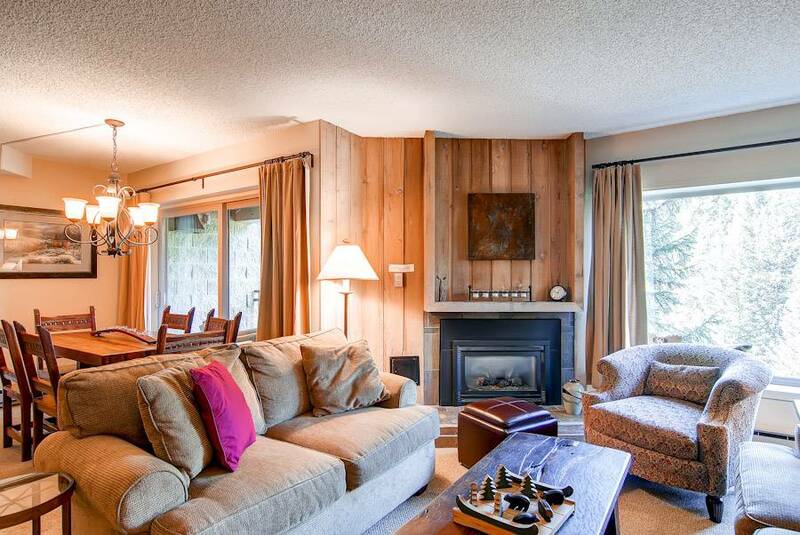 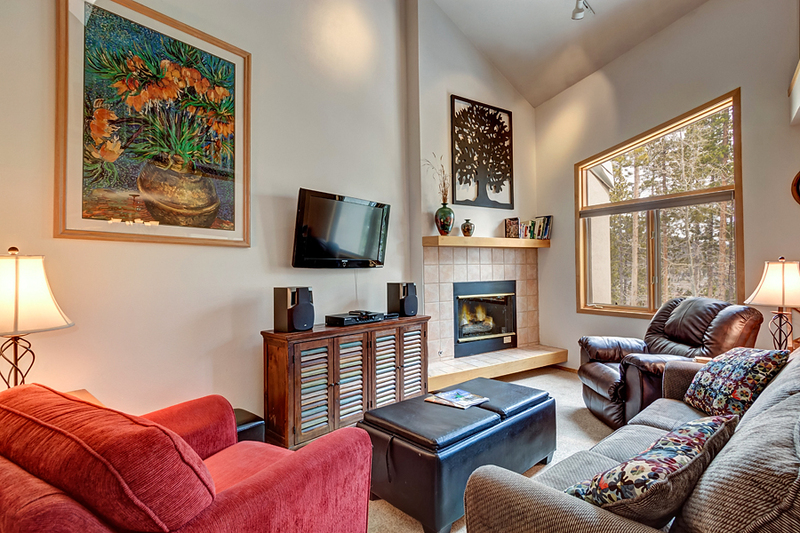 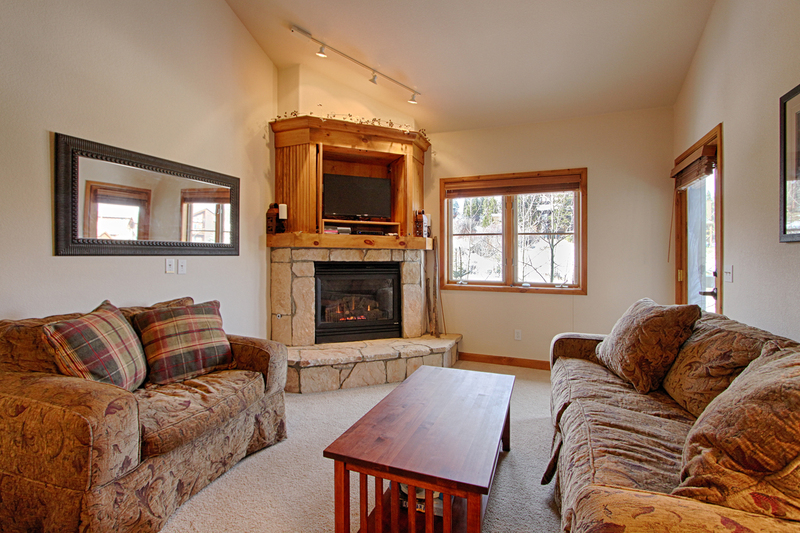 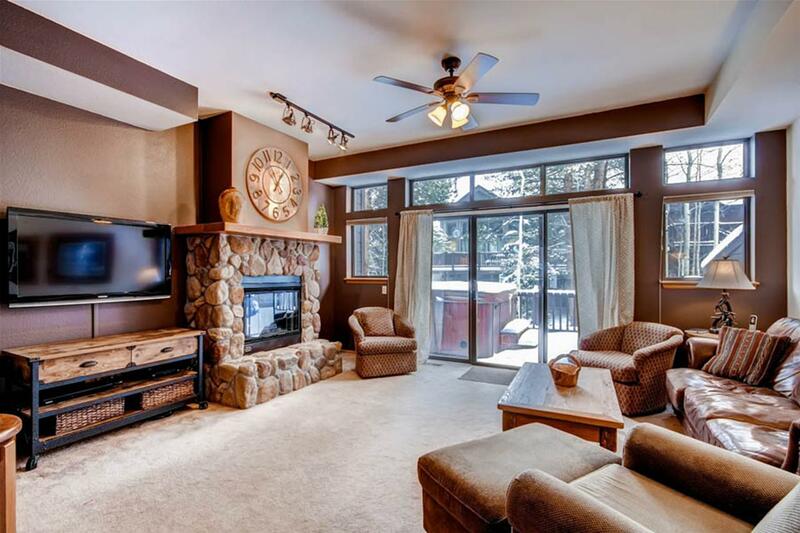 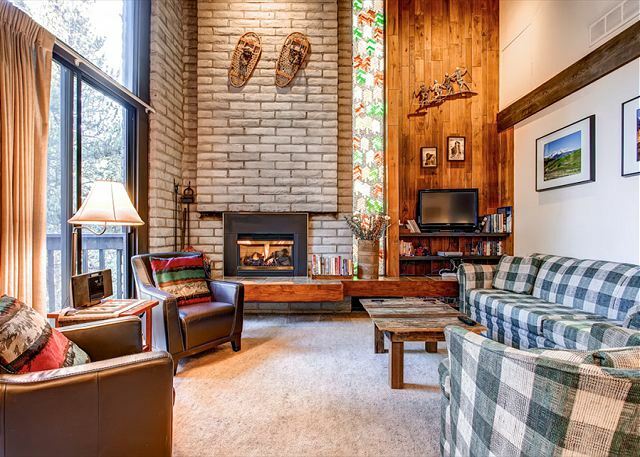 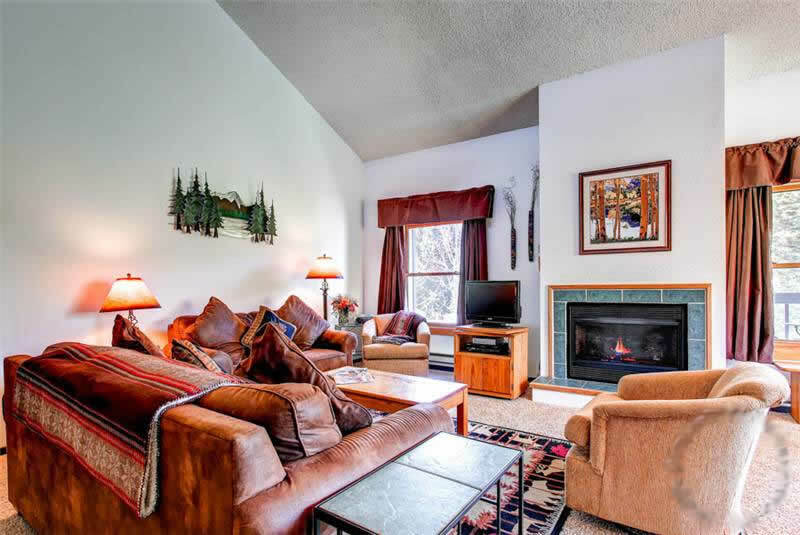 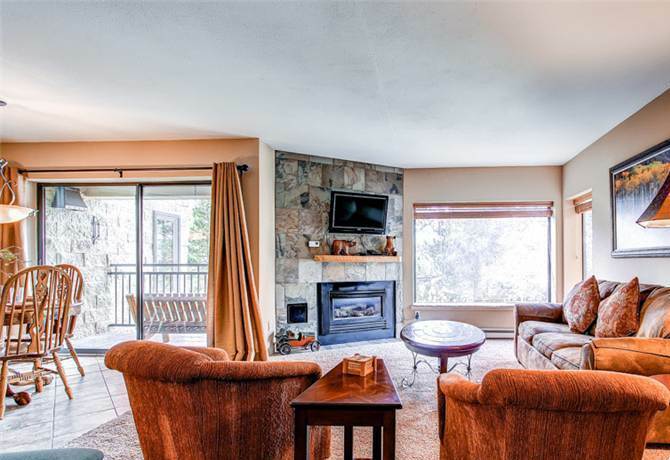 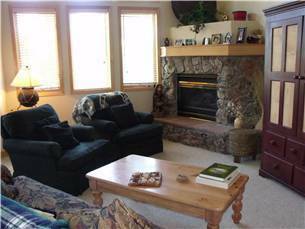 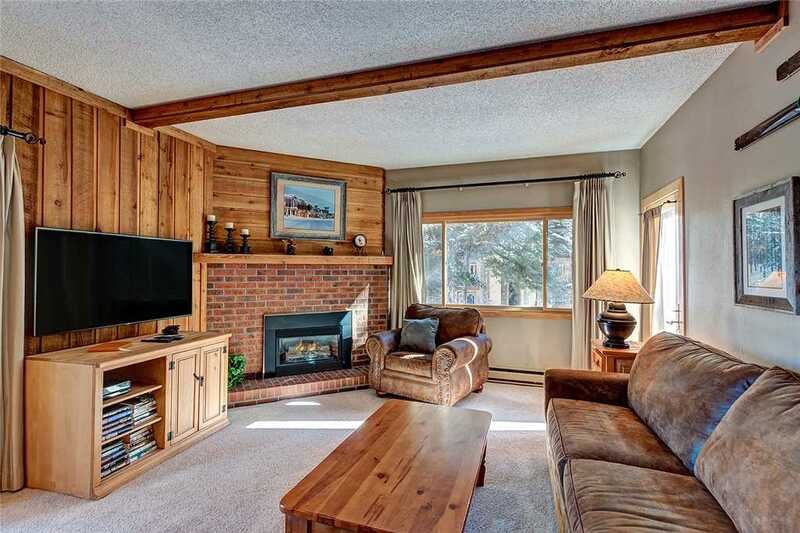 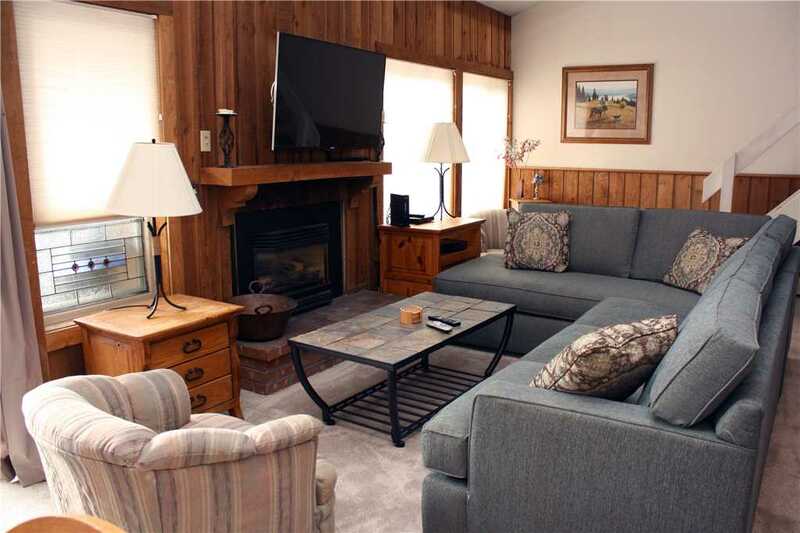 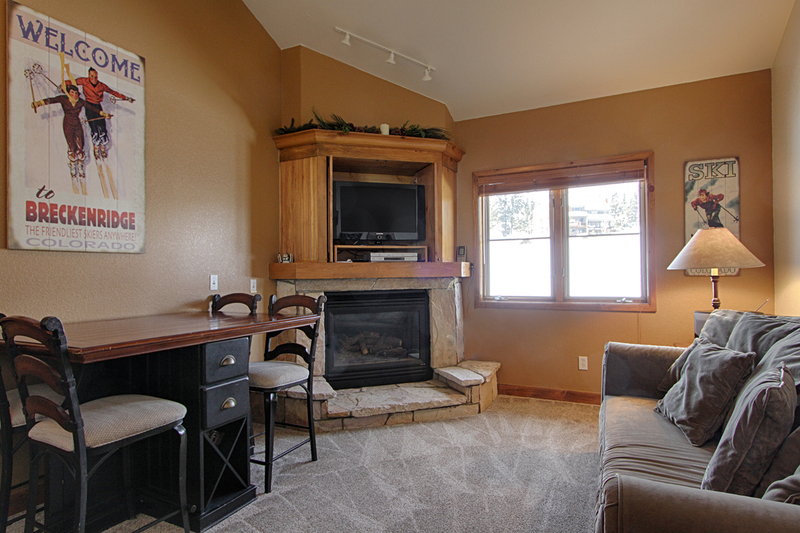 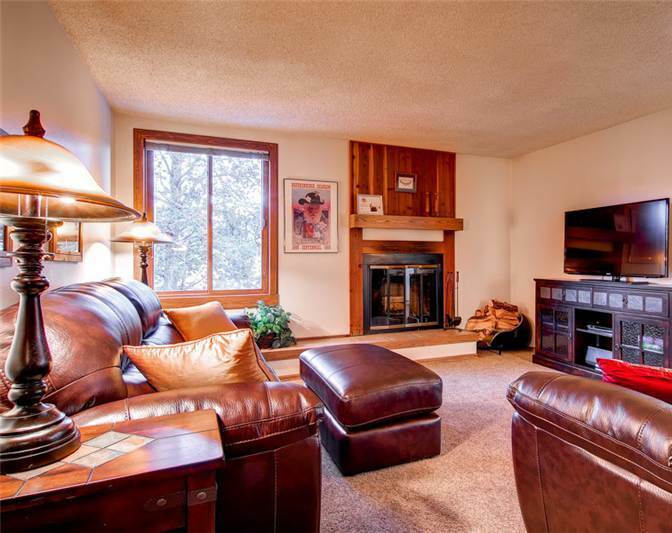 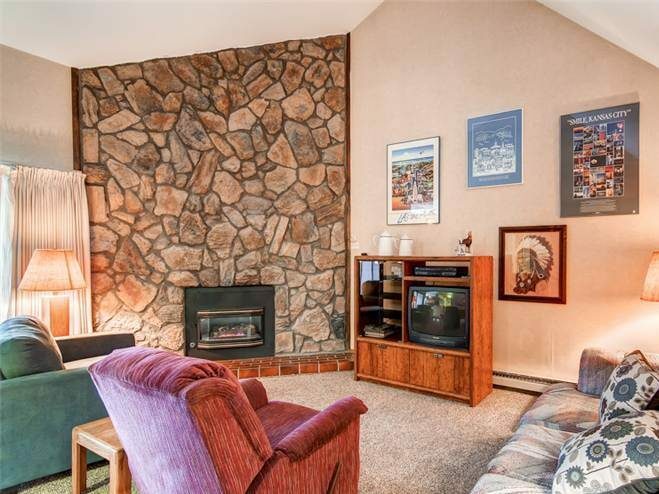 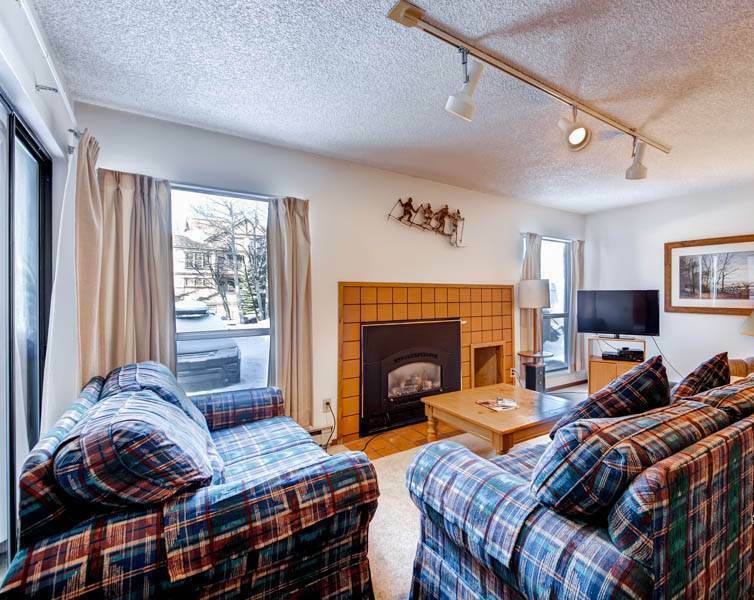 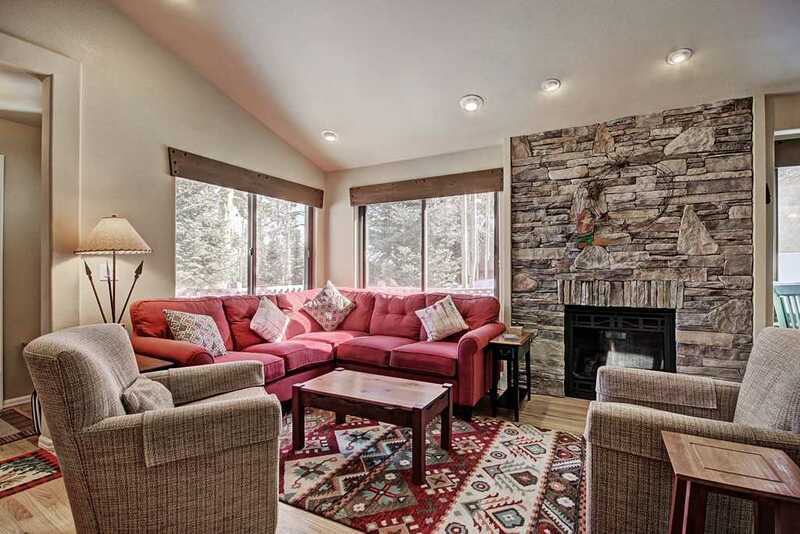 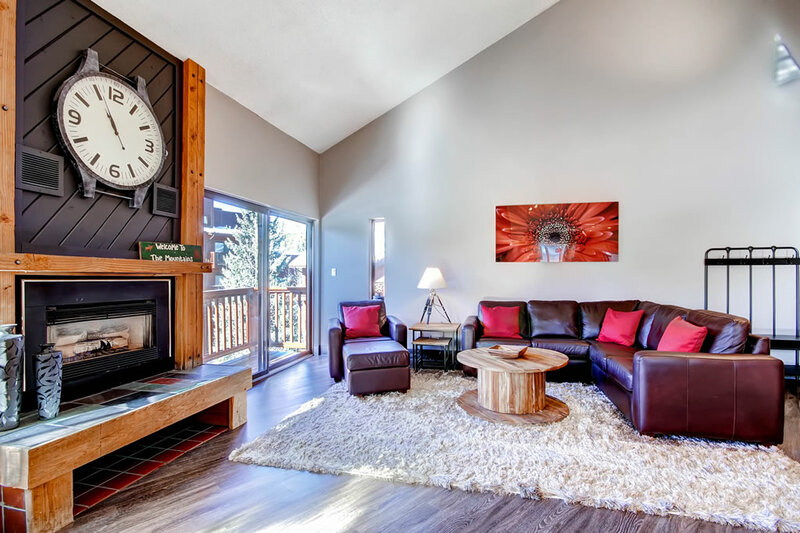 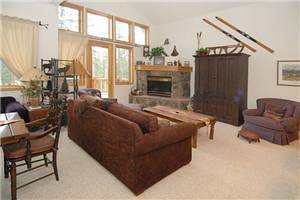 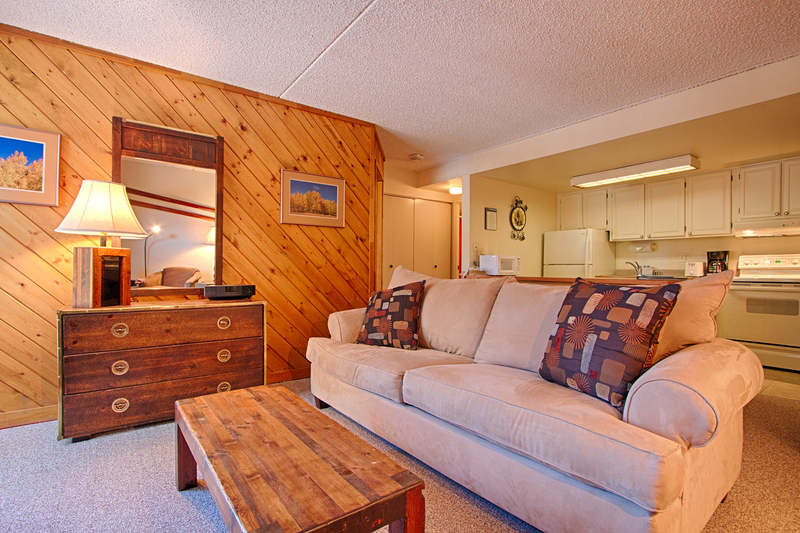 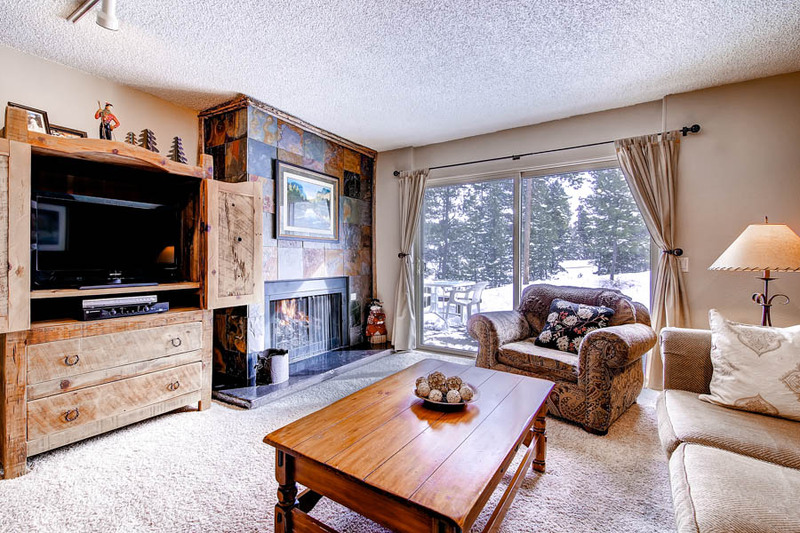 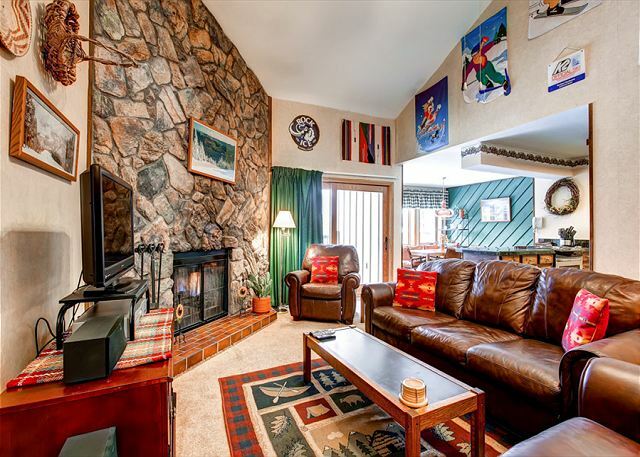 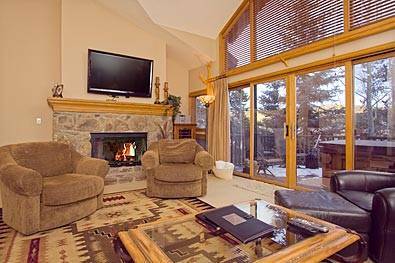 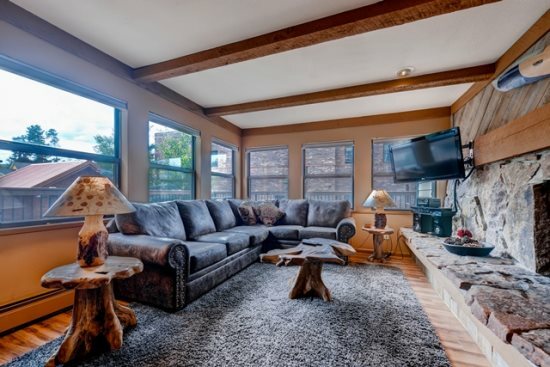 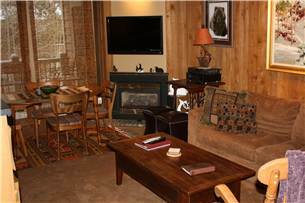 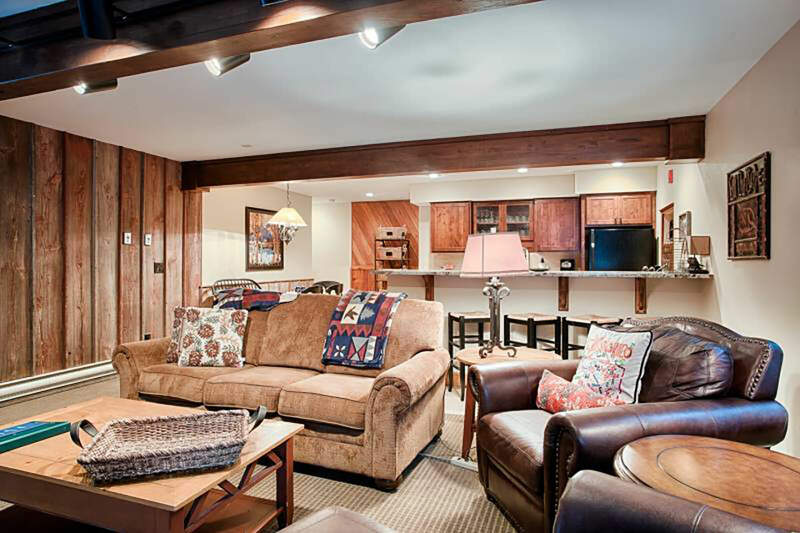 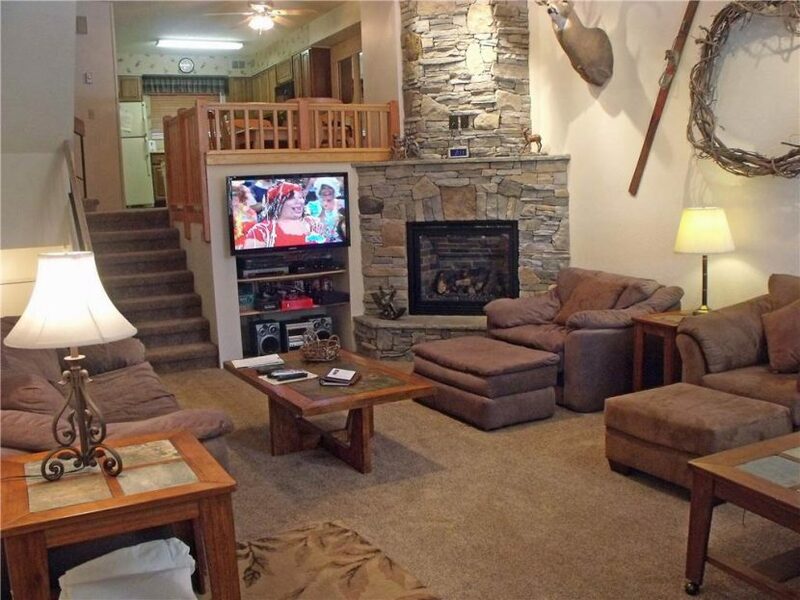 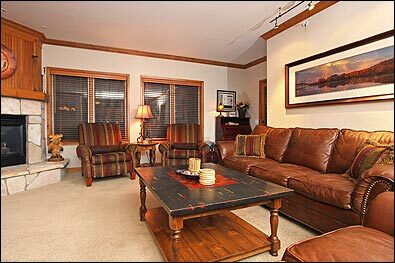 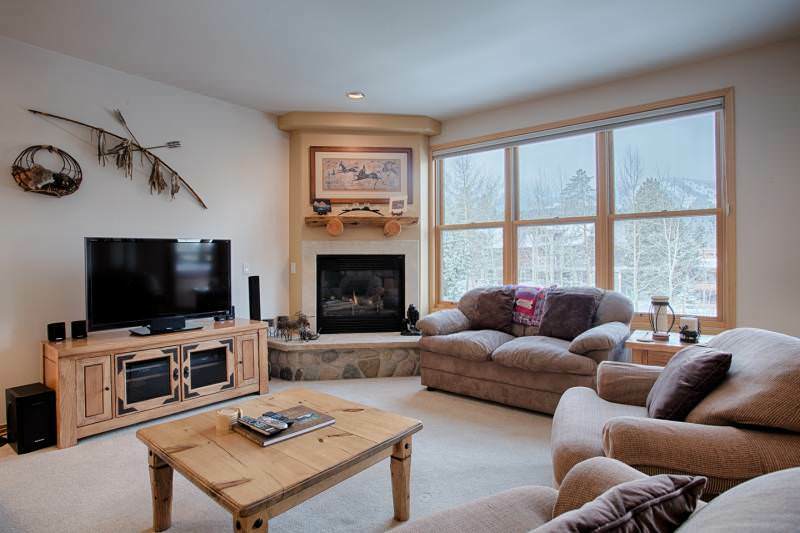 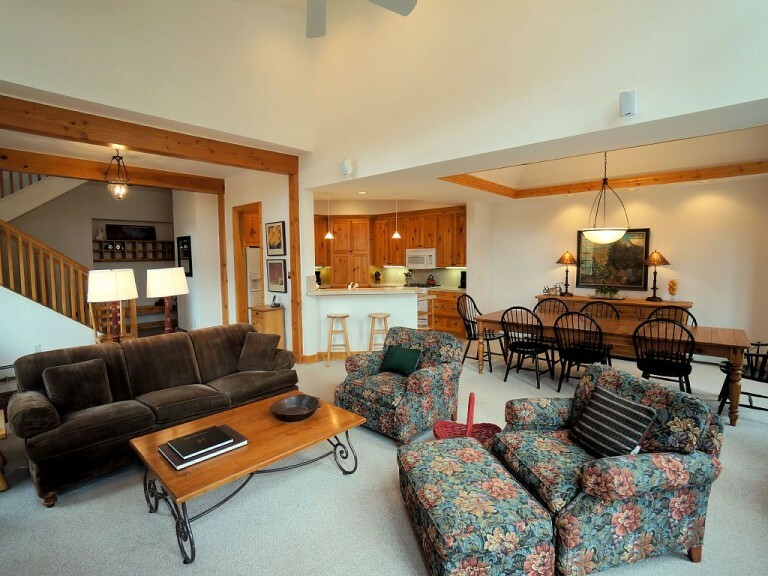 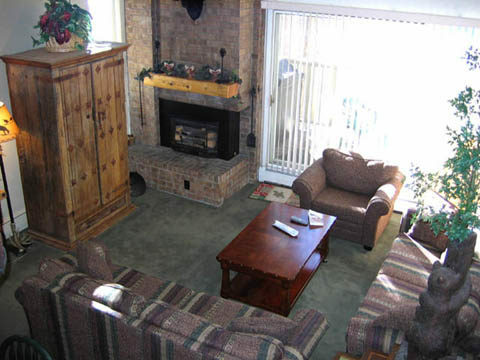 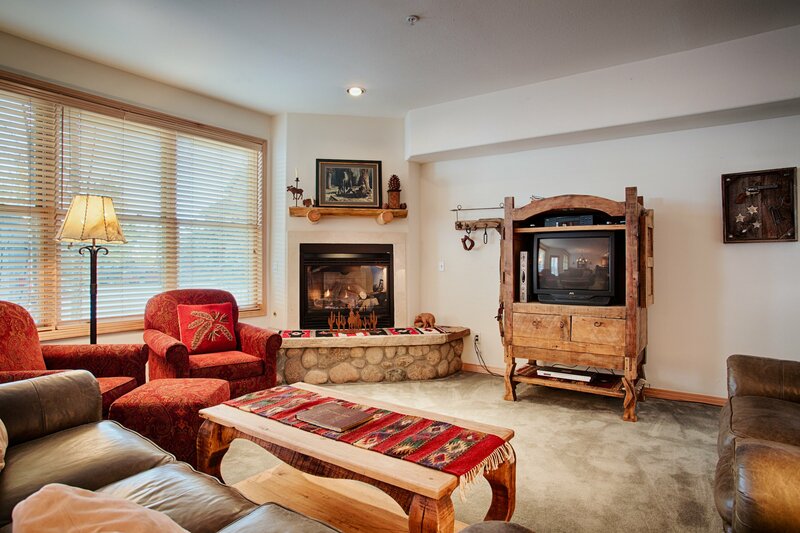 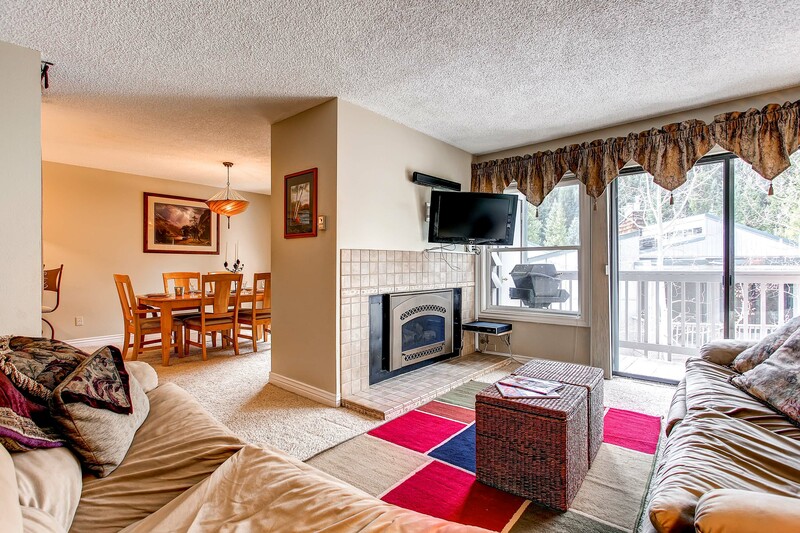 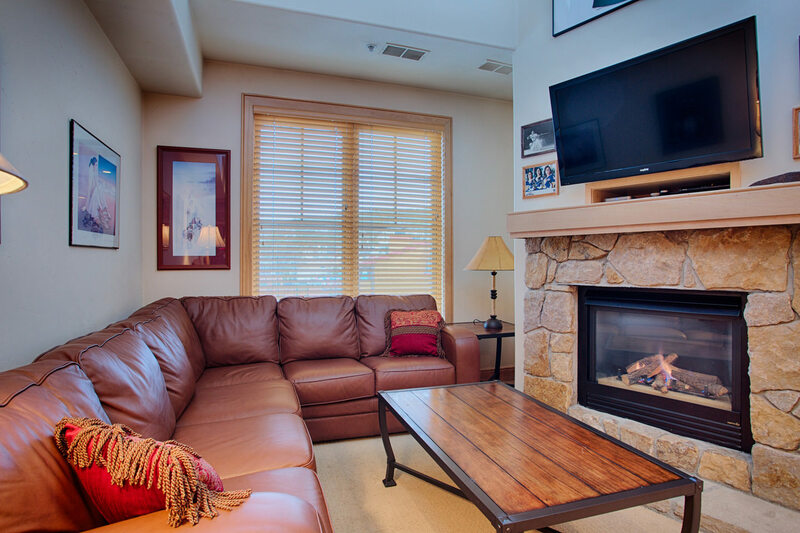 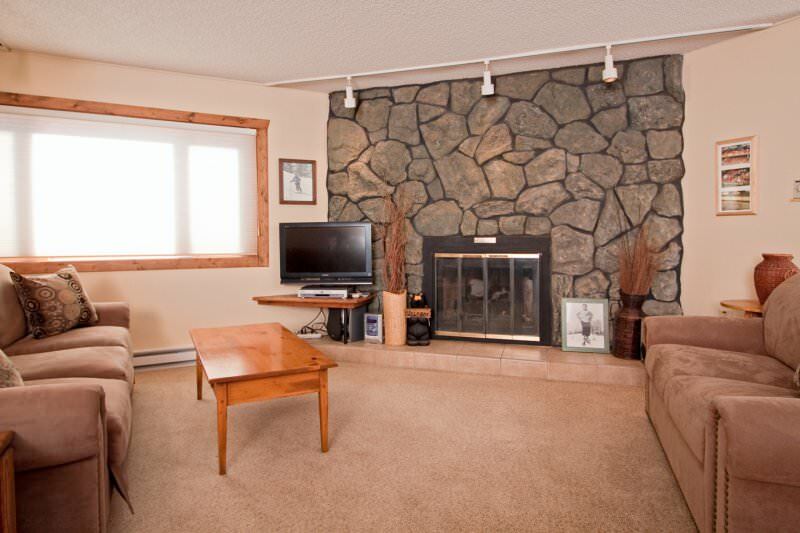 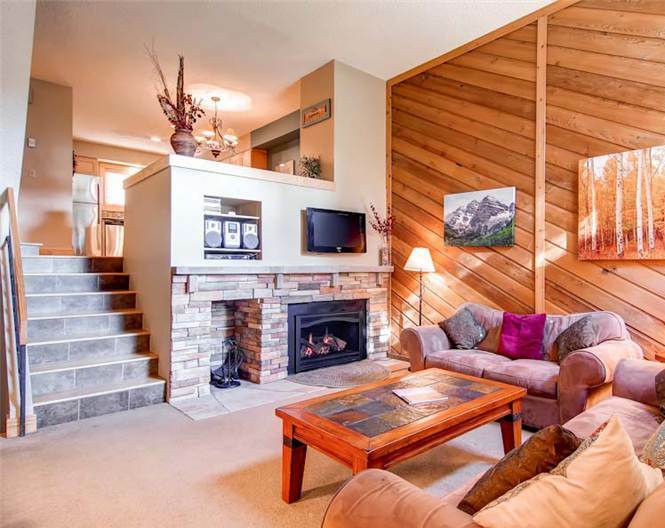 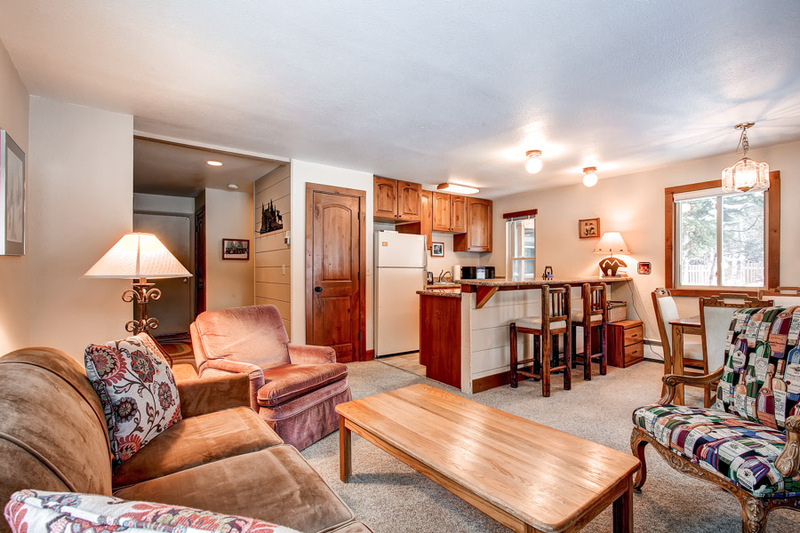 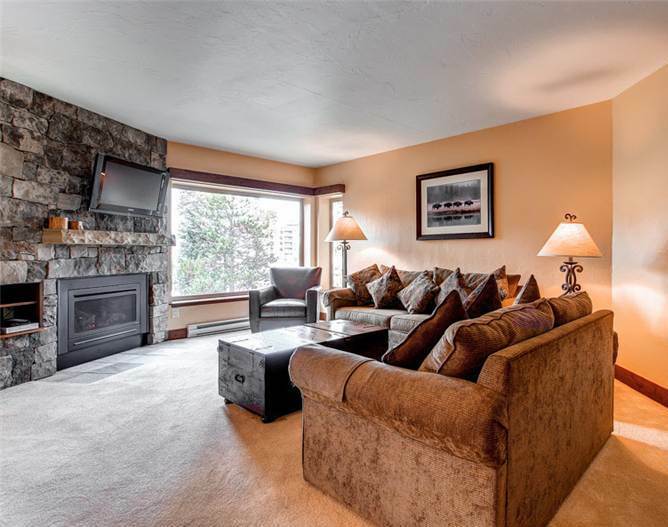 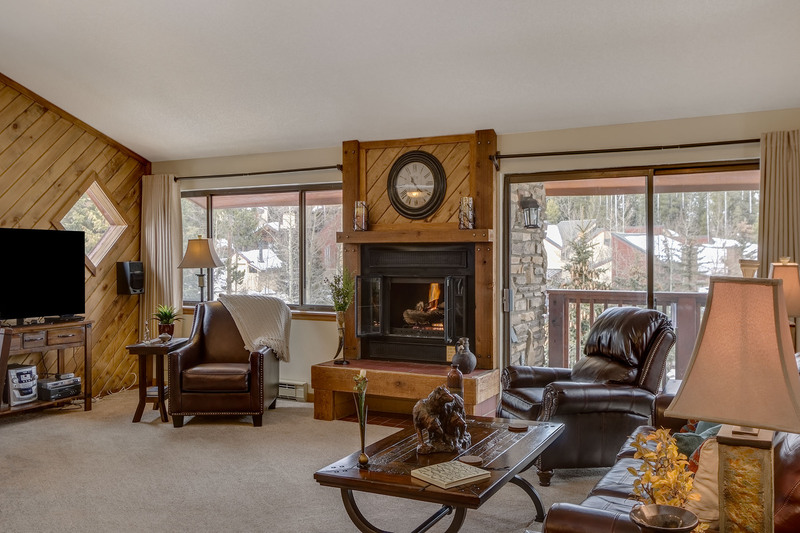 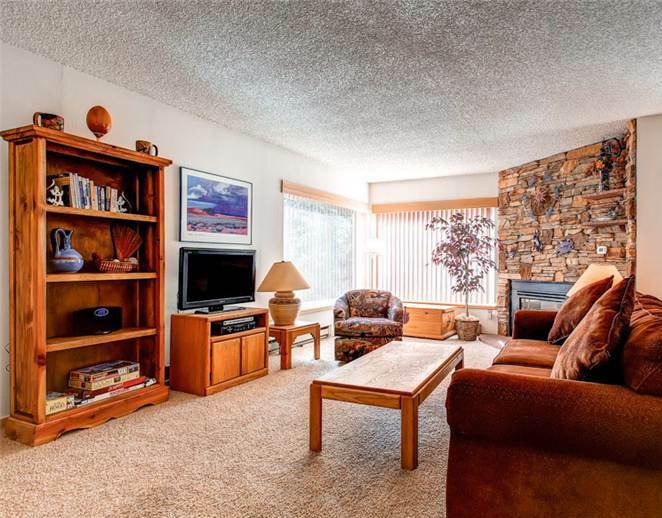 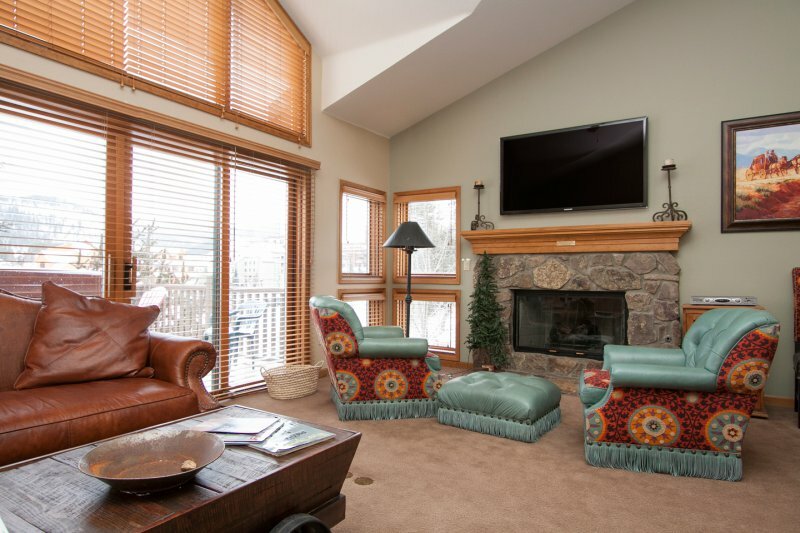 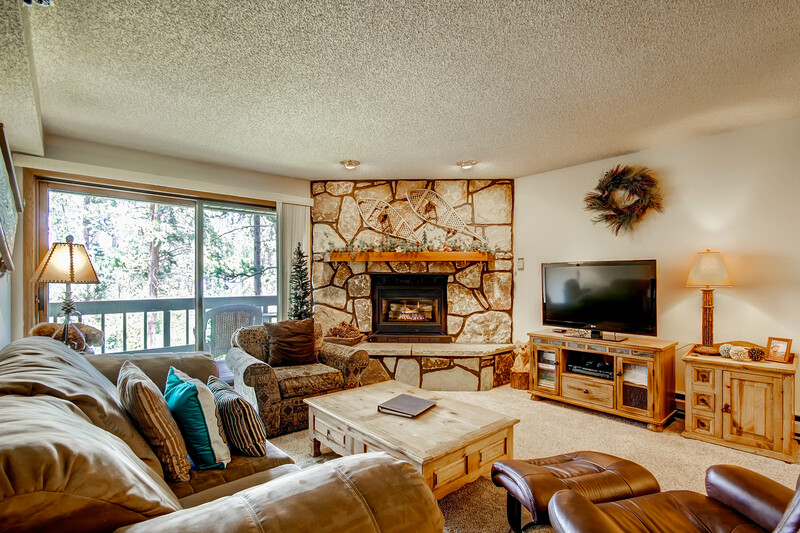 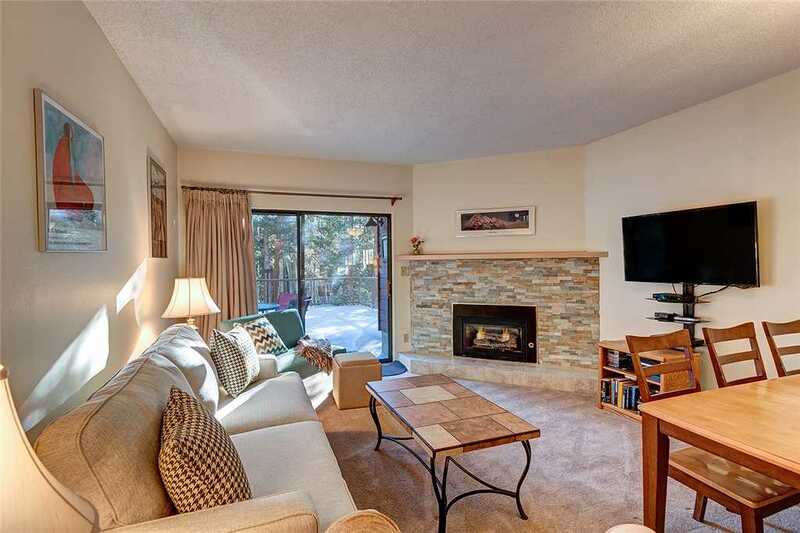 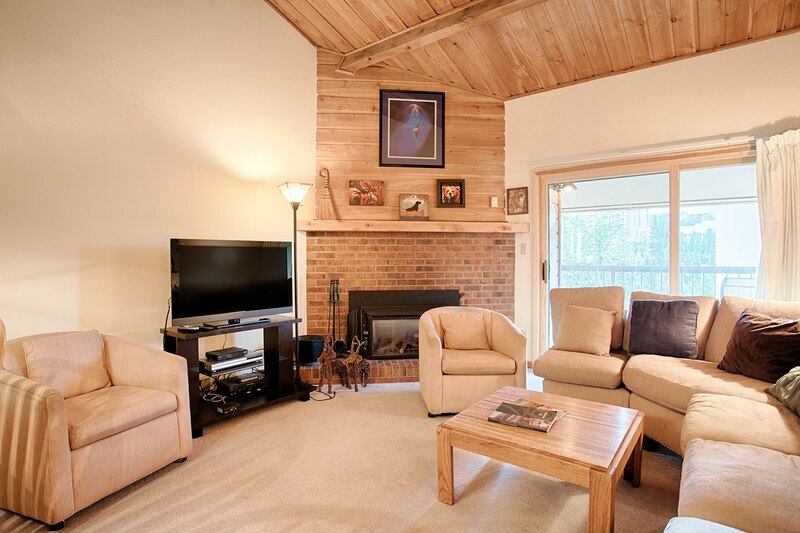 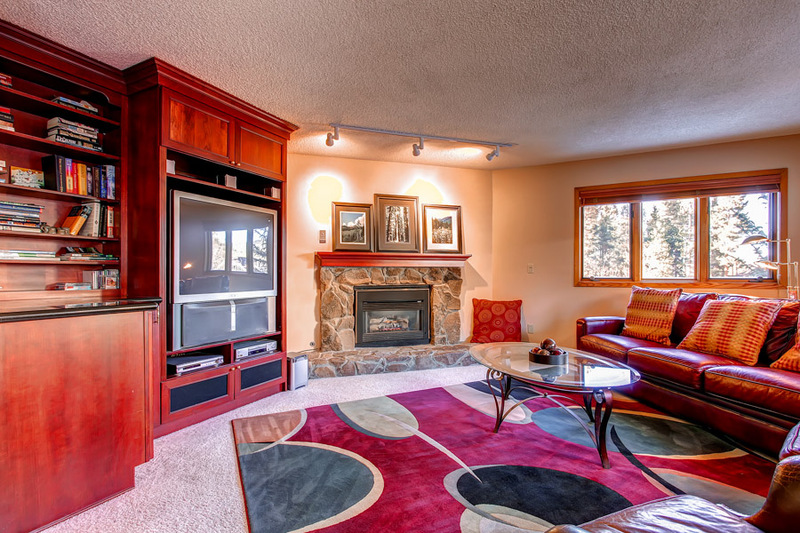 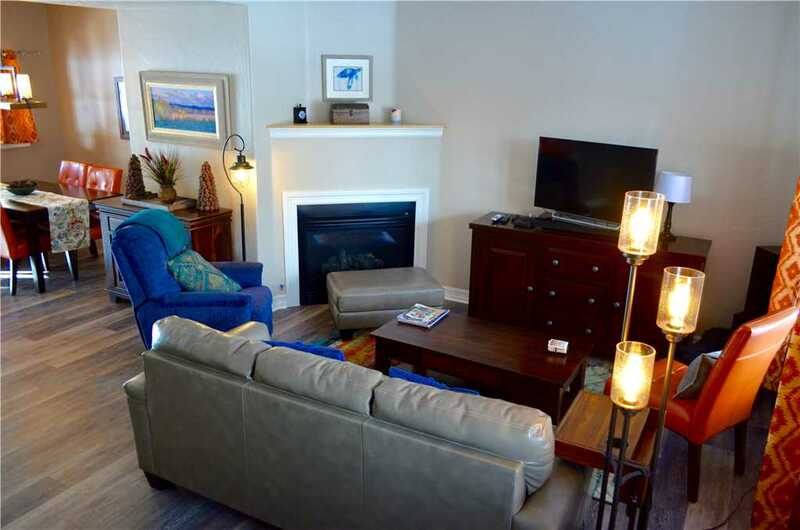 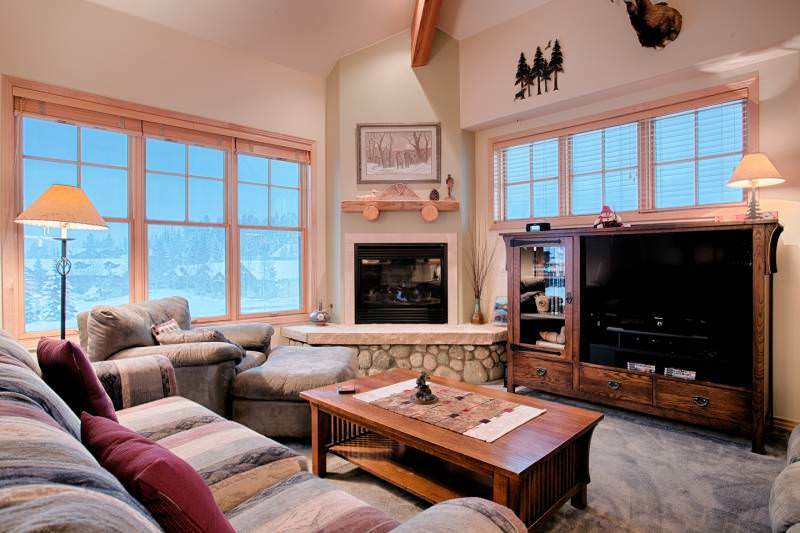 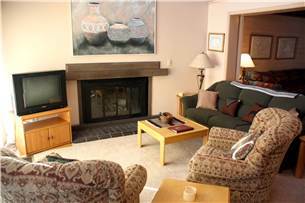 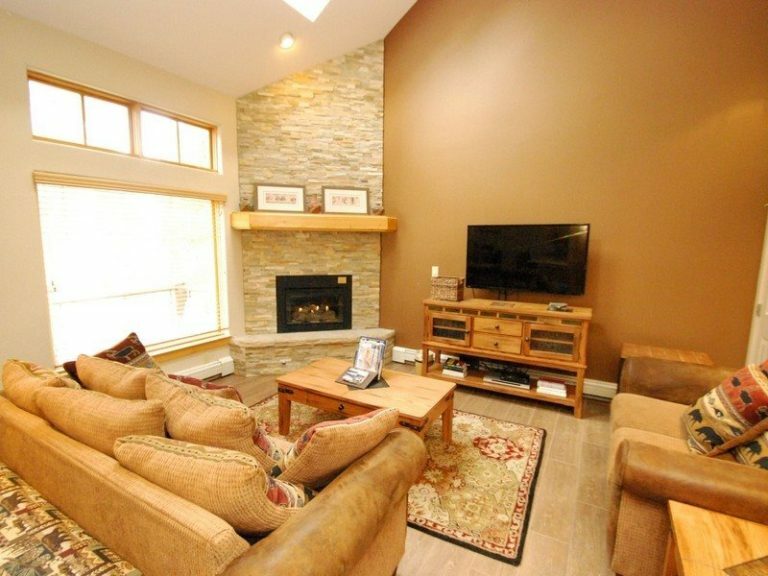 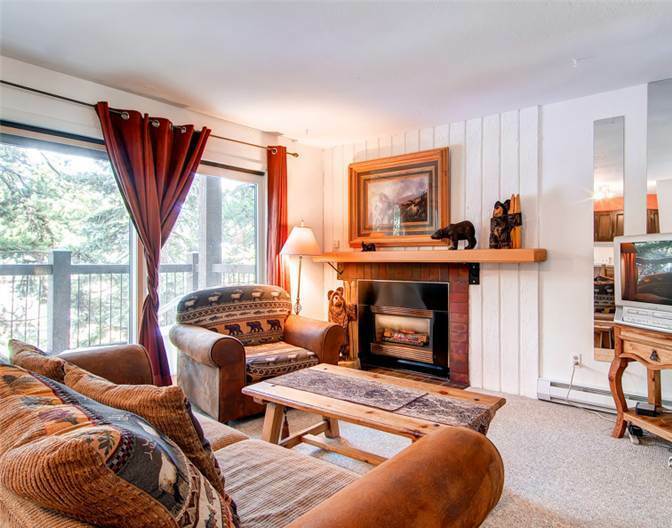 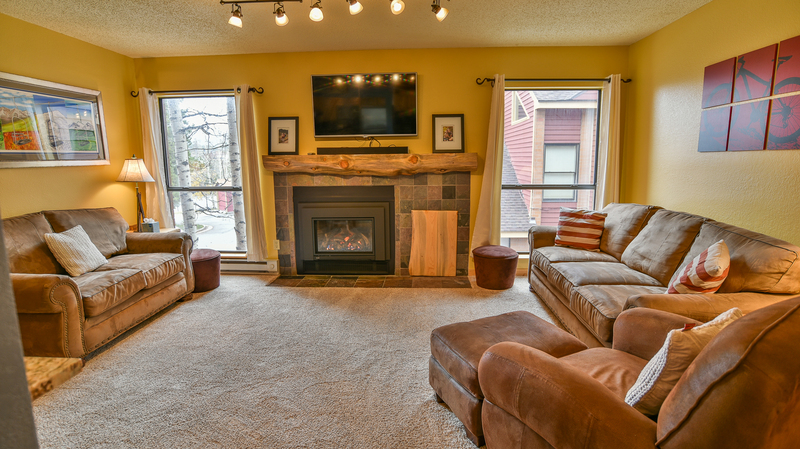 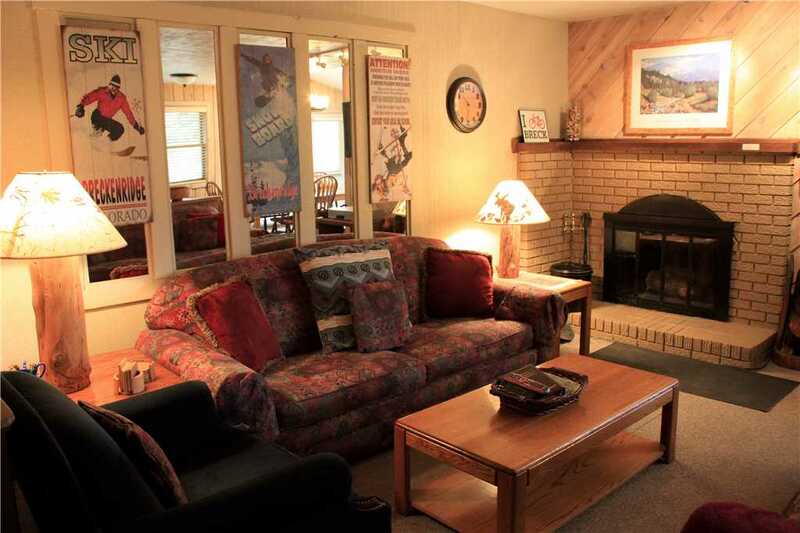 The living area is warm and inviting with a river rock gas fireplace, LCD TV and plenty of cozy new furniture and seating — it’s just the place to relax after a long day on the slopes for drinks, conversation and a favorite movie. 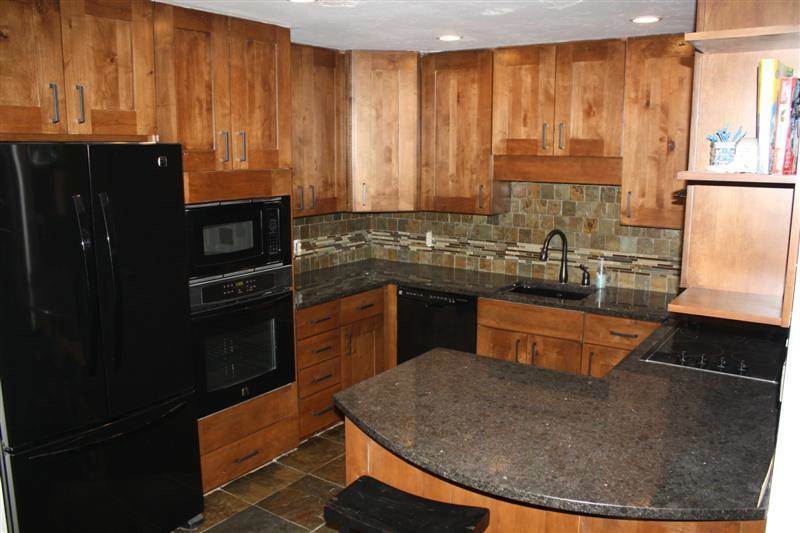 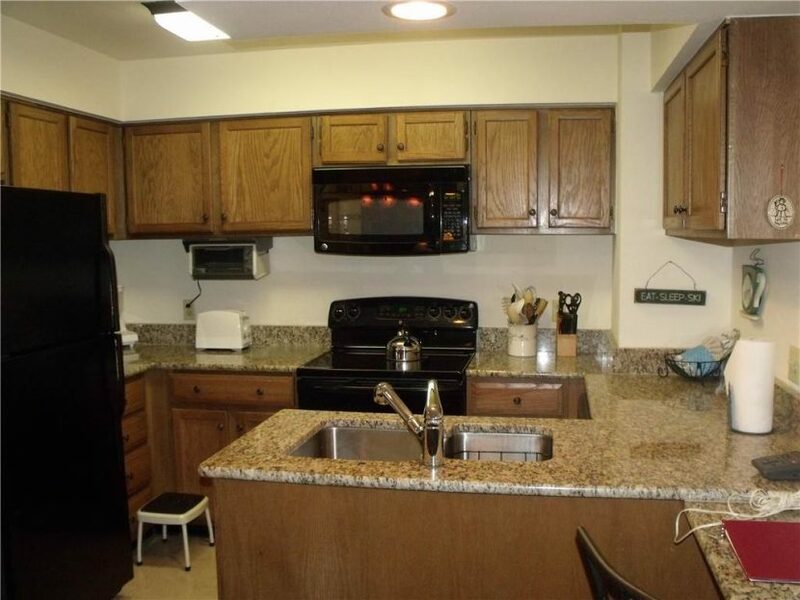 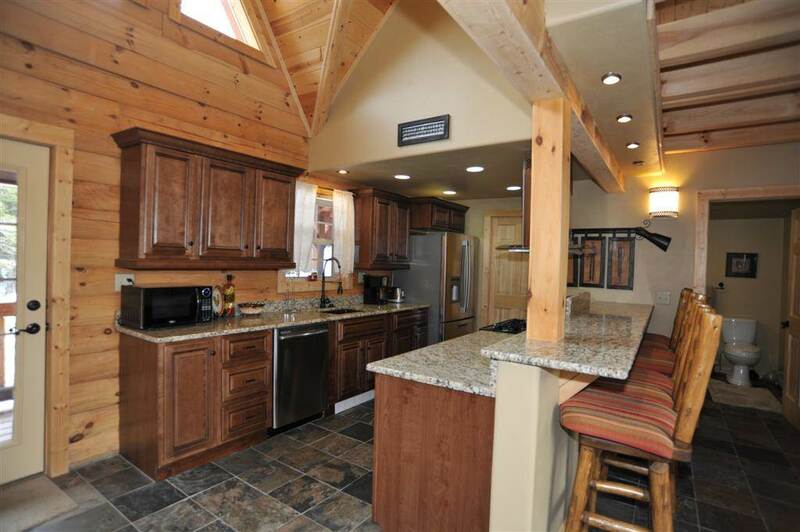 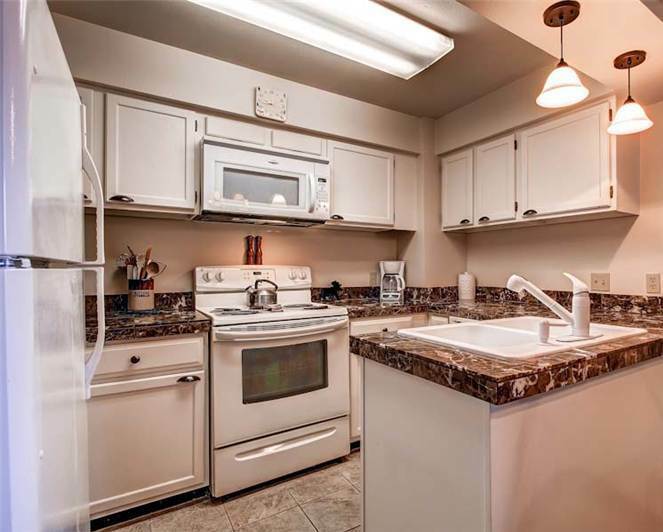 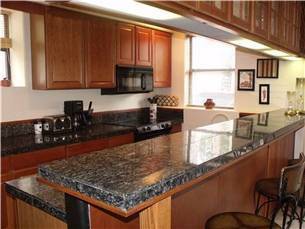 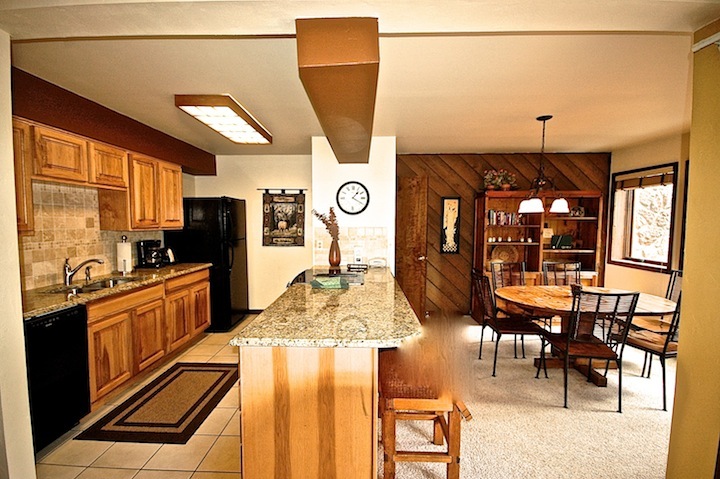 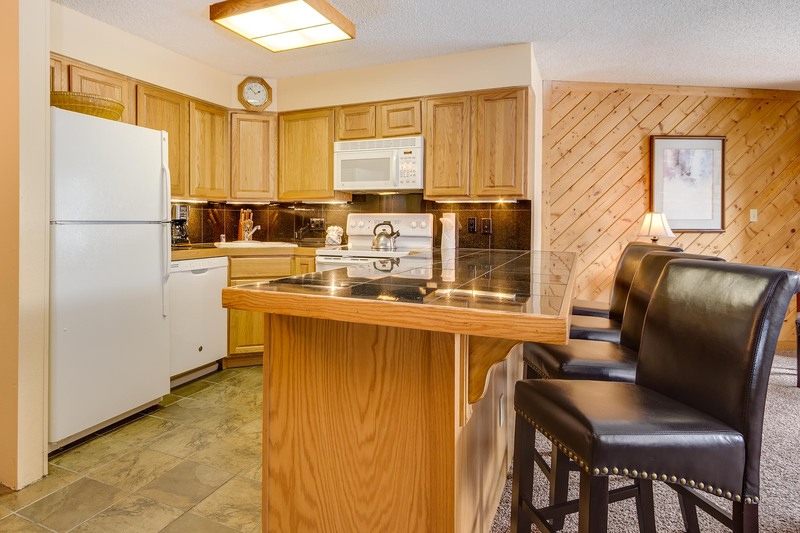 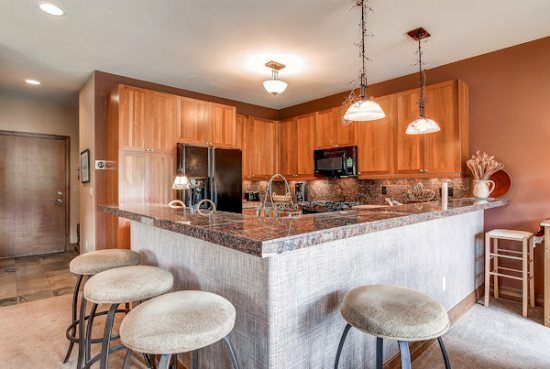 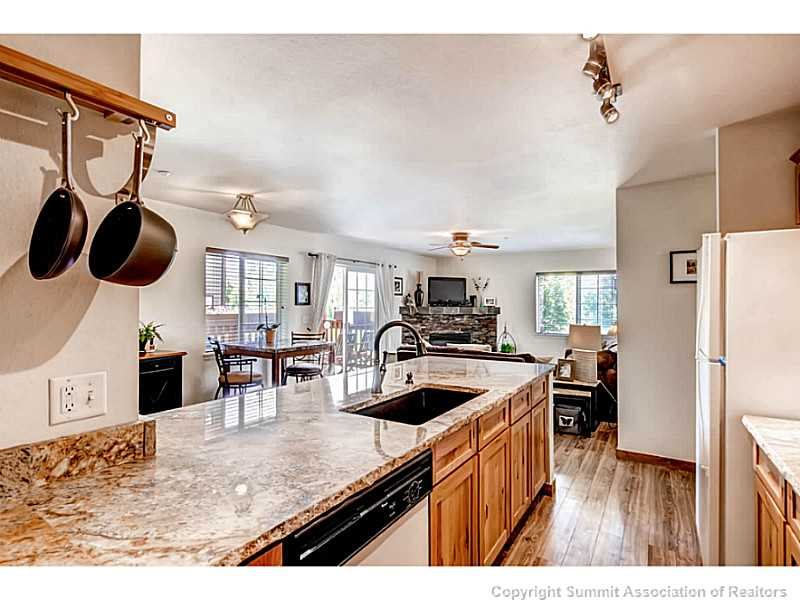 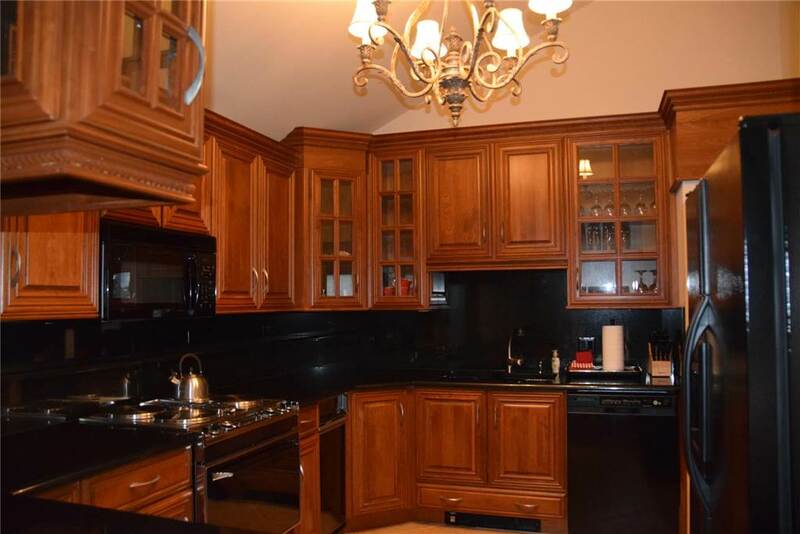 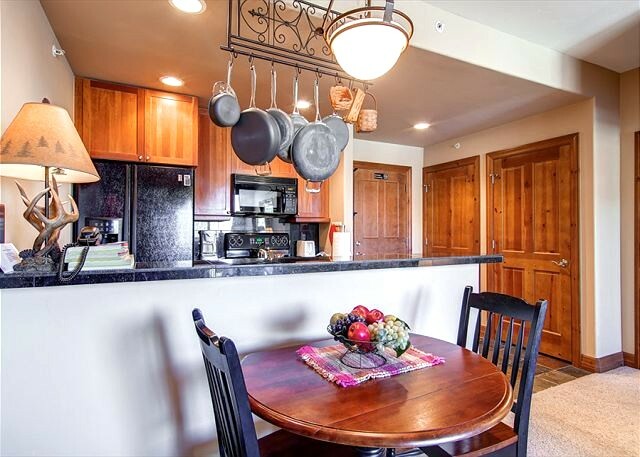 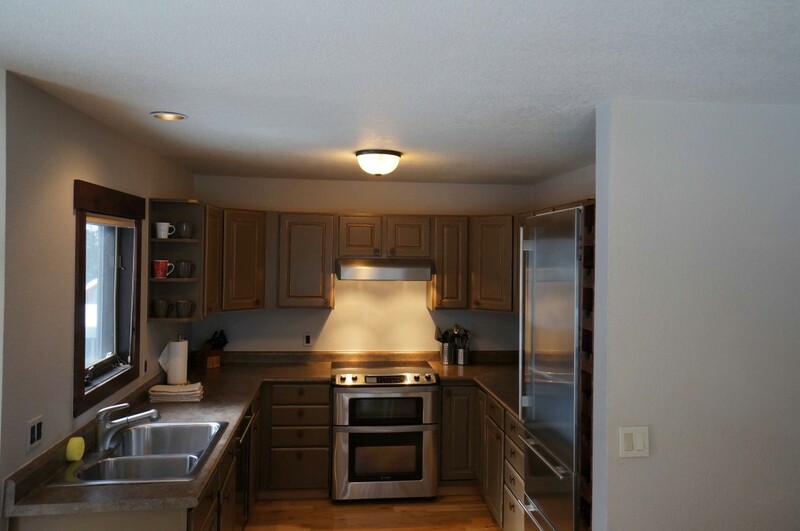 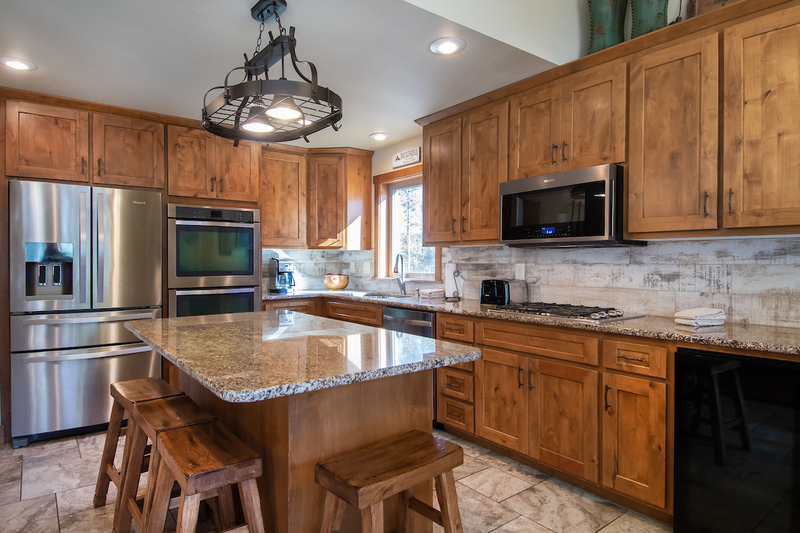 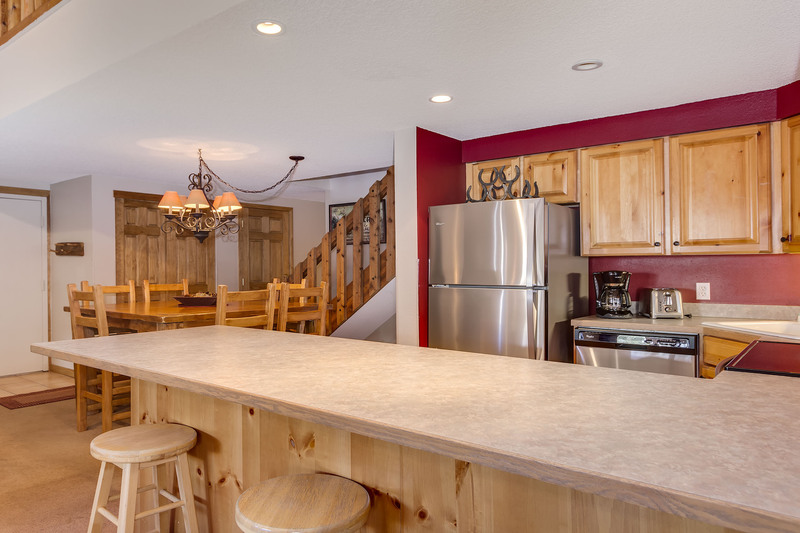 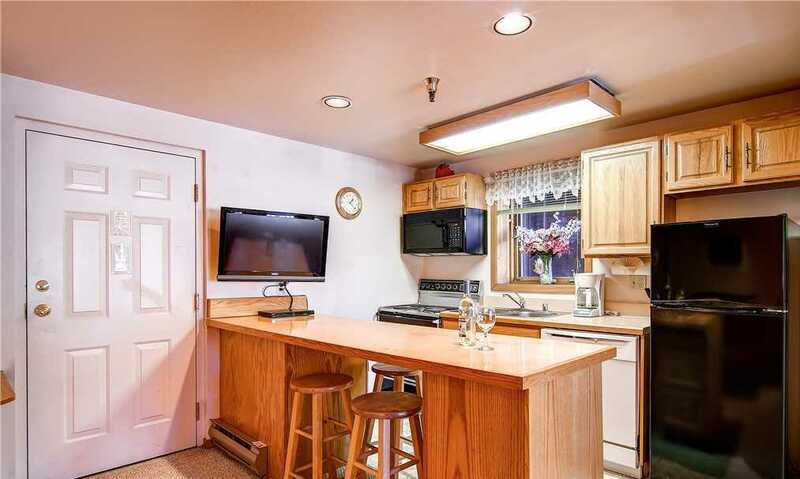 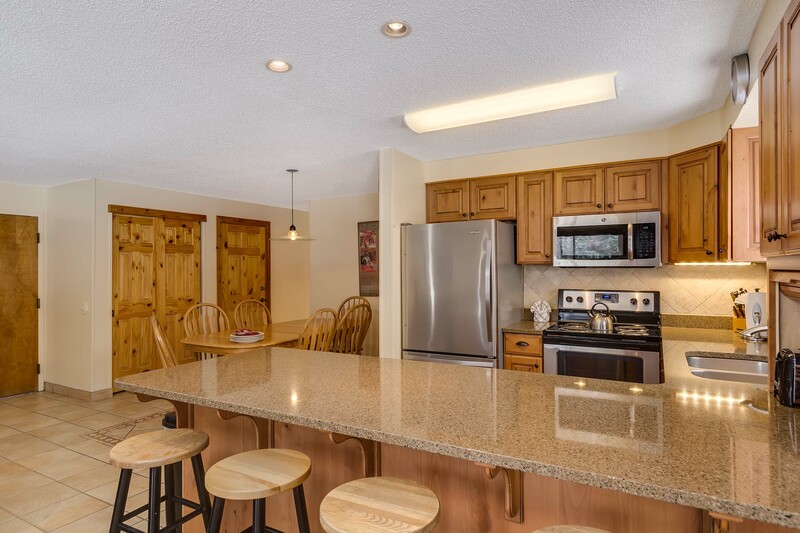 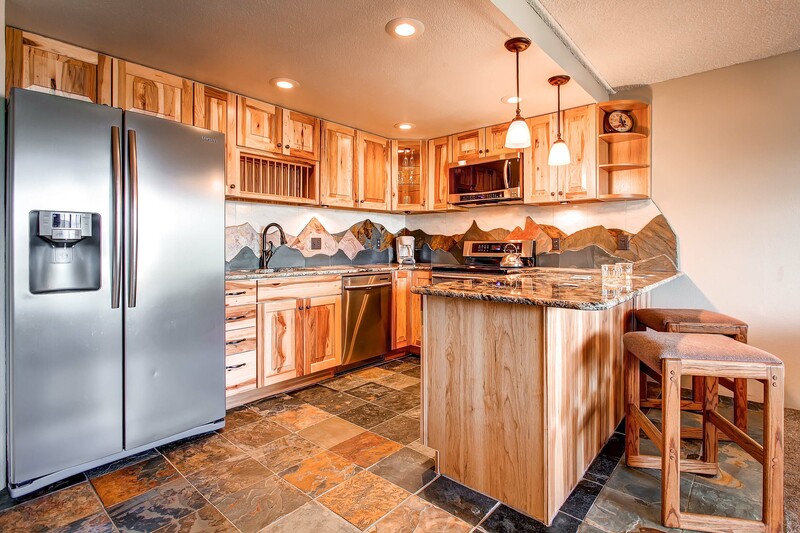 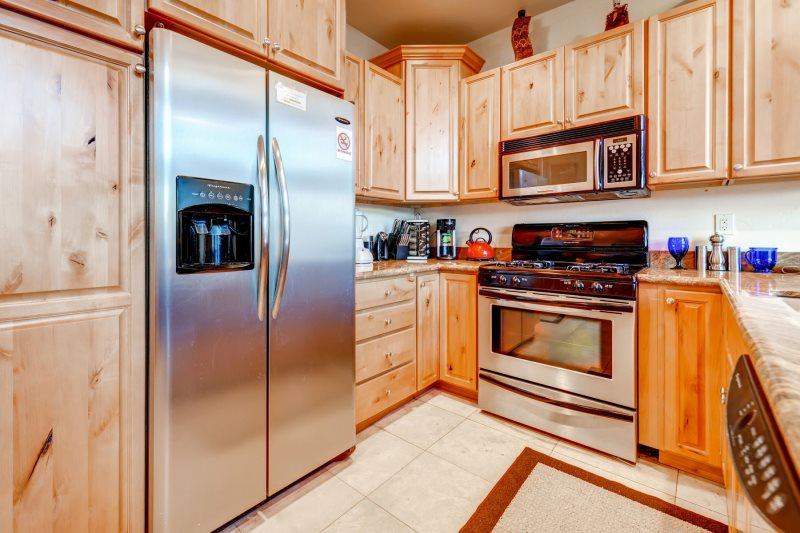 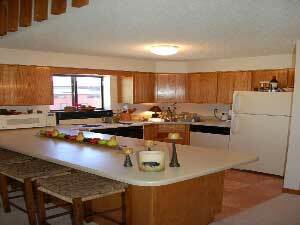 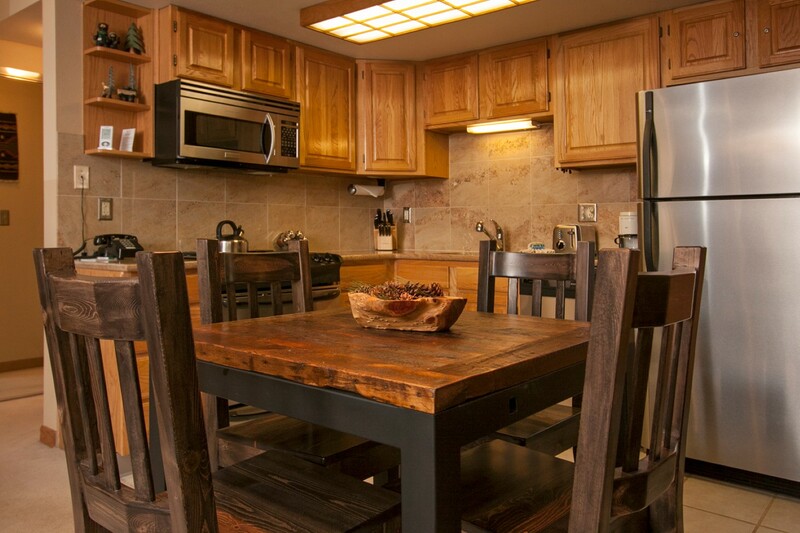 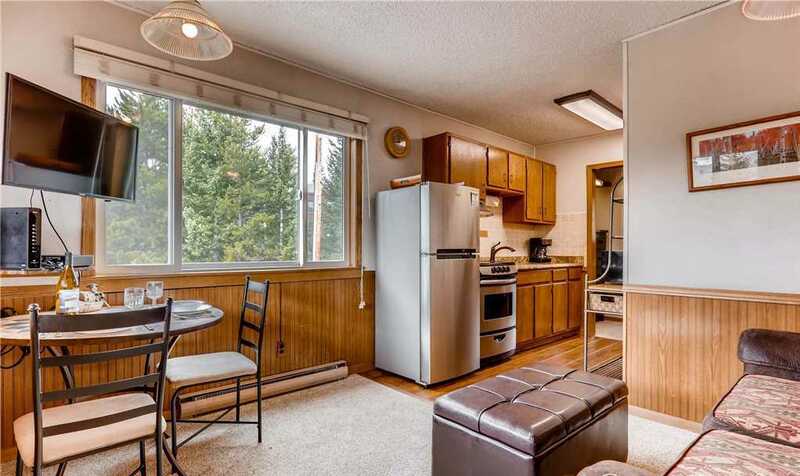 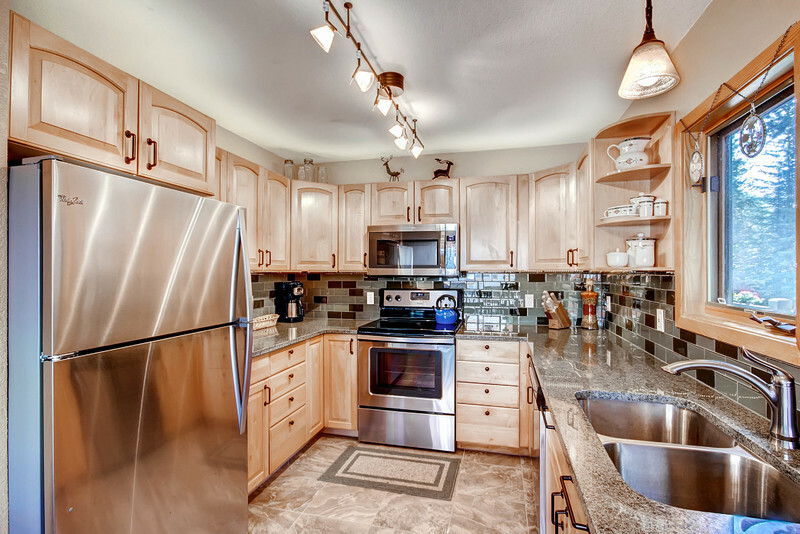 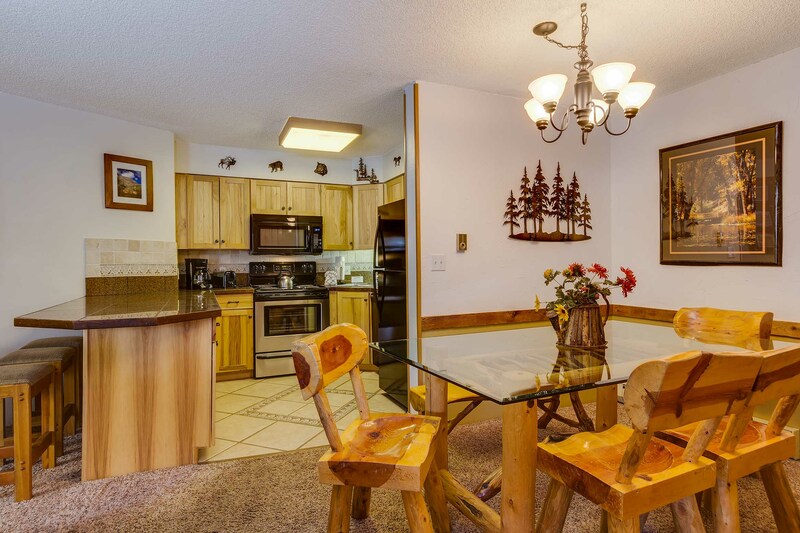 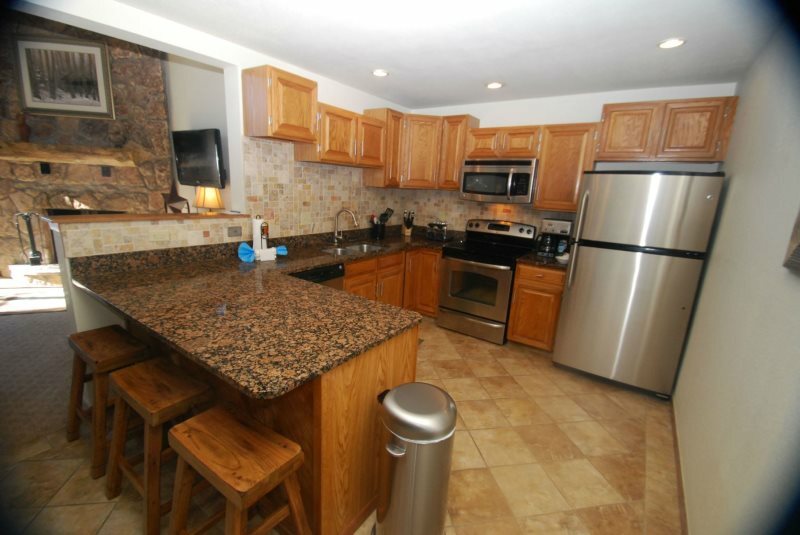 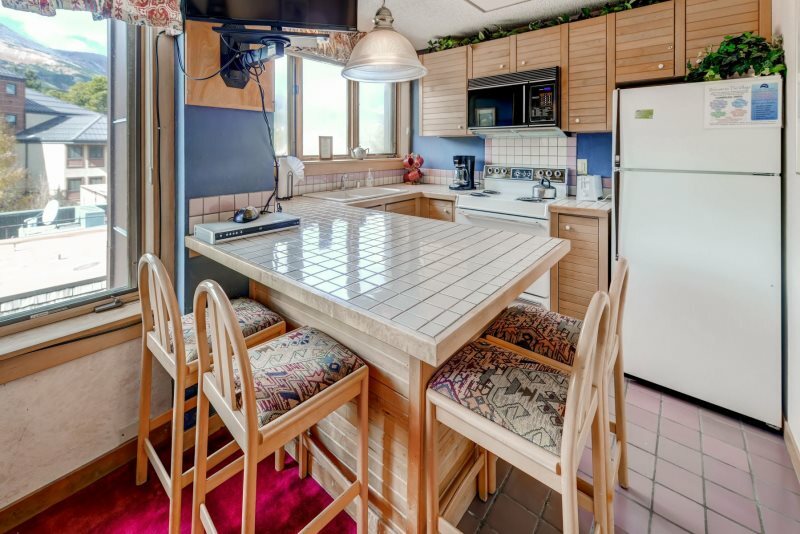 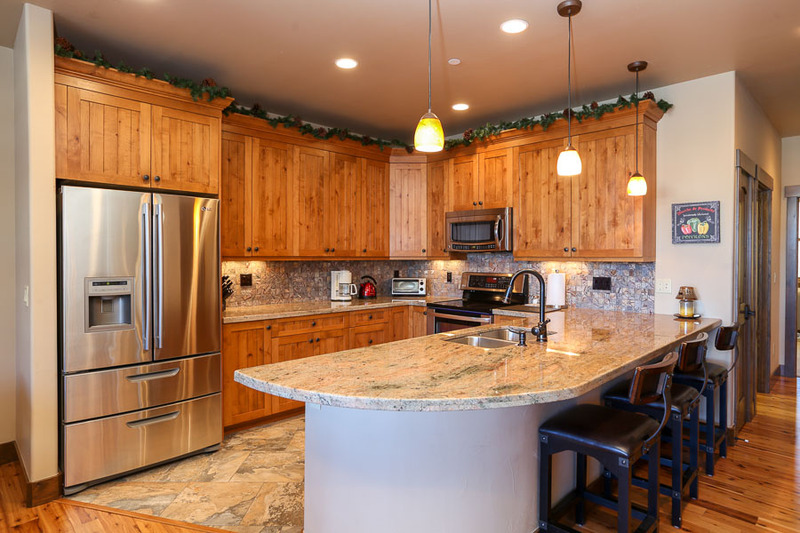 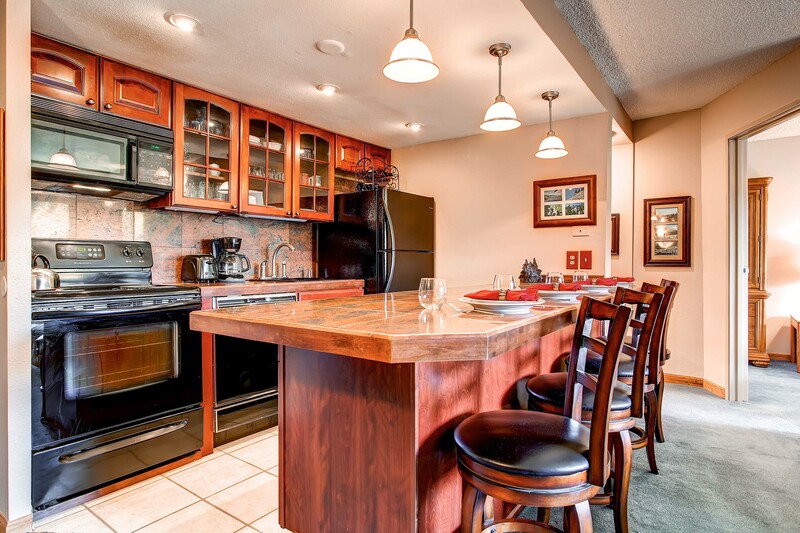 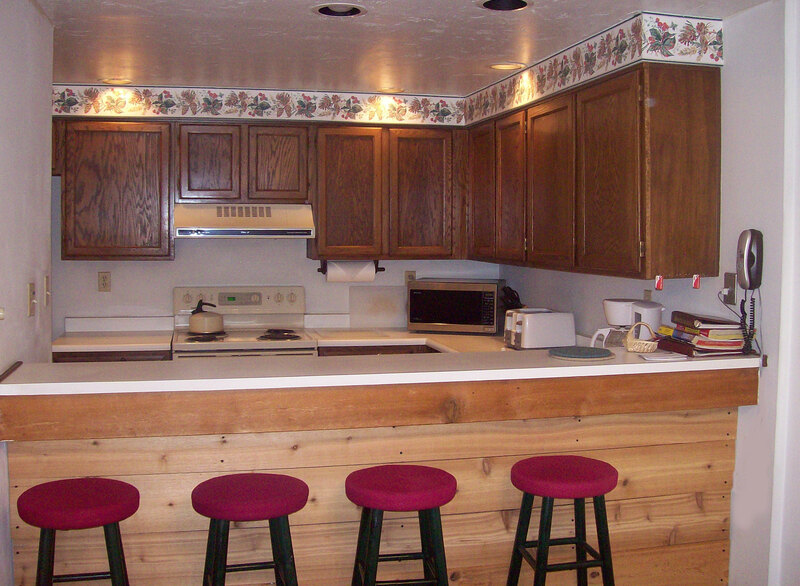 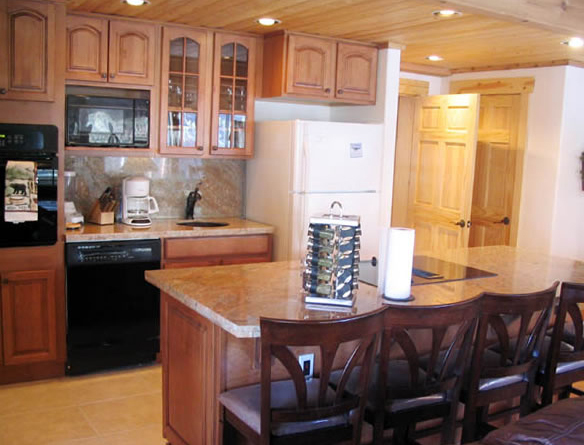 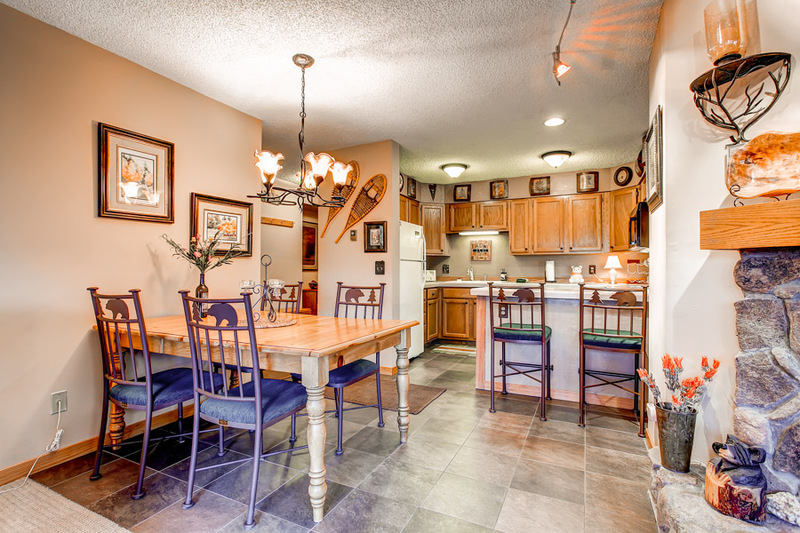 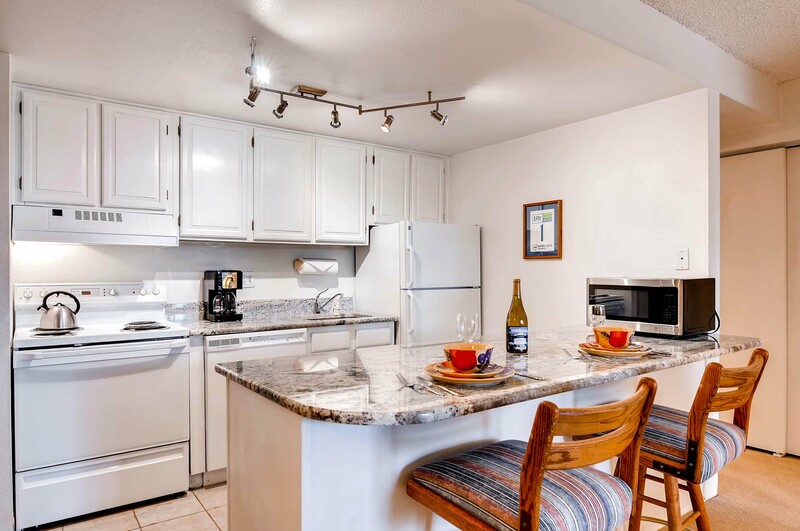 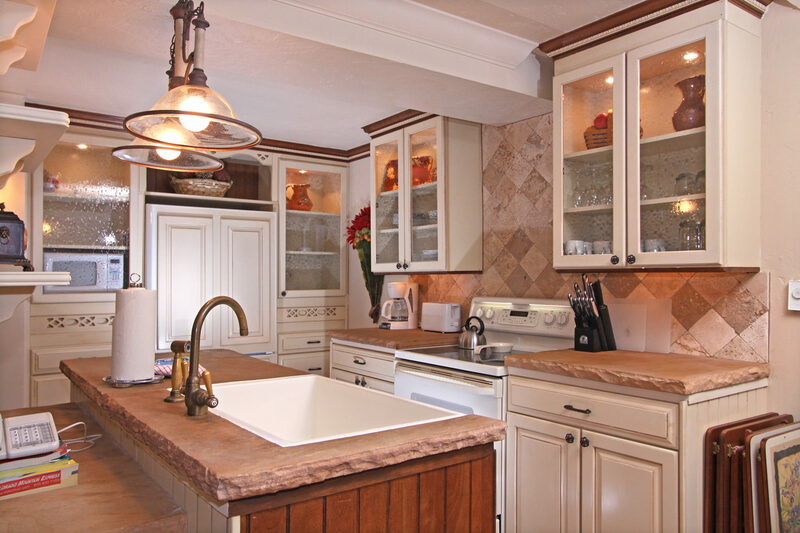 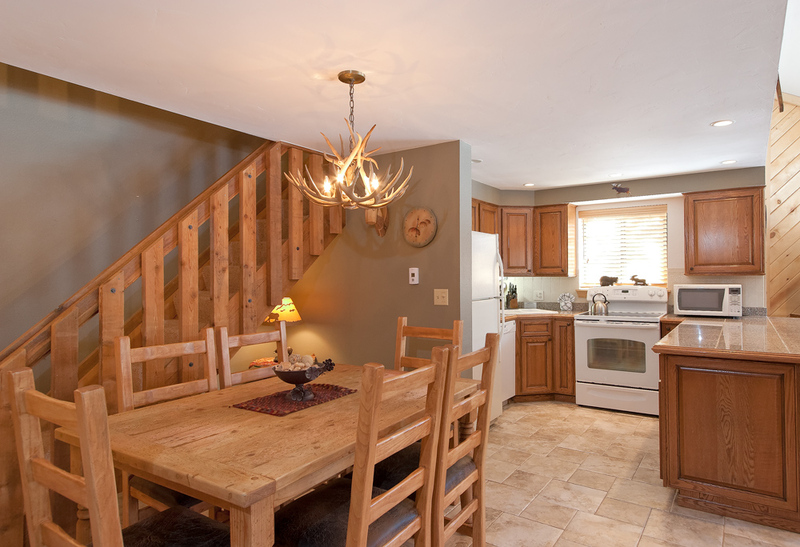 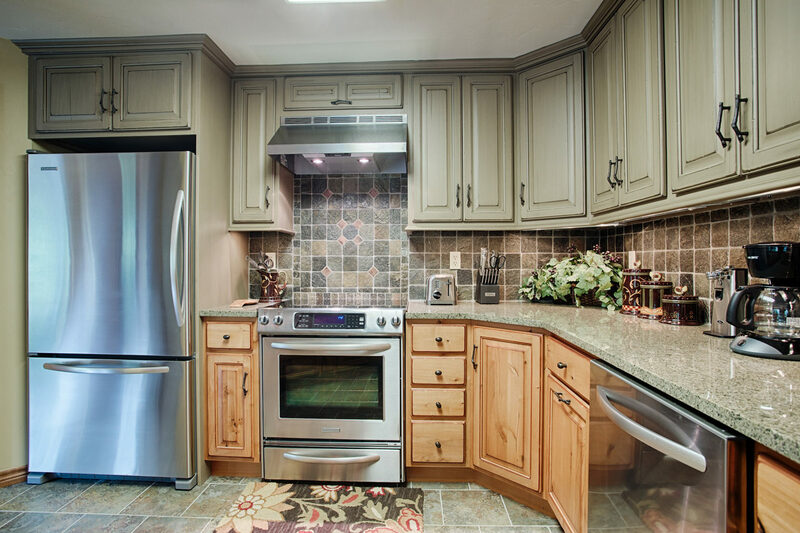 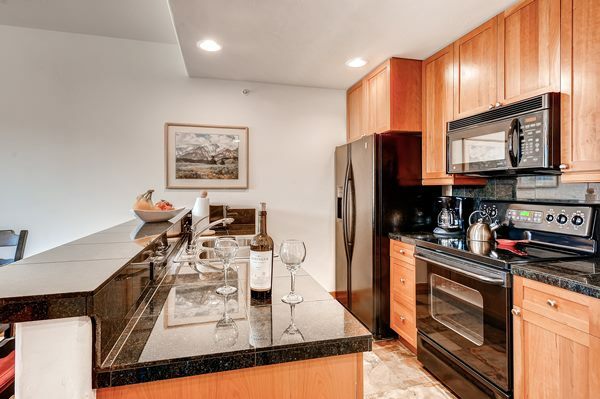 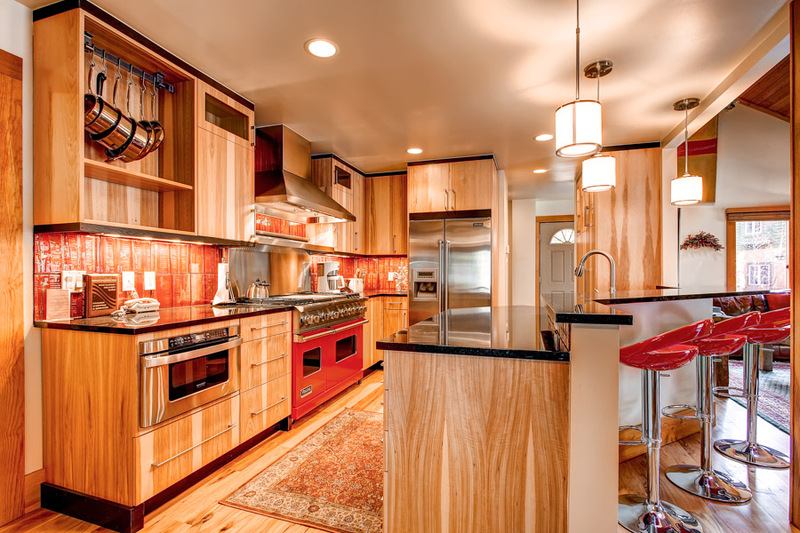 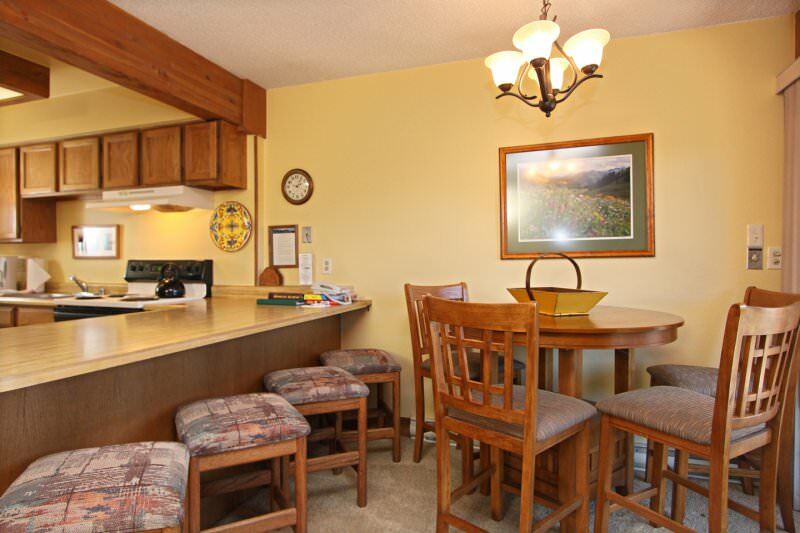 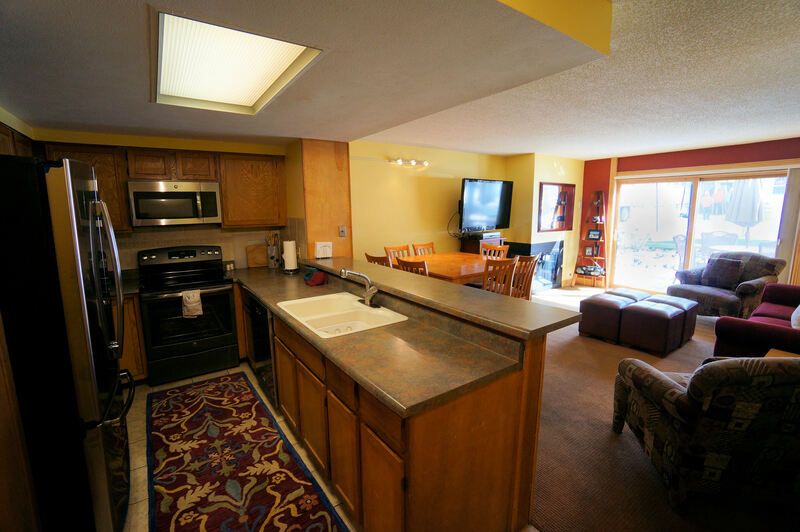 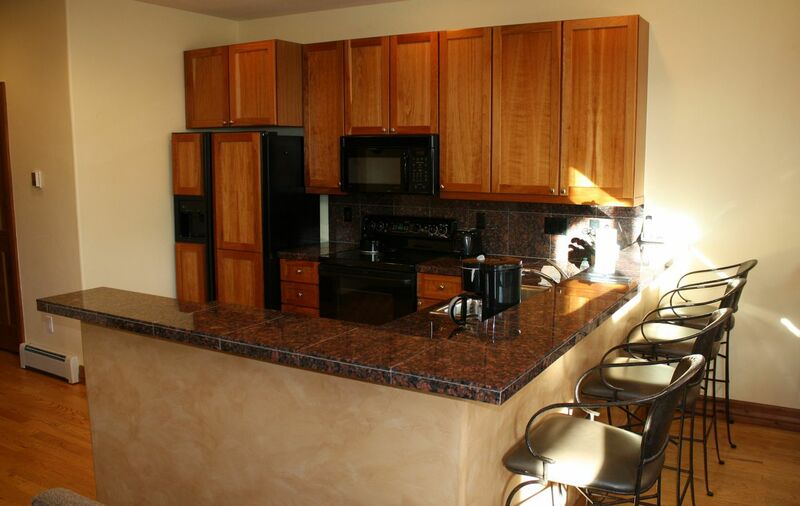 The fully equipped, remodeled kitchen features granite countertops, stainless steel appliances and everything you need to keep the troops happy and fed. 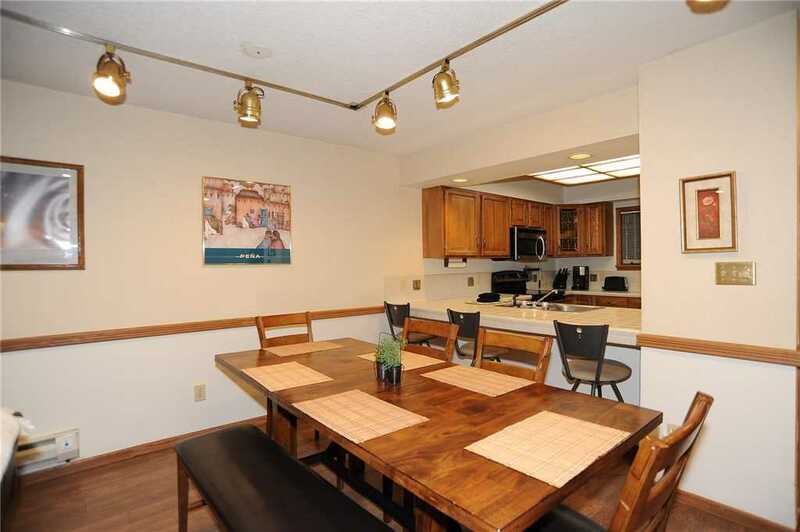 The dining table seats eight, and just outside on the patio, there’s patio seating and a gas grill. 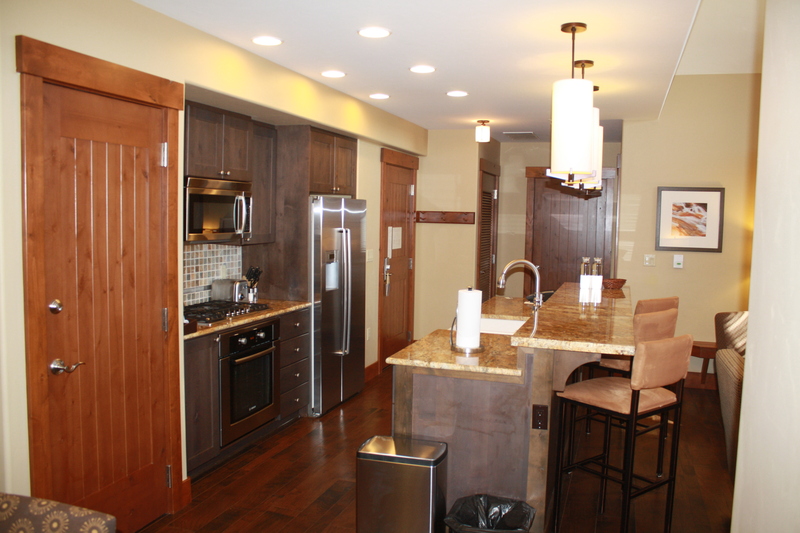 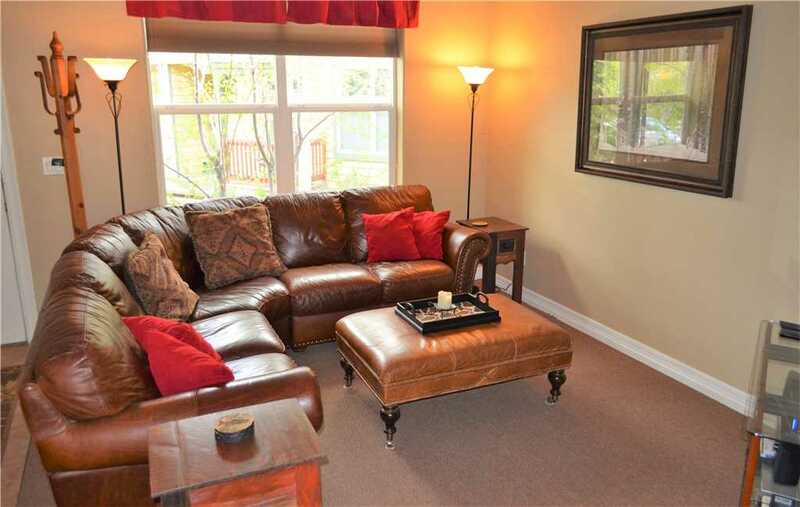 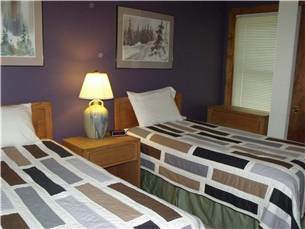 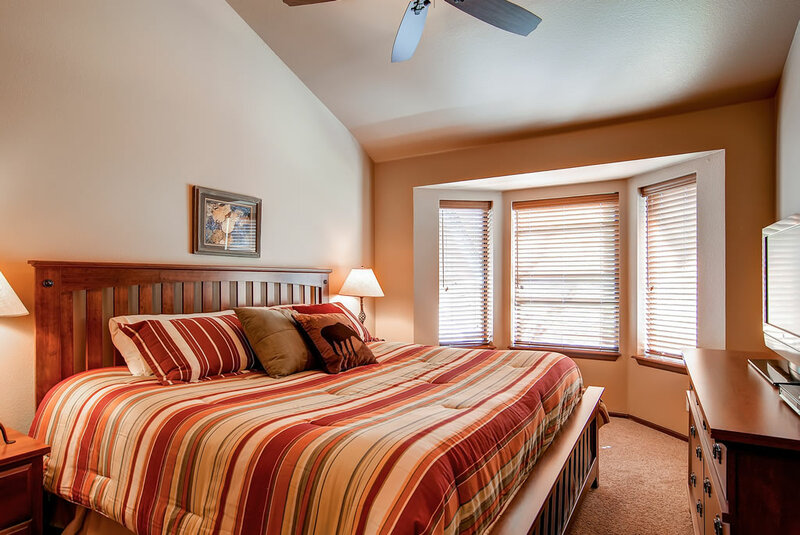 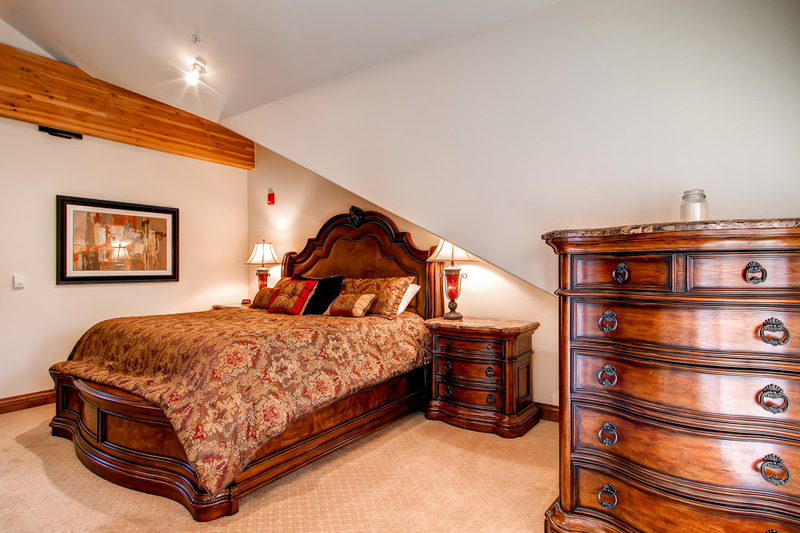 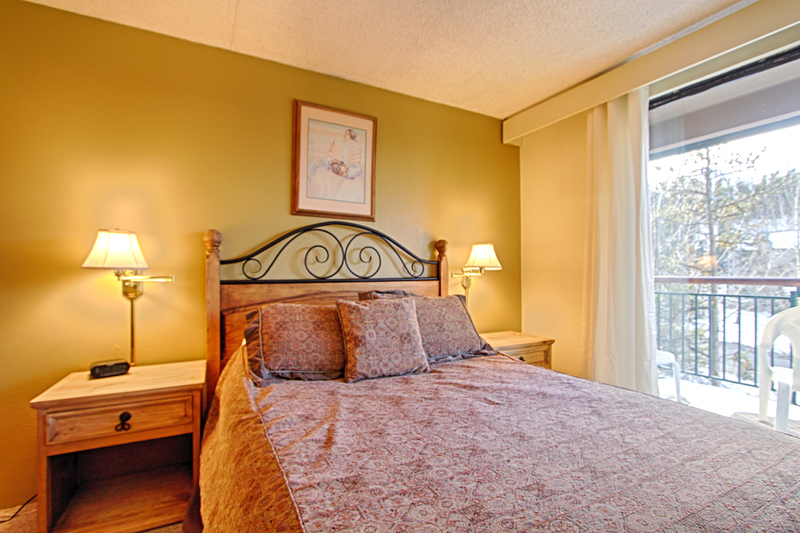 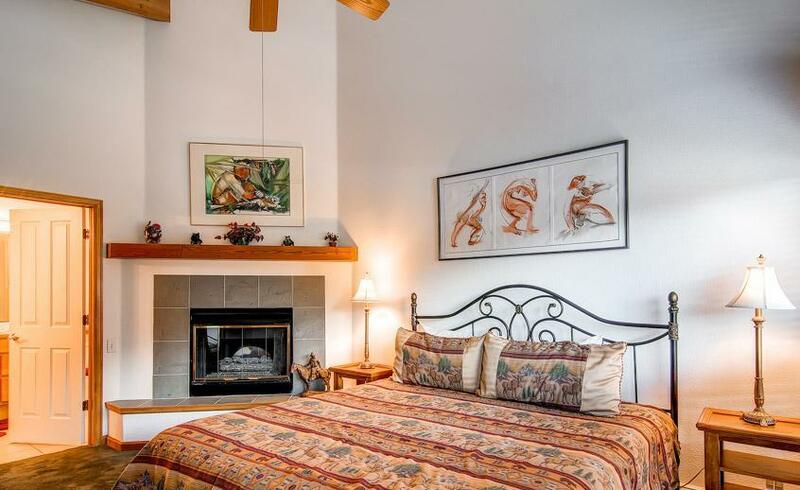 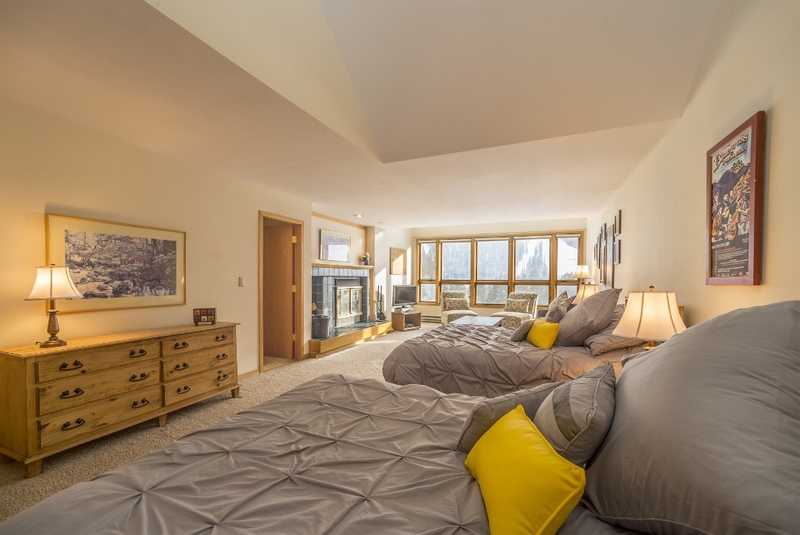 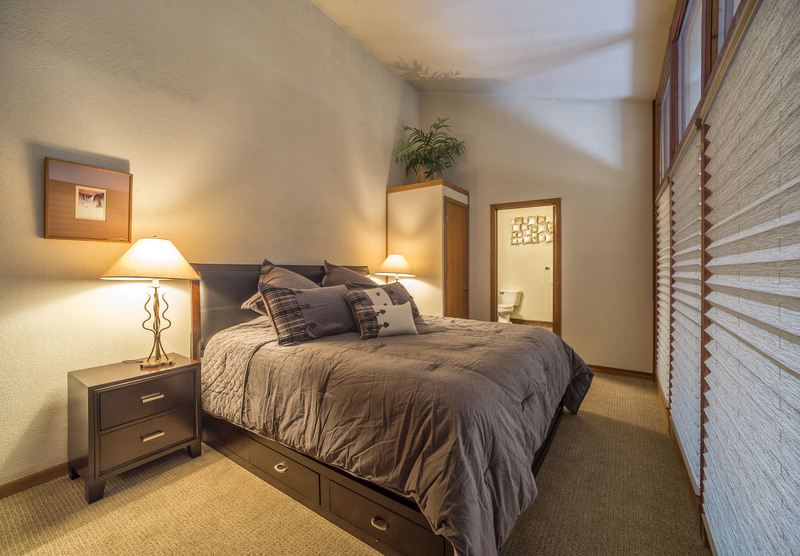 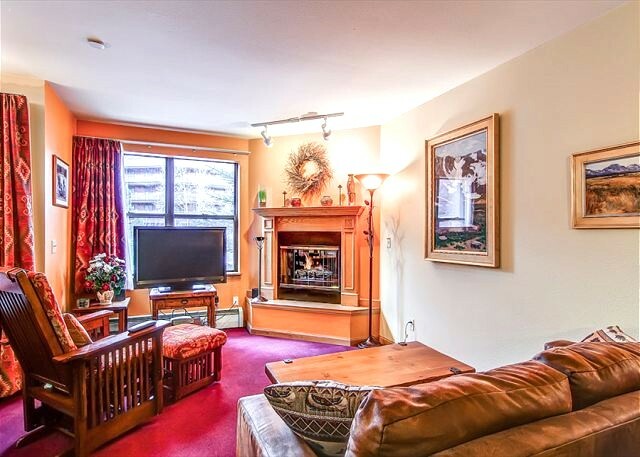 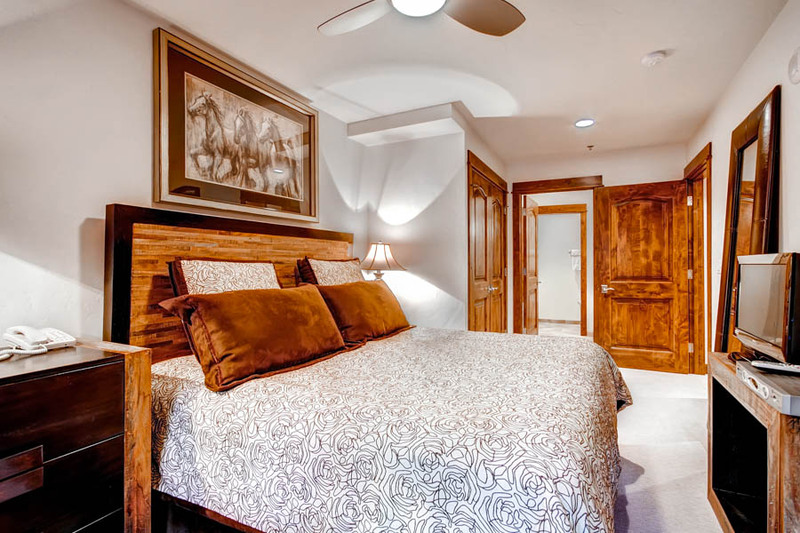 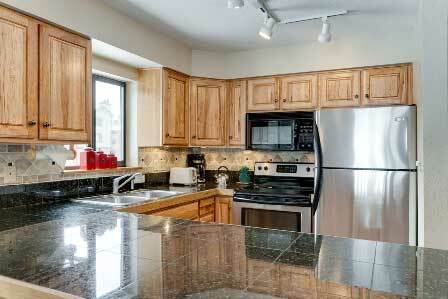 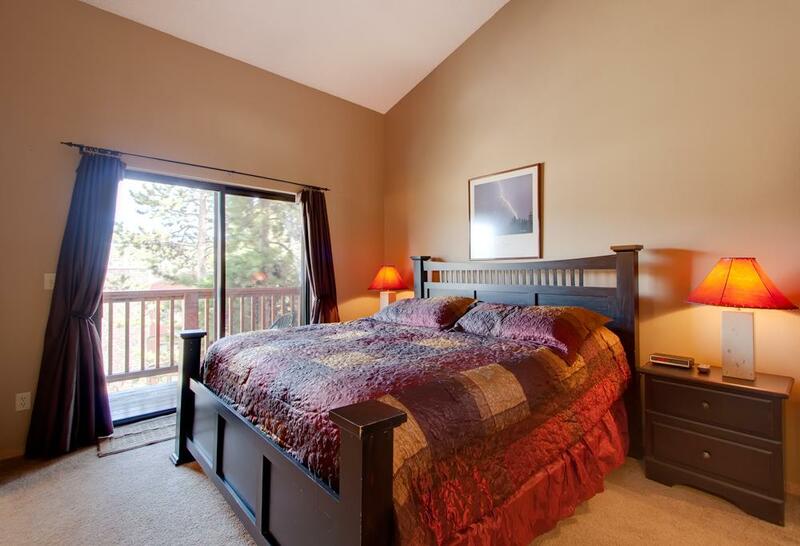 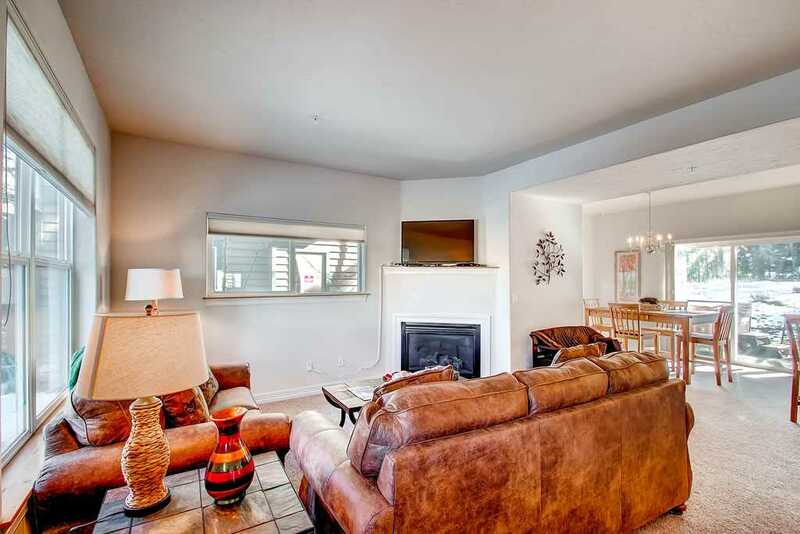 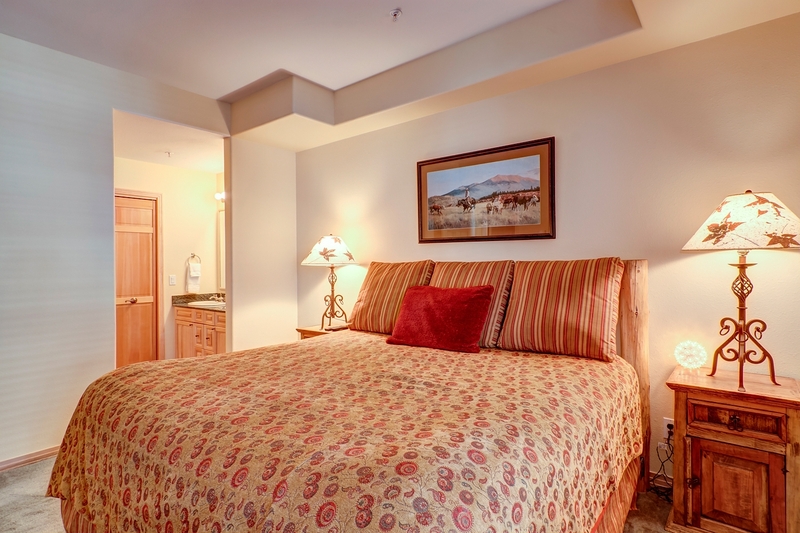 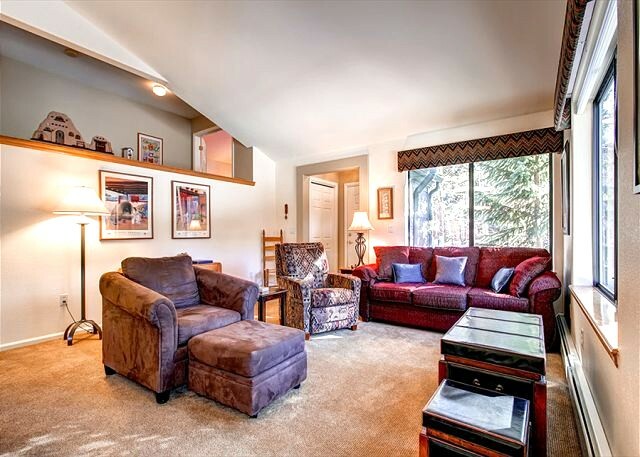 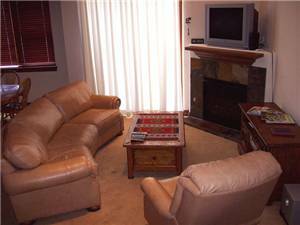 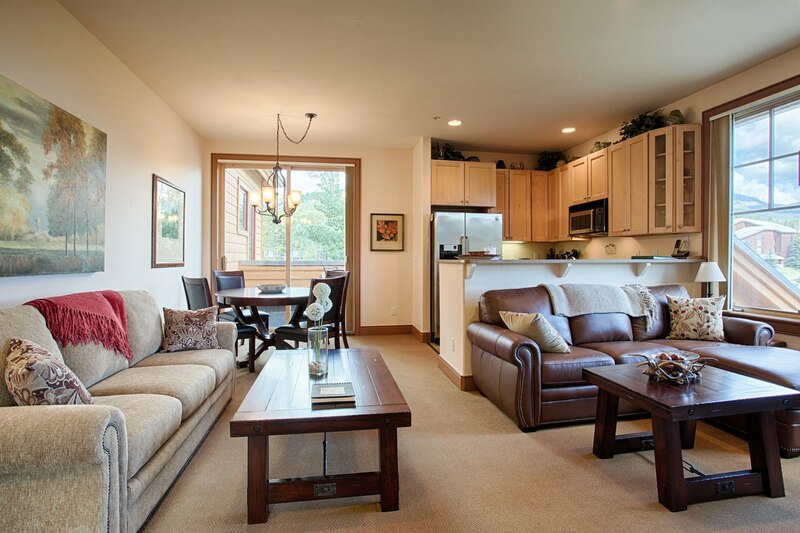 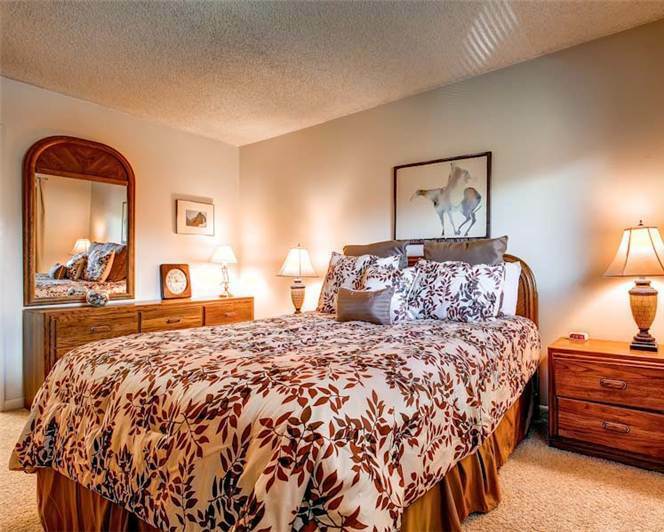 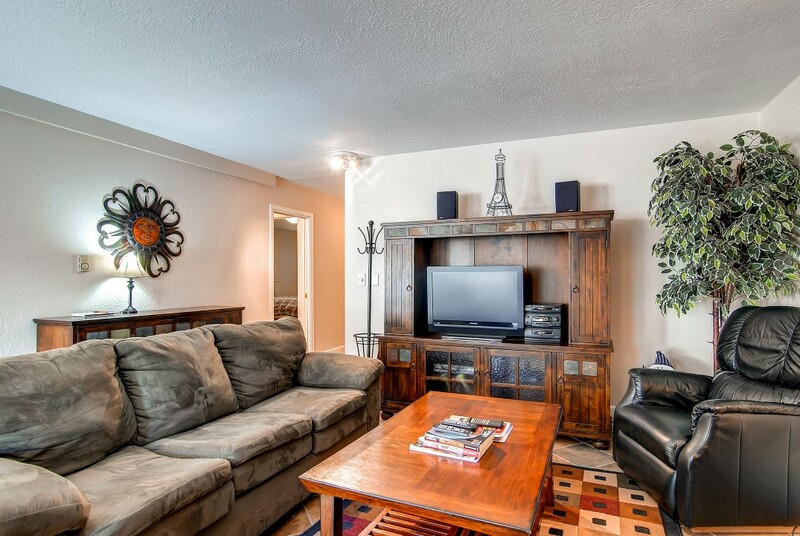 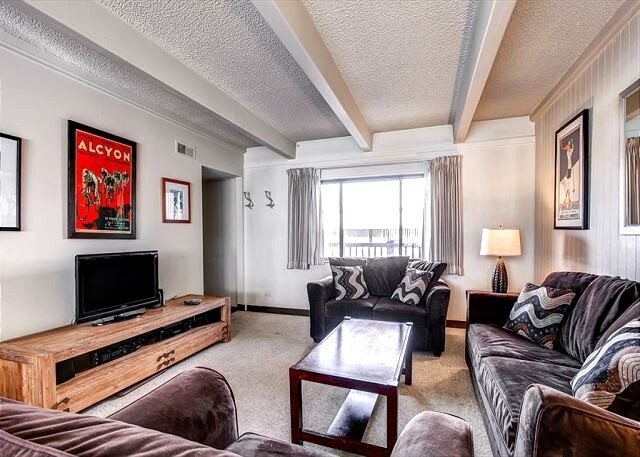 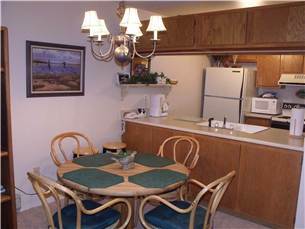 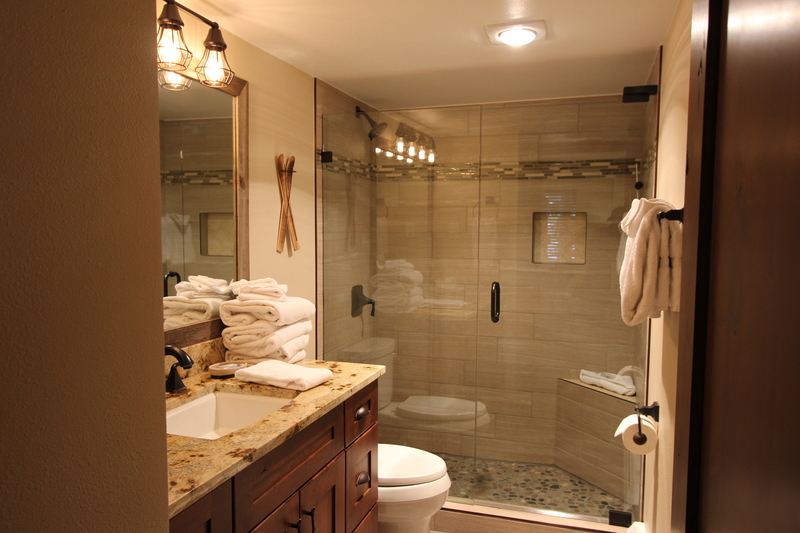 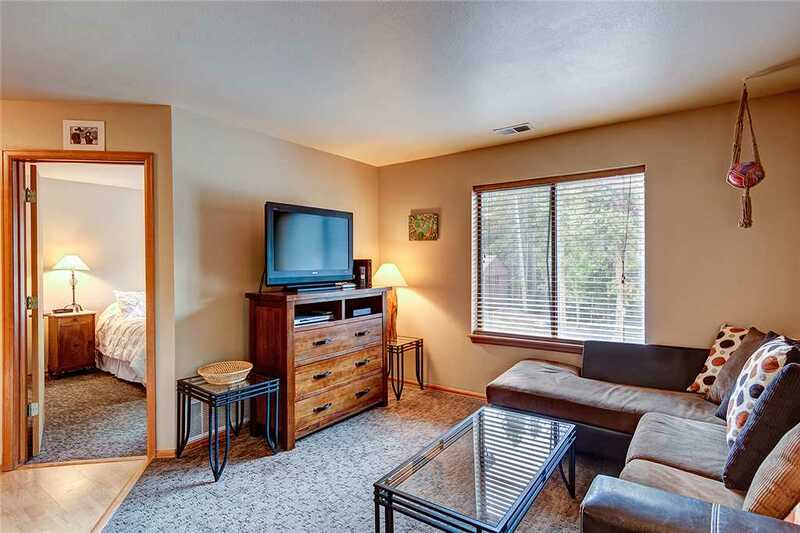 Every bedroom in this spacious townhome is its own private “suite” with a private bathroom and LCD TV. 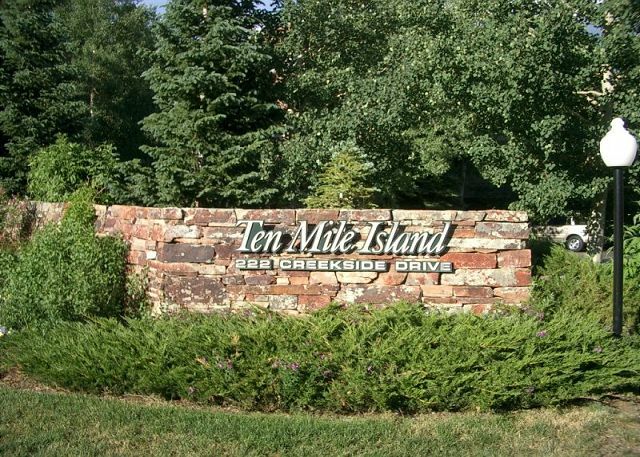 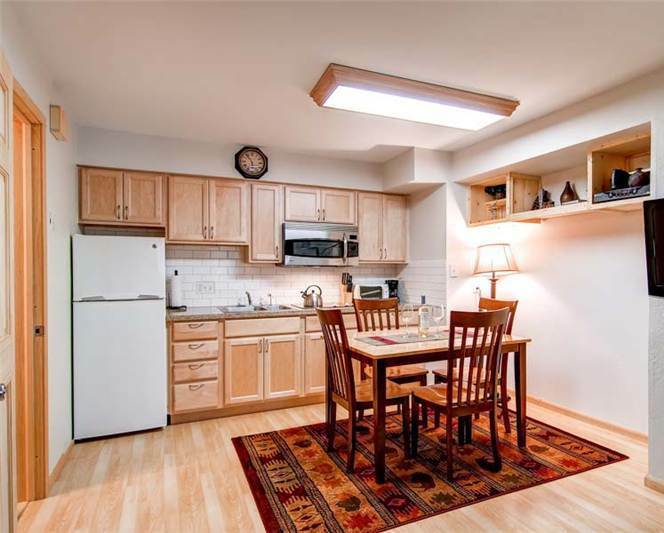 Other amenities include a one-car garage, an additional parking space, an in-unit washer/dryer, and complimentary Wi-Fi throughout the home. 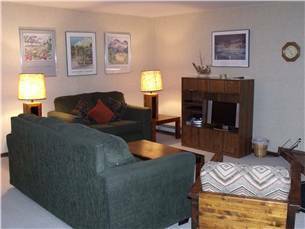 There is parking for 1 car in the Garage and room for an additional outside the garage for a total of 2 spaces. 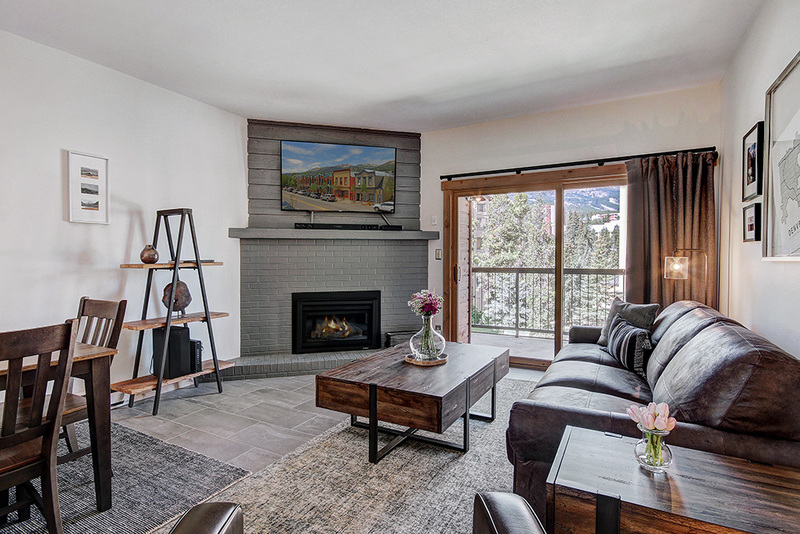 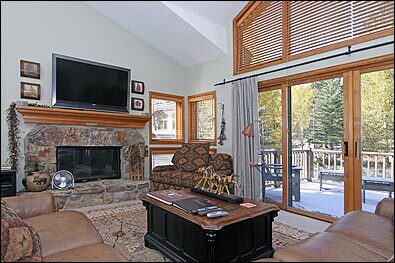 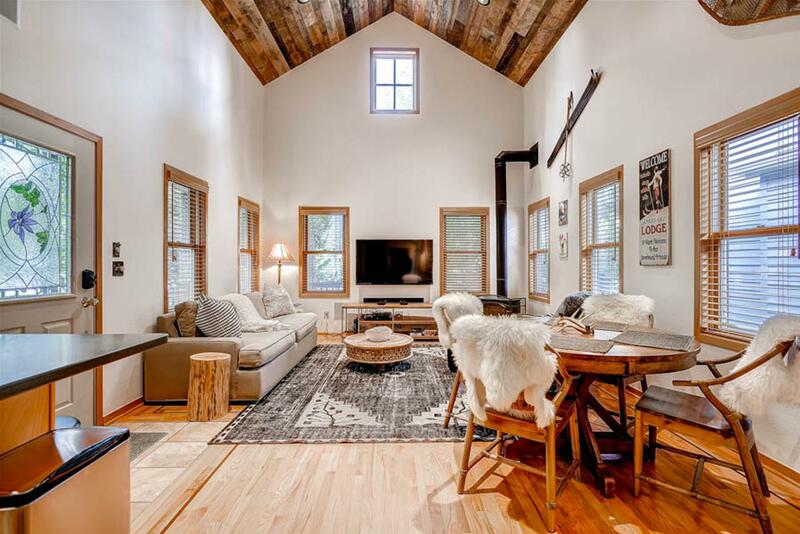 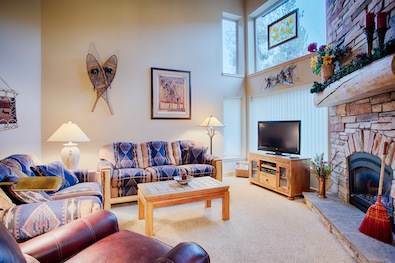 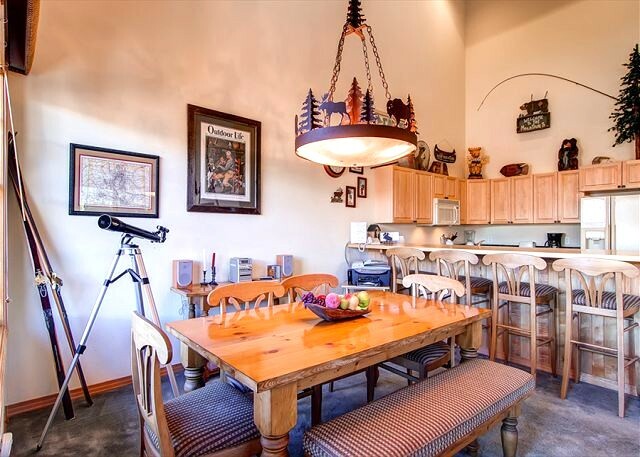 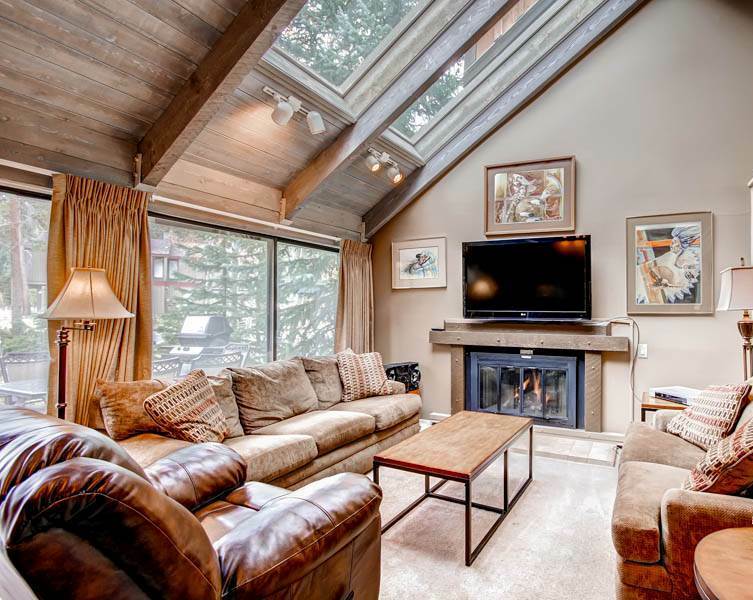 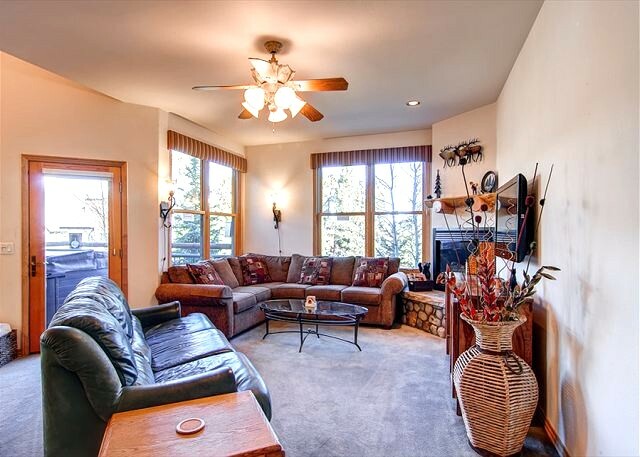 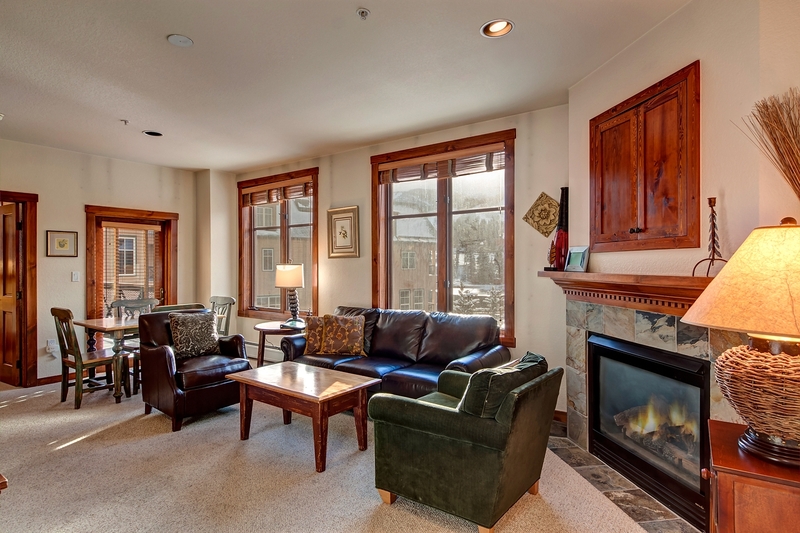 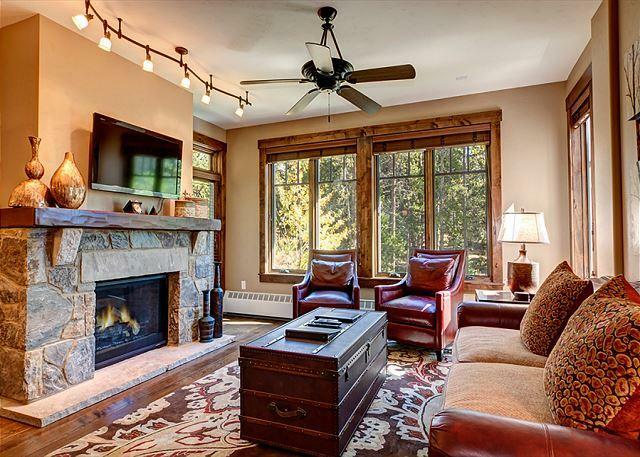 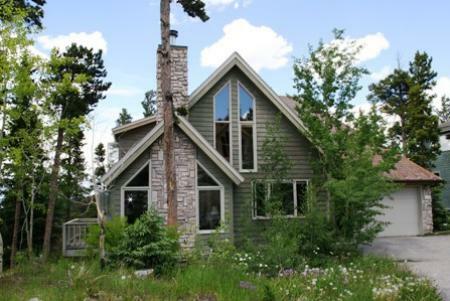 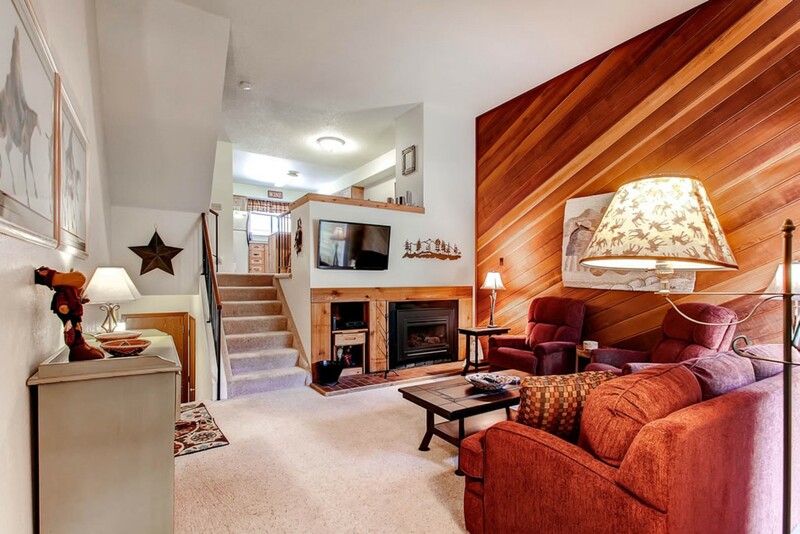 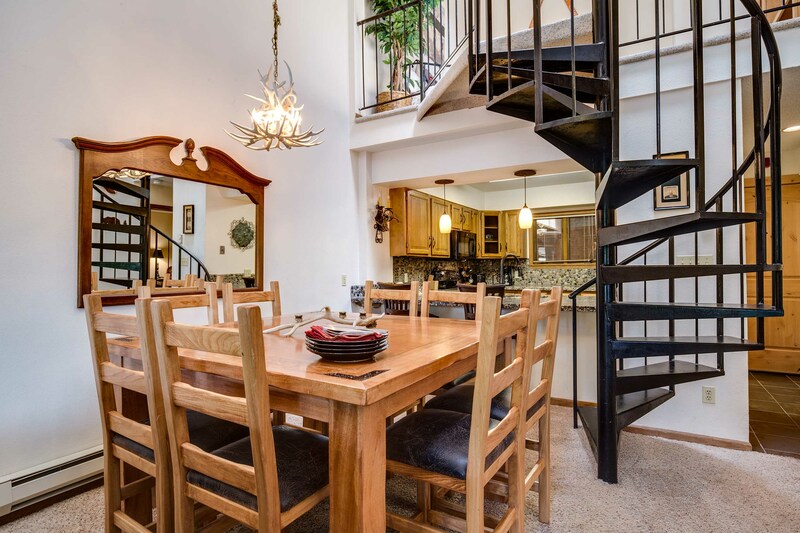 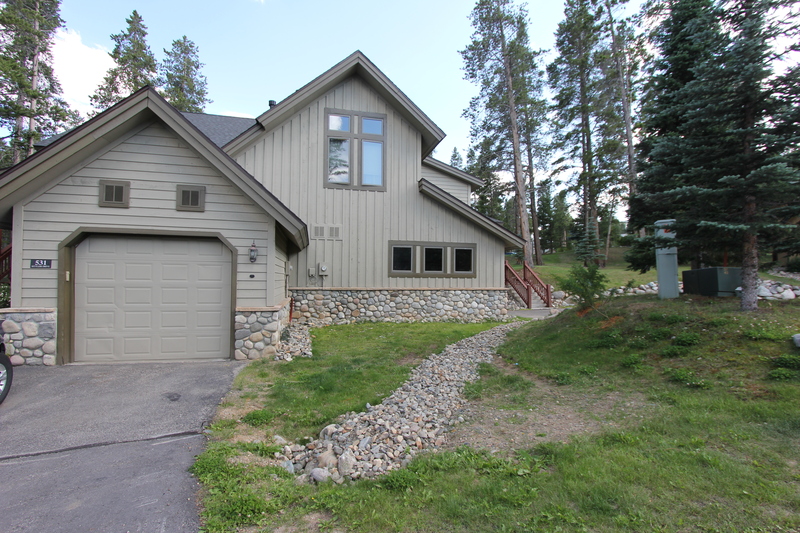 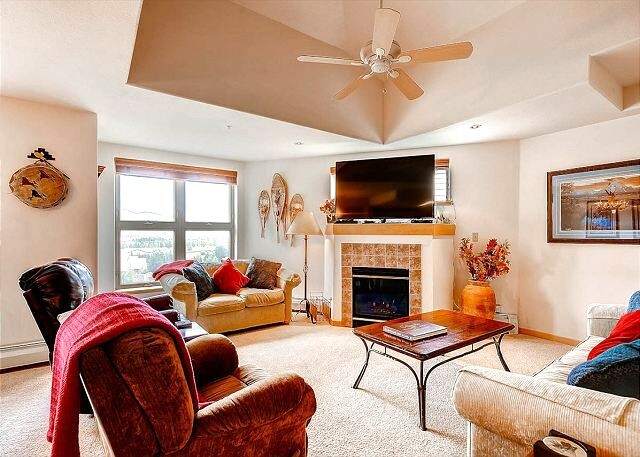 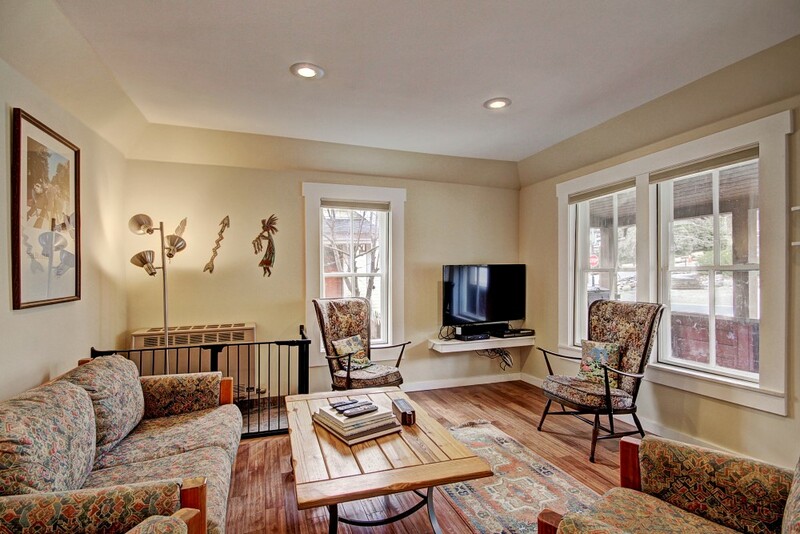 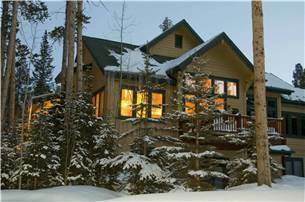 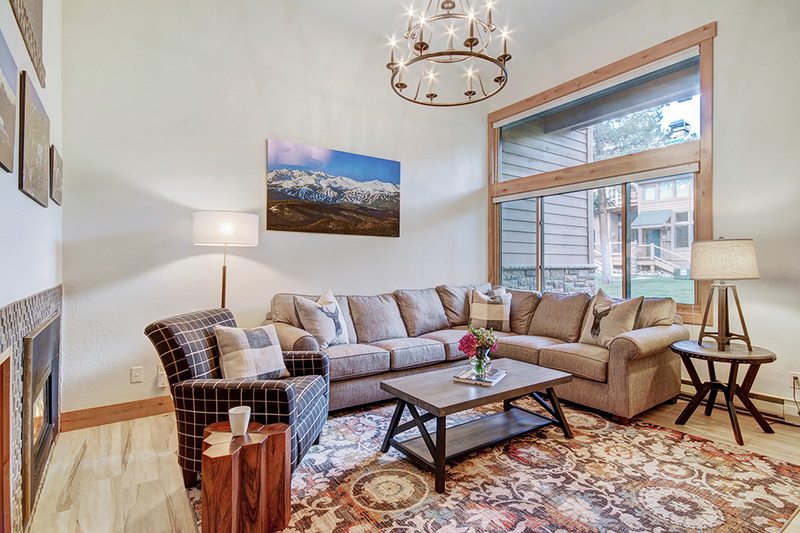 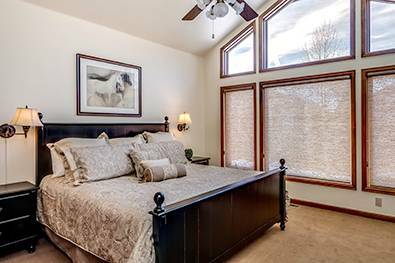 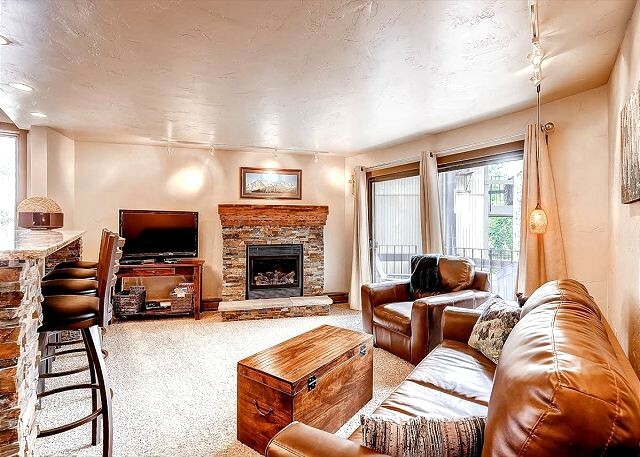 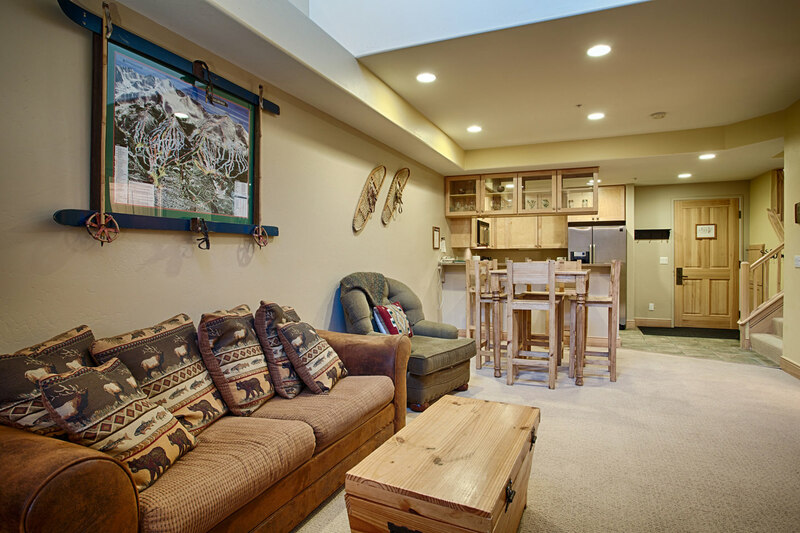 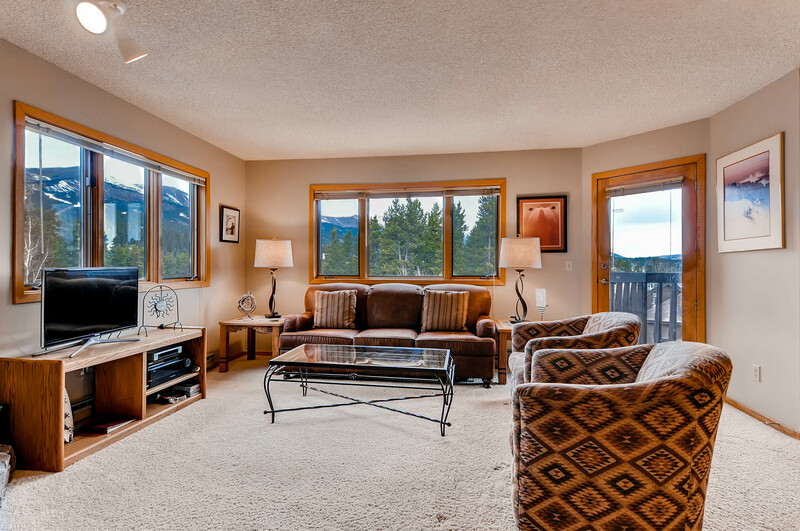 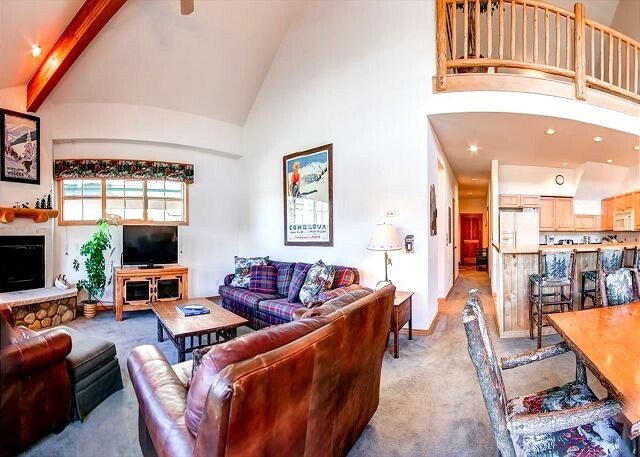 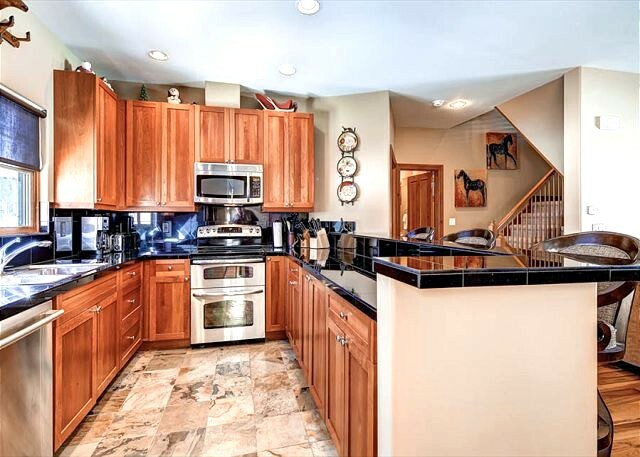 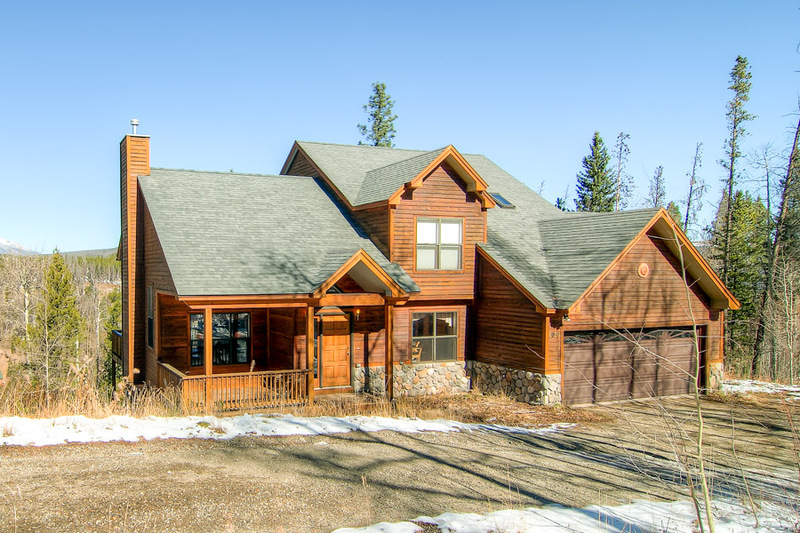 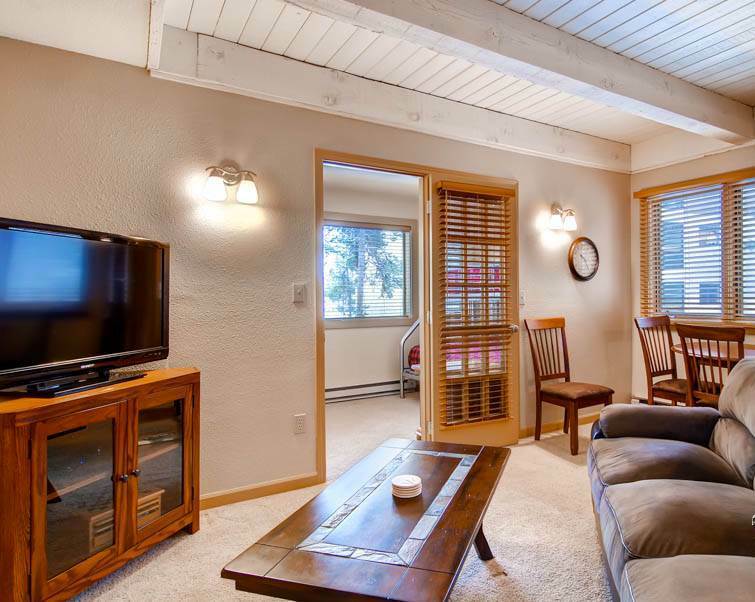 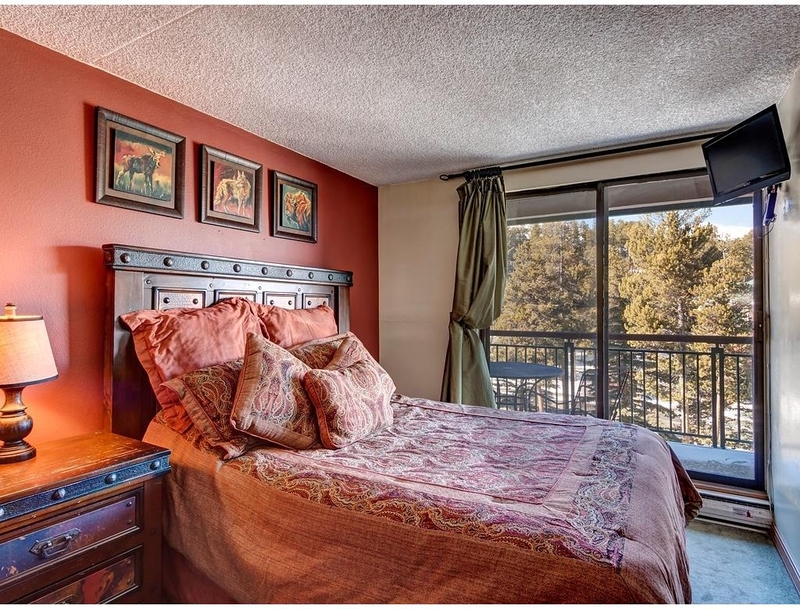 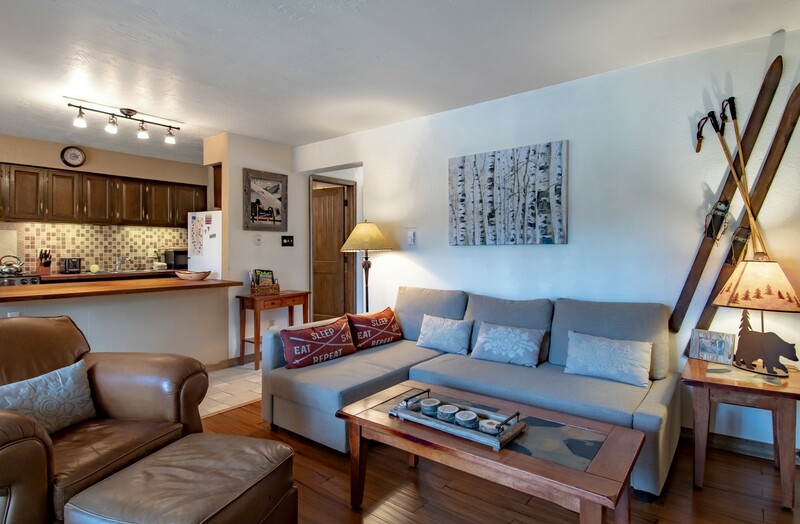 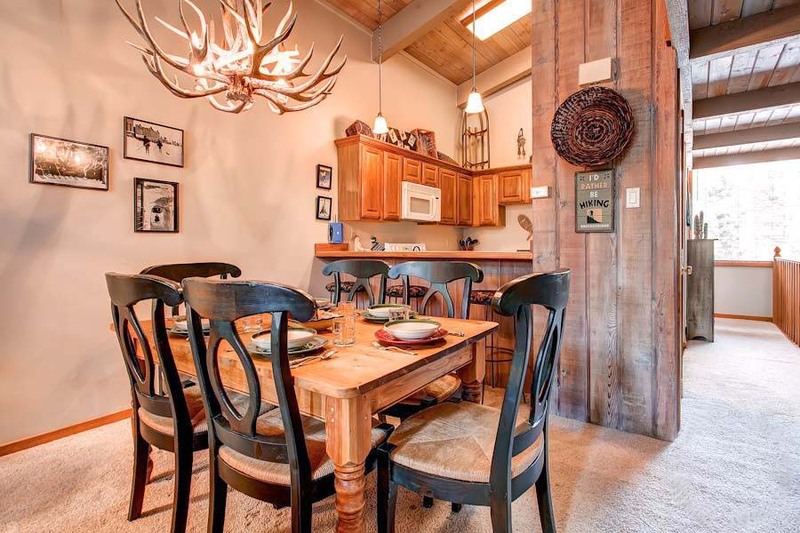 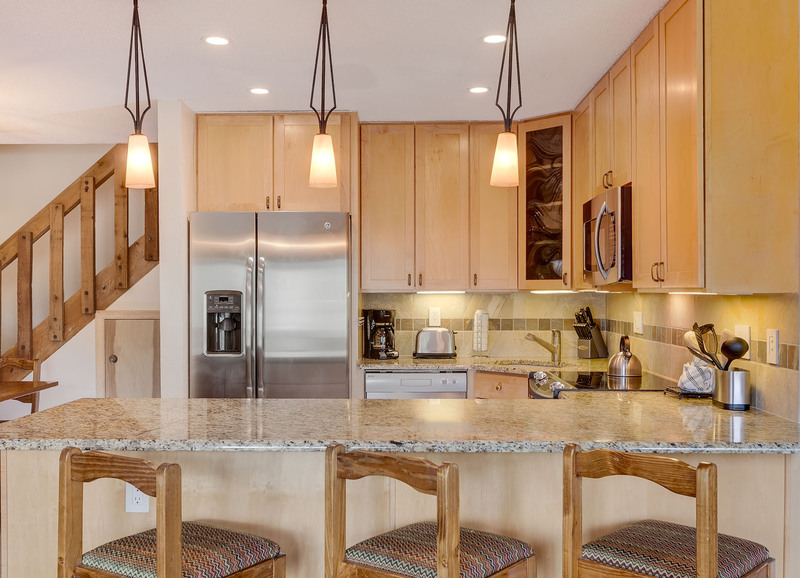 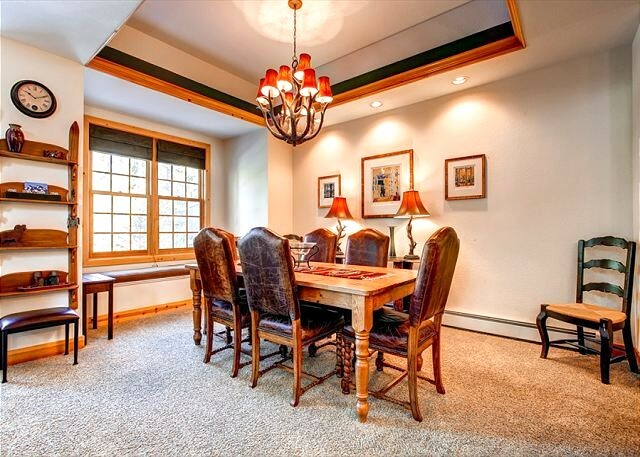 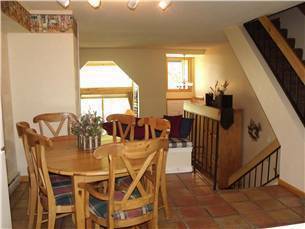 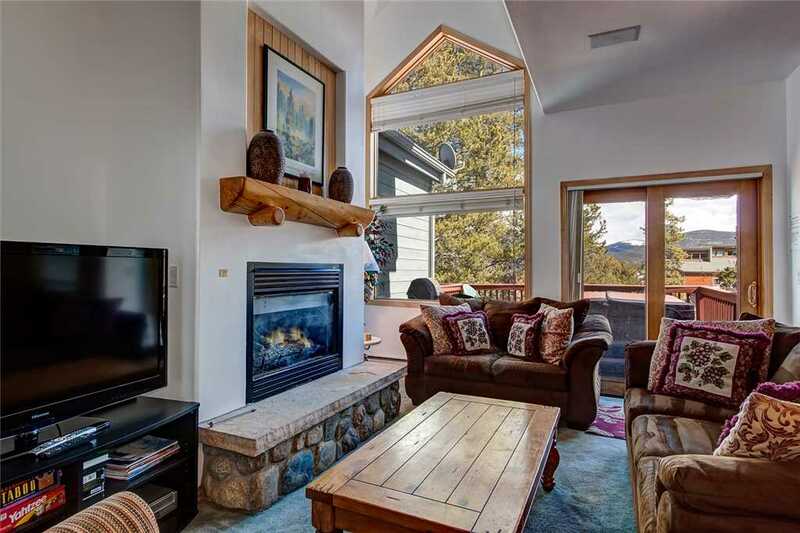 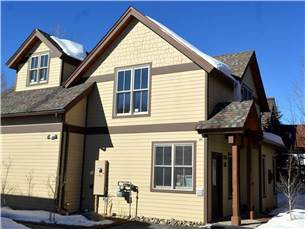 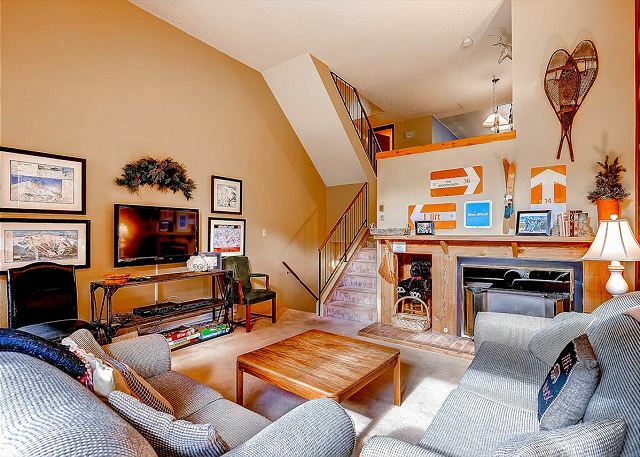 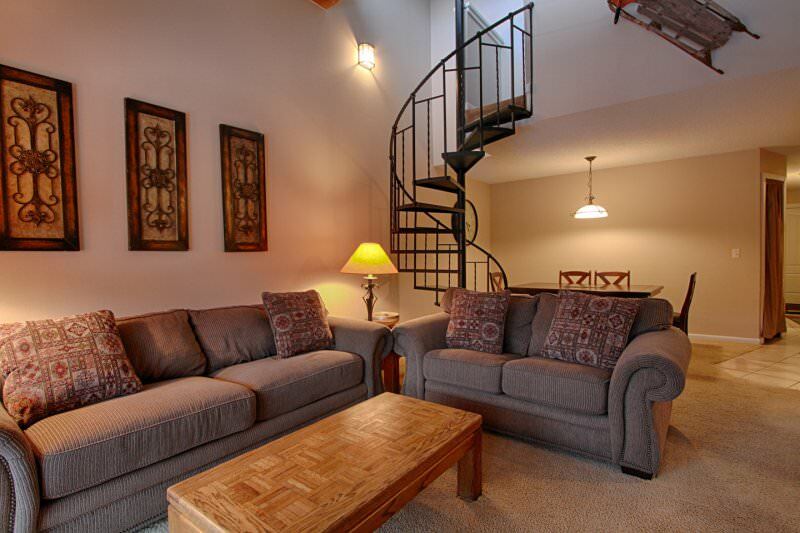 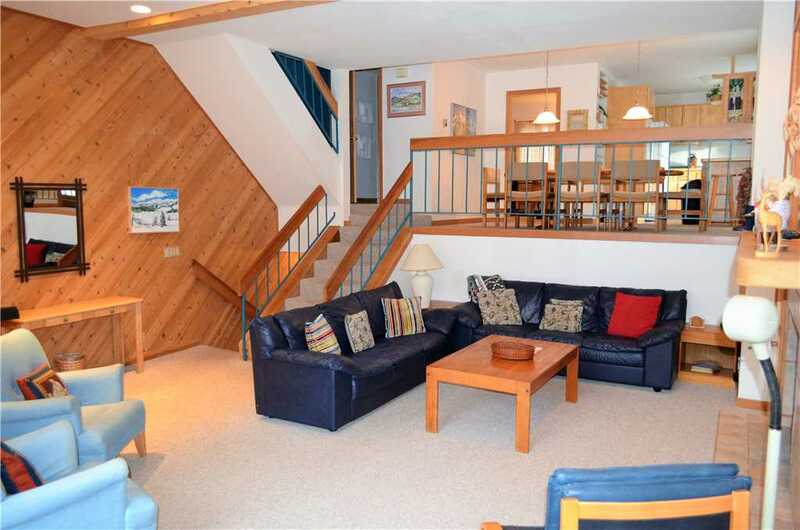 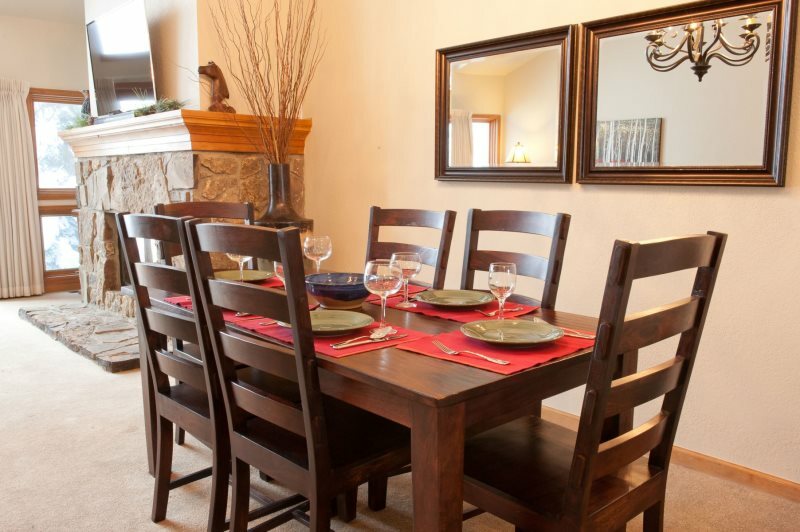 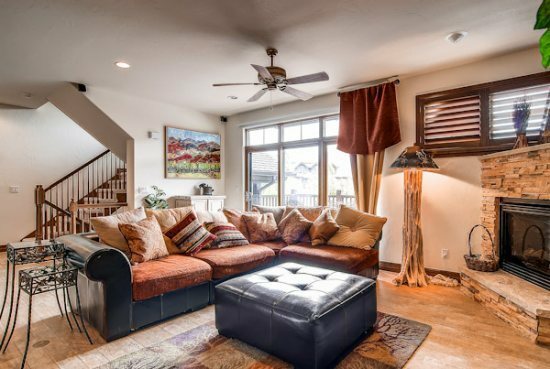 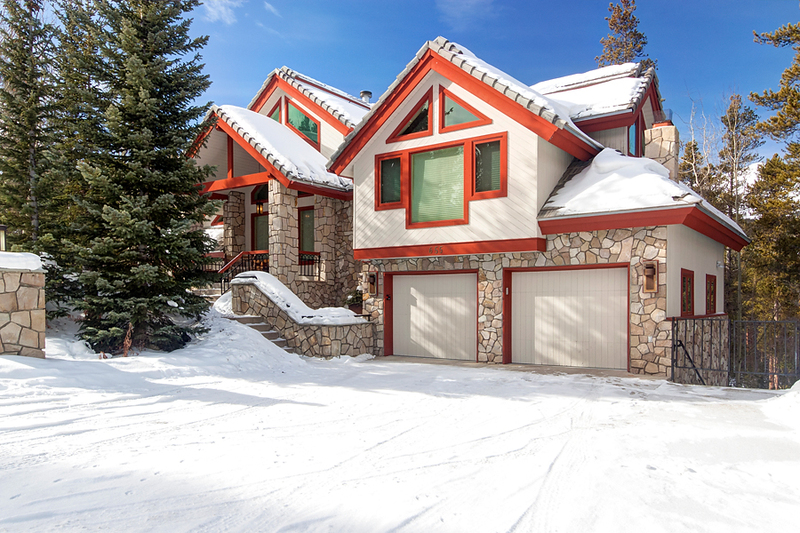 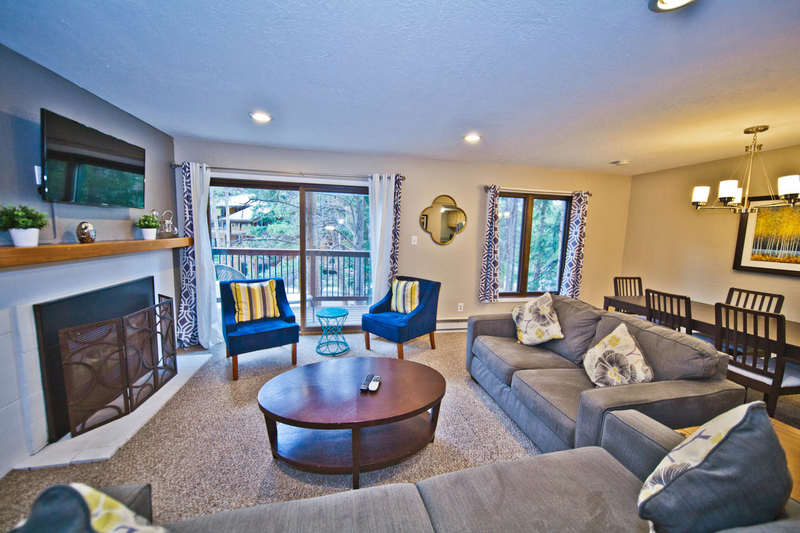 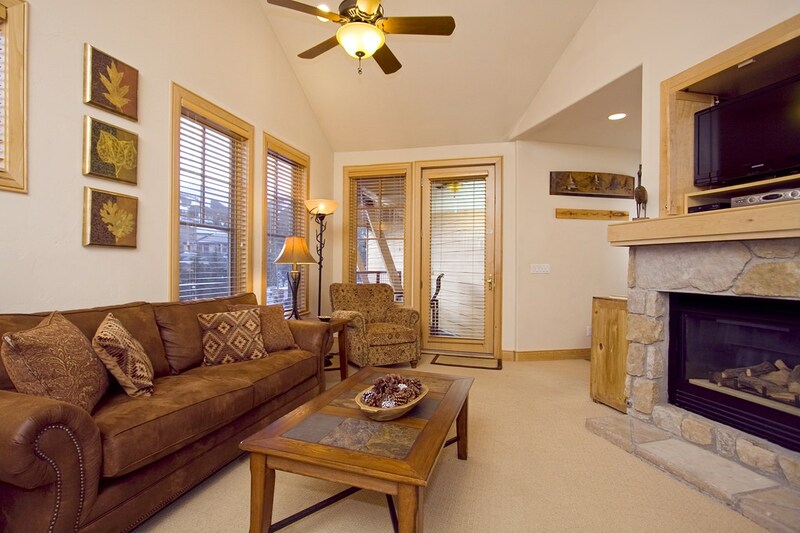 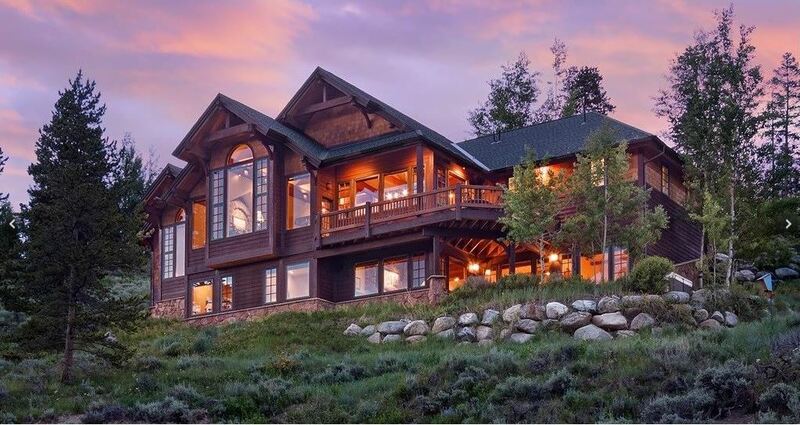 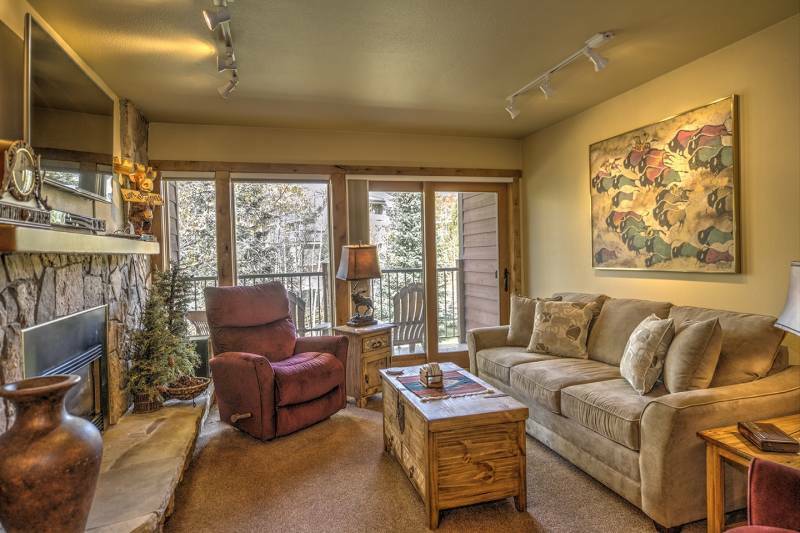 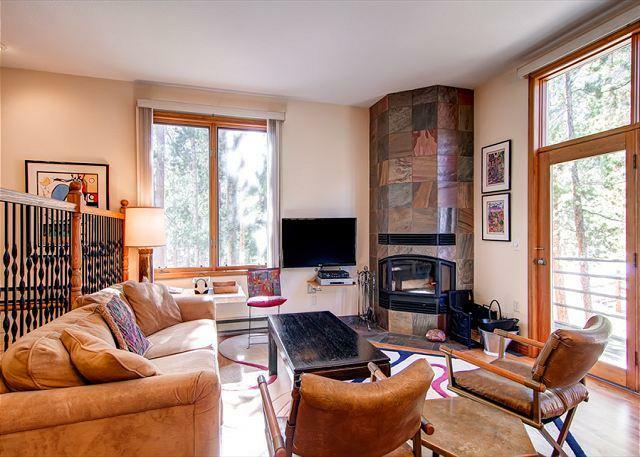 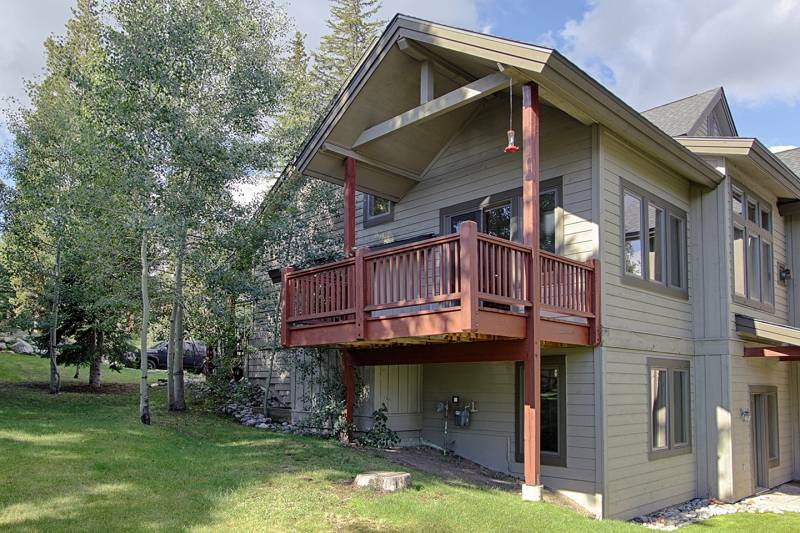 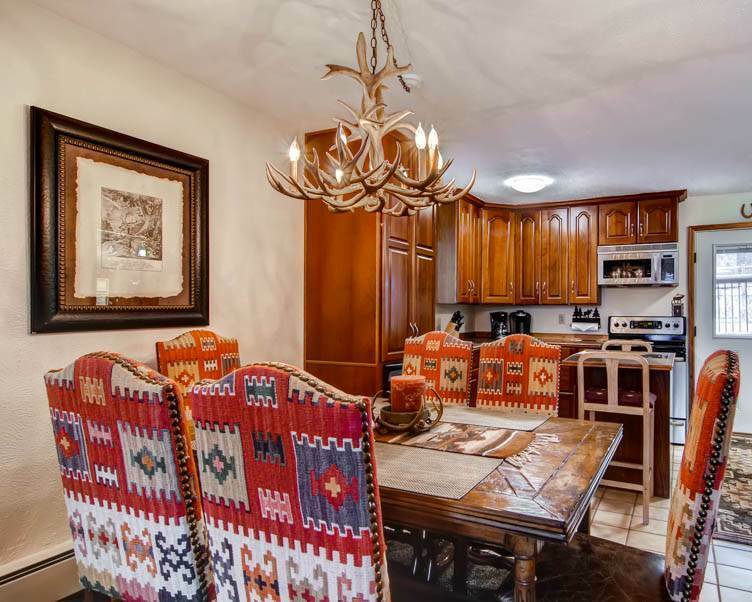 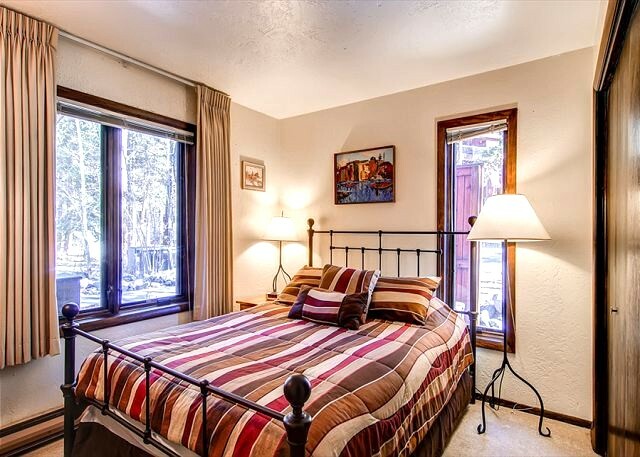 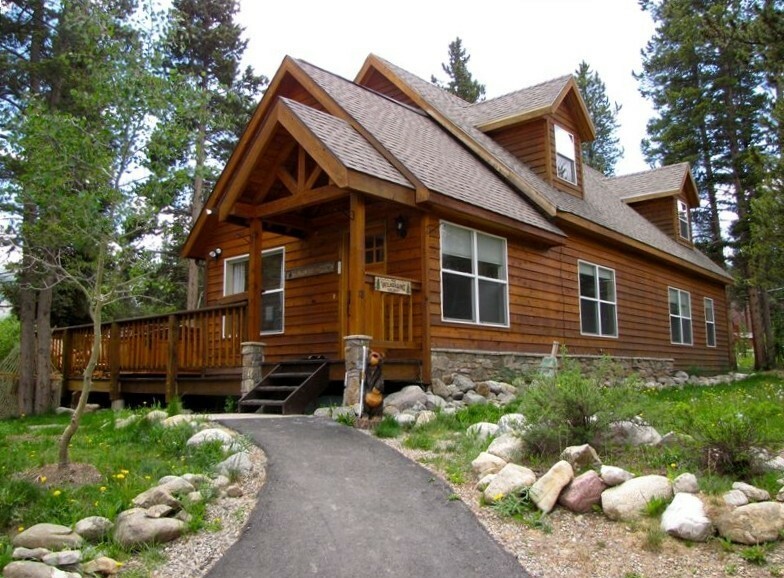 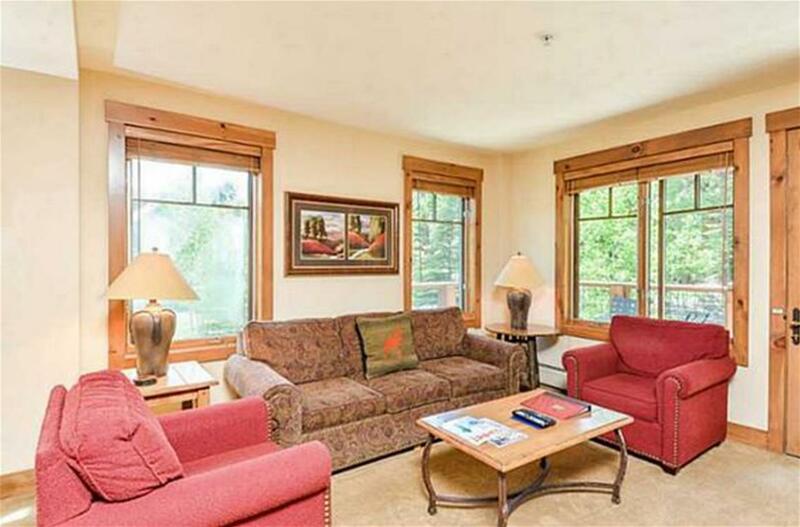 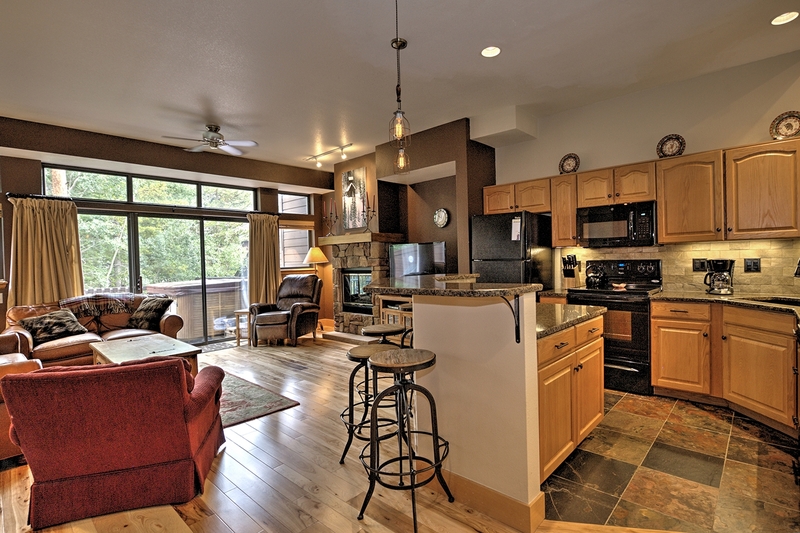 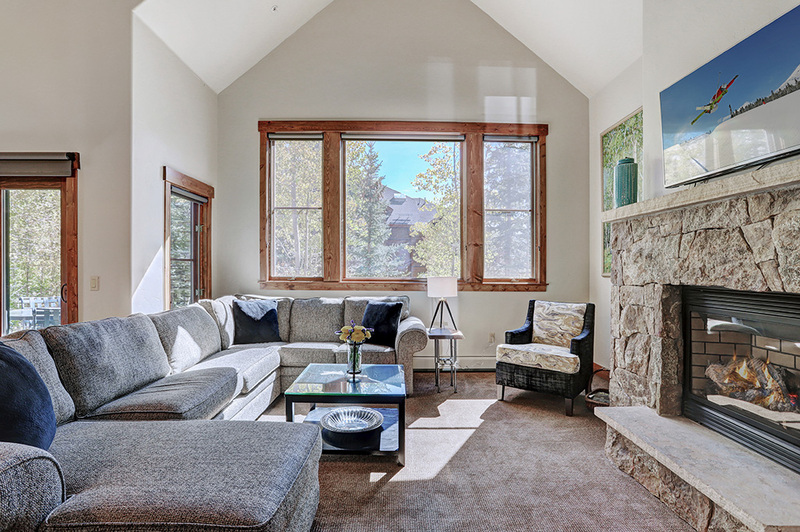 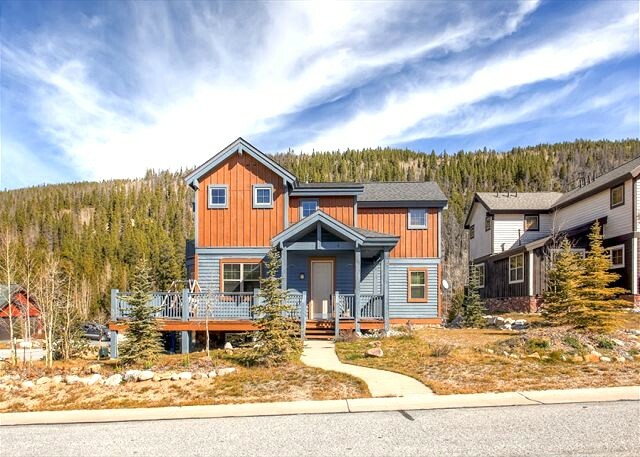 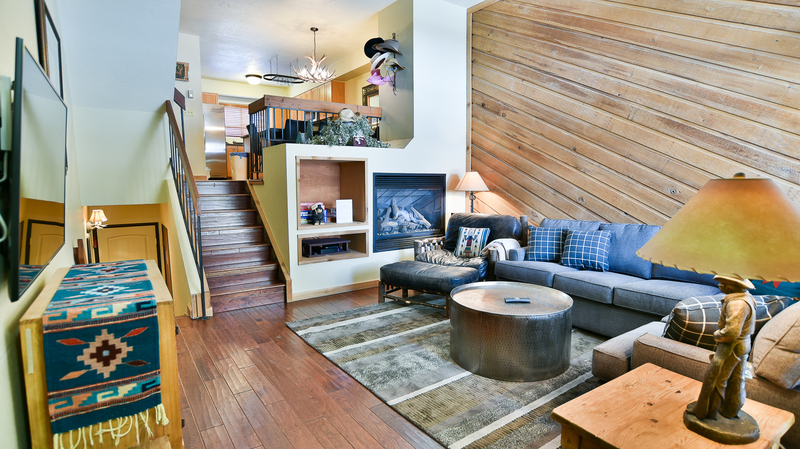 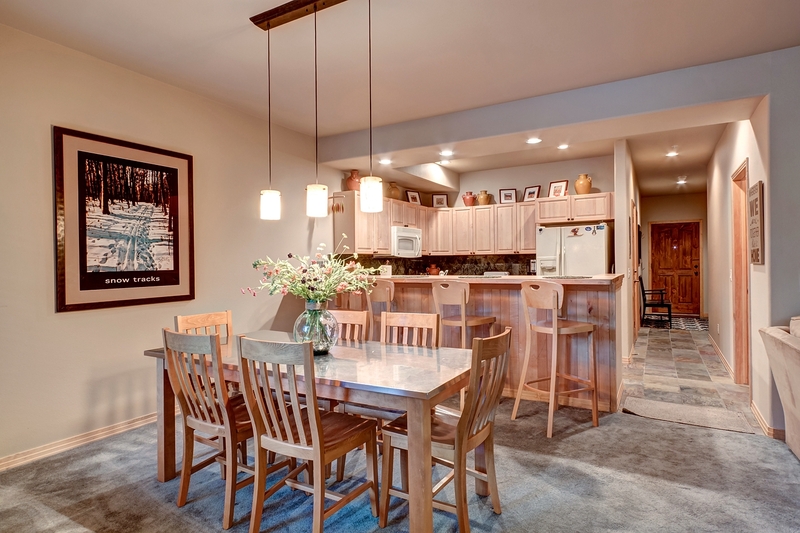 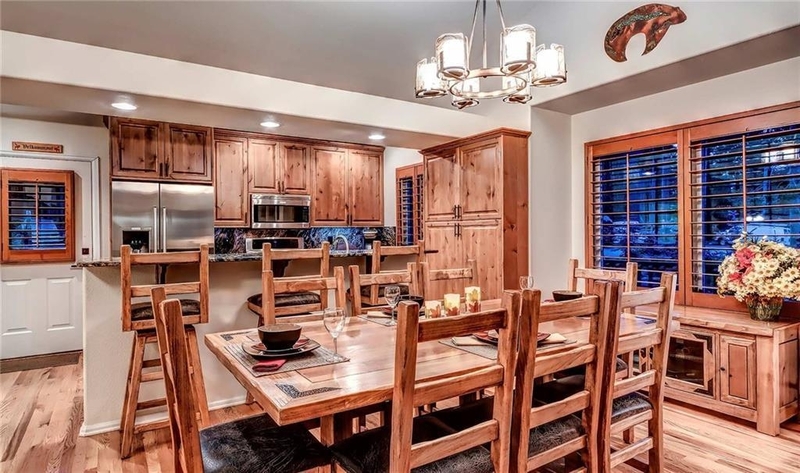 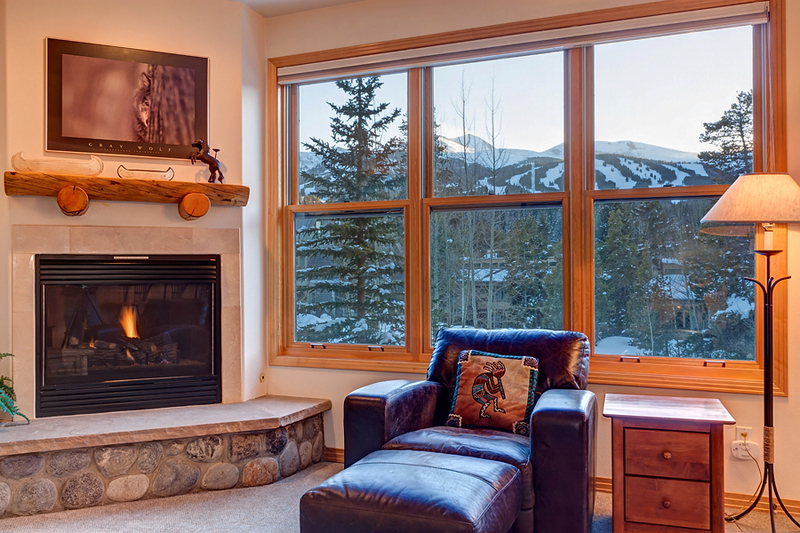 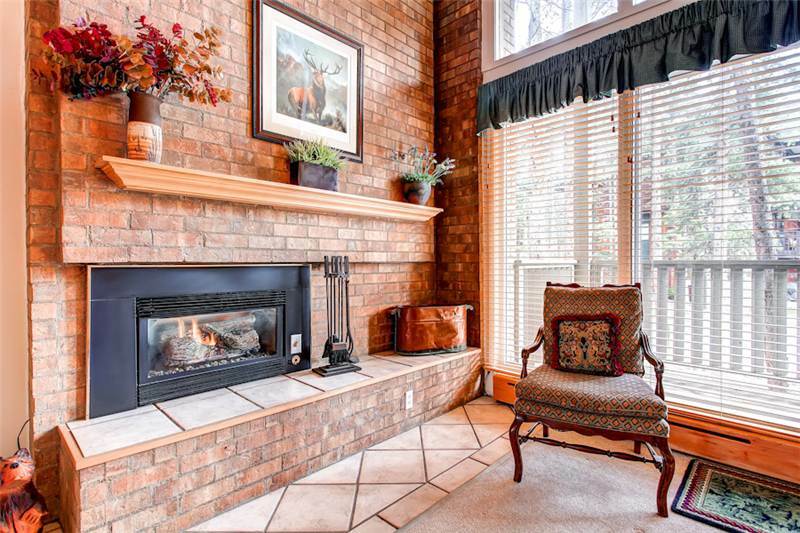 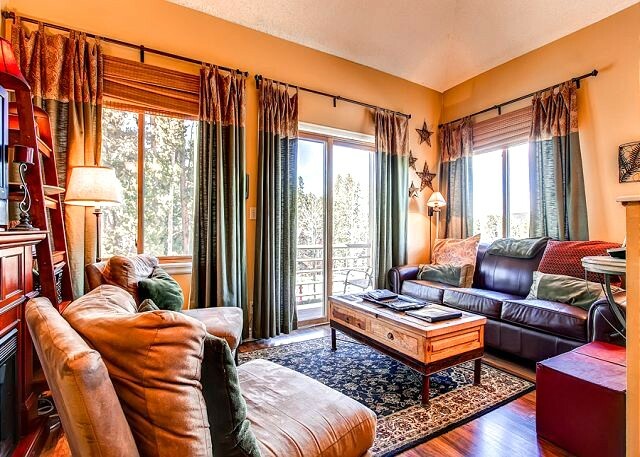 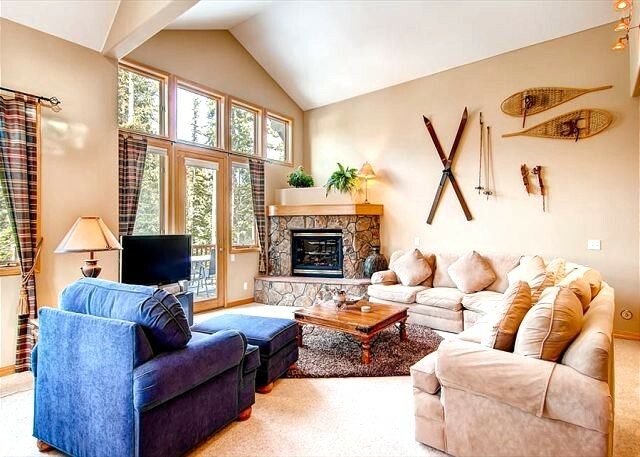 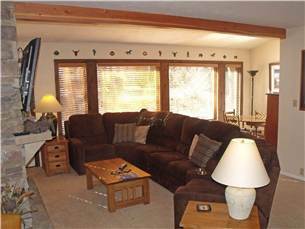 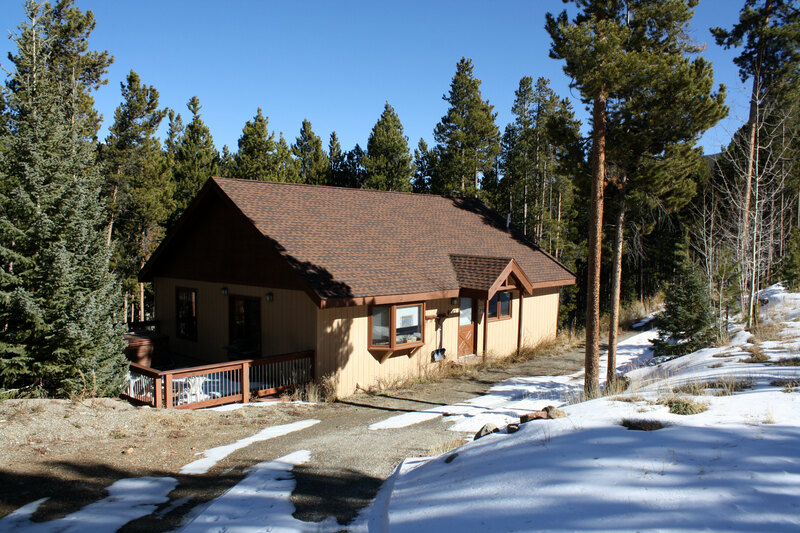 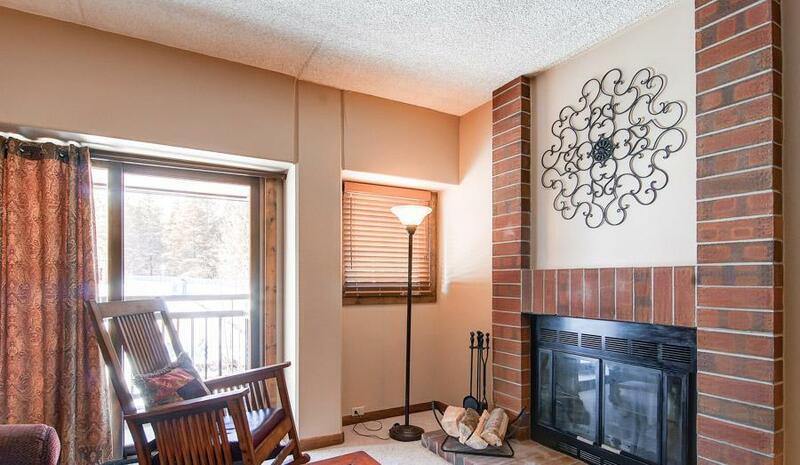 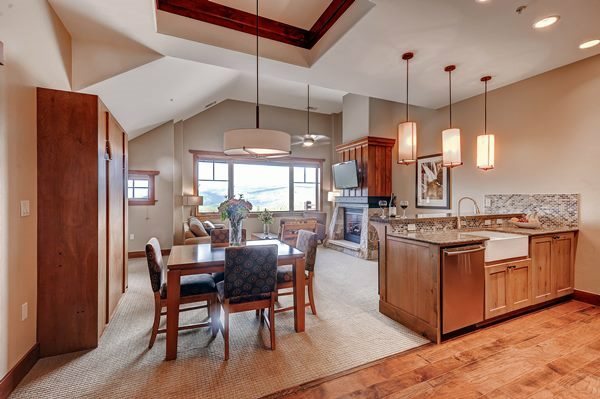 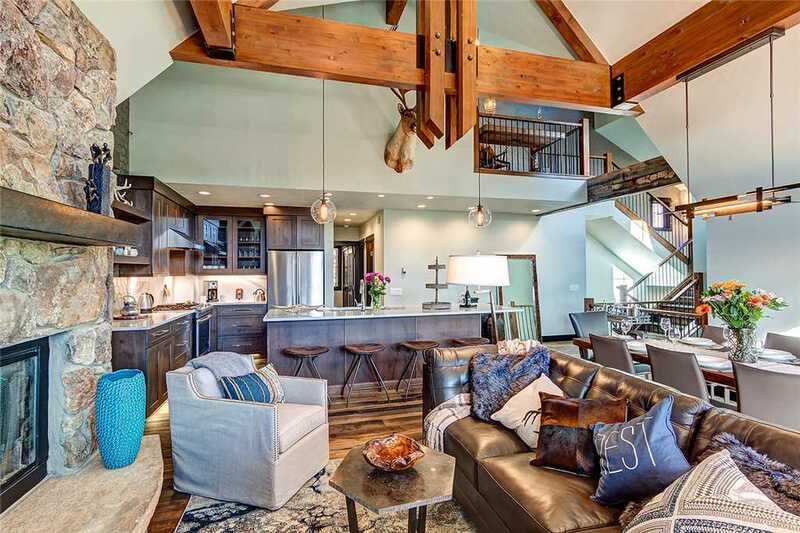 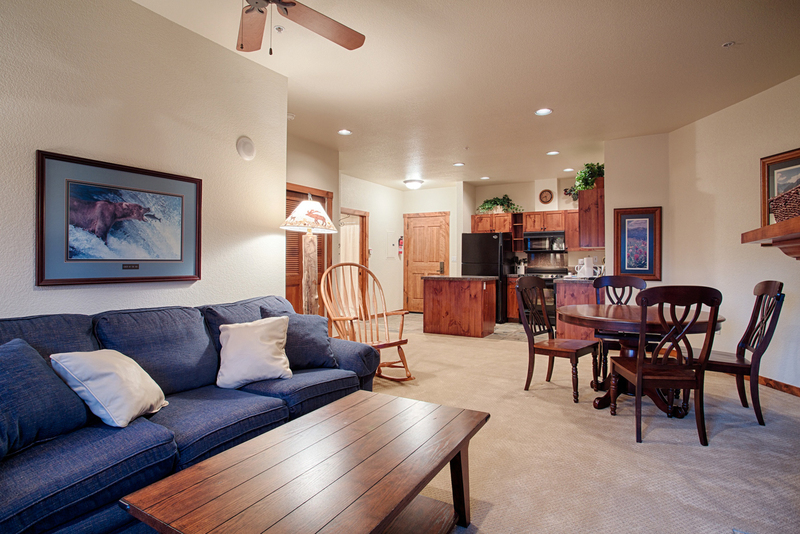 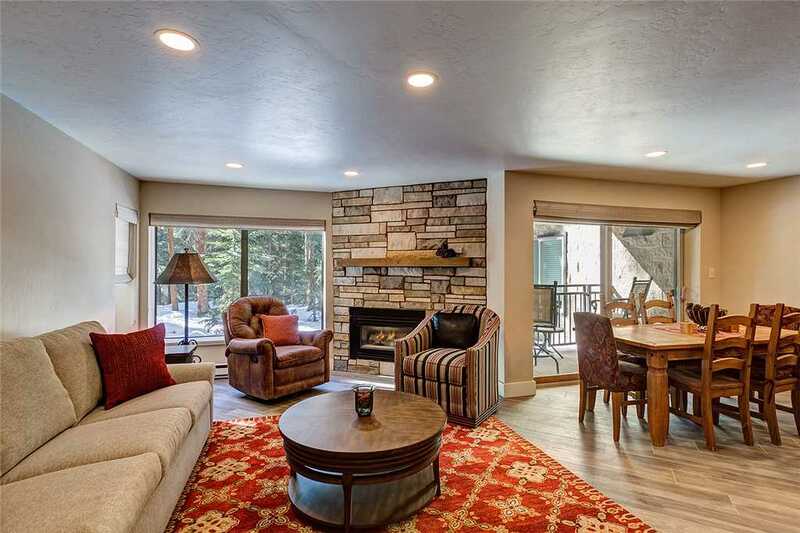 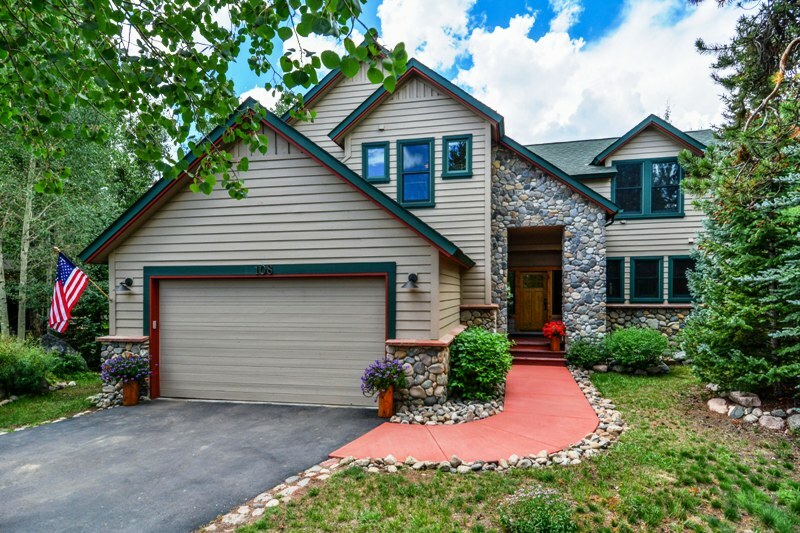 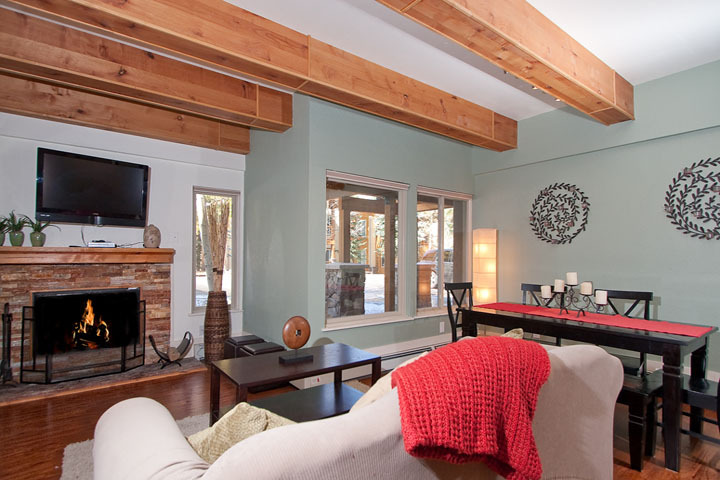 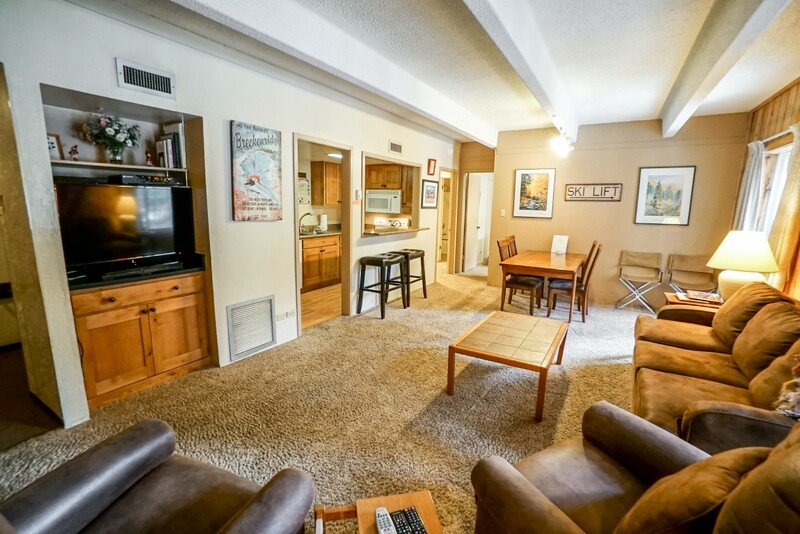 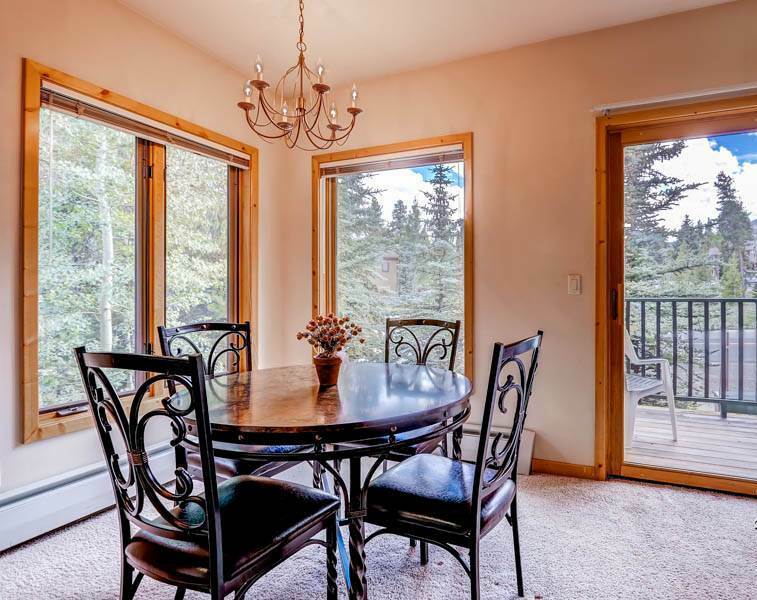 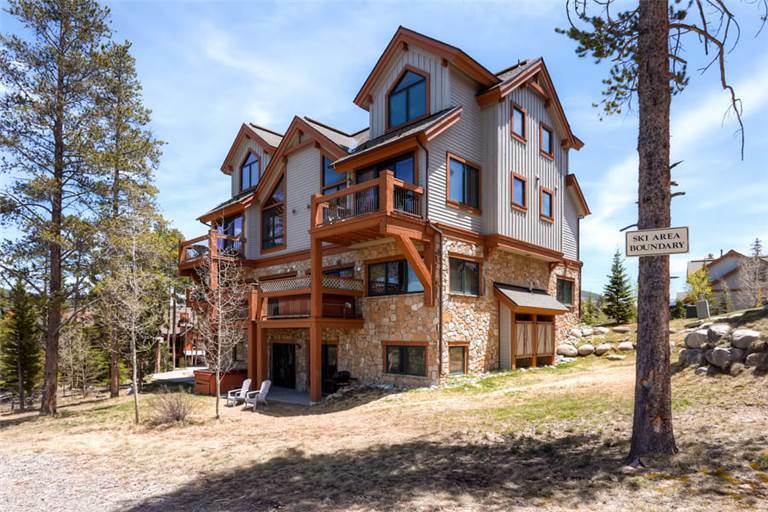 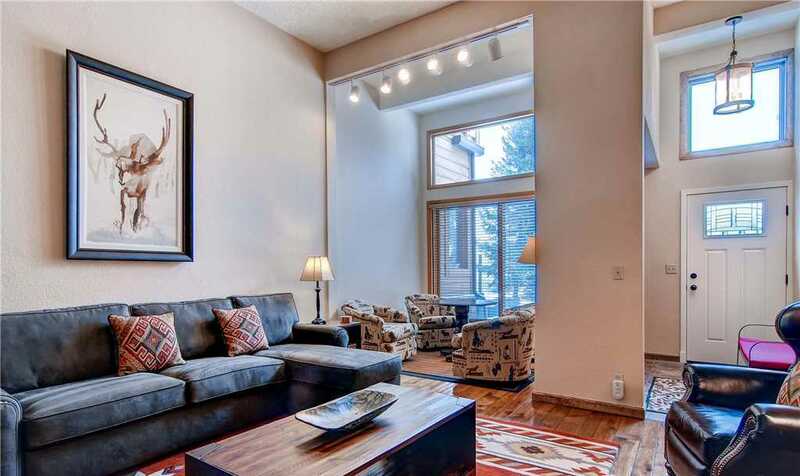 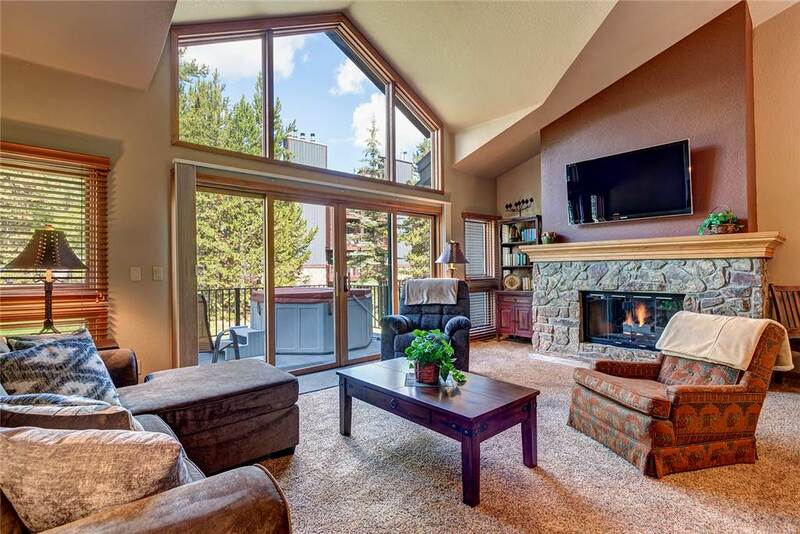 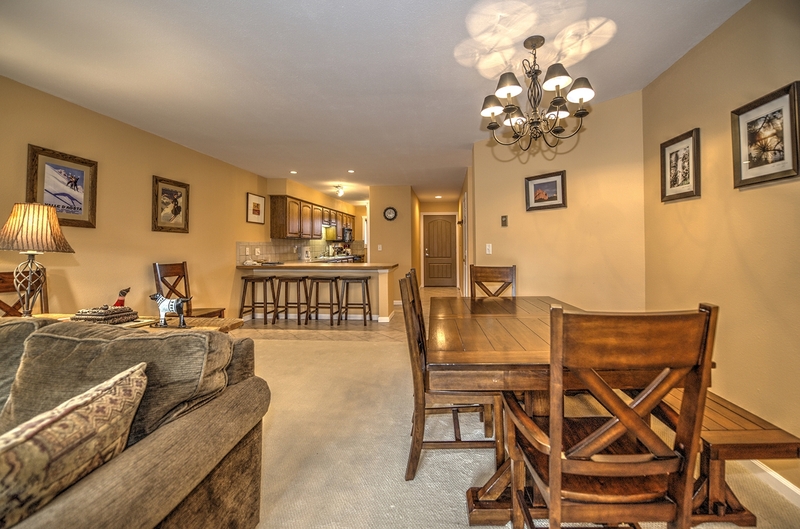 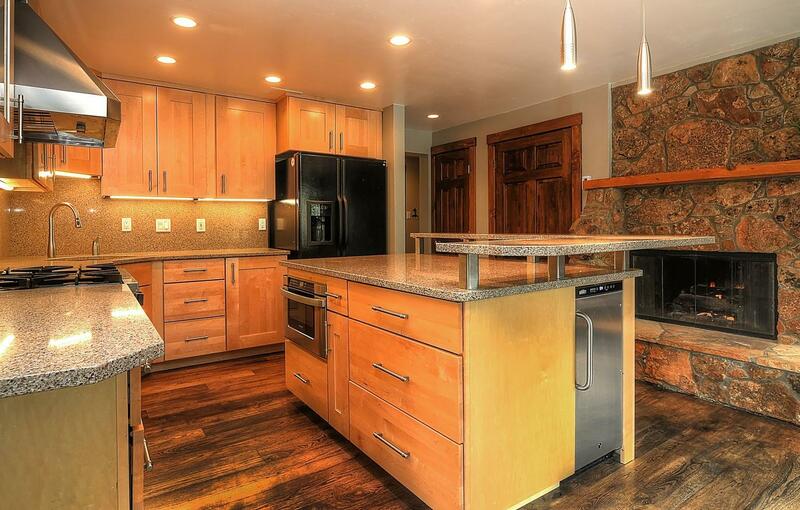 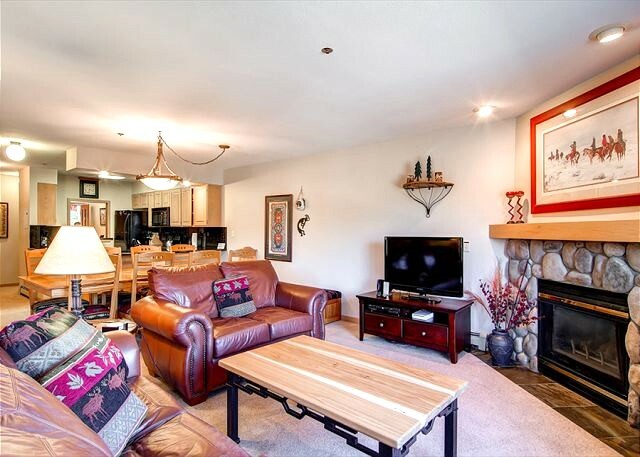 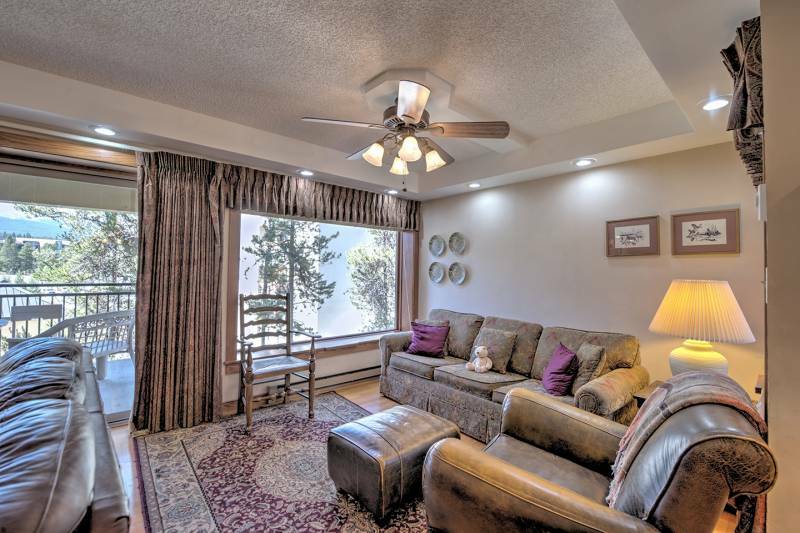 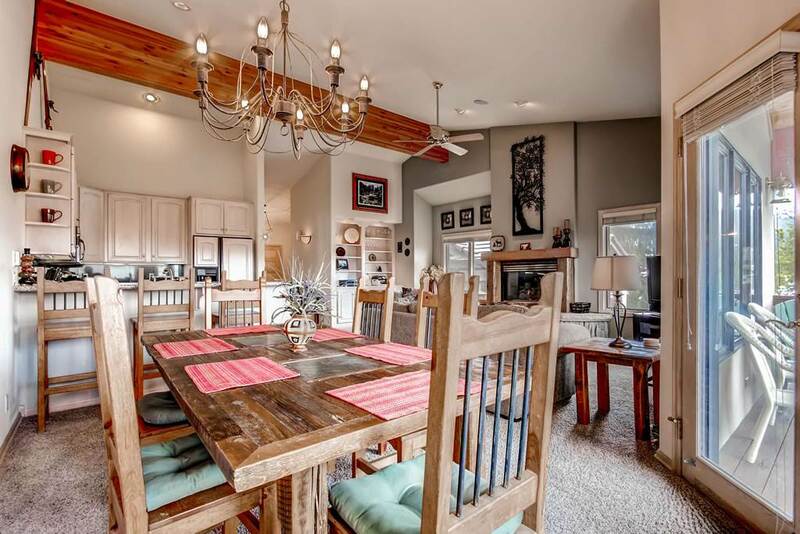 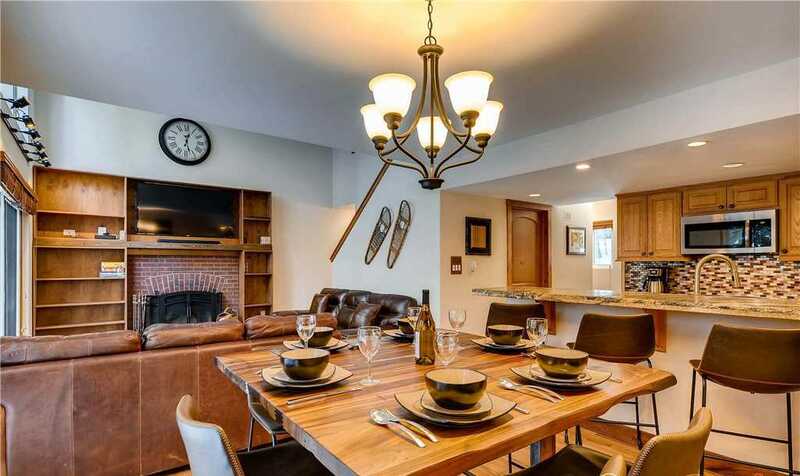 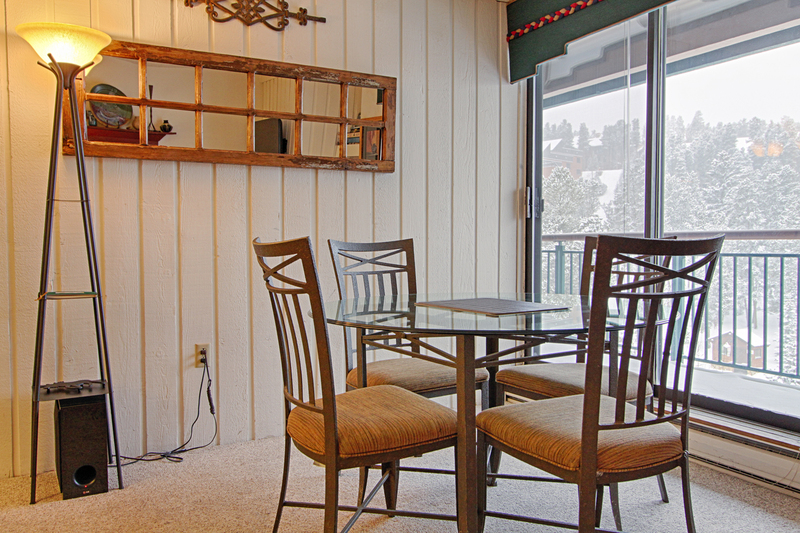 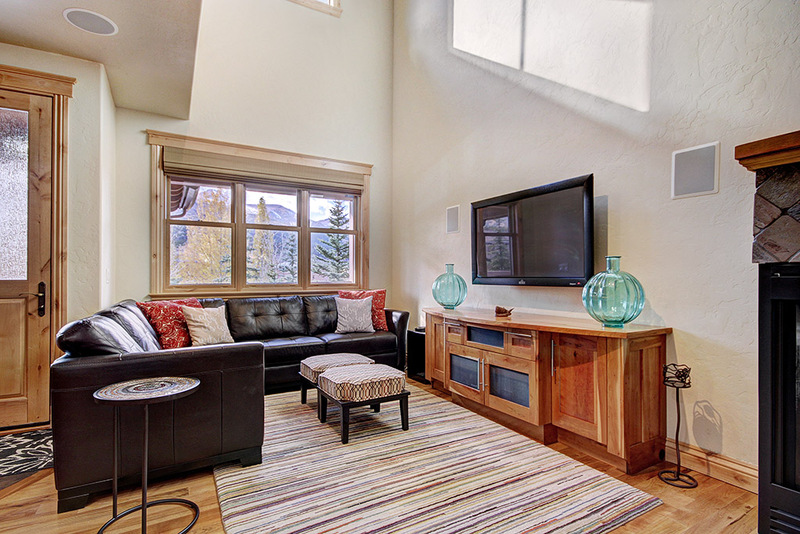 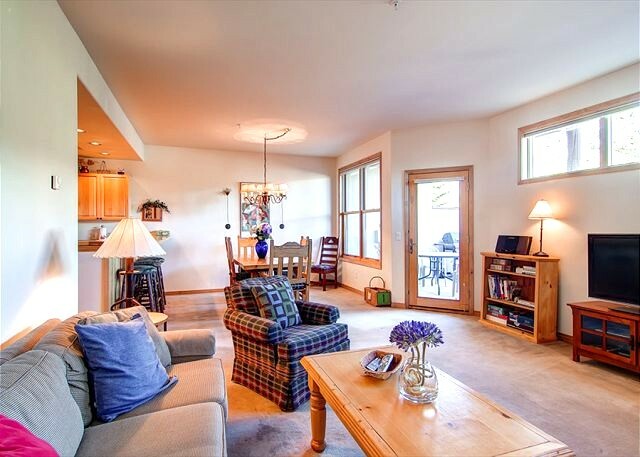 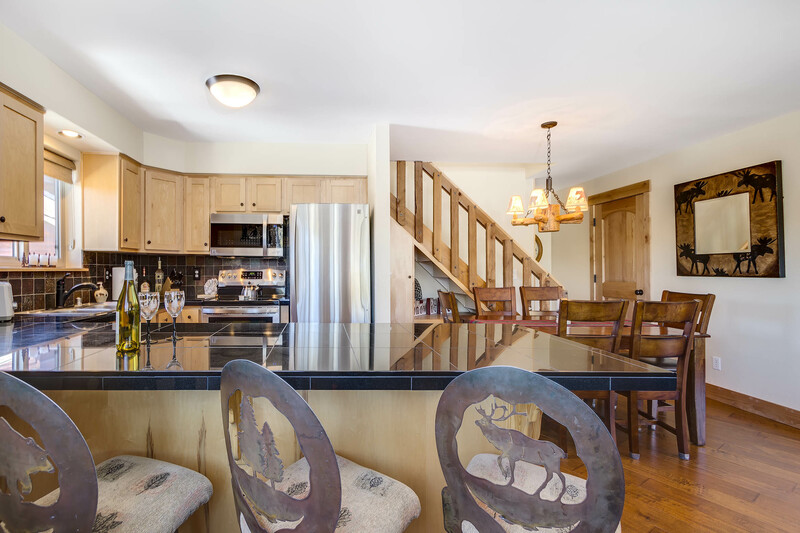 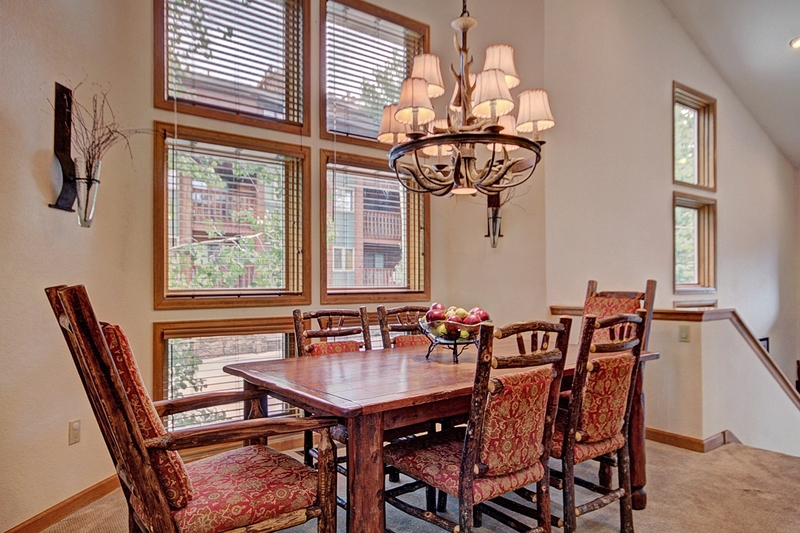 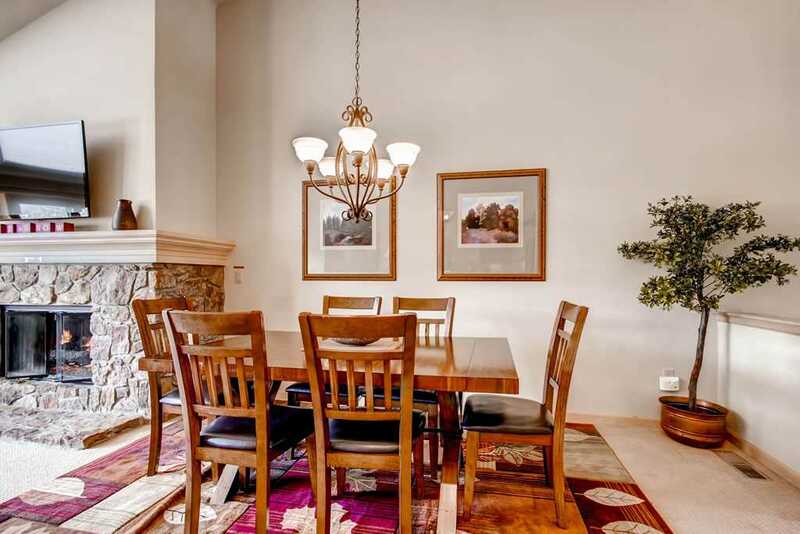 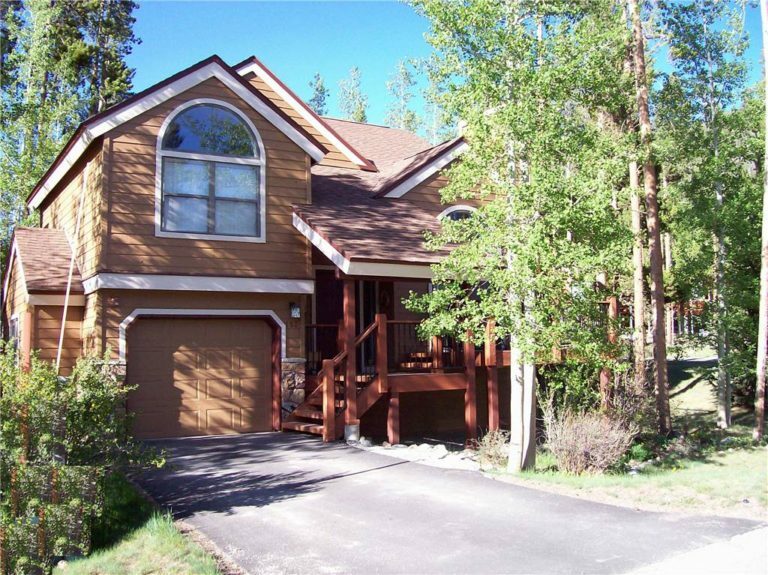 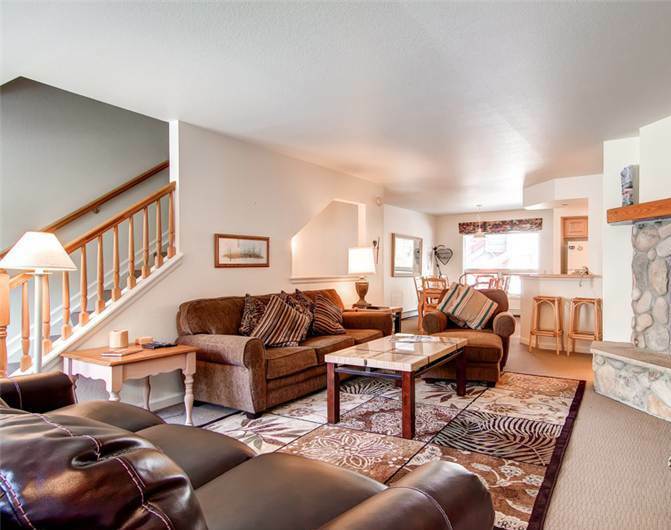 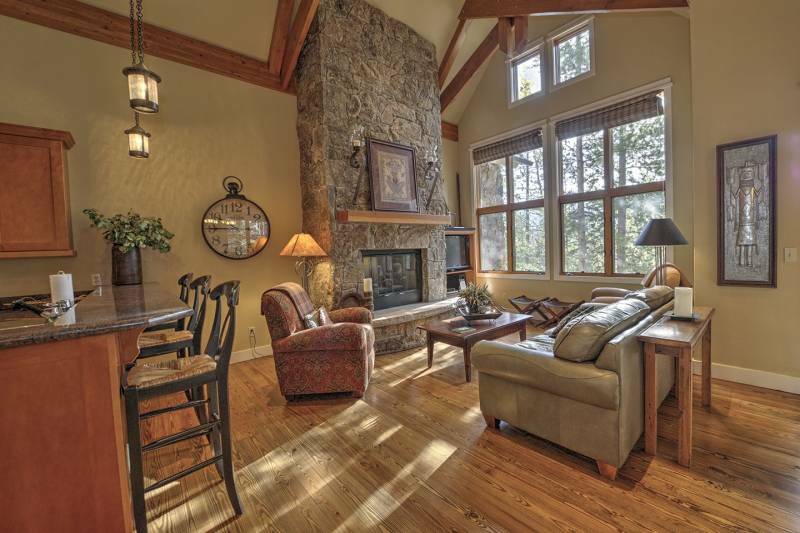 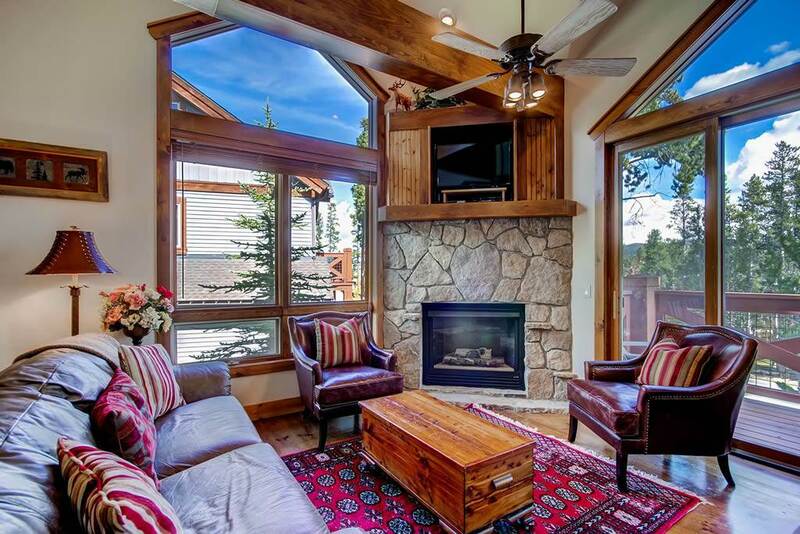 Pine Creek E Townhouse is a great find in Breckenridge — it’s truly the right combination of quality, location, amenities and price.